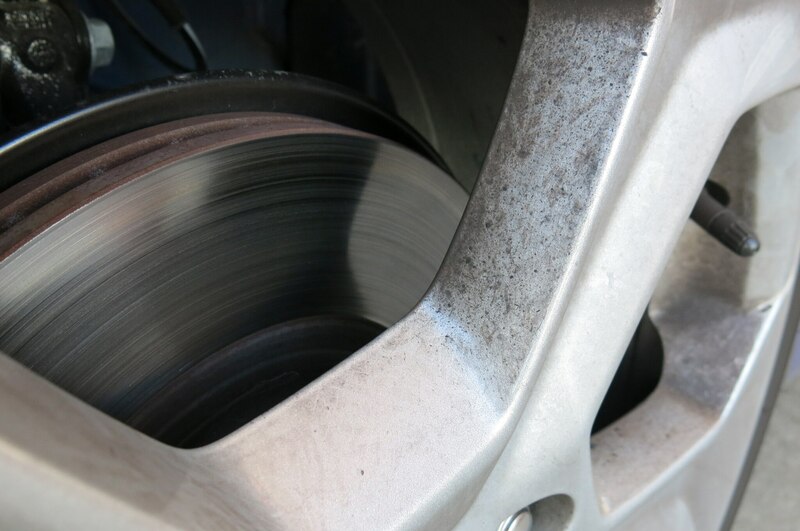 Be bloodied, bruised, and broken, please. 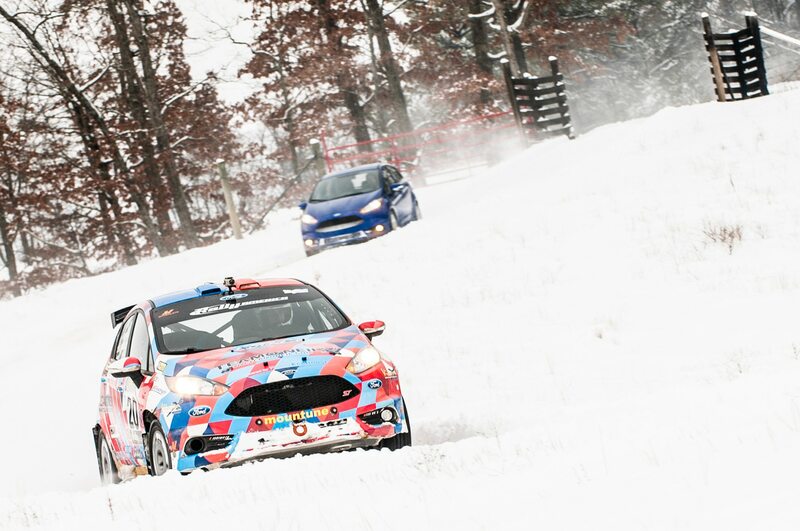 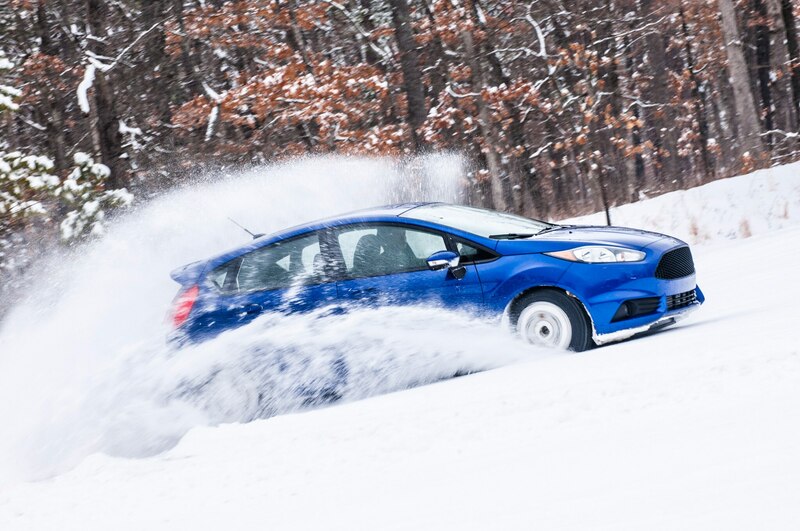 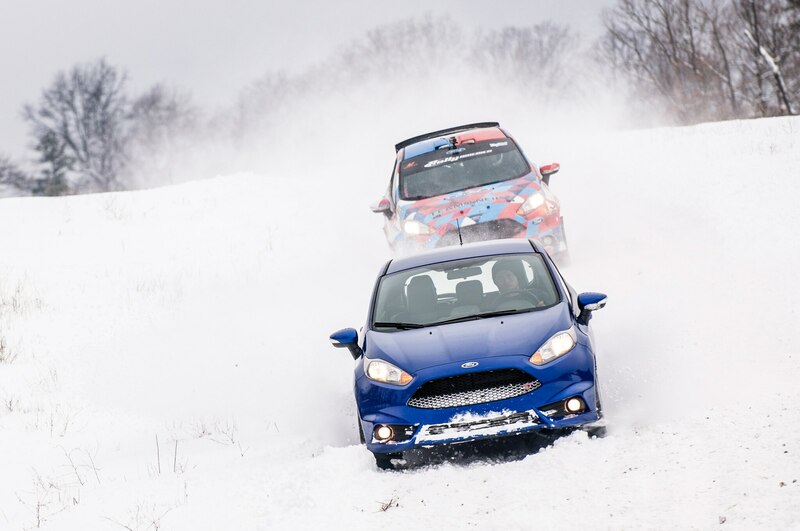 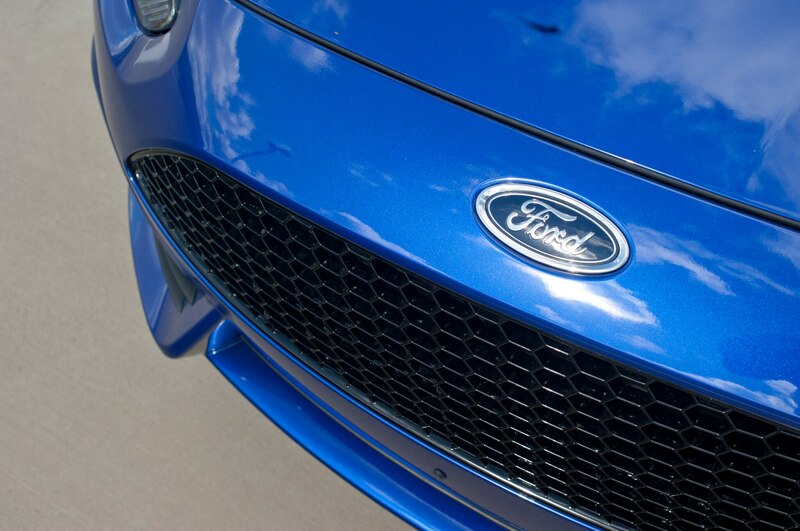 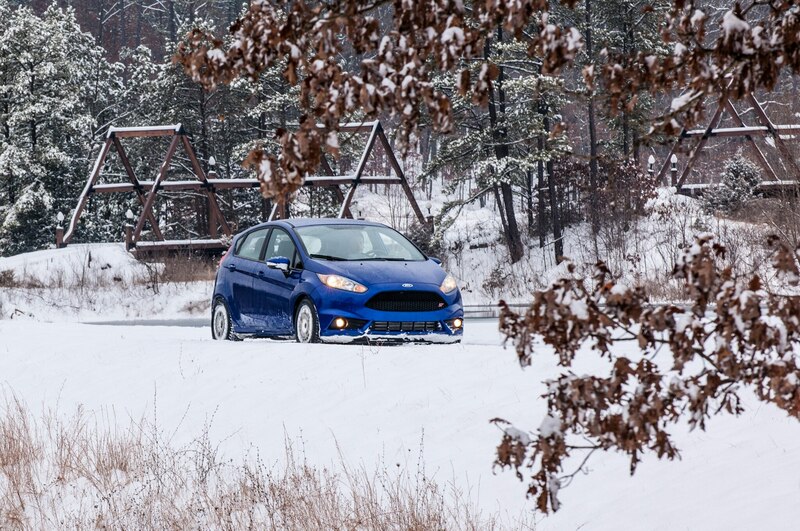 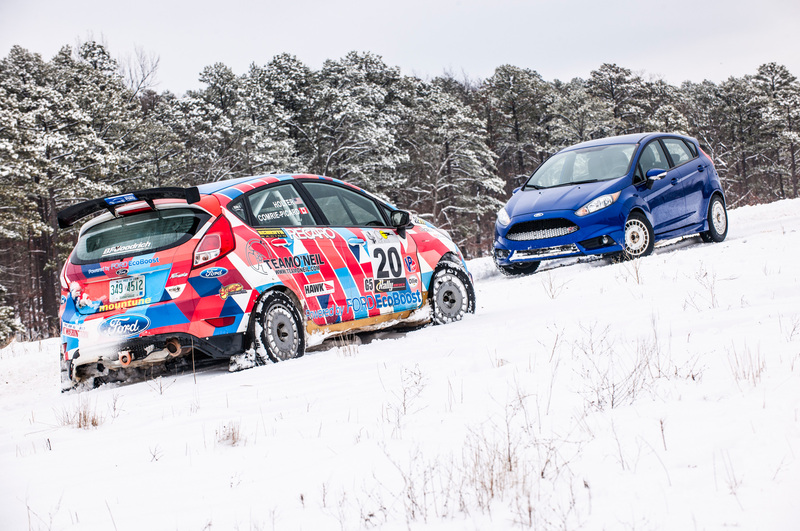 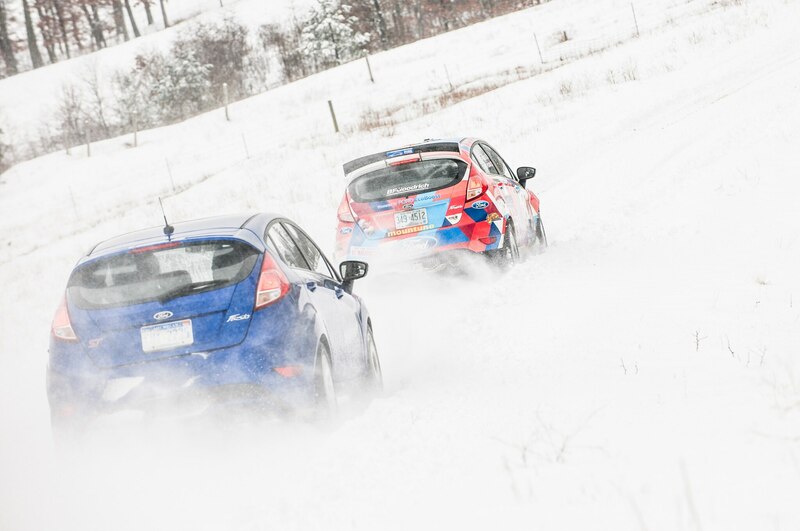 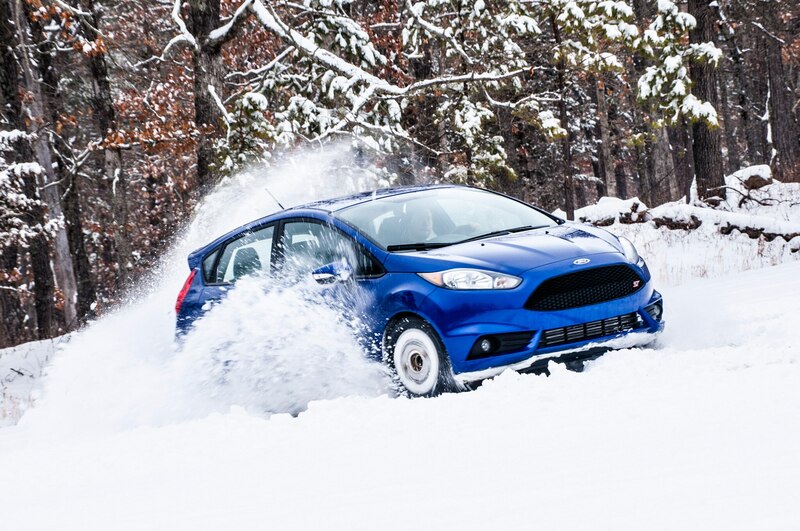 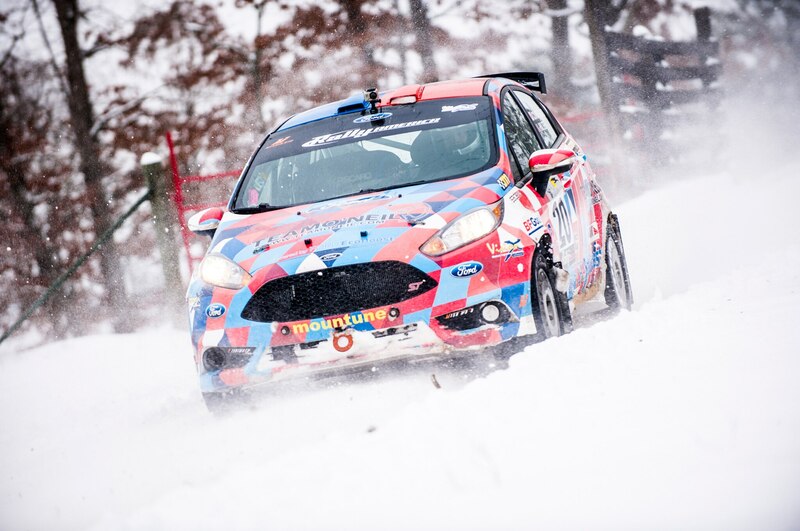 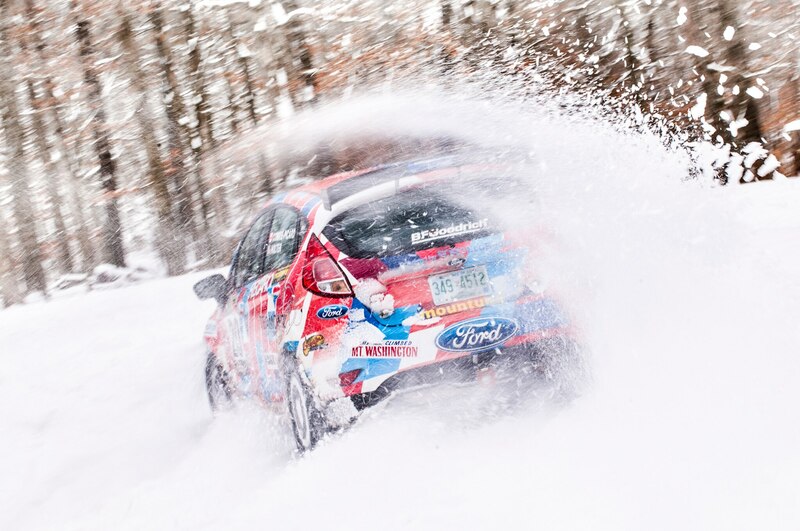 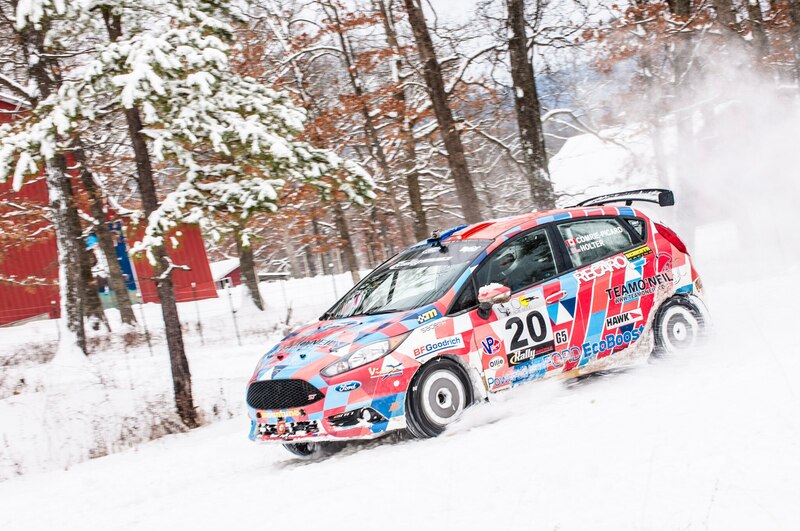 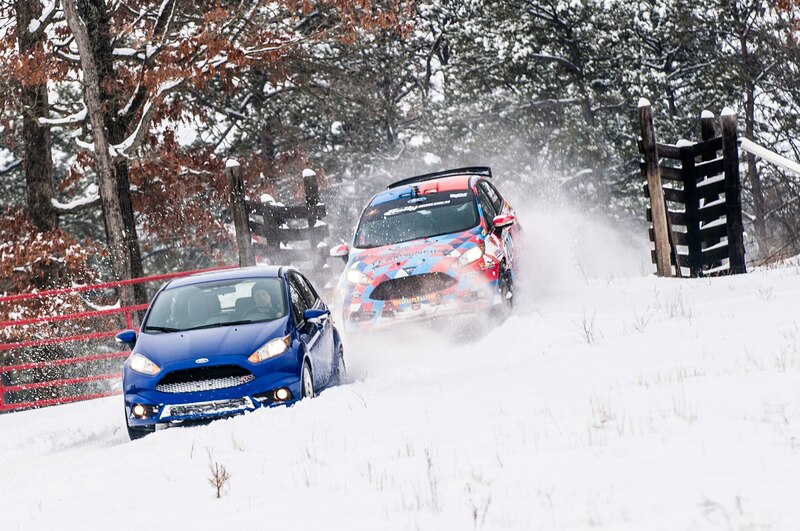 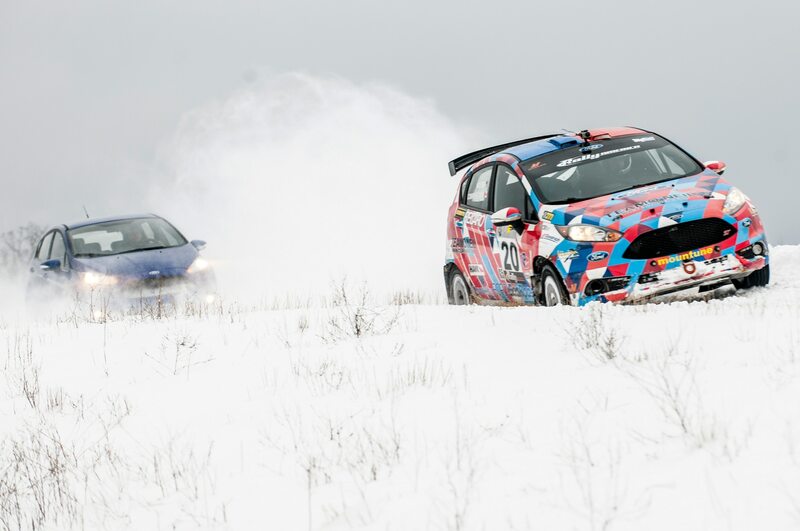 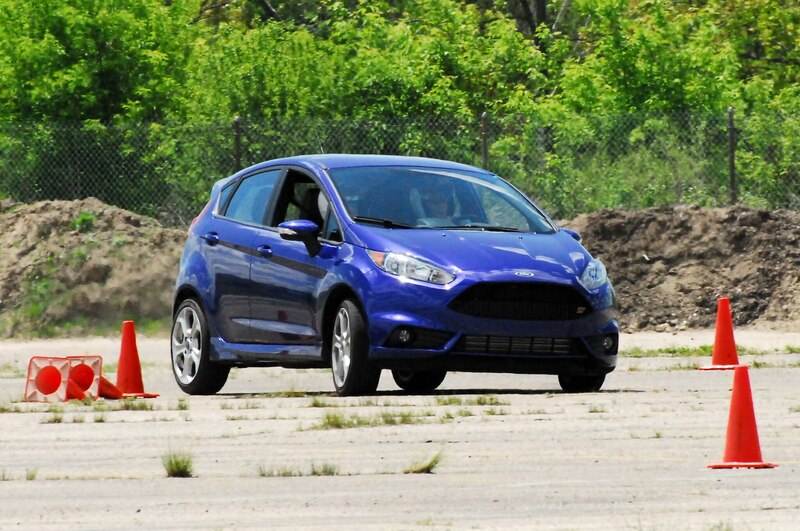 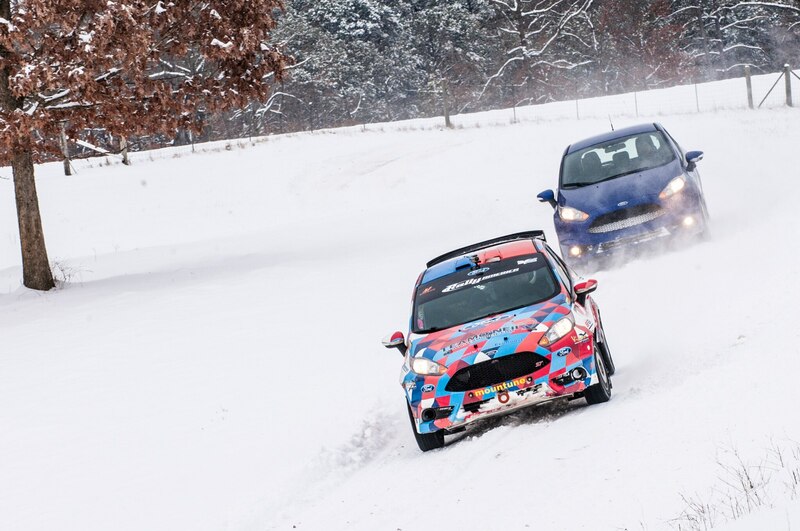 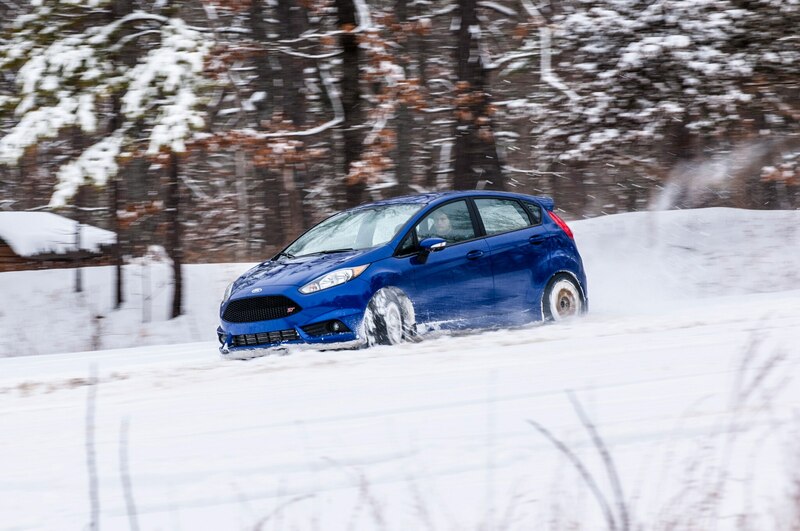 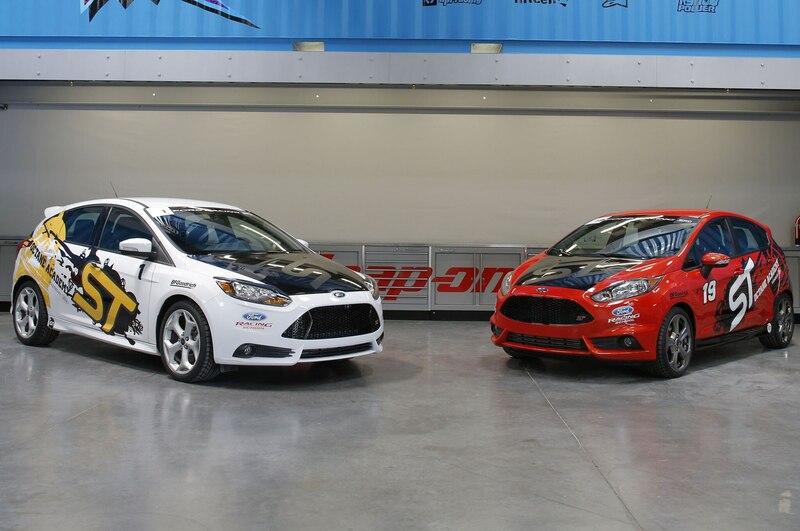 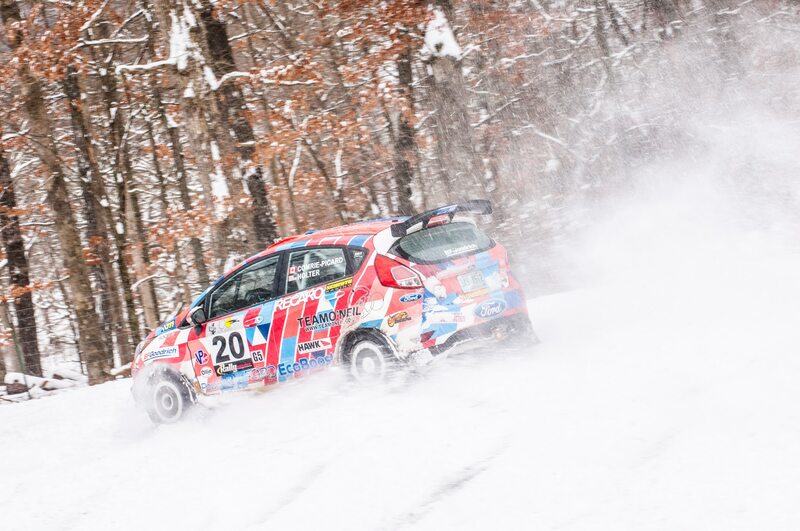 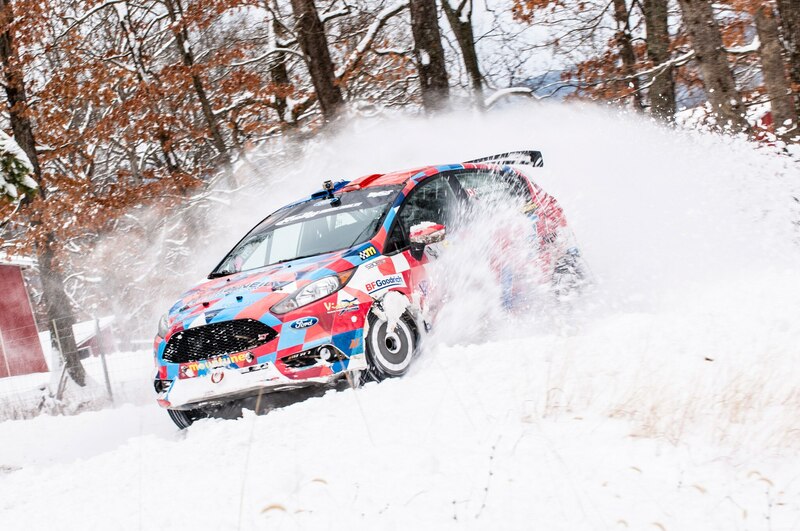 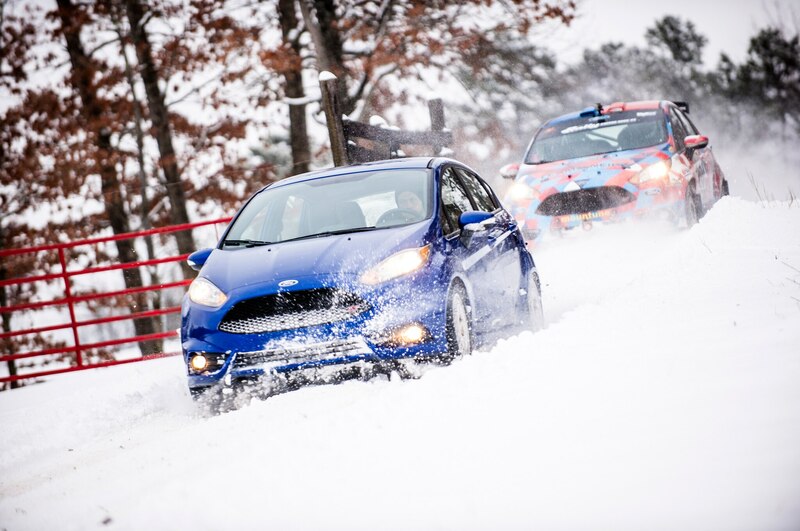 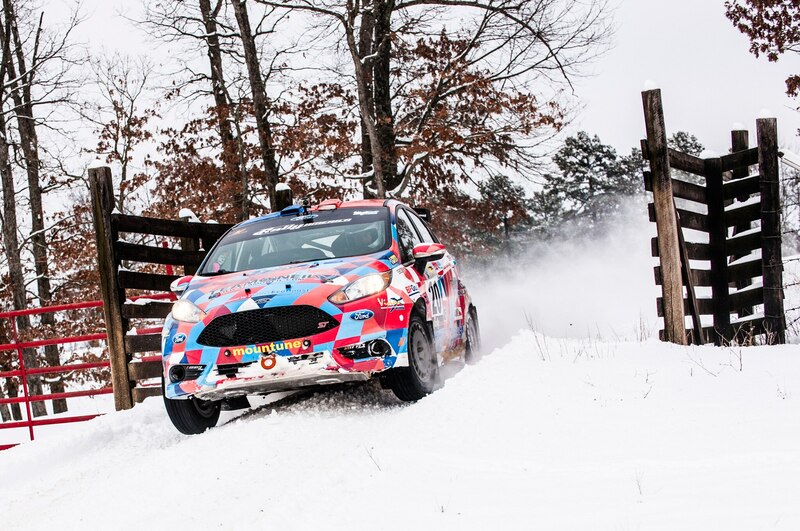 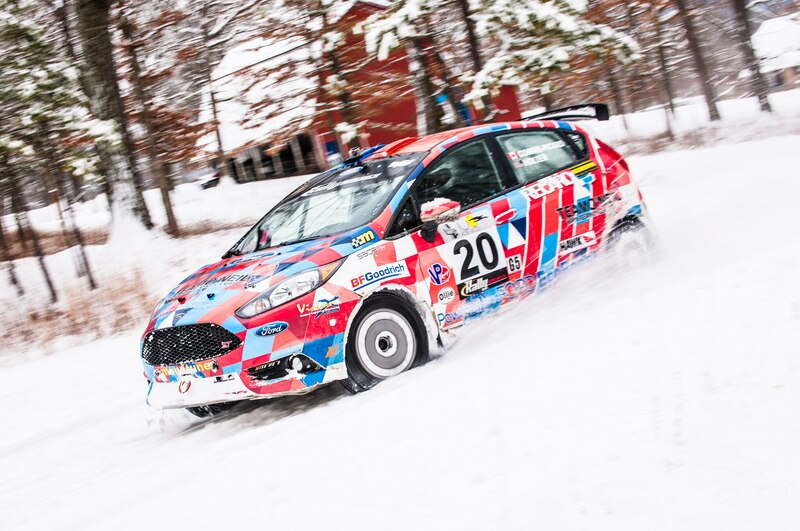 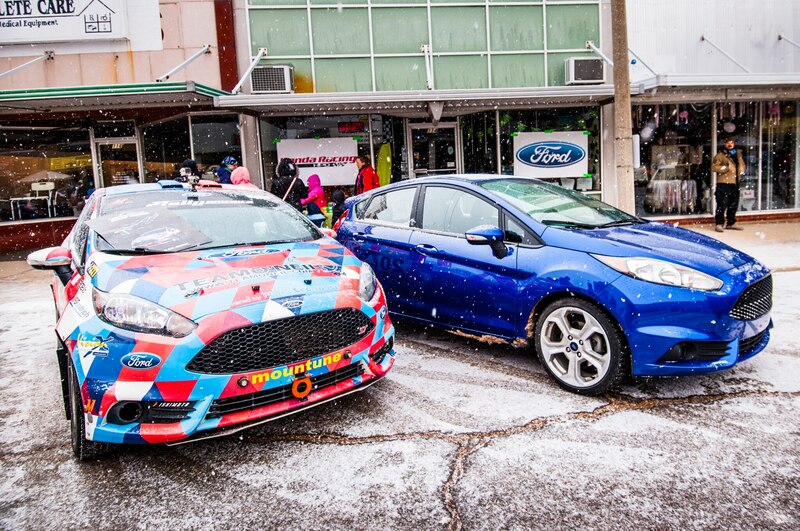 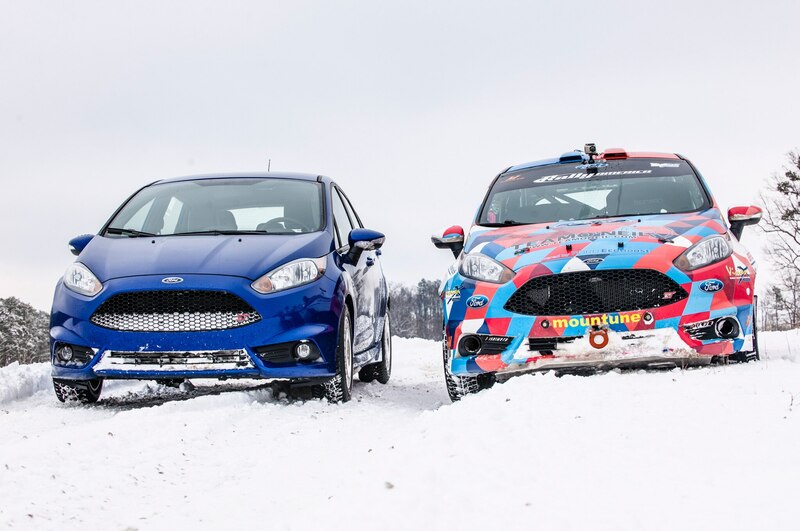 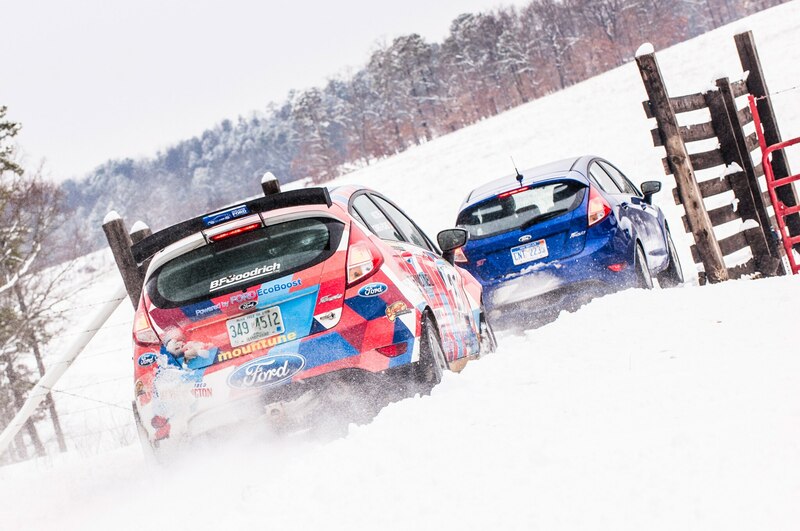 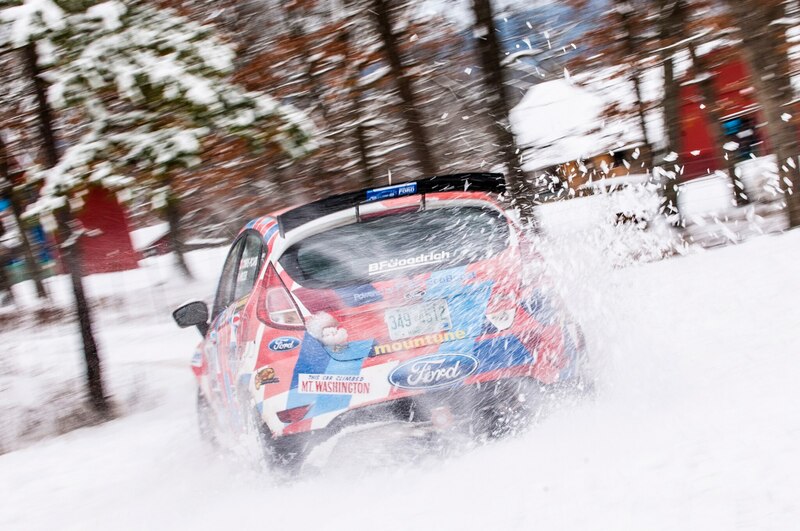 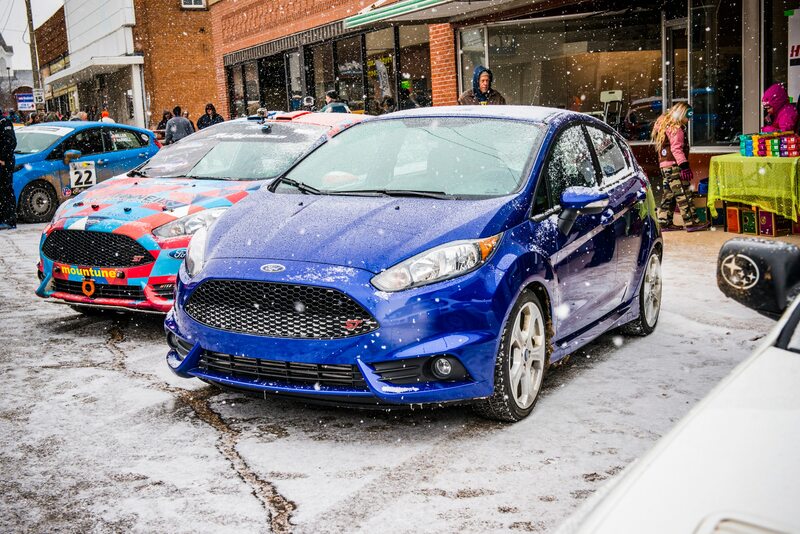 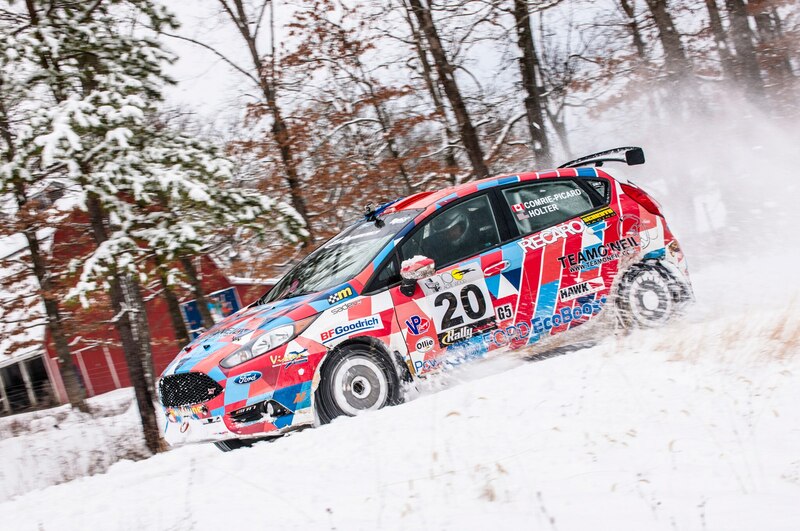 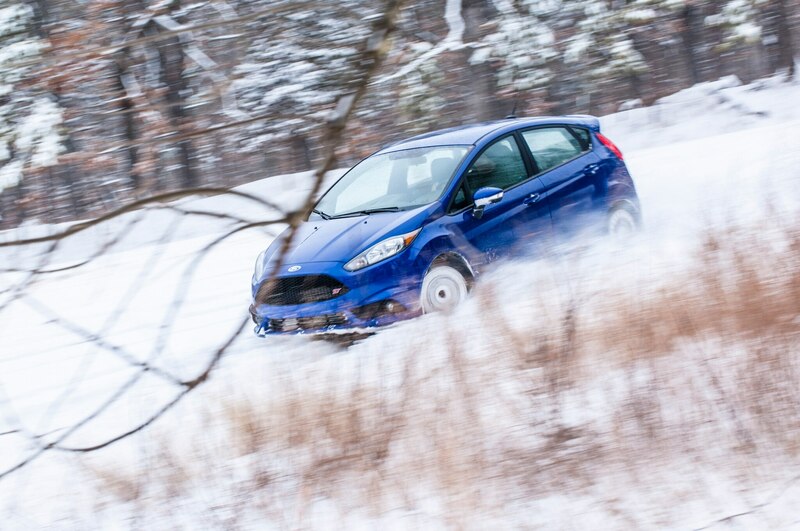 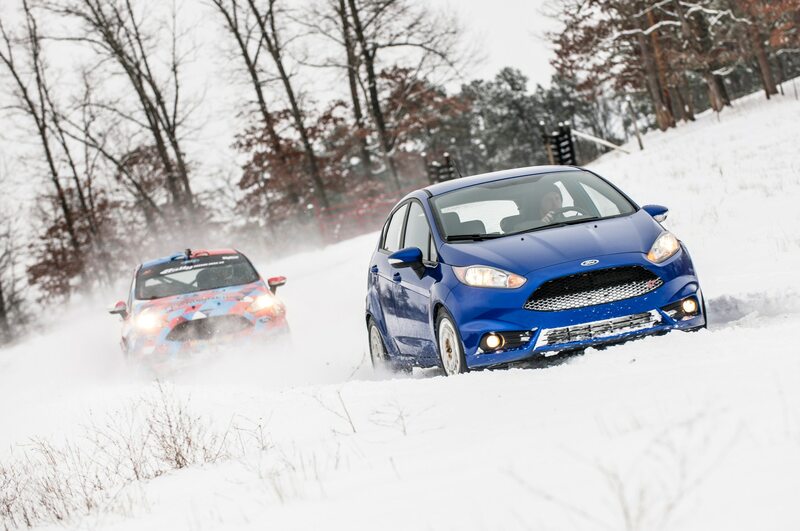 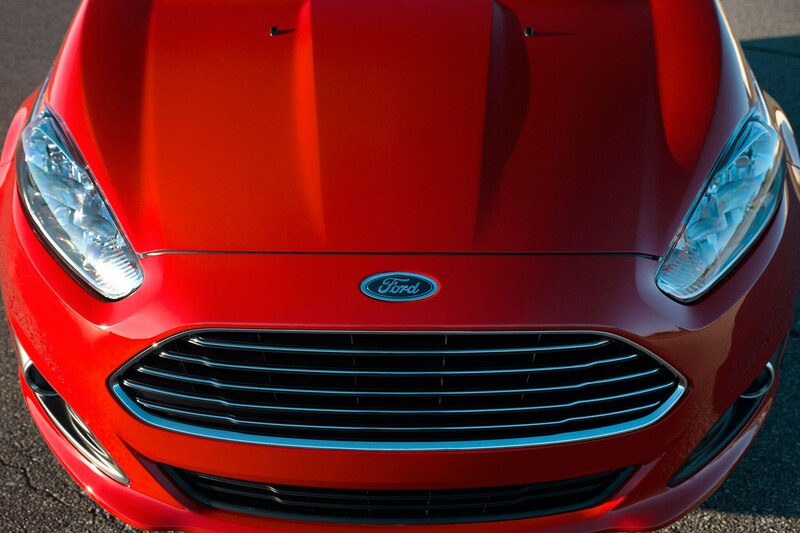 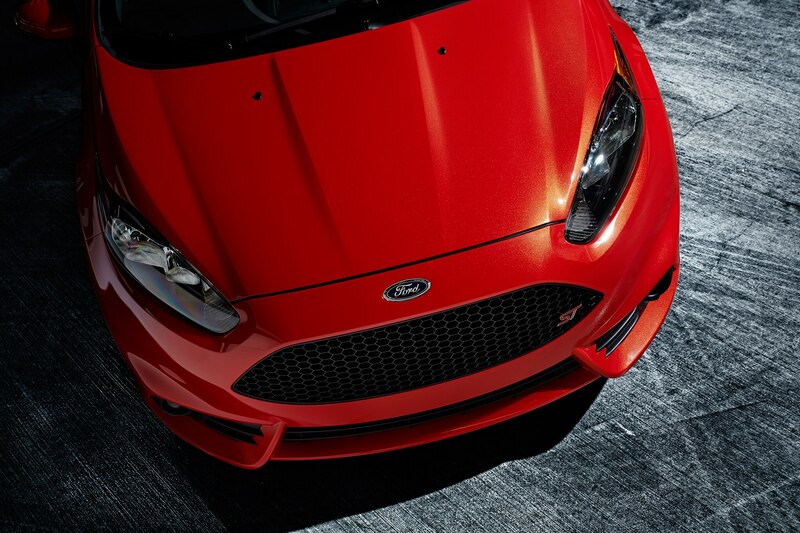 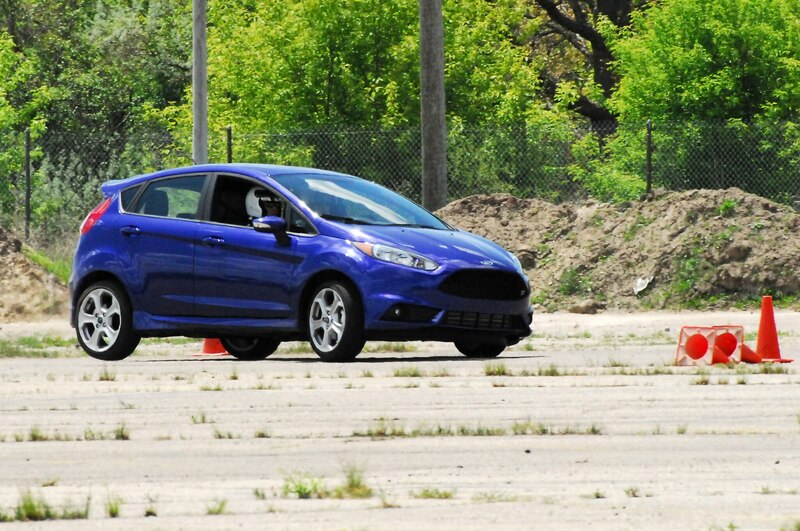 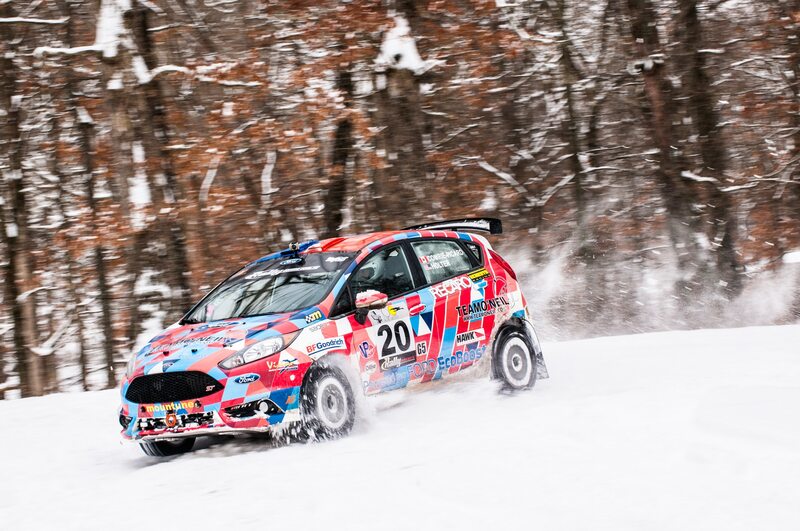 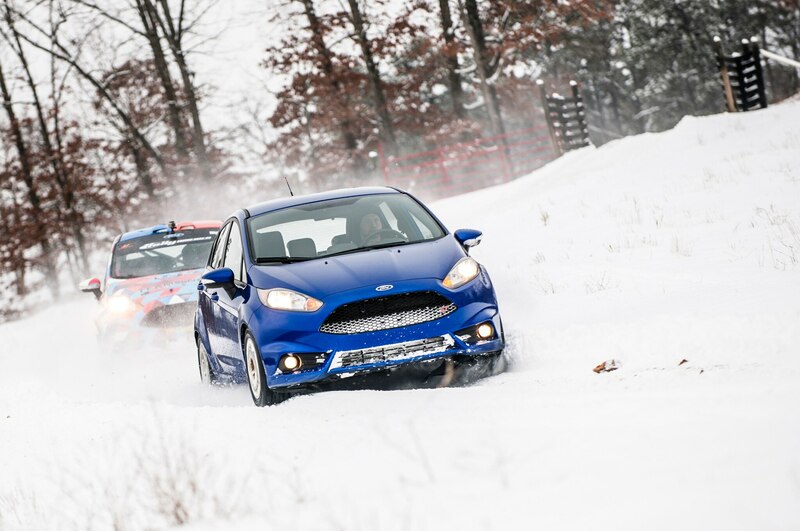 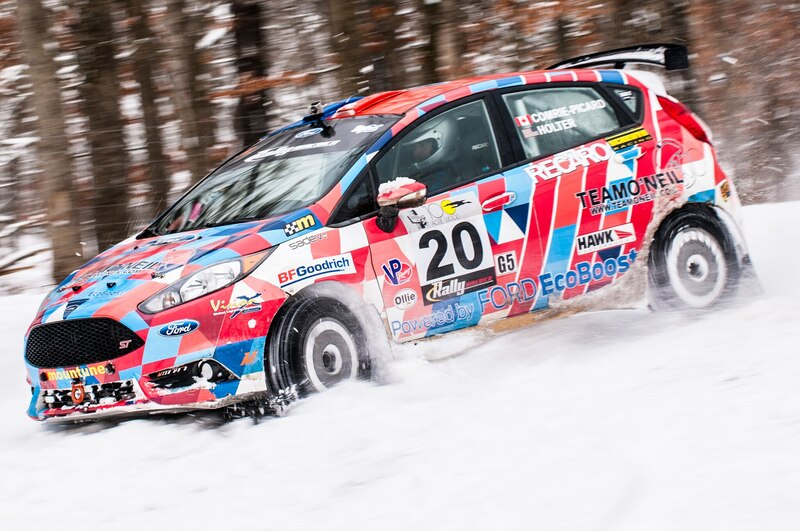 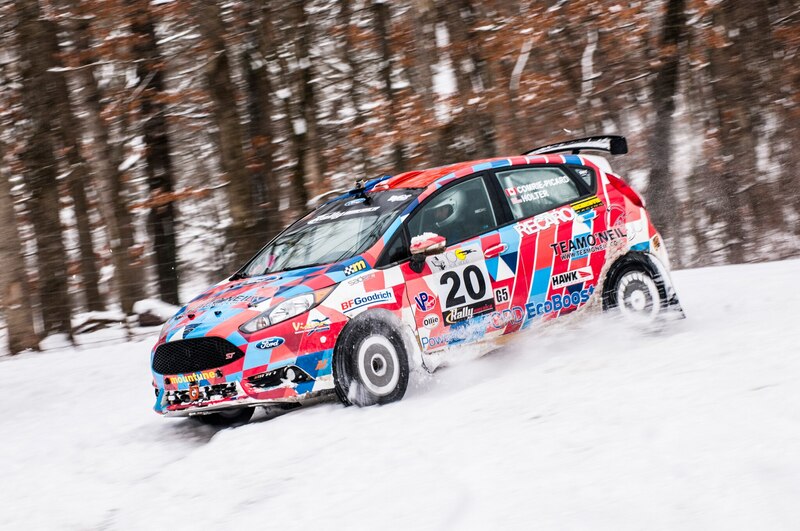 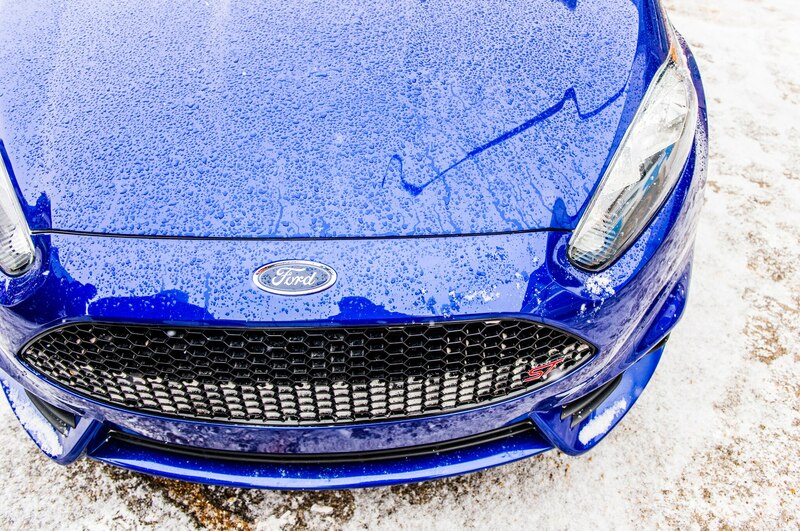 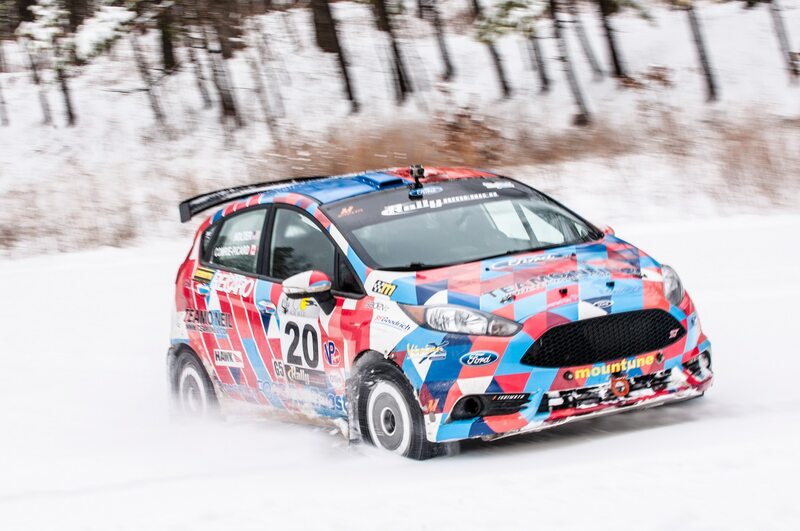 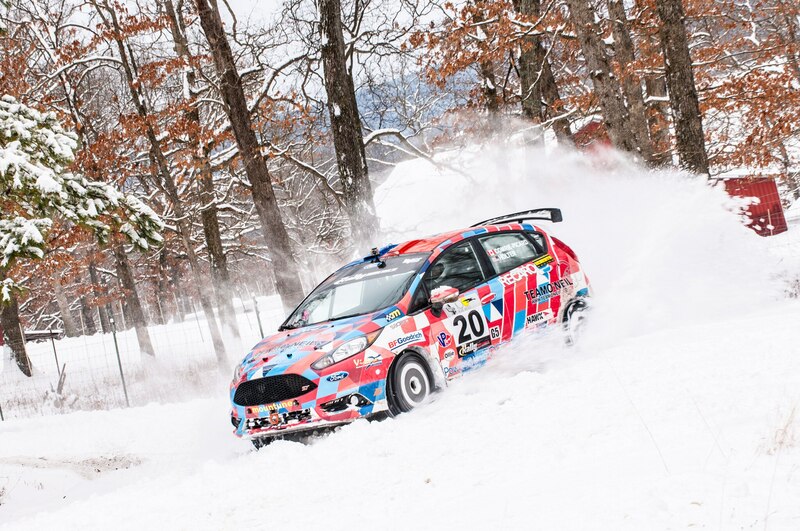 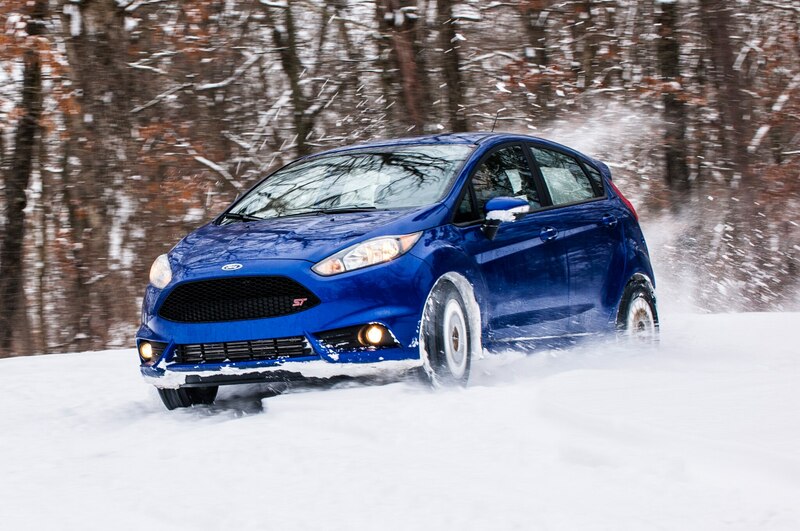 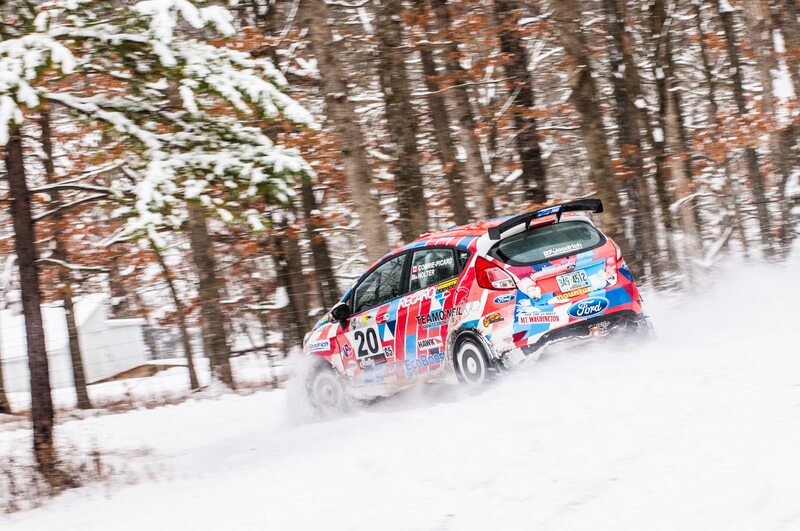 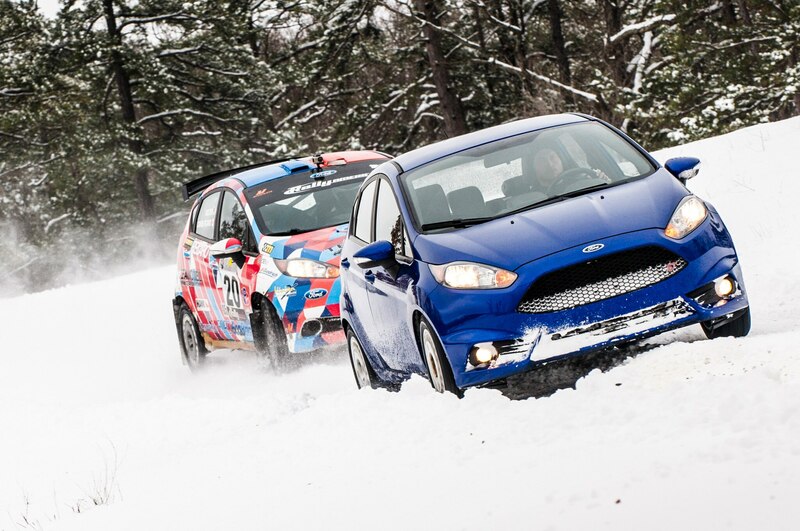 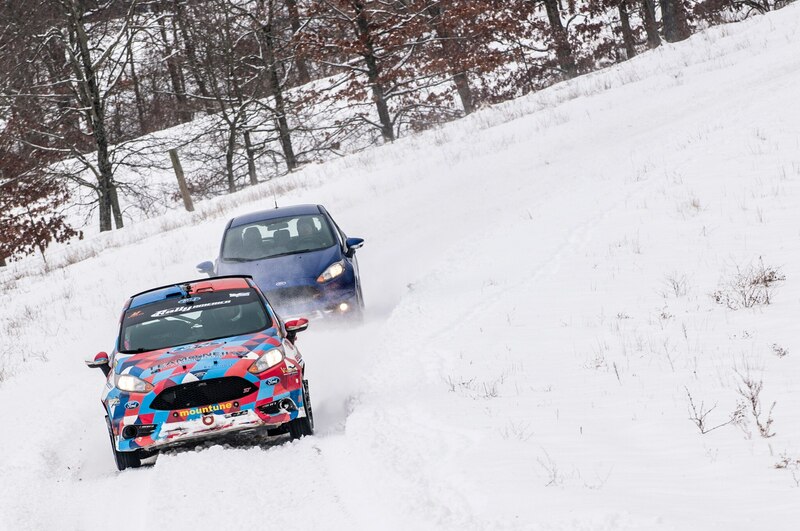 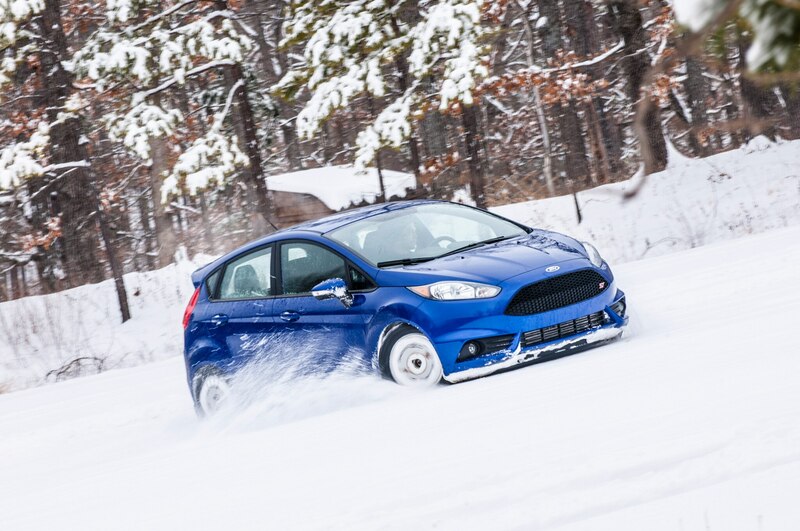 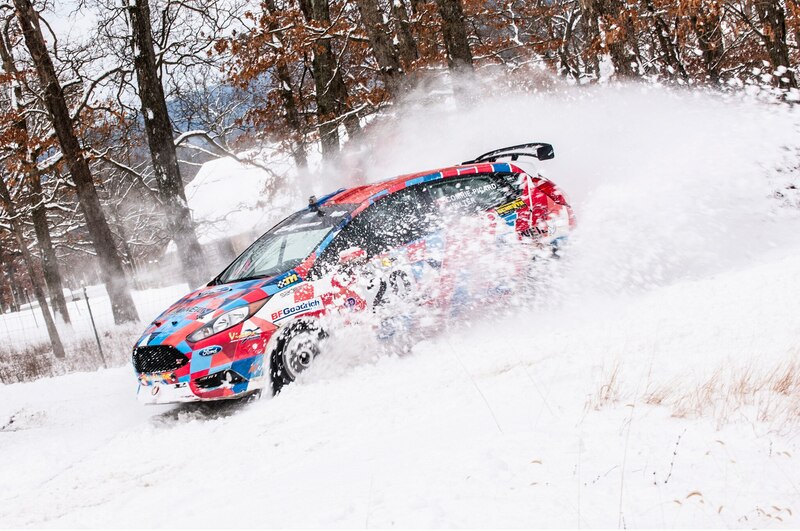 Rally is vicious and violent, a nonstop gauntlet our 2014 Ford Fiesta ST couldn’t possibly survive. 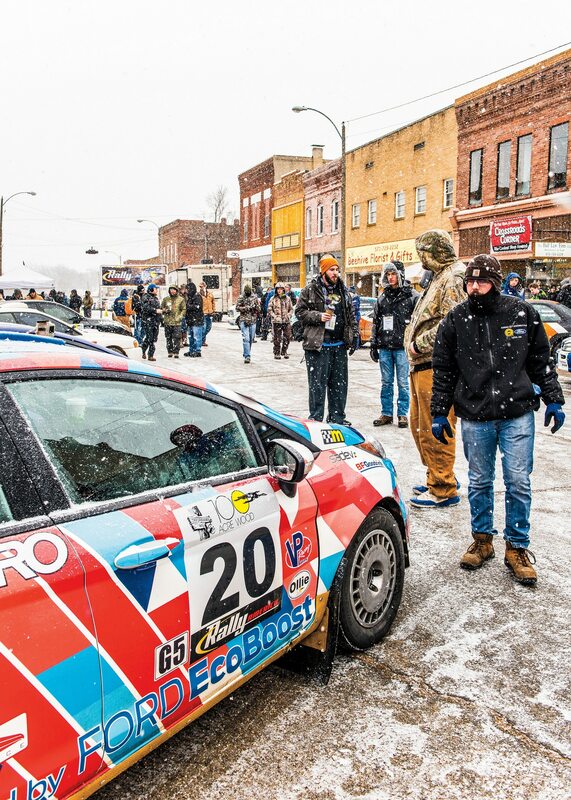 So why bring it to the 100-Acre Wood Rally in Salem, Missouri? 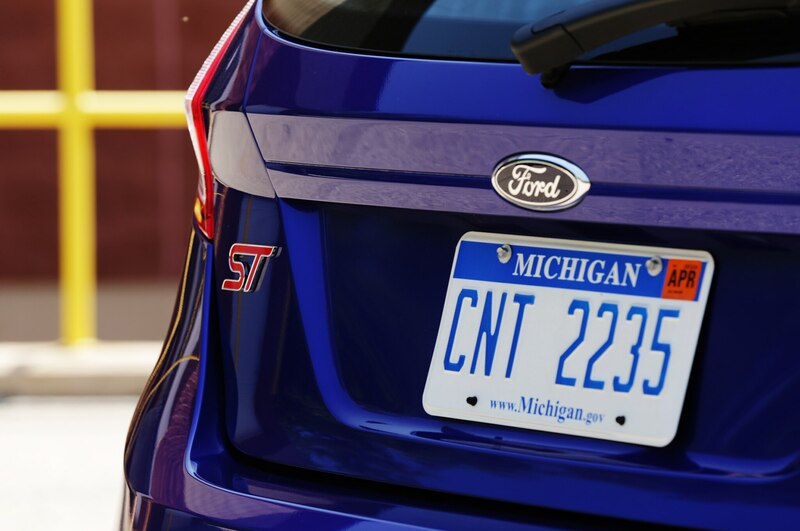 To watch it fail, finally, at something. 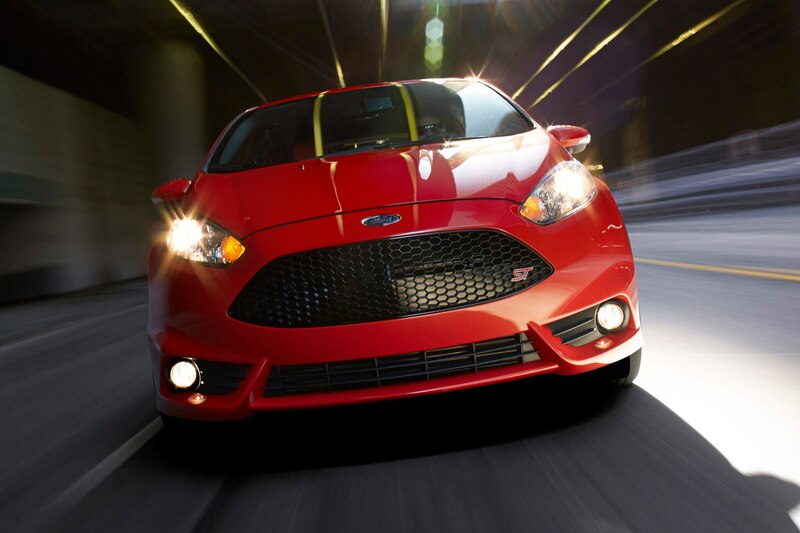 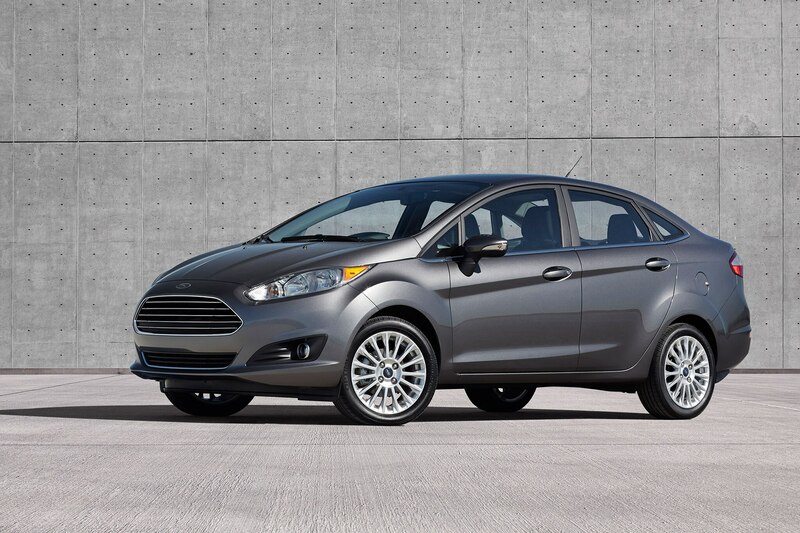 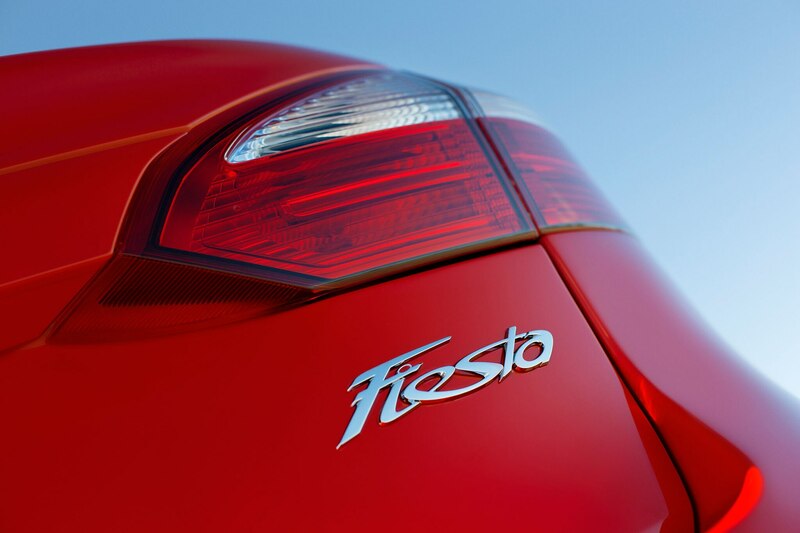 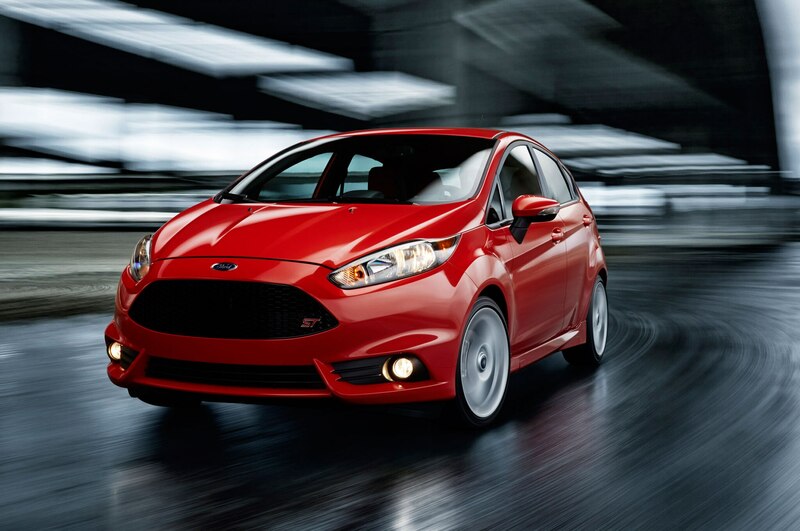 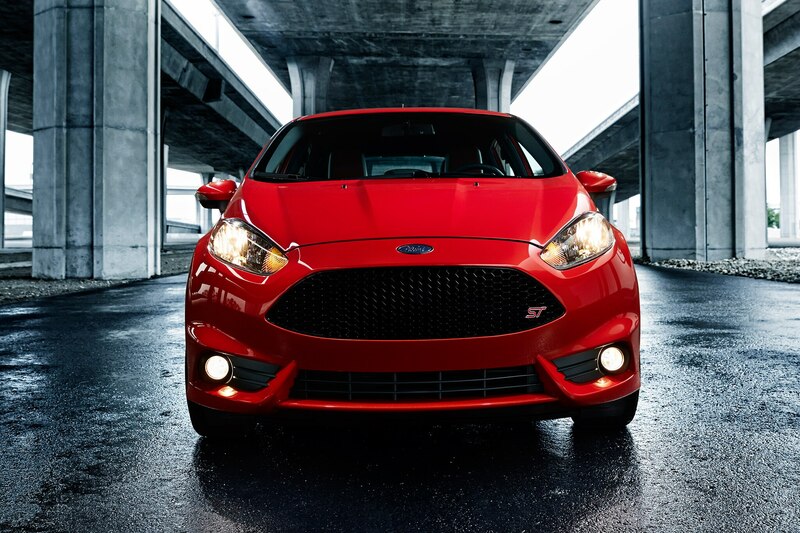 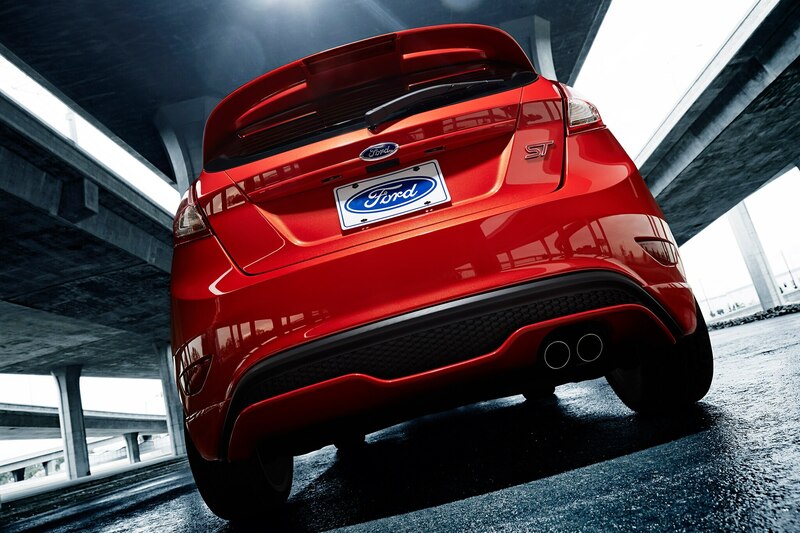 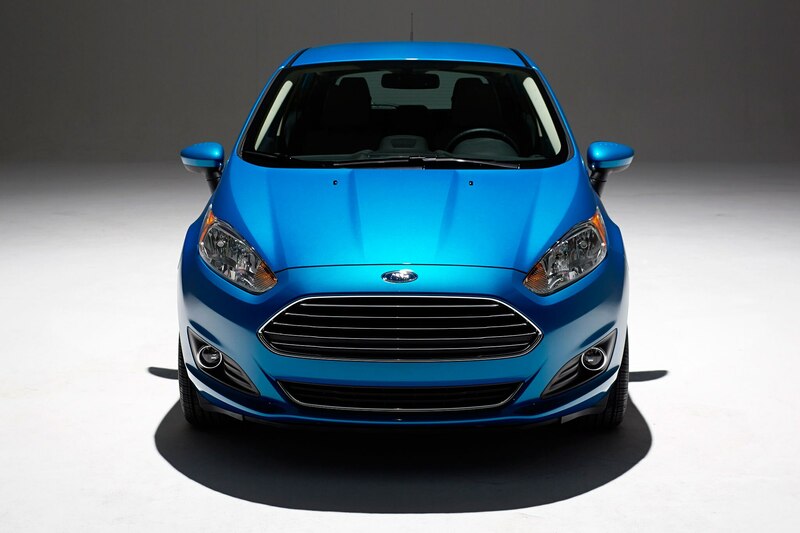 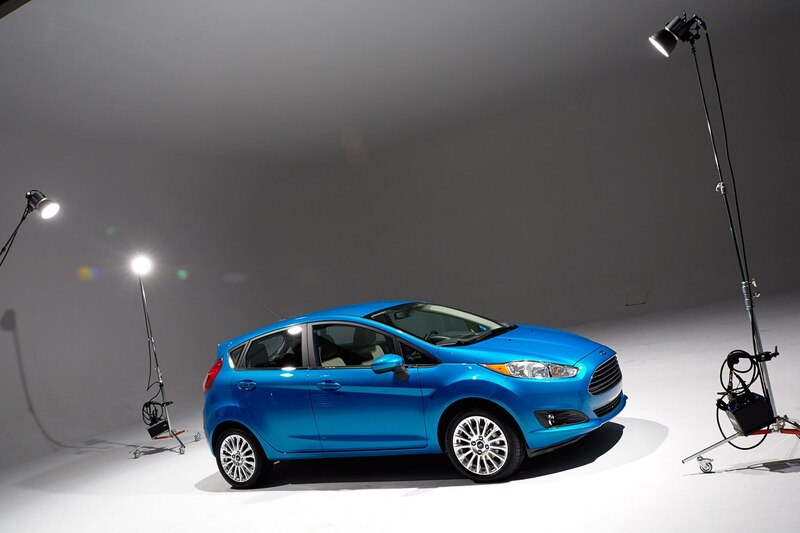 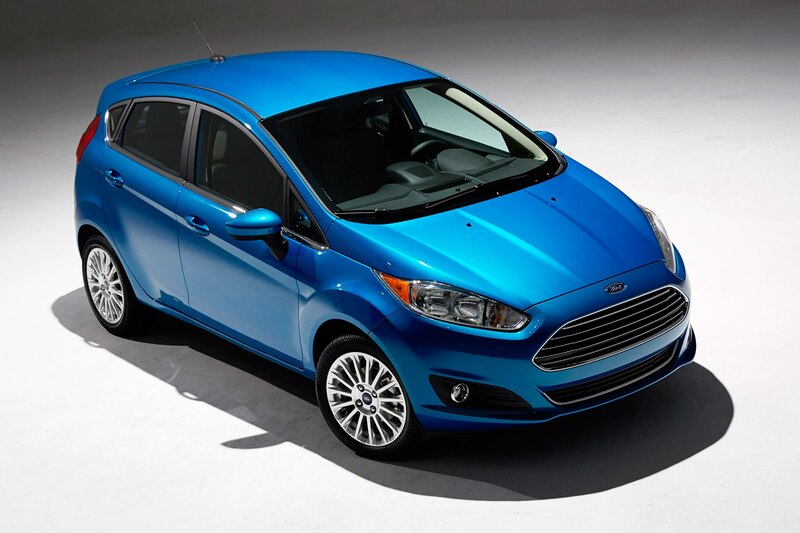 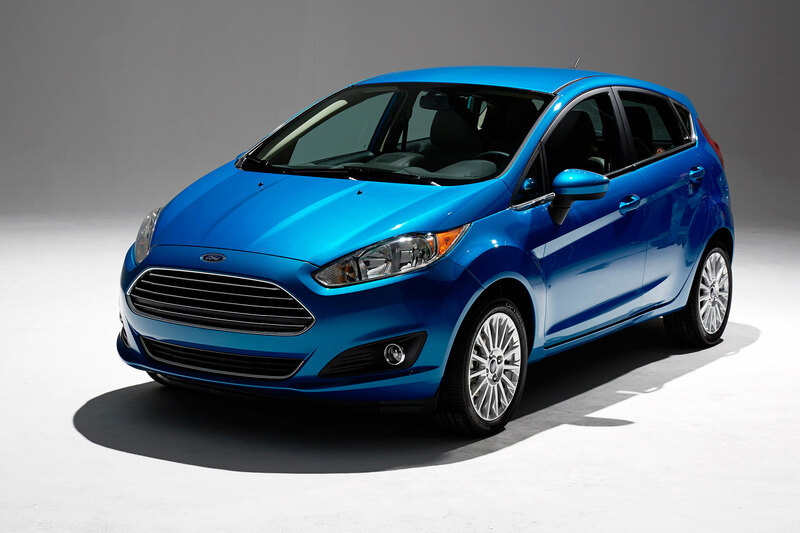 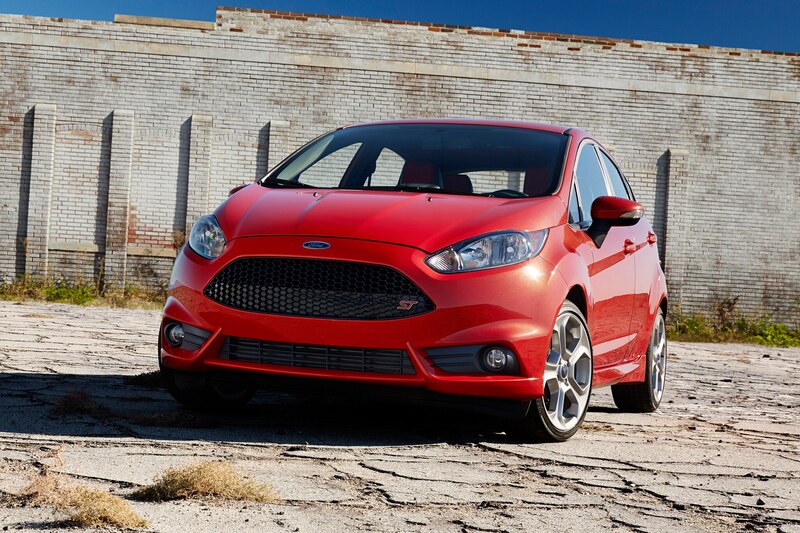 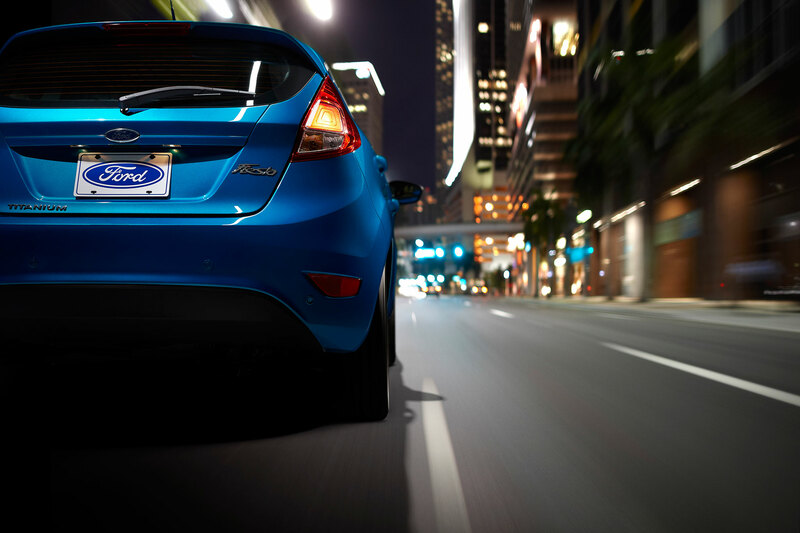 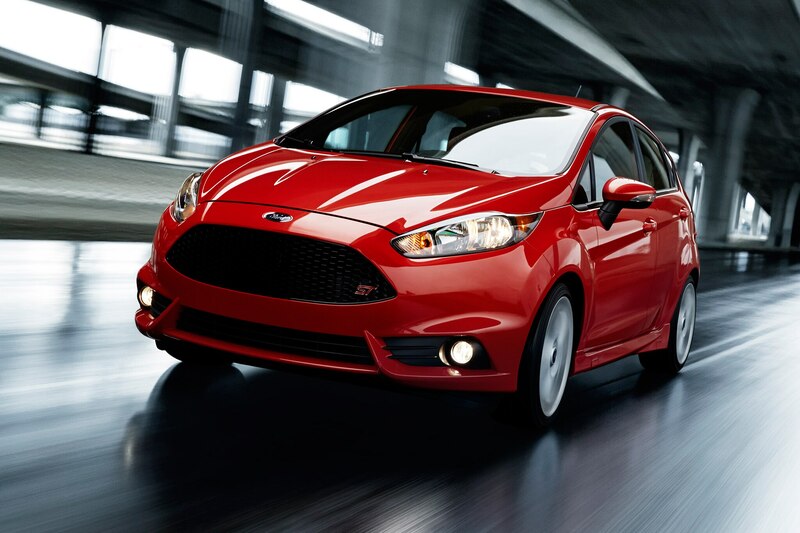 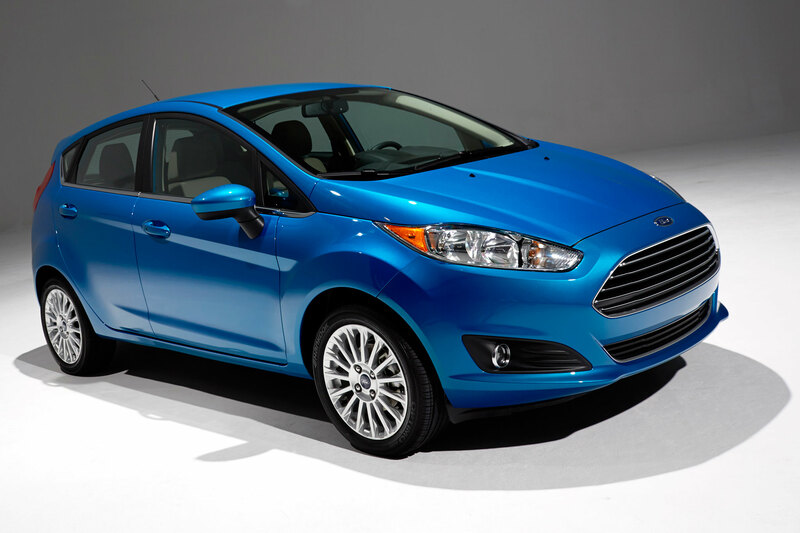 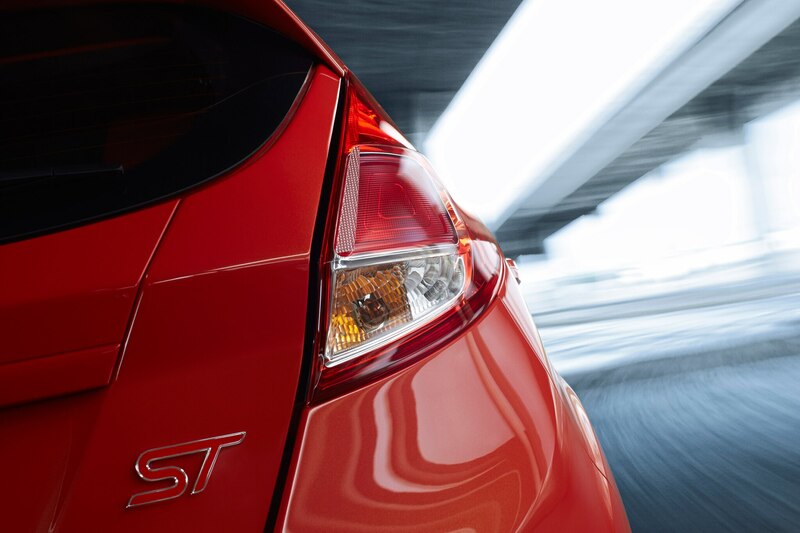 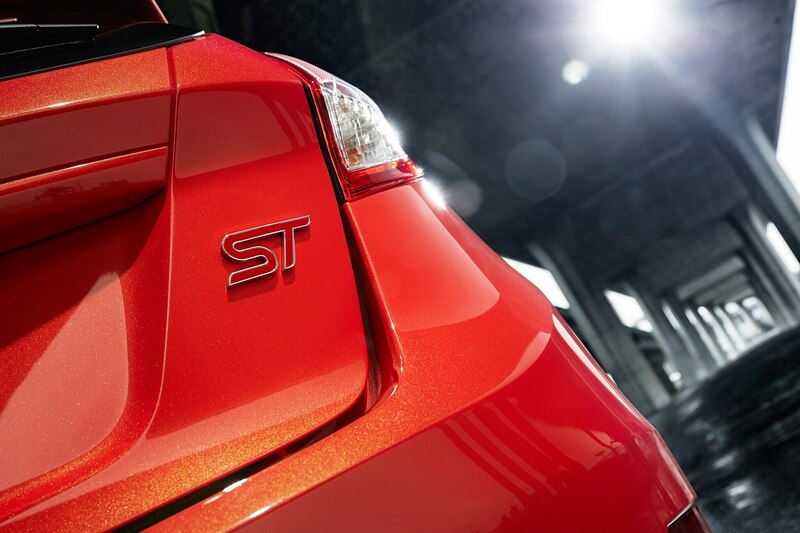 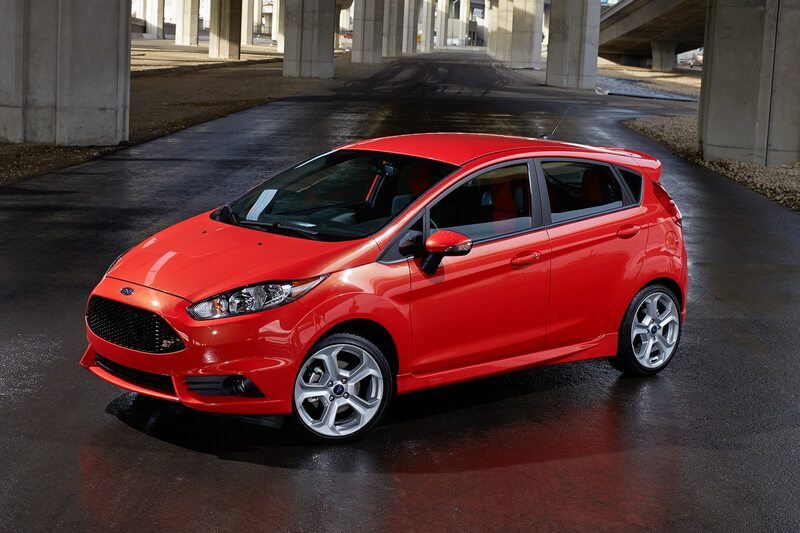 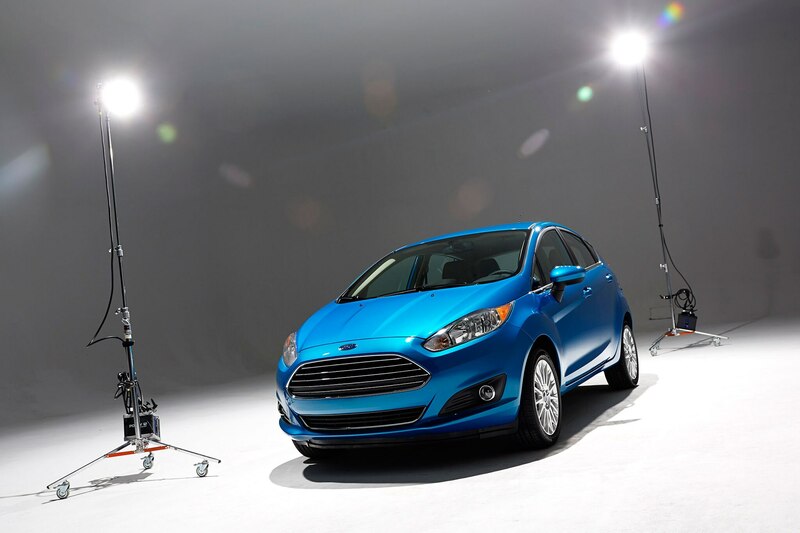 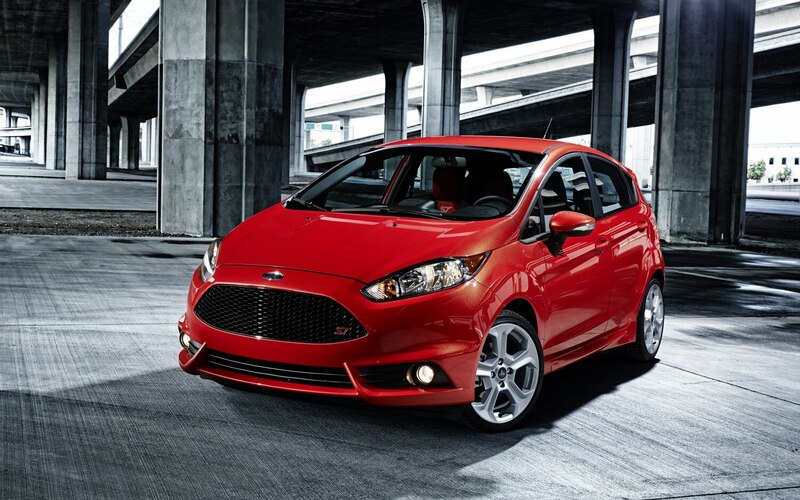 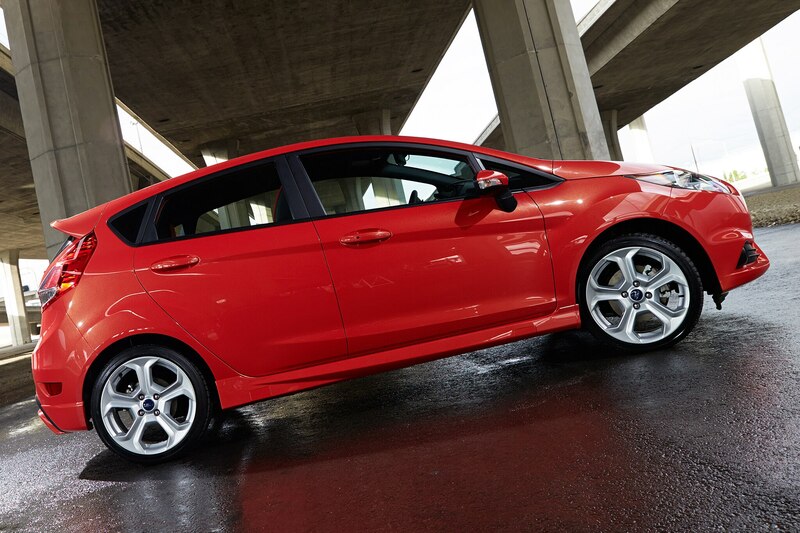 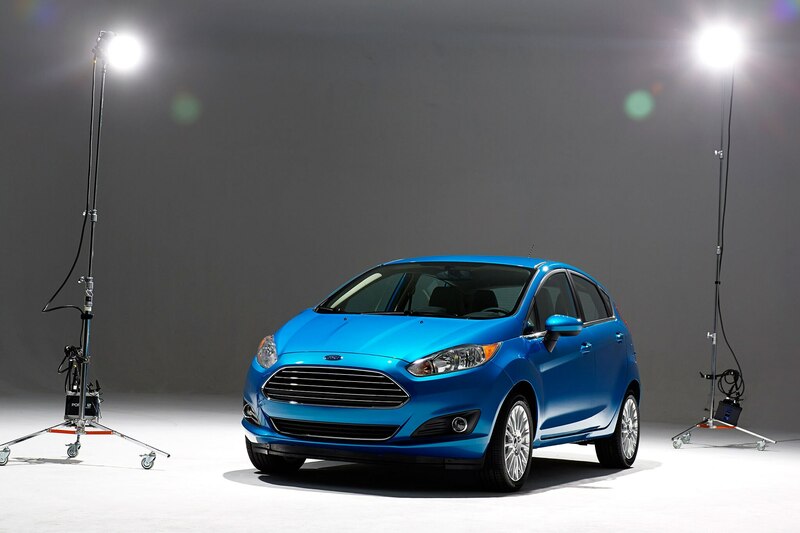 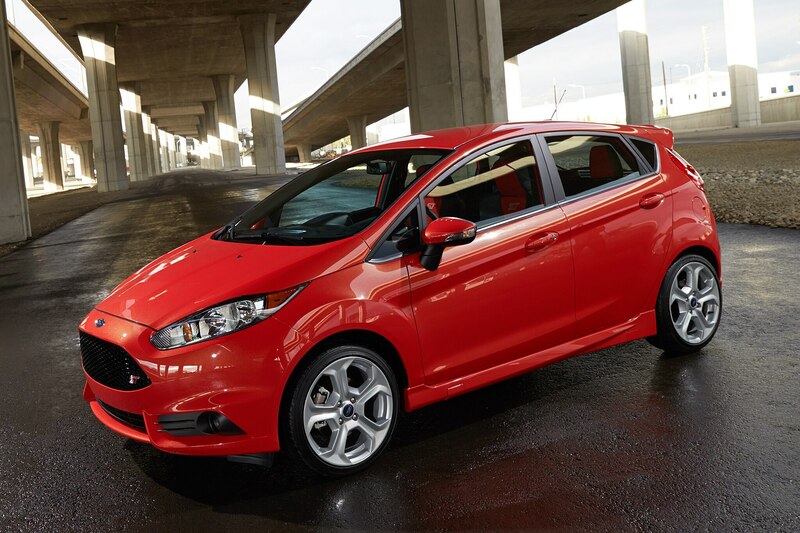 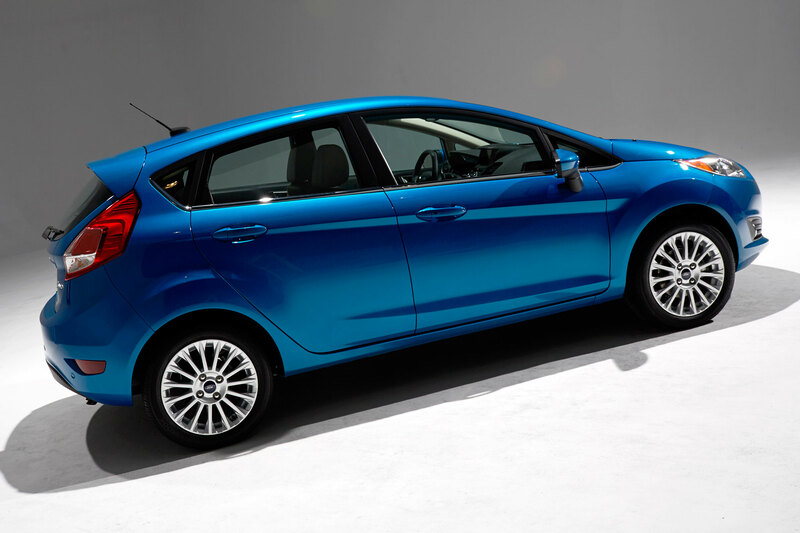 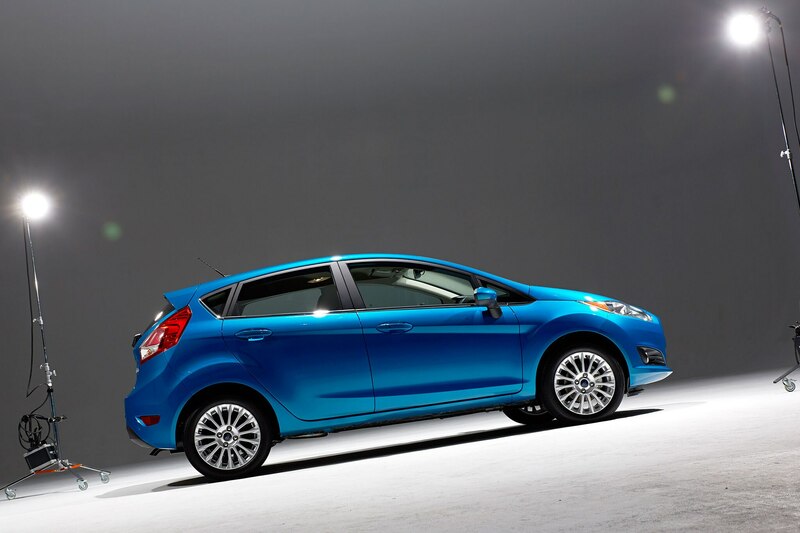 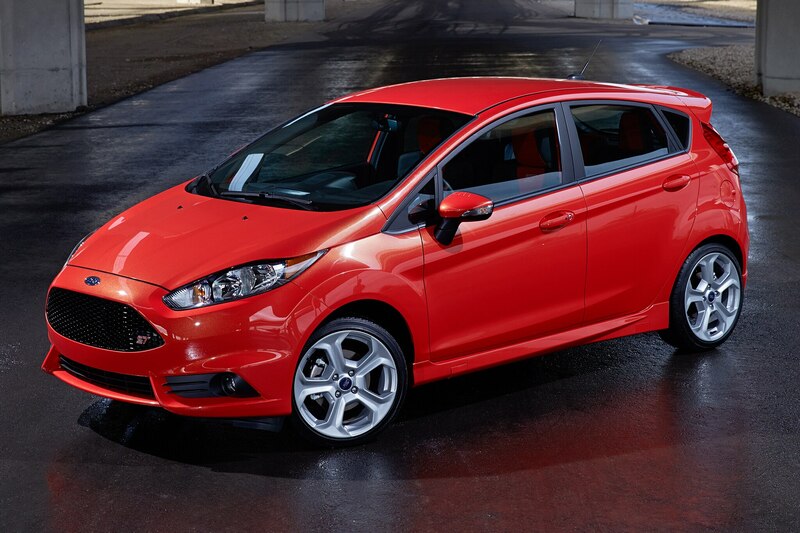 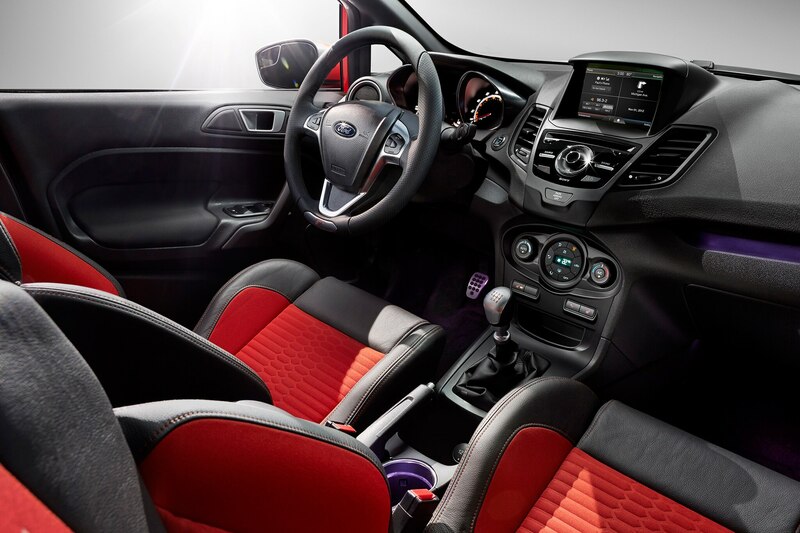 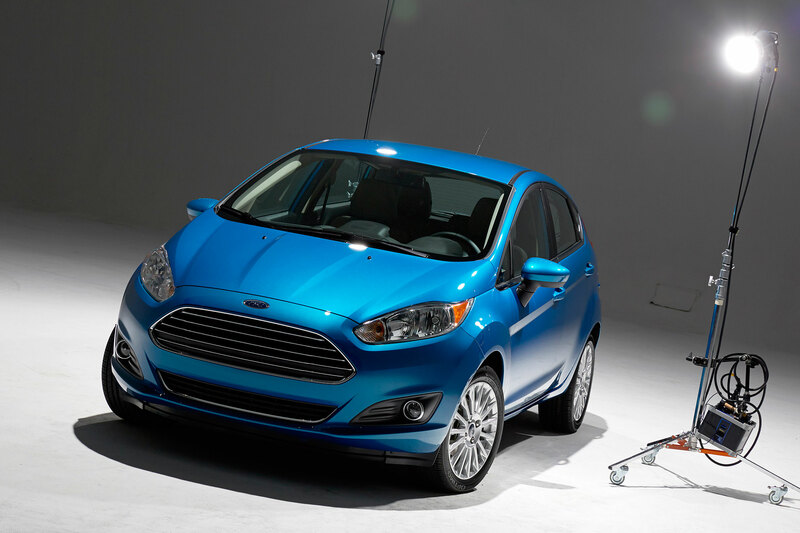 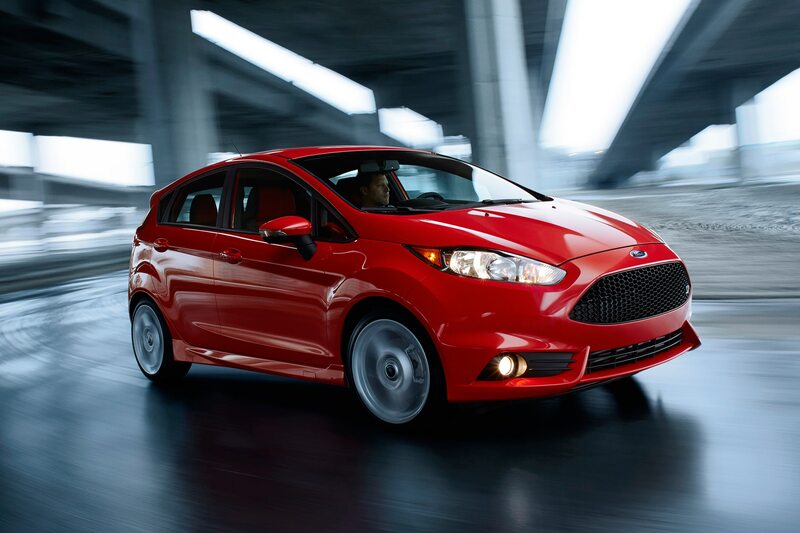 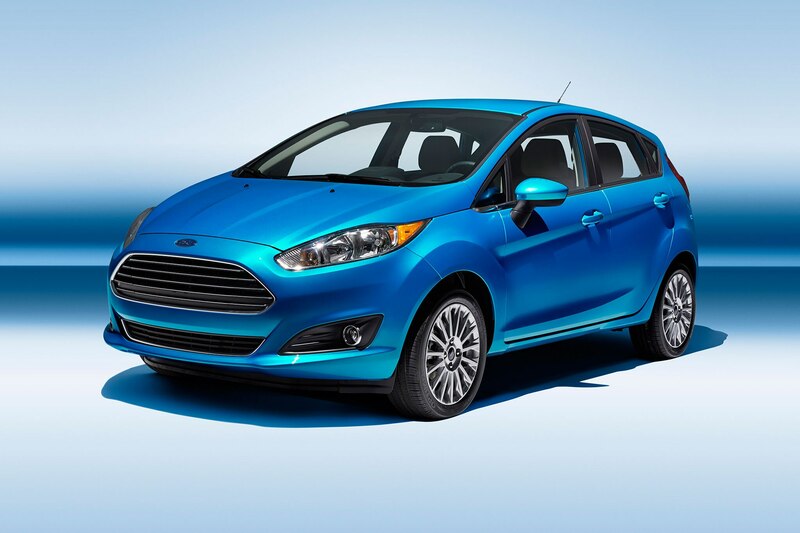 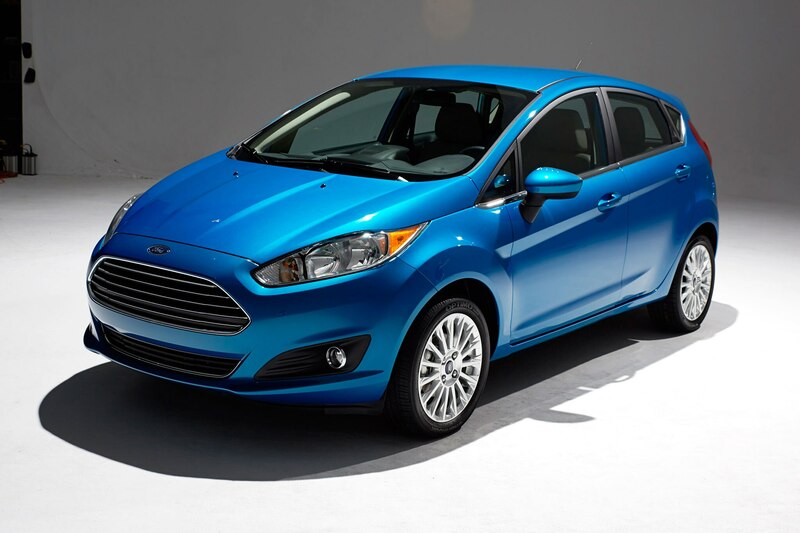 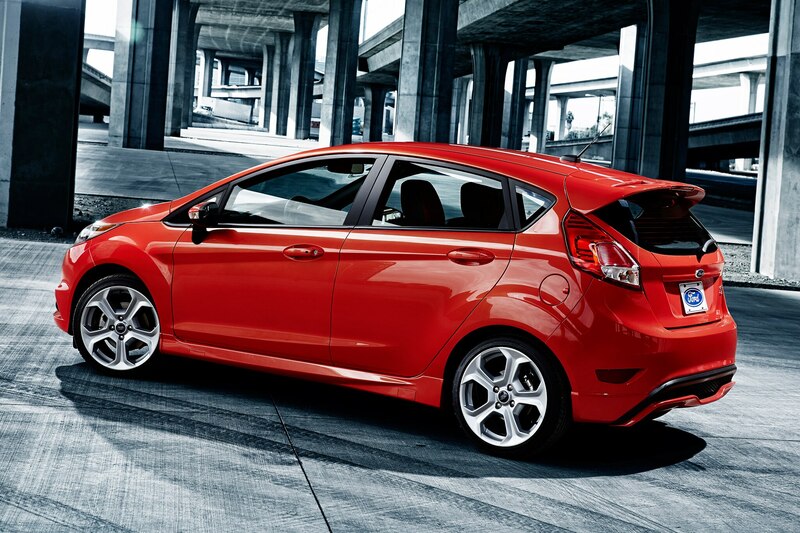 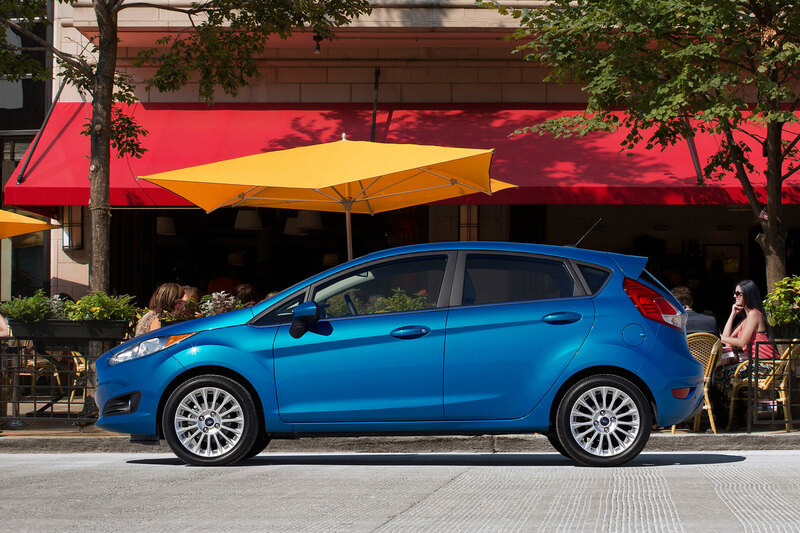 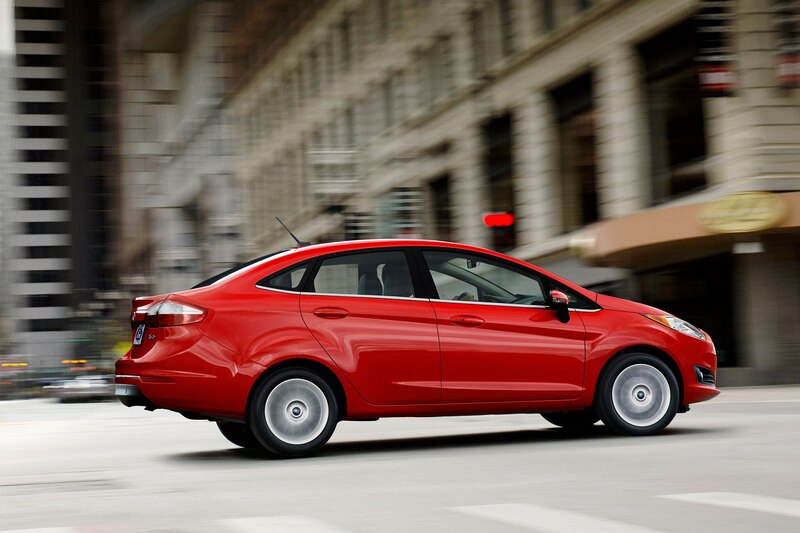 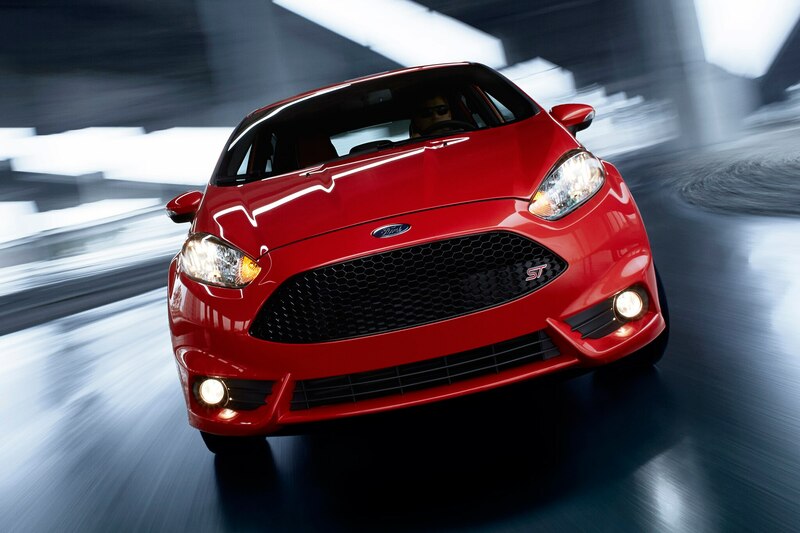 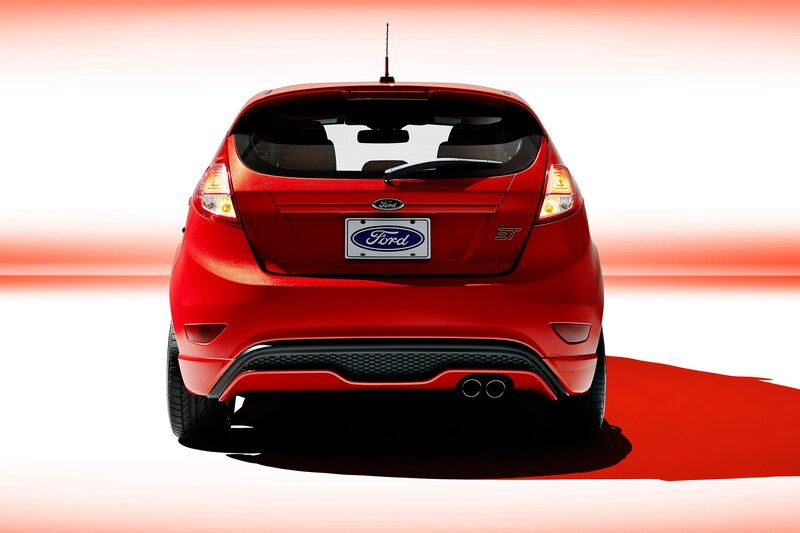 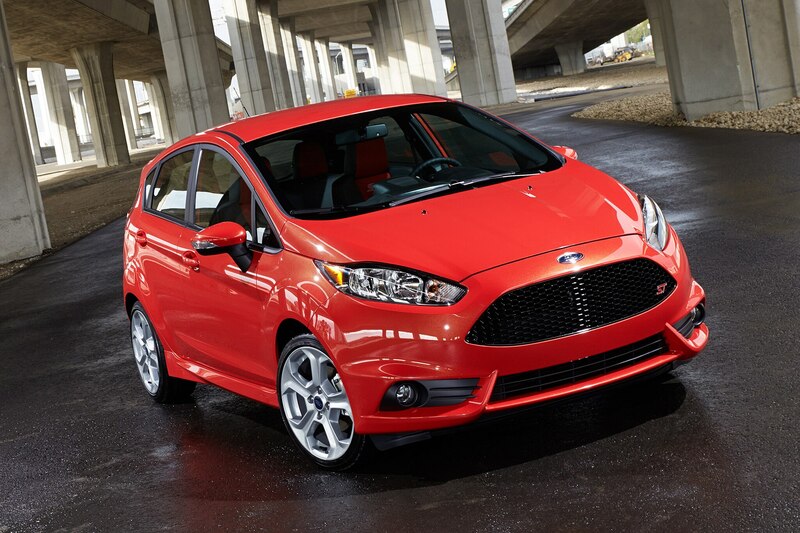 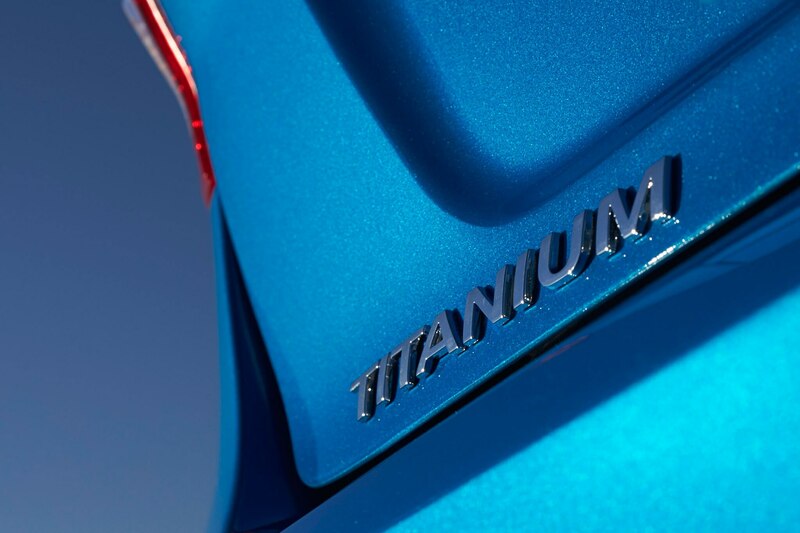 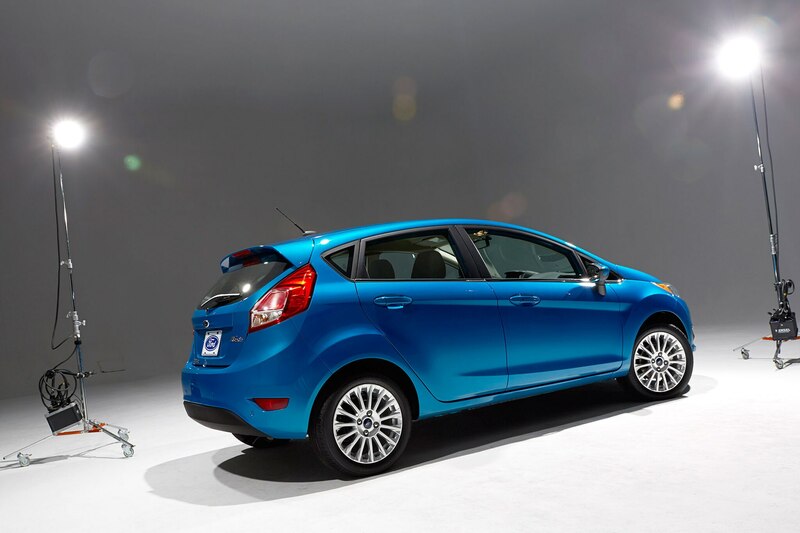 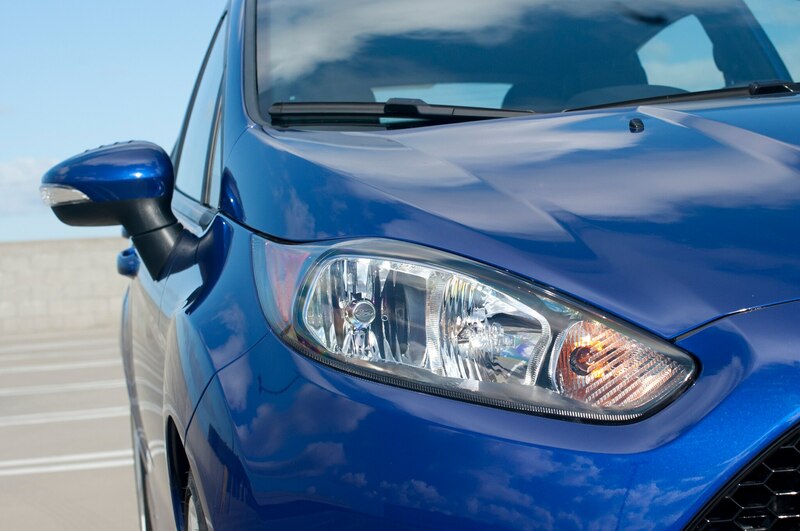 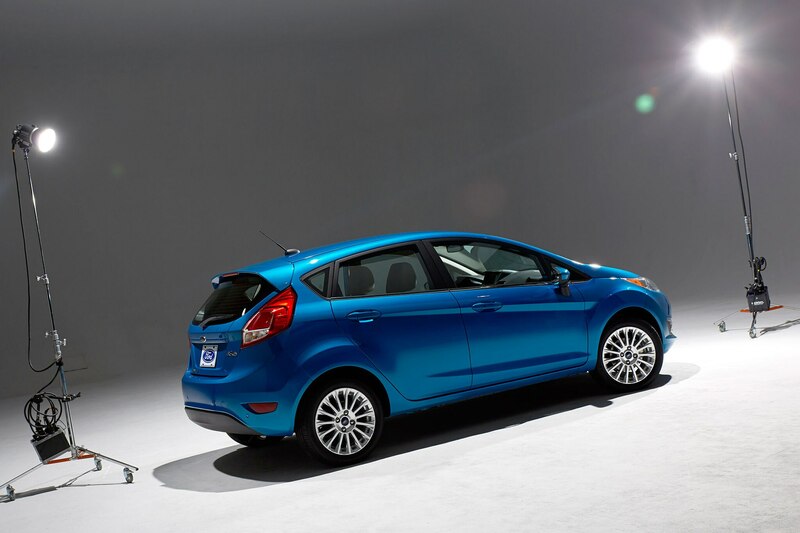 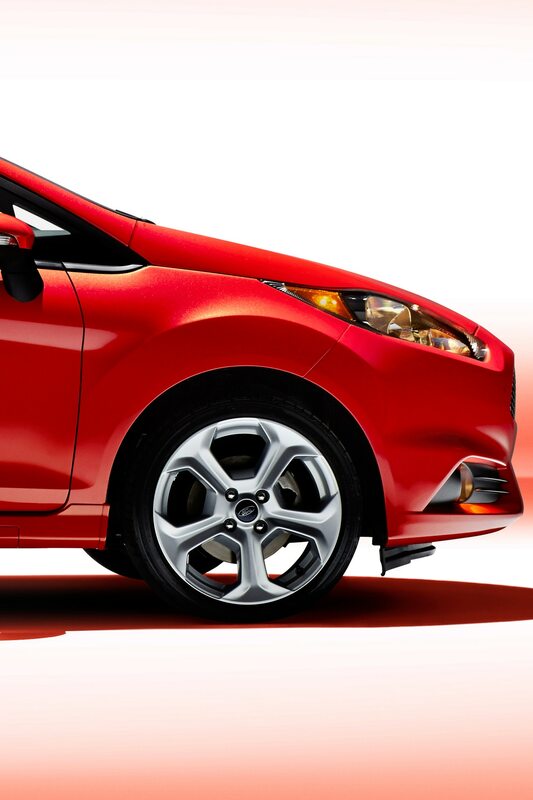 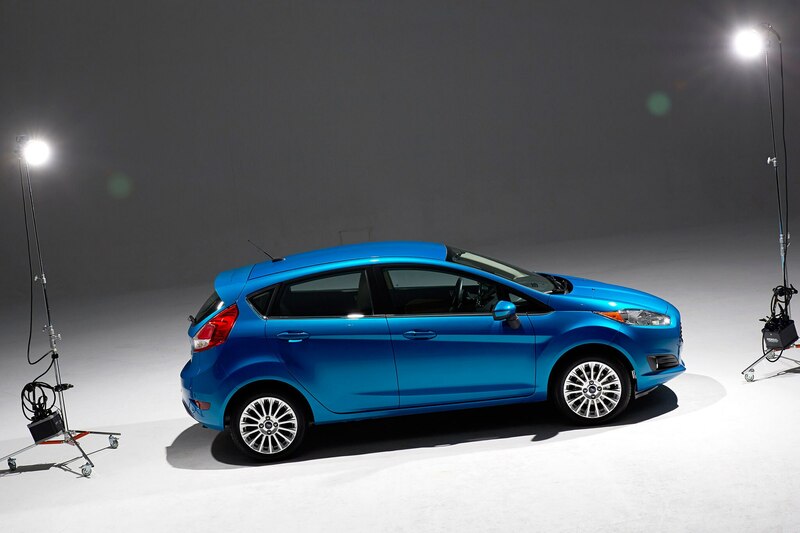 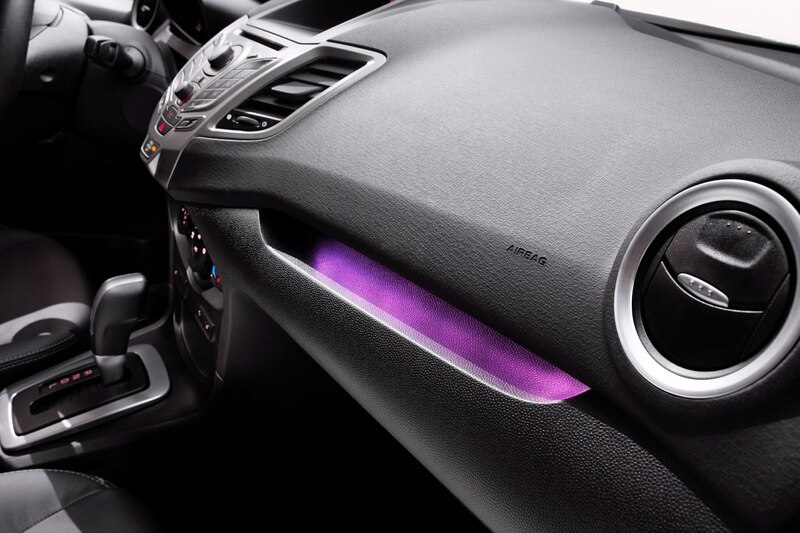 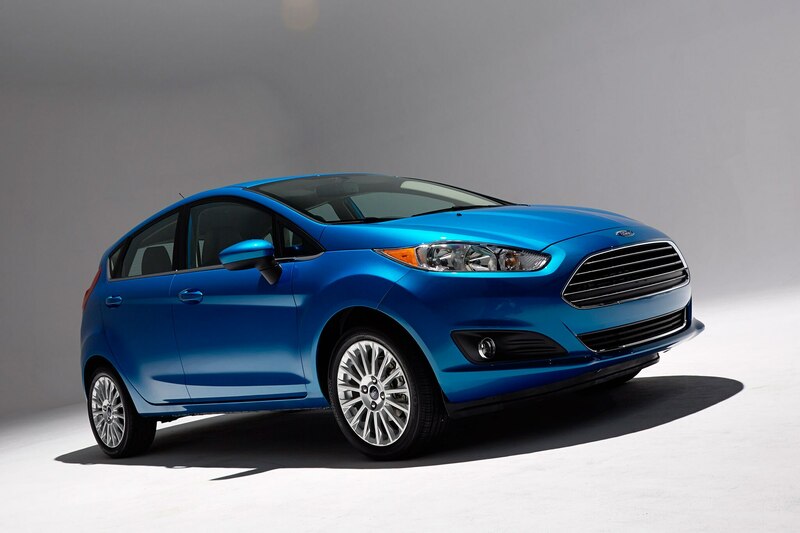 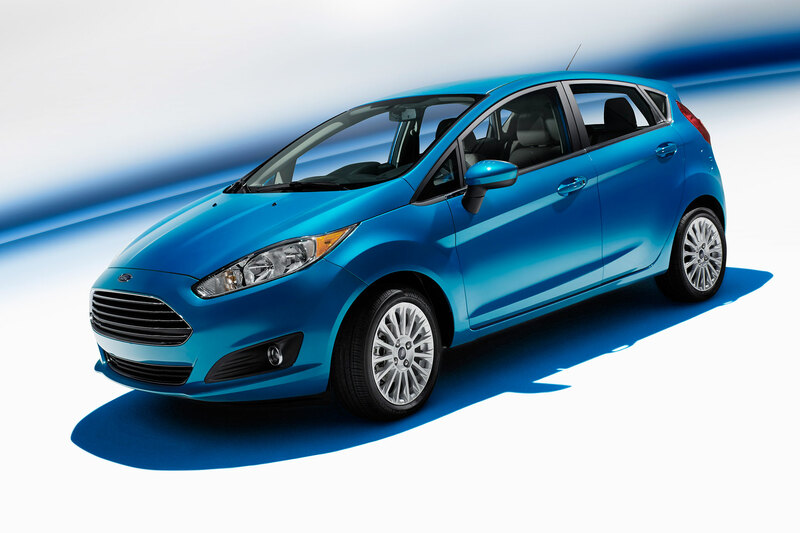 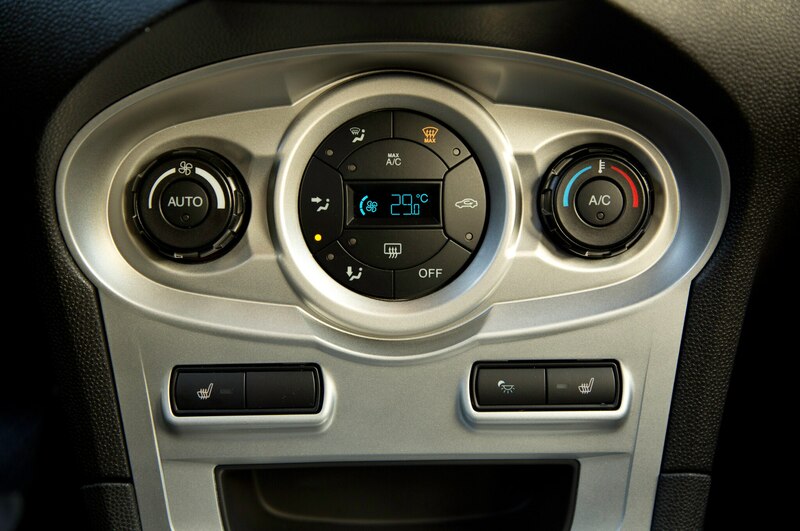 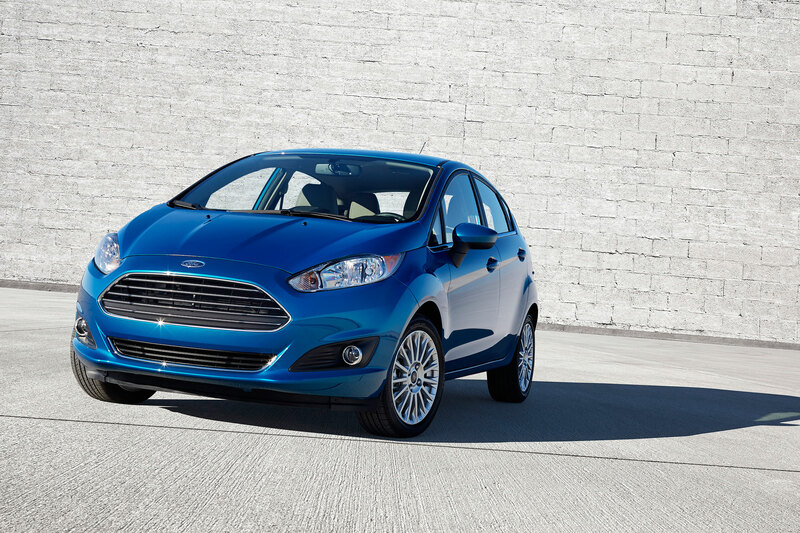 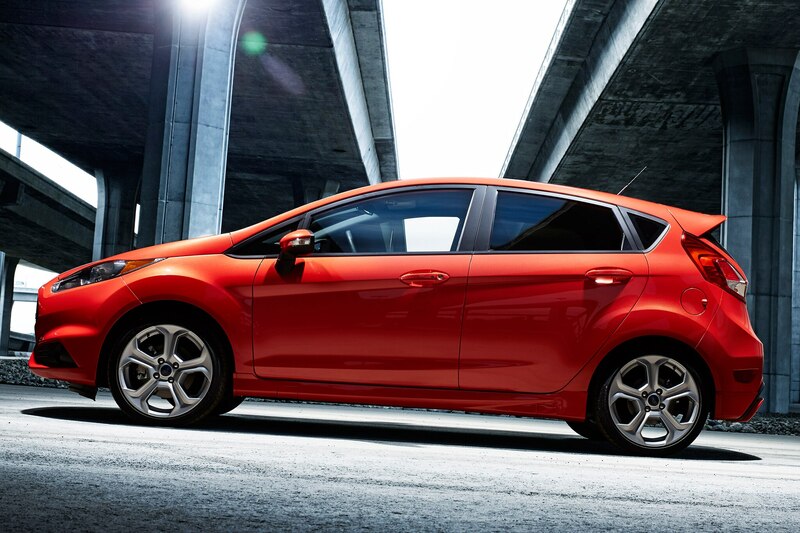 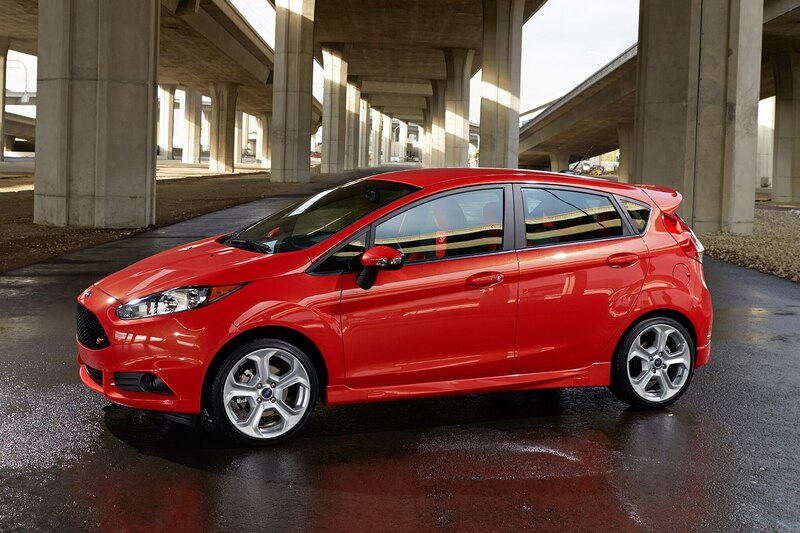 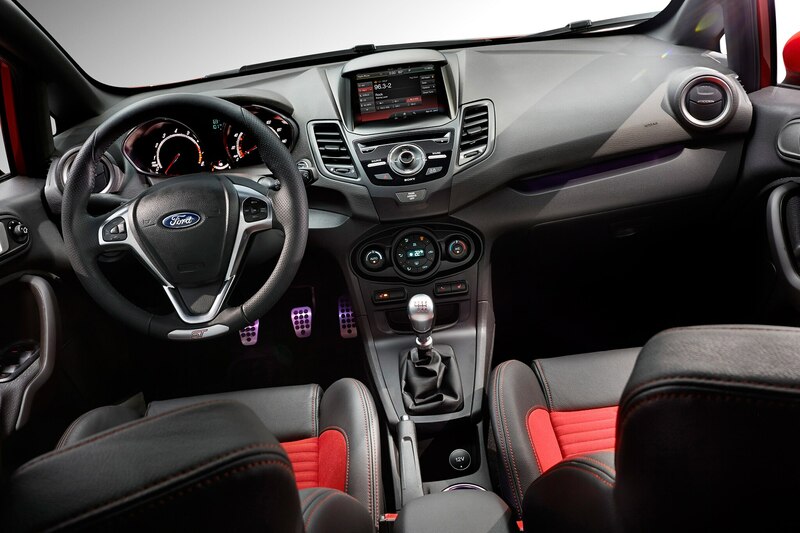 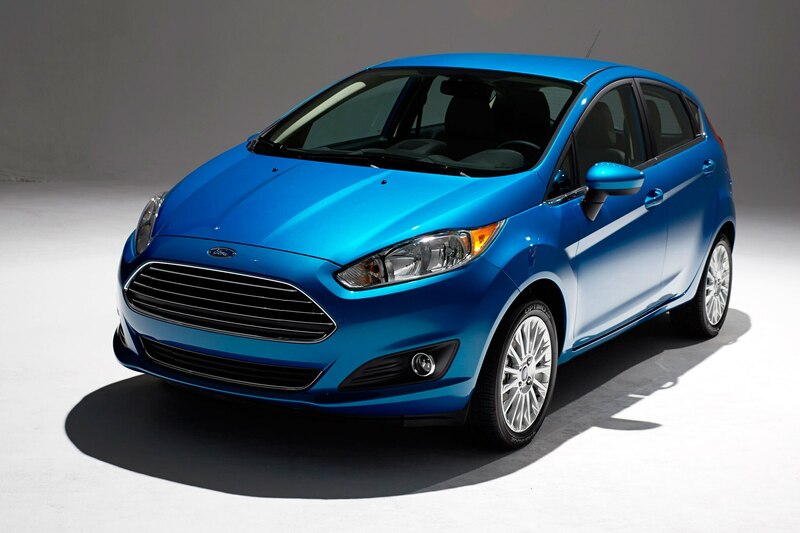 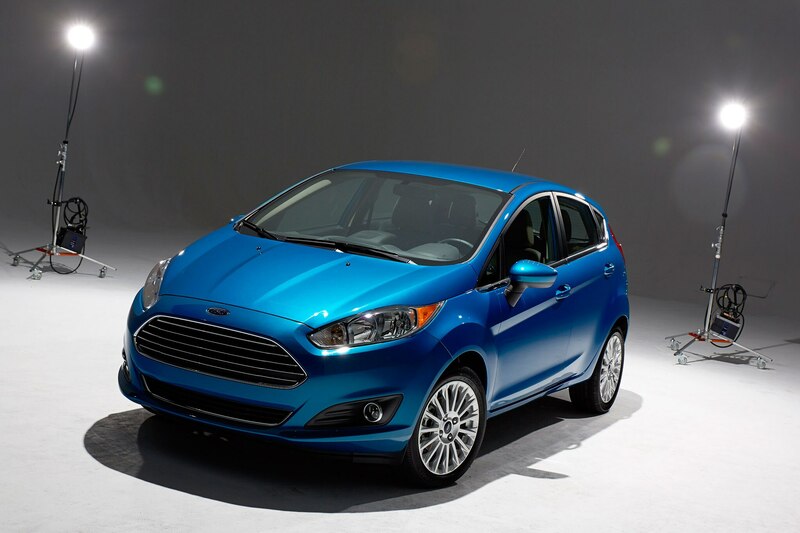 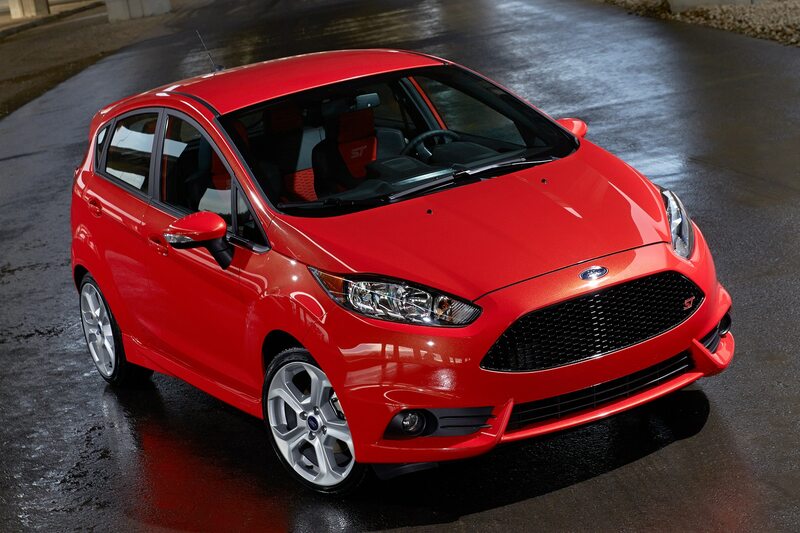 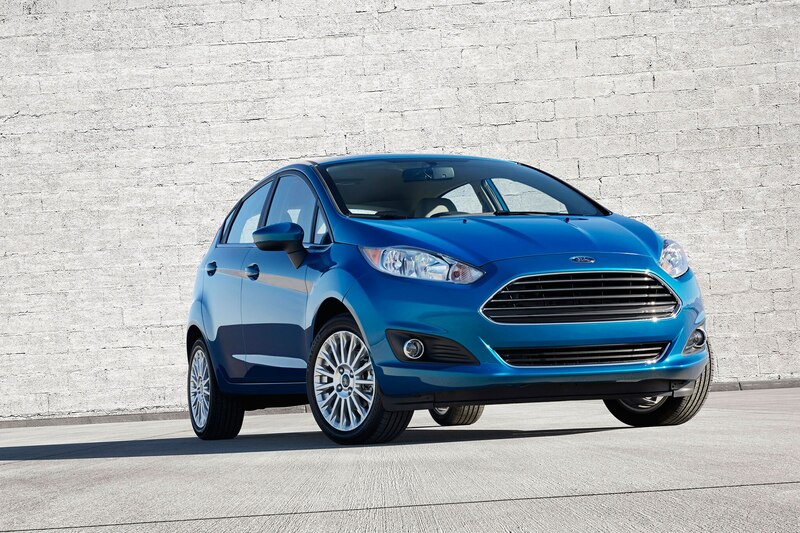 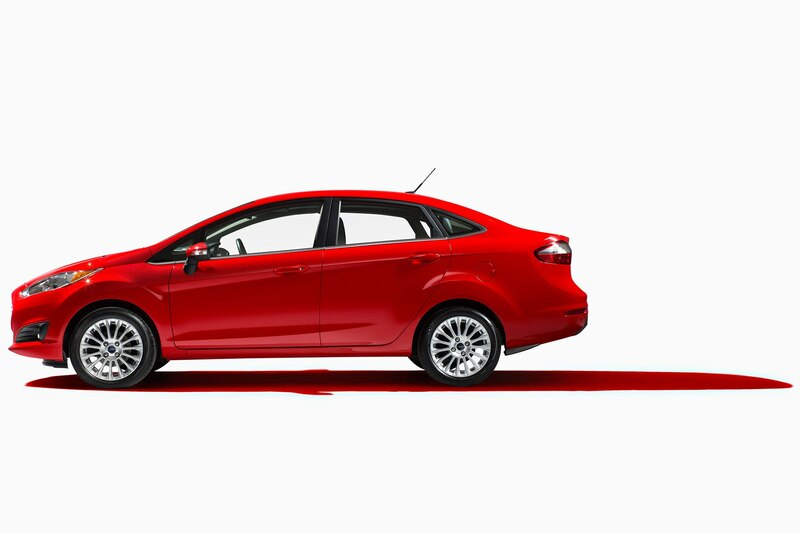 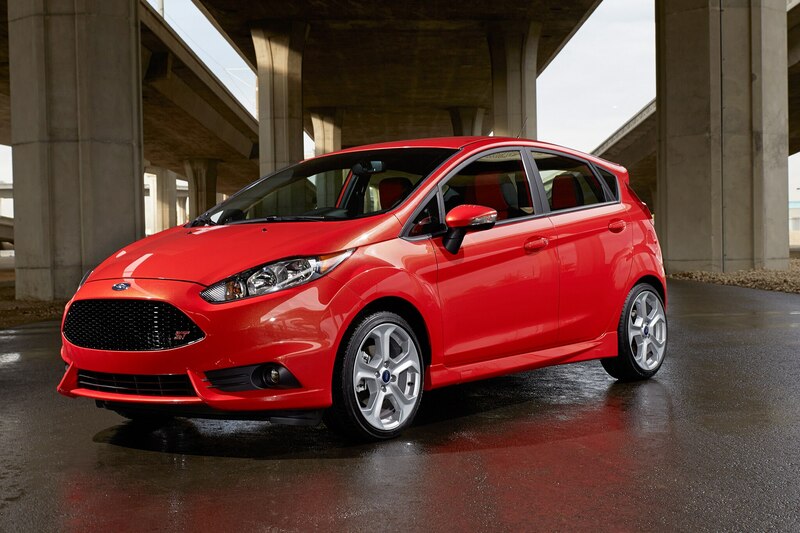 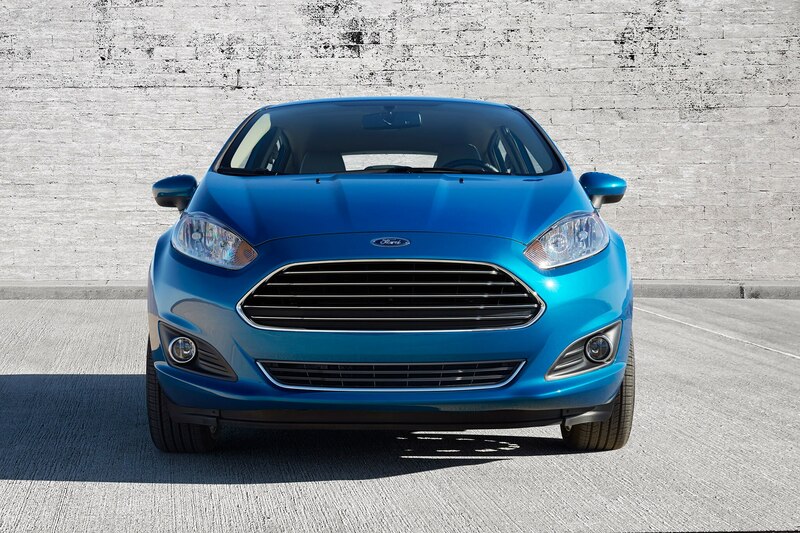 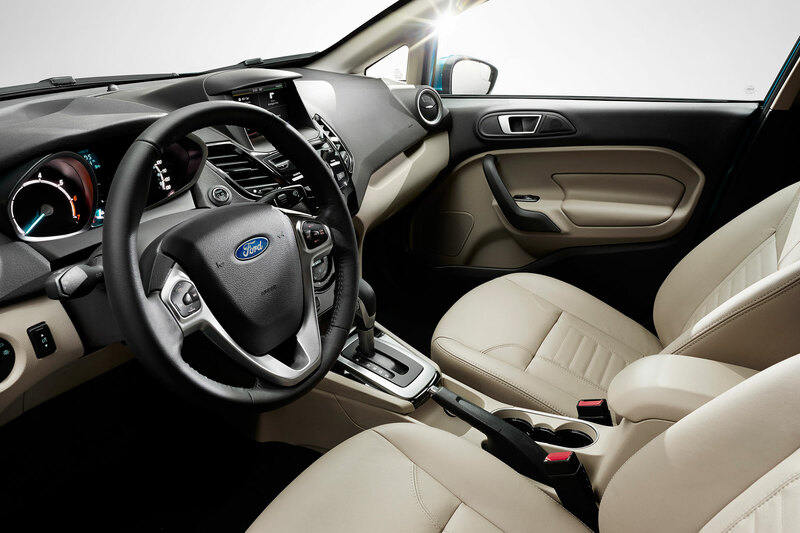 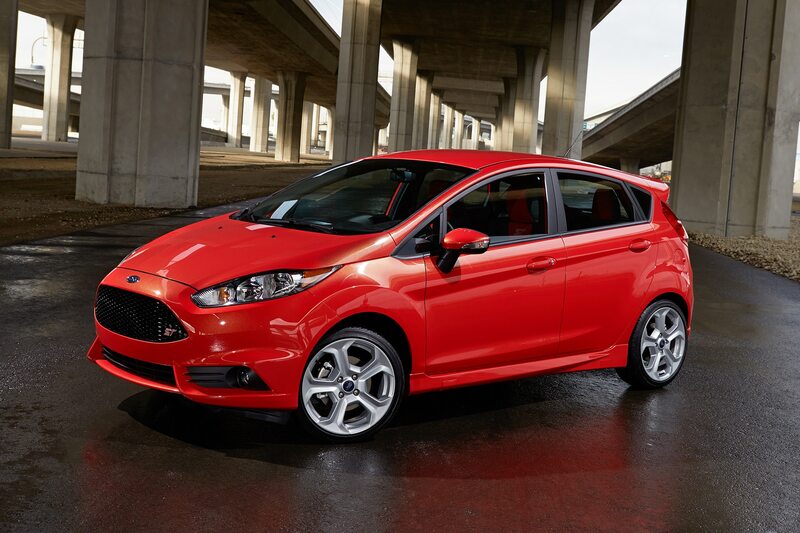 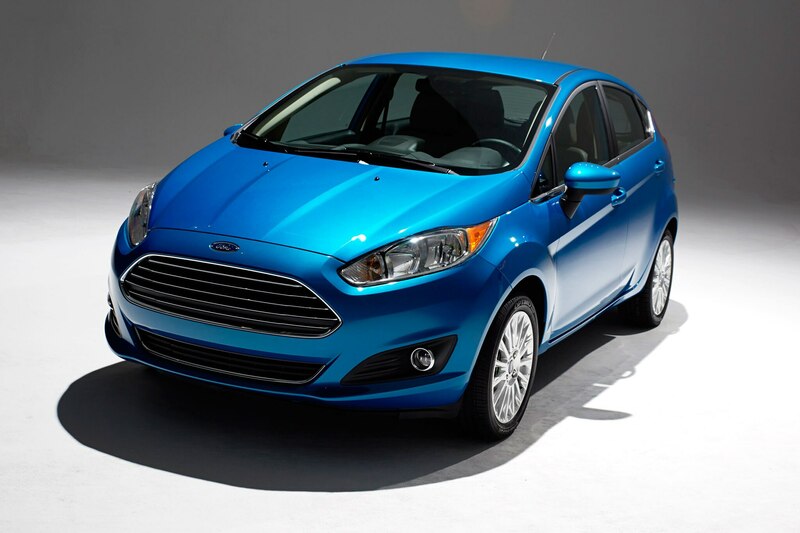 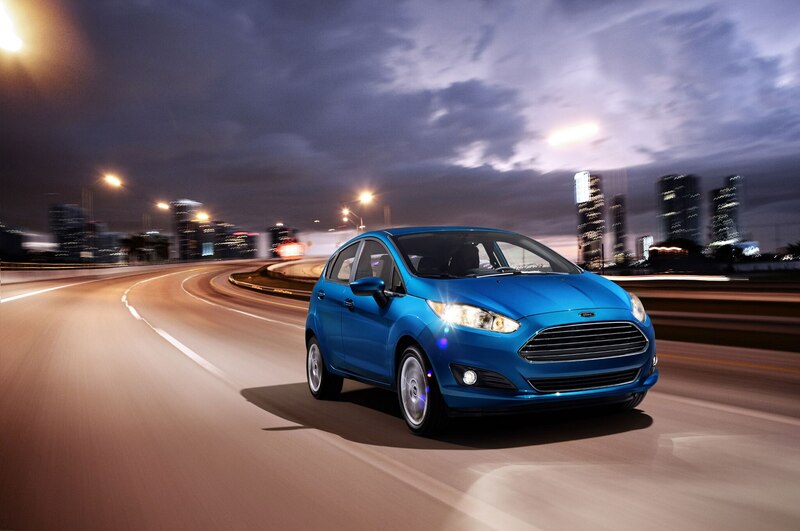 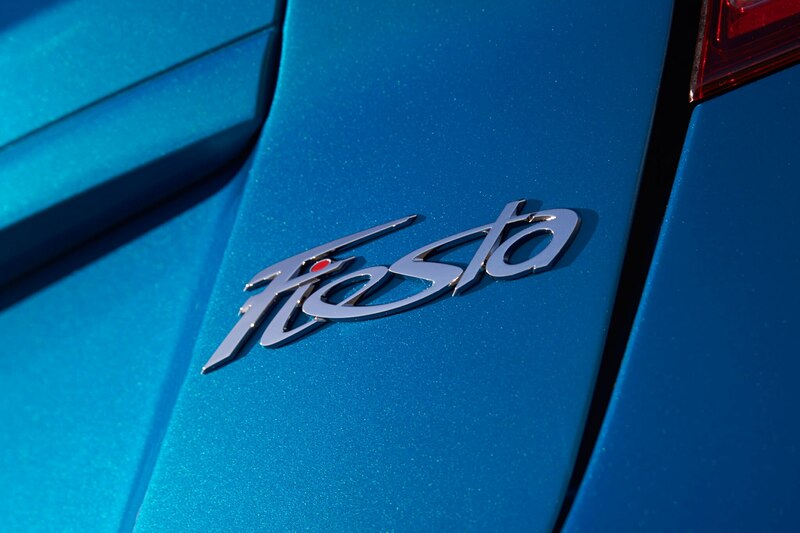 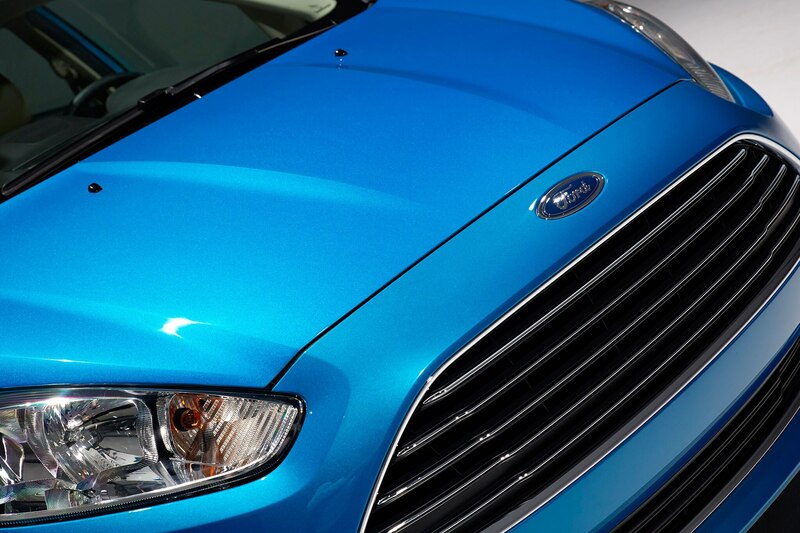 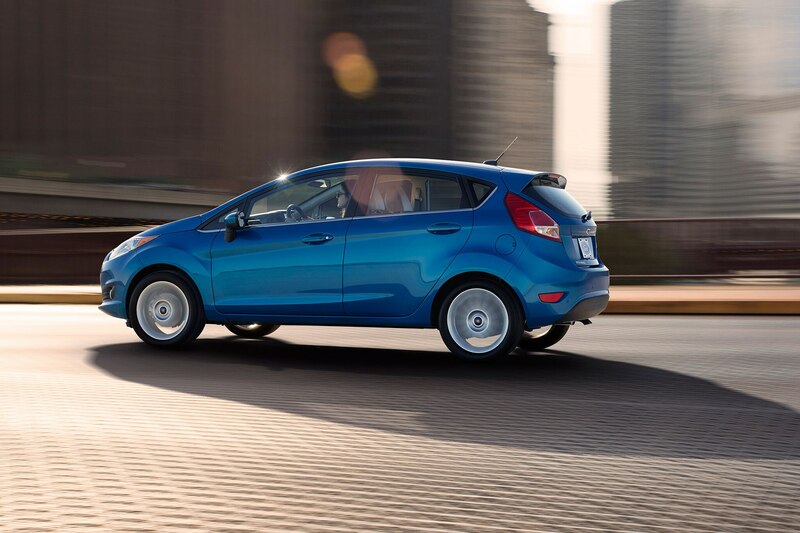 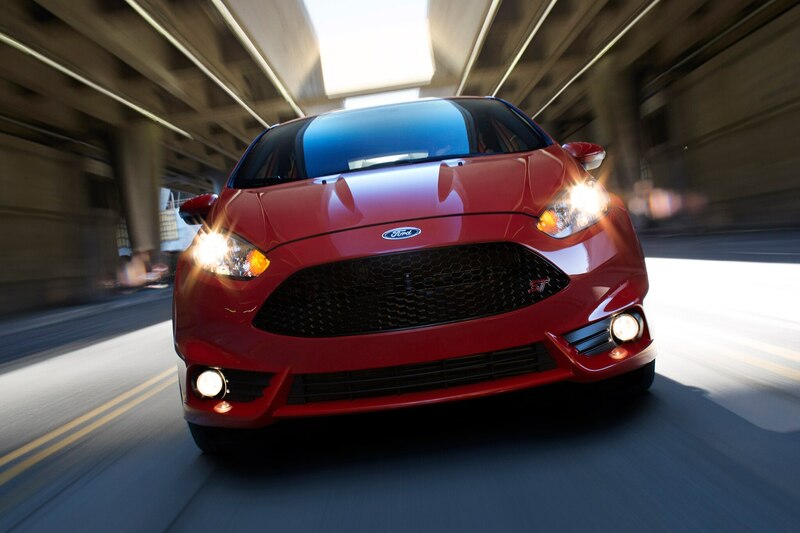 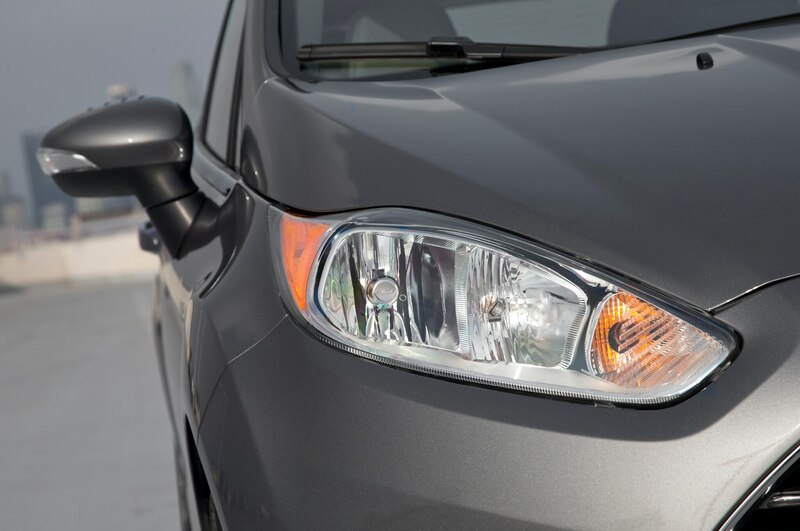 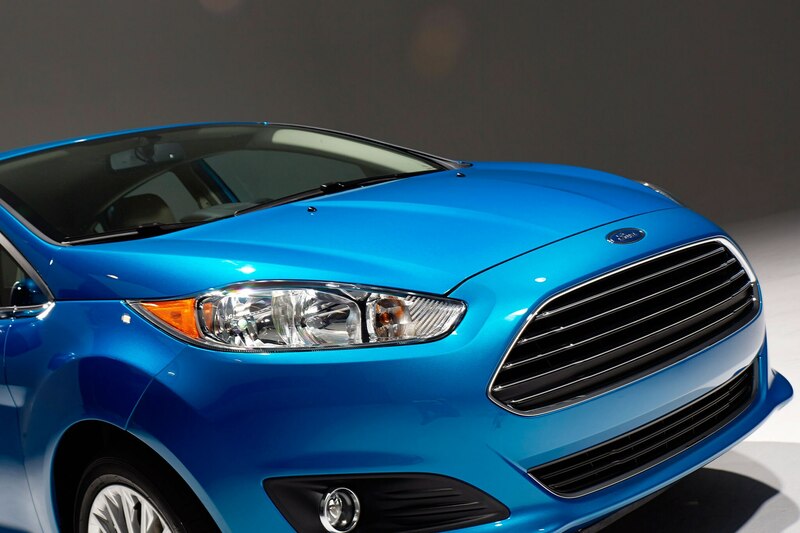 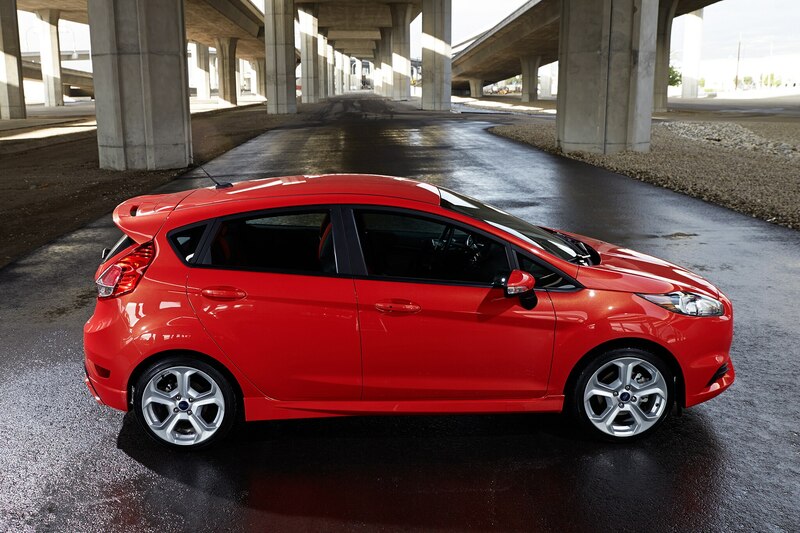 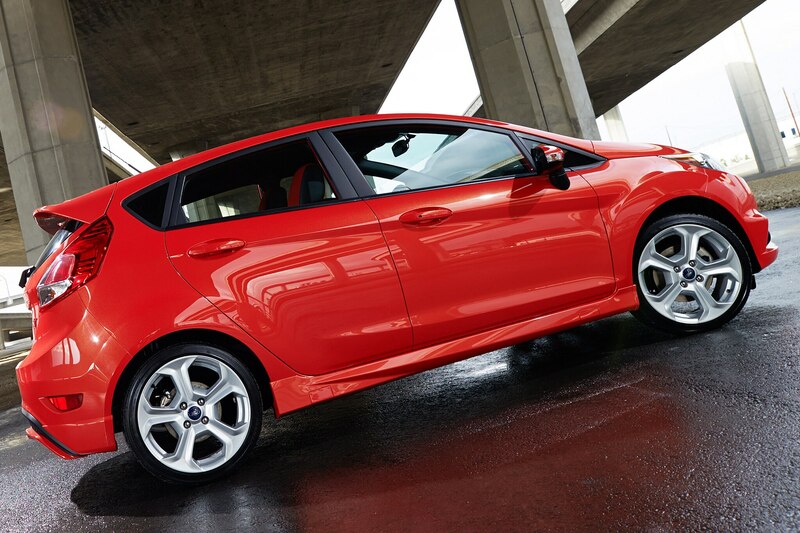 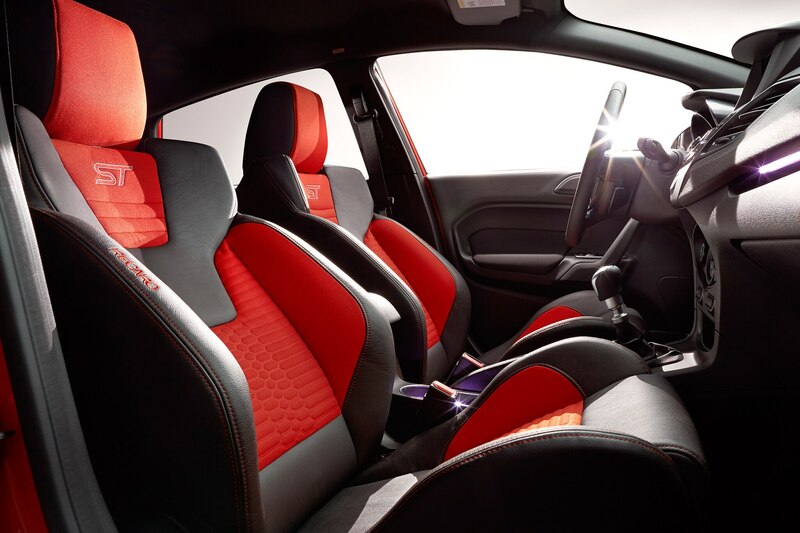 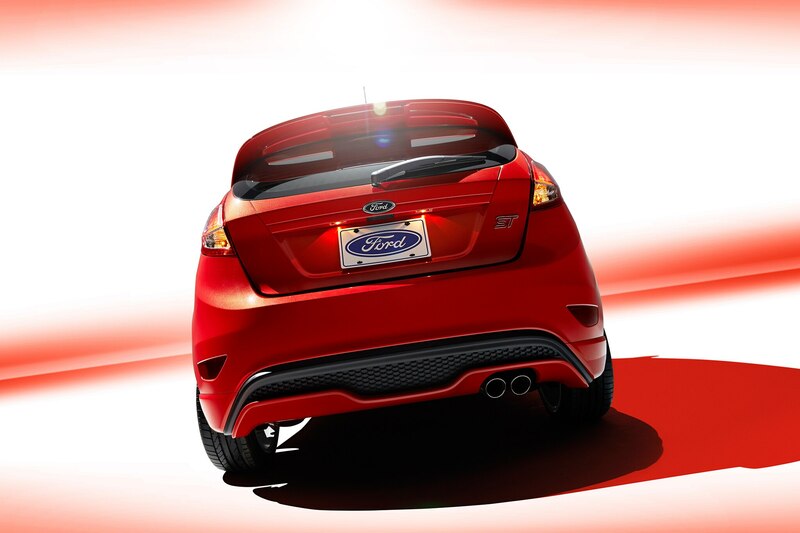 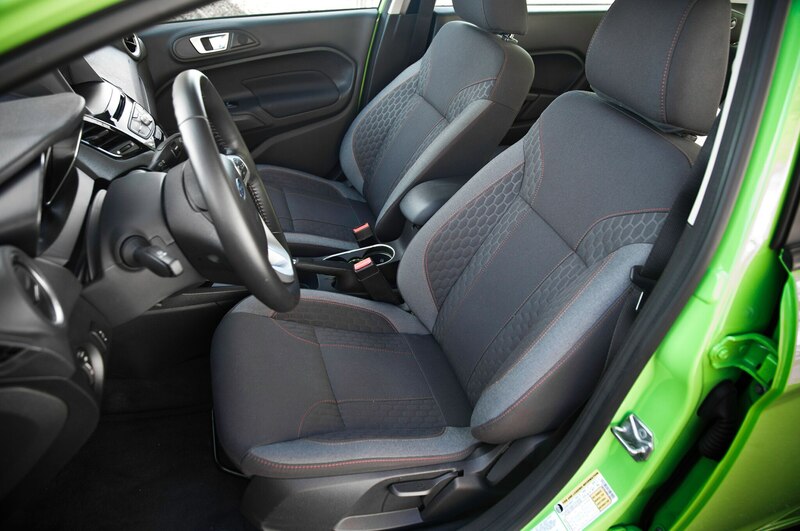 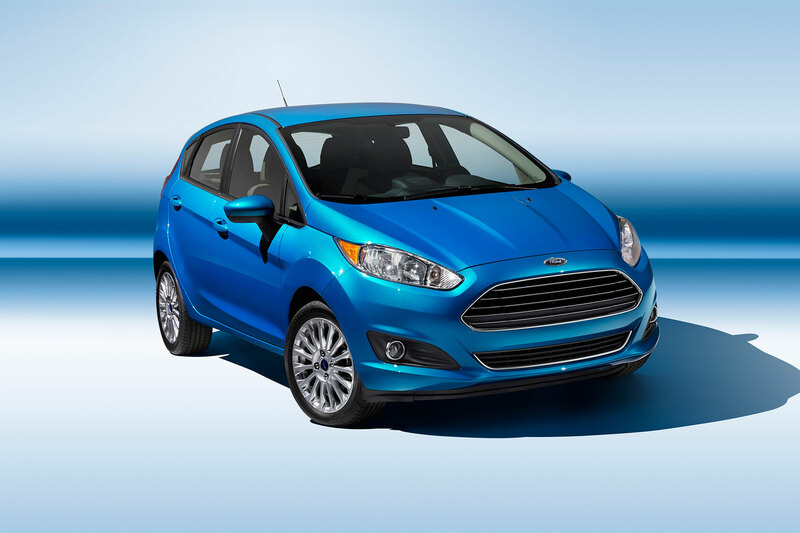 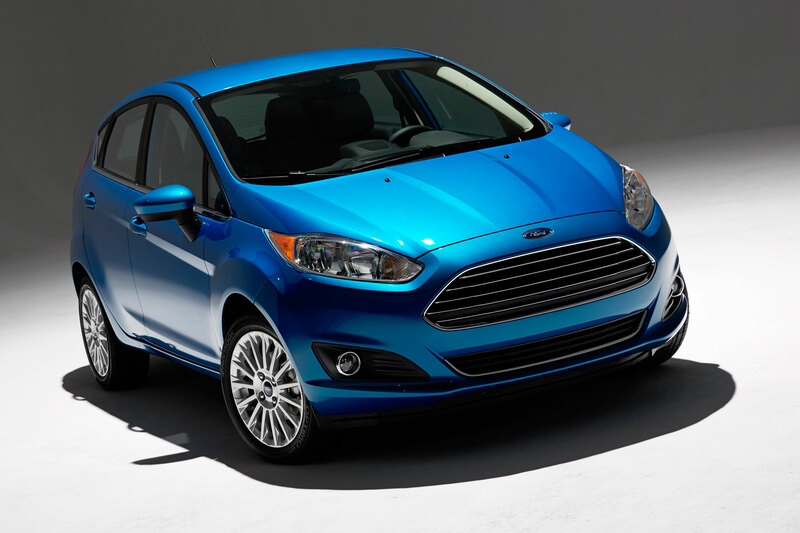 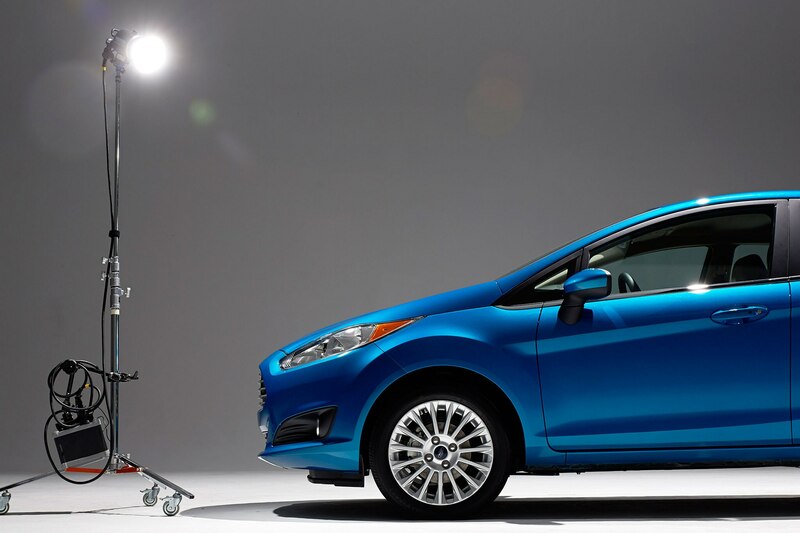 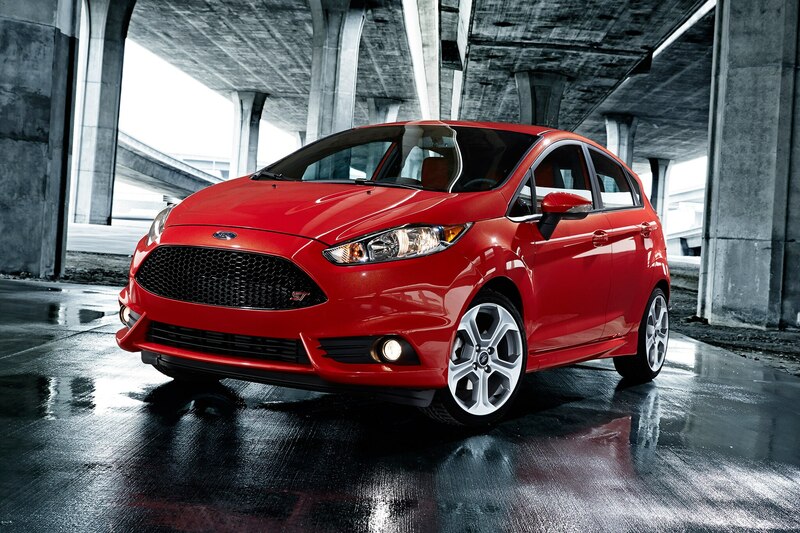 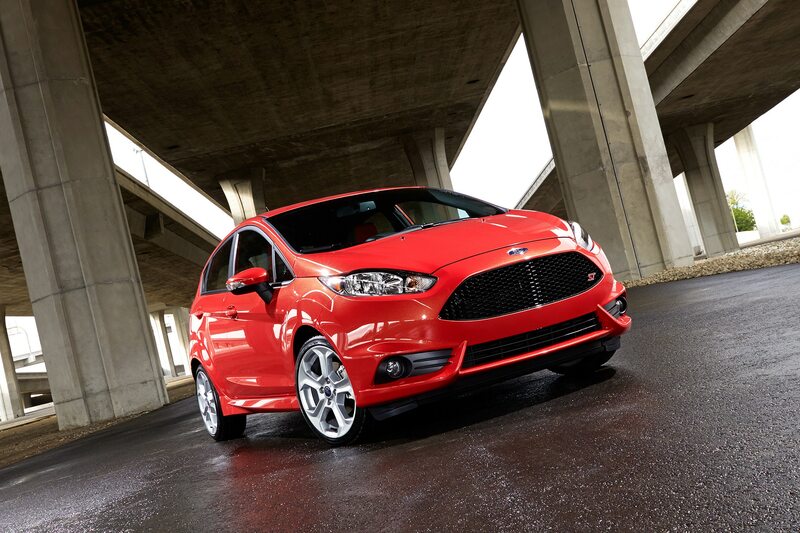 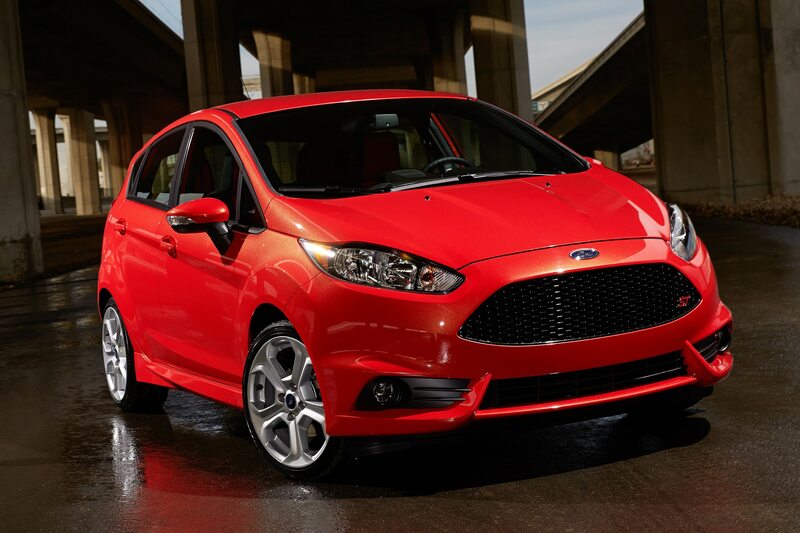 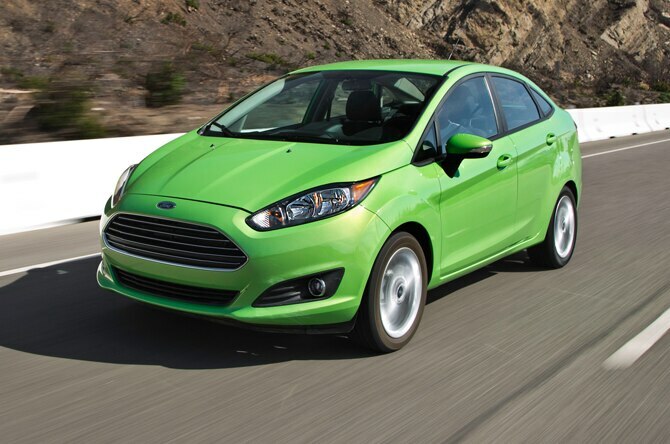 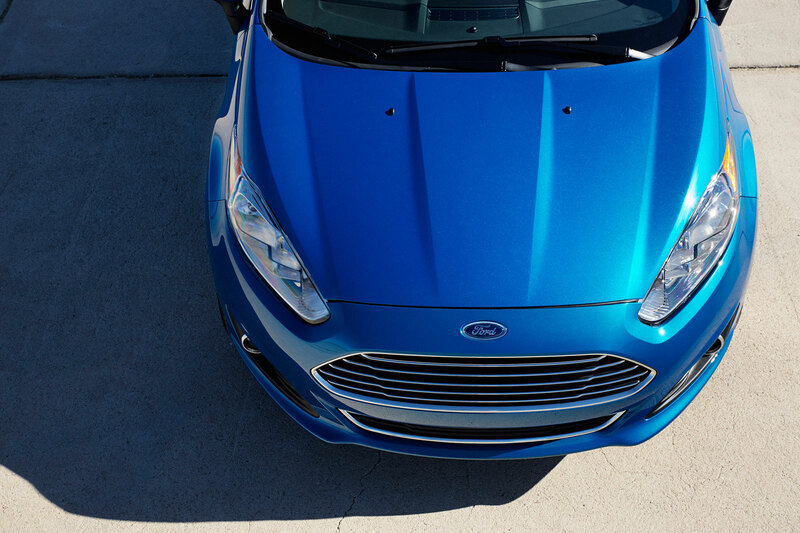 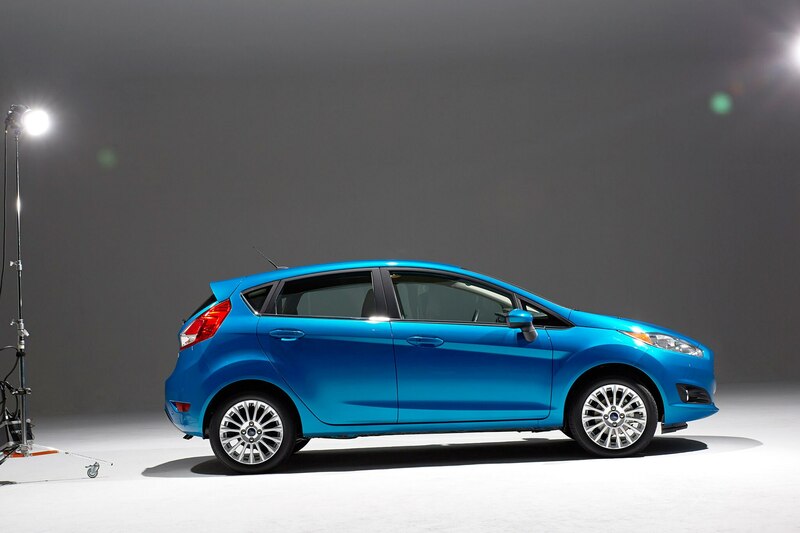 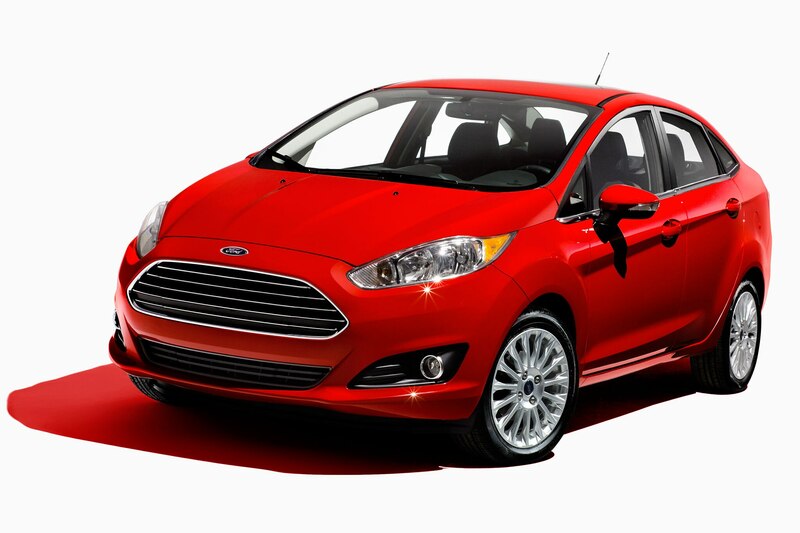 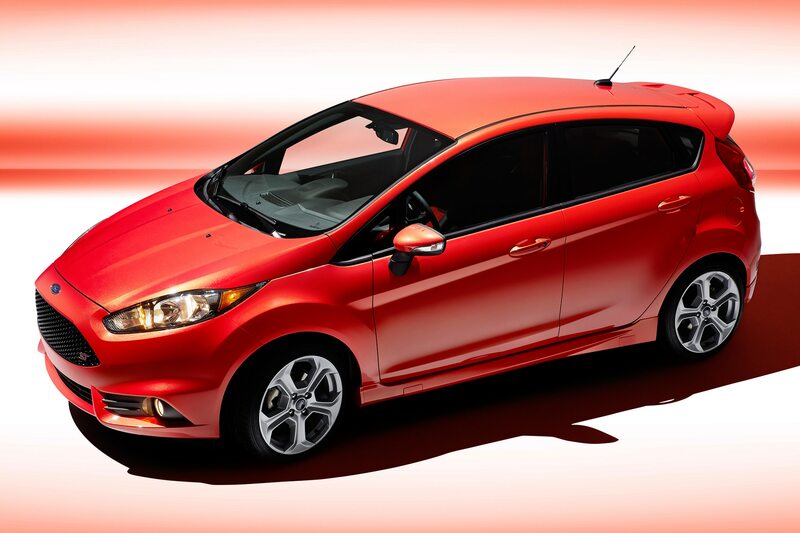 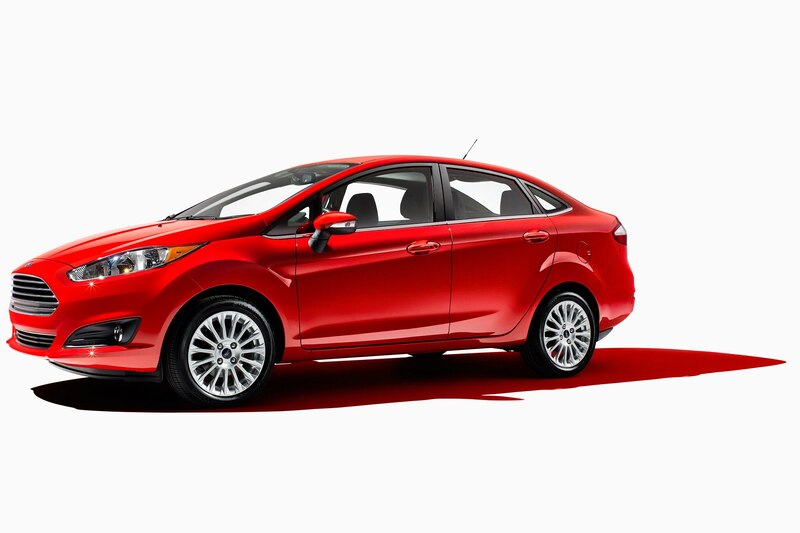 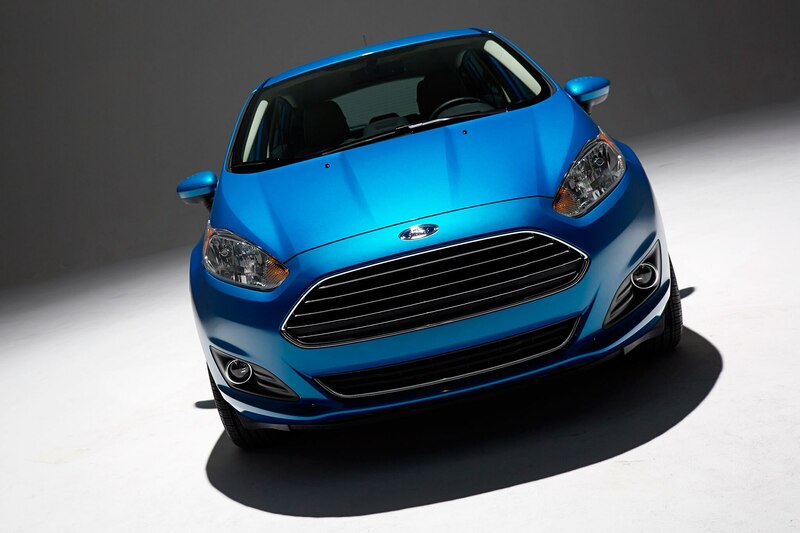 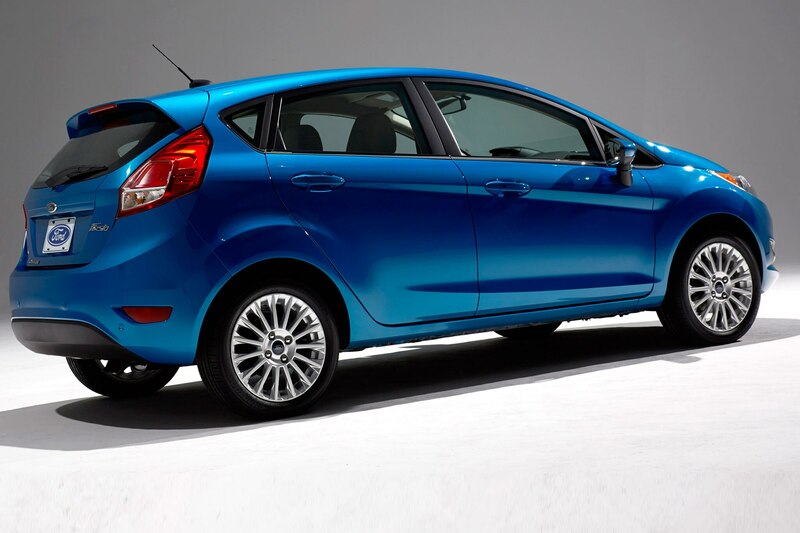 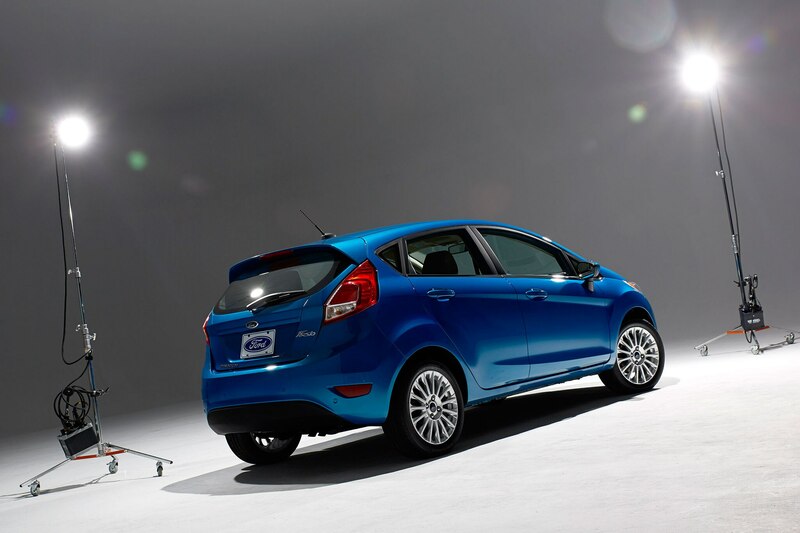 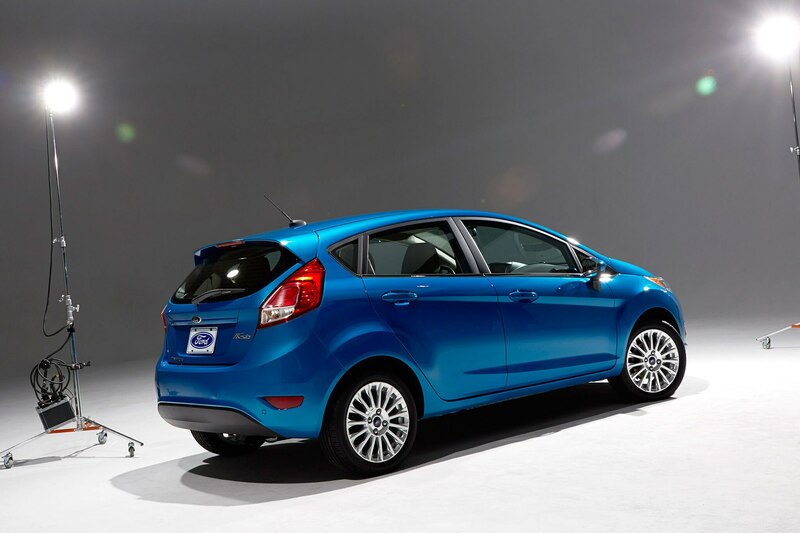 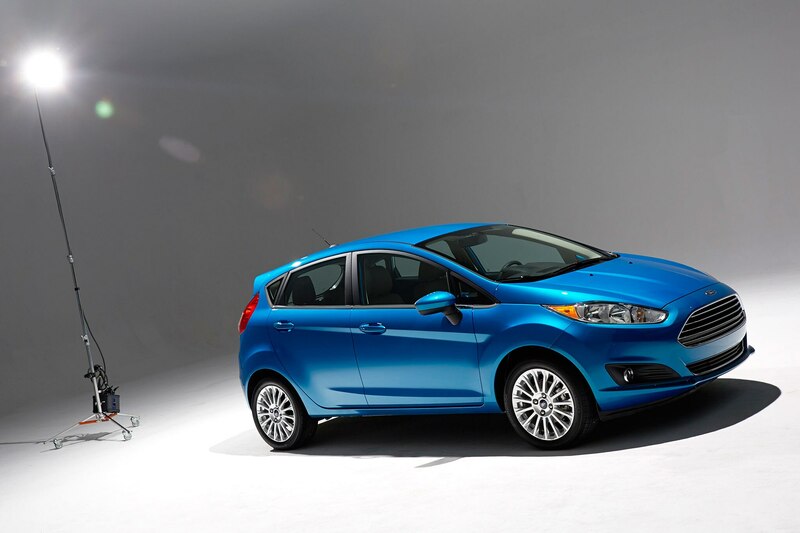 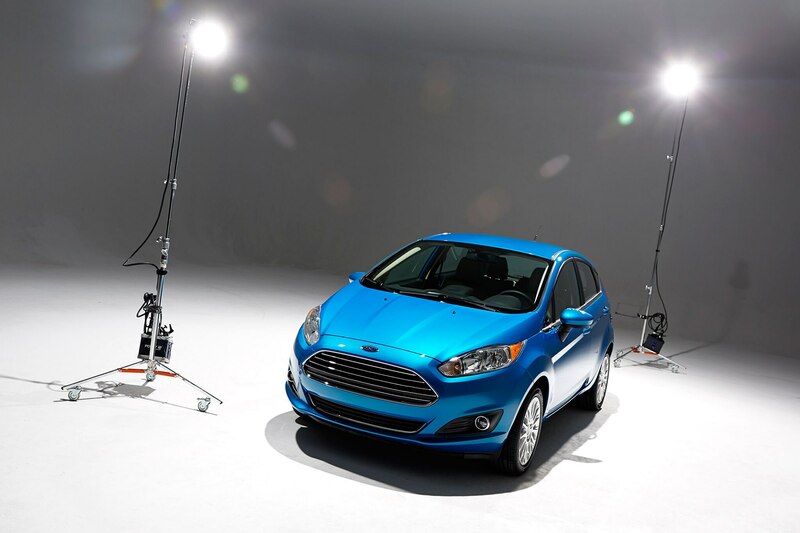 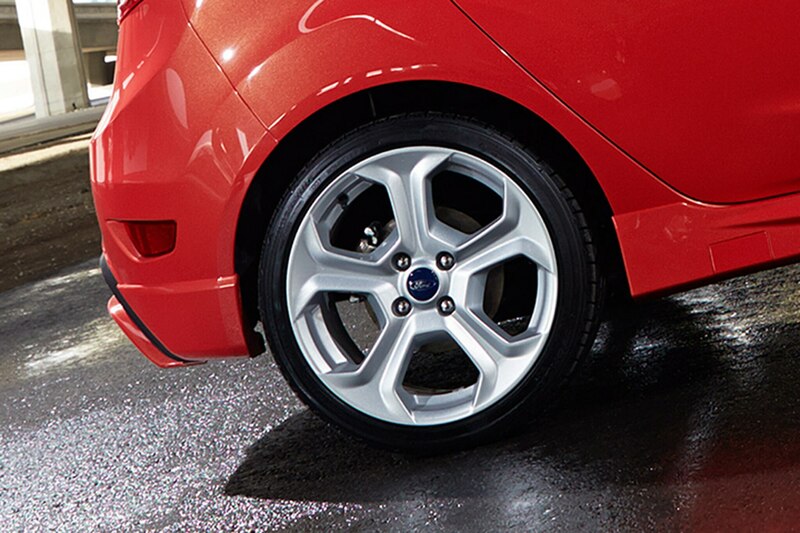 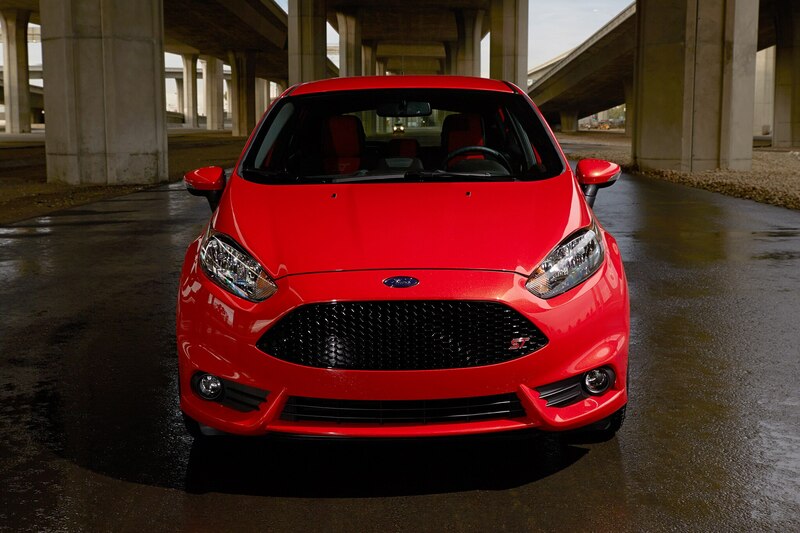 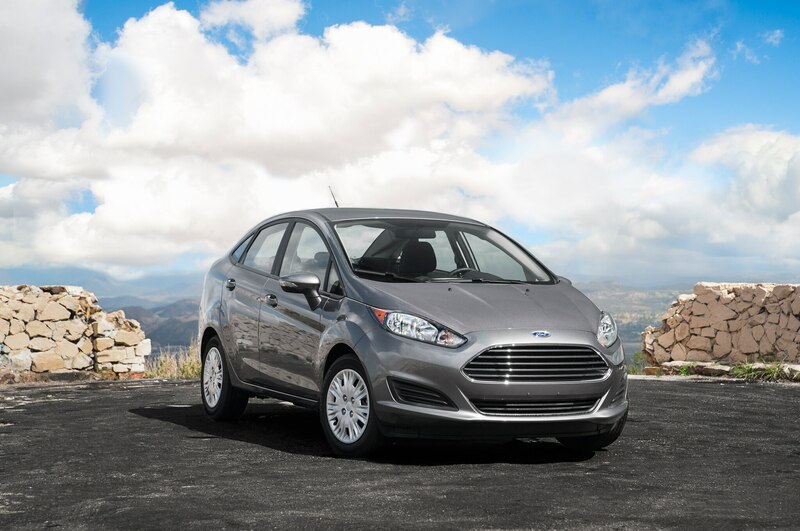 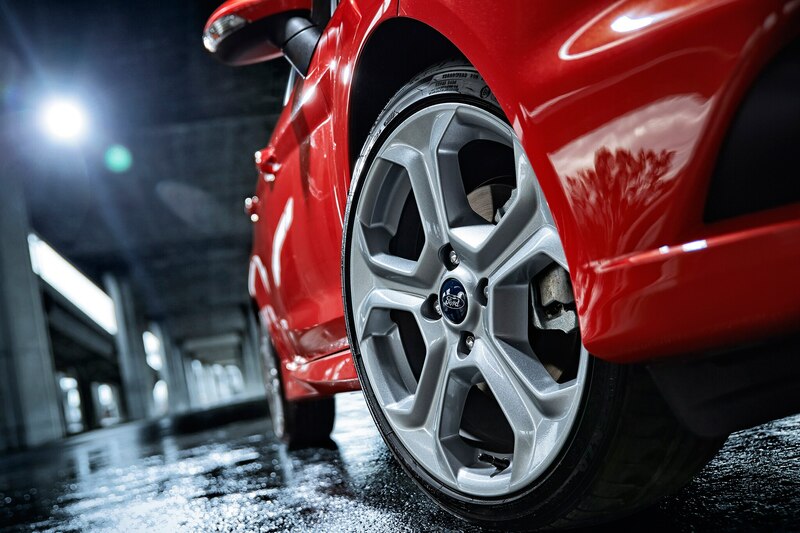 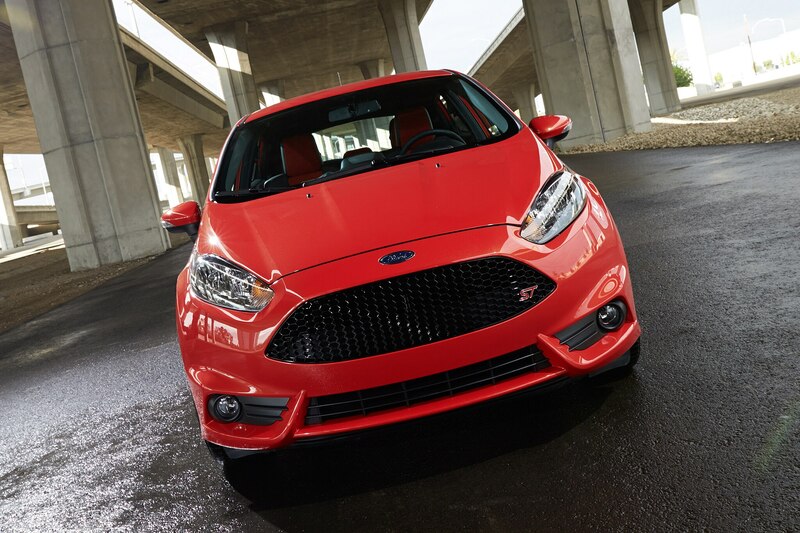 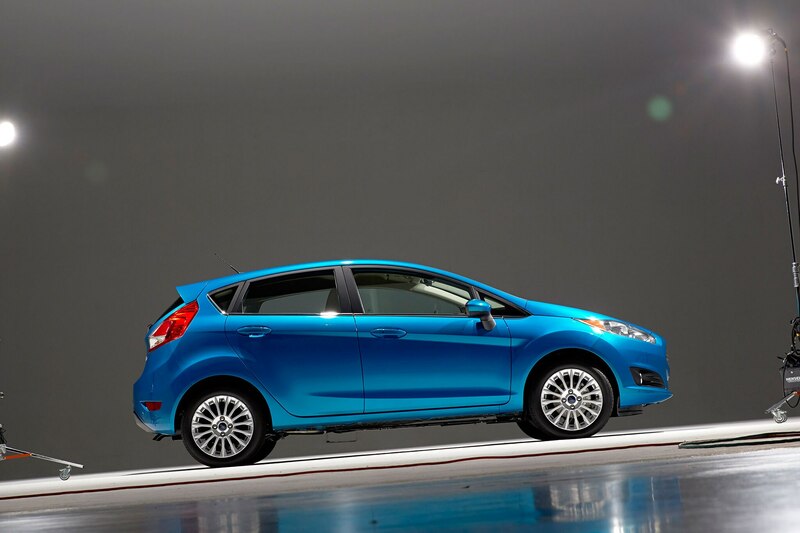 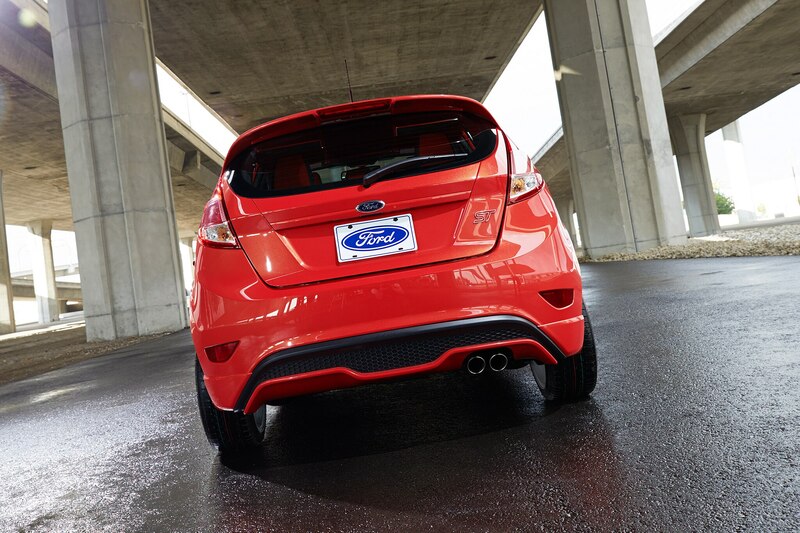 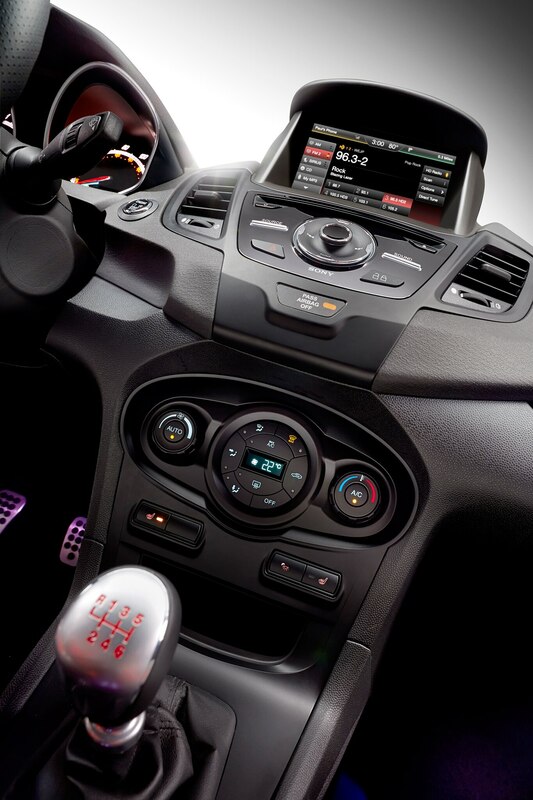 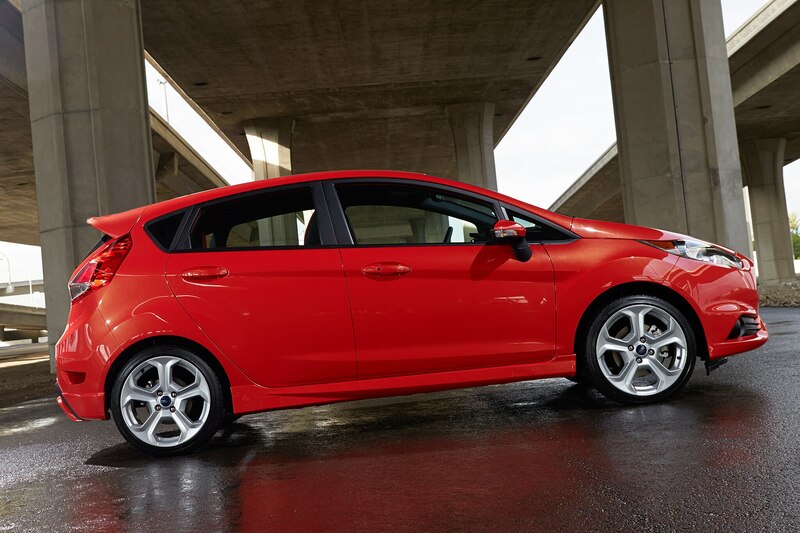 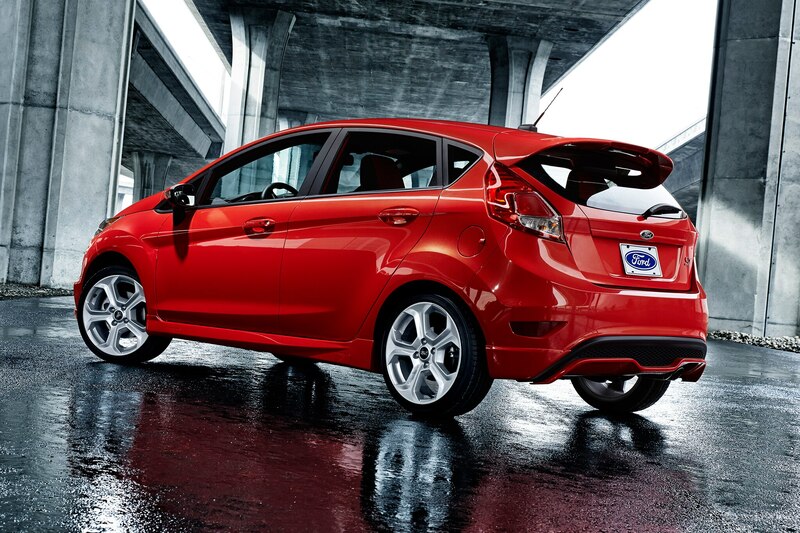 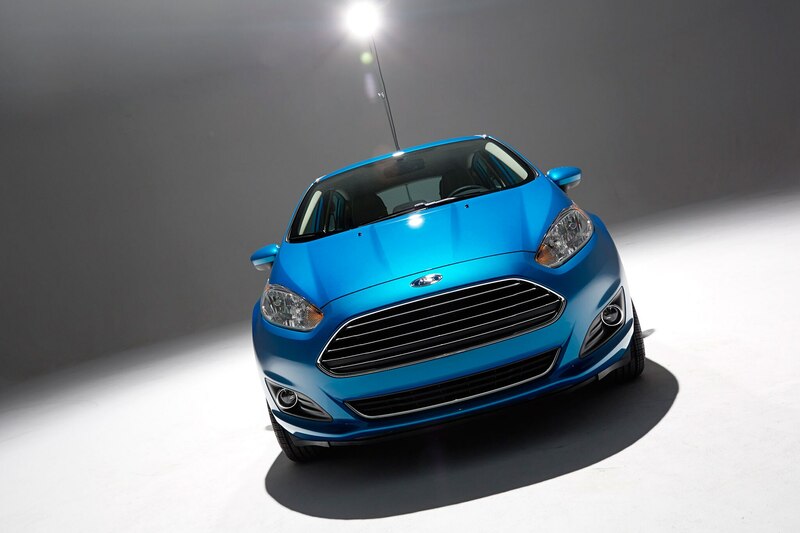 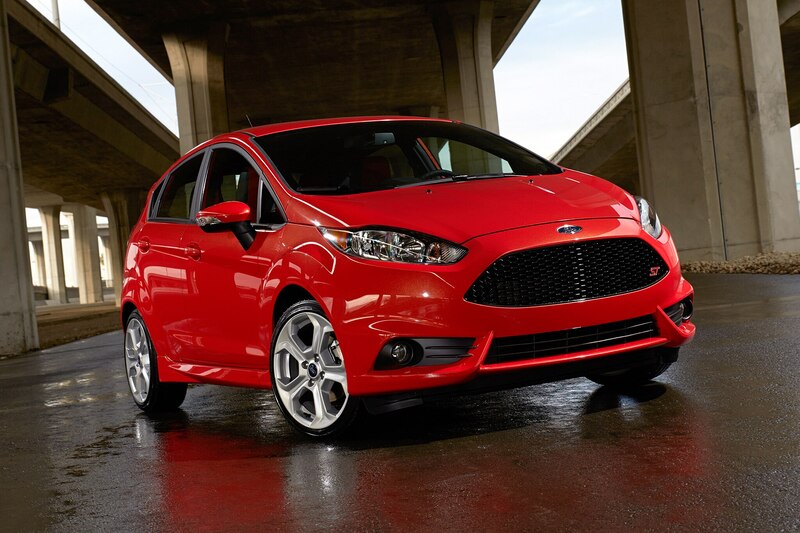 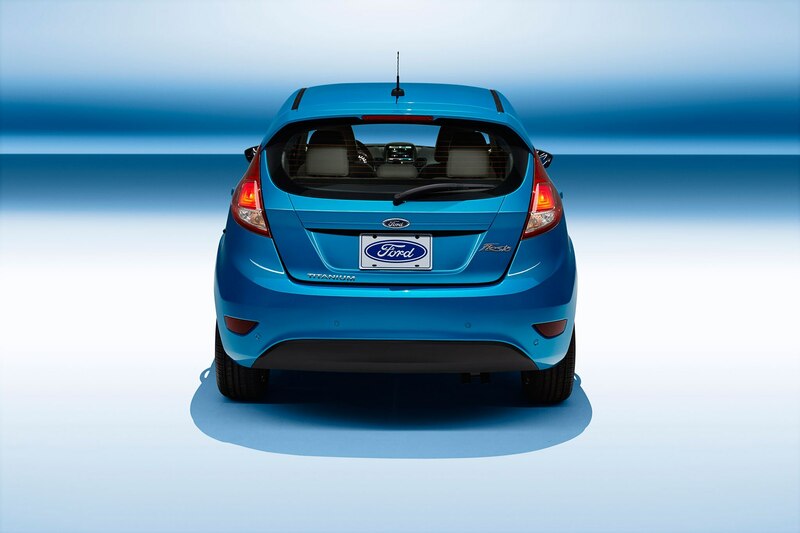 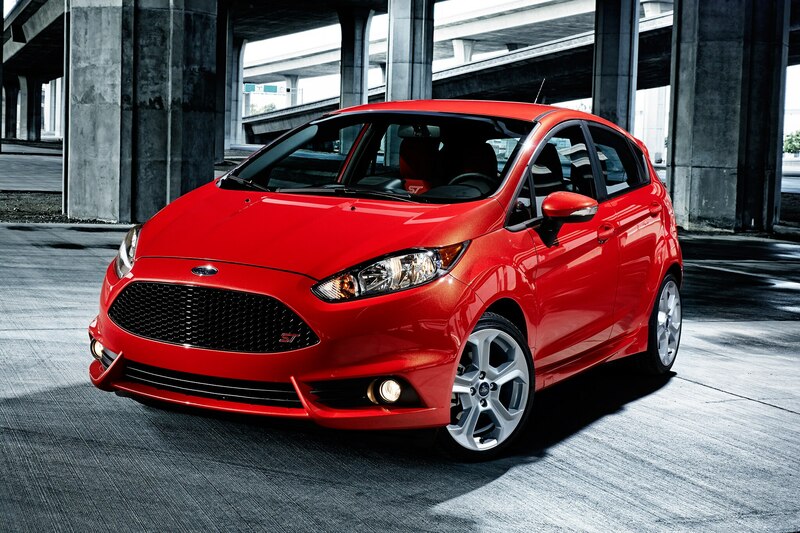 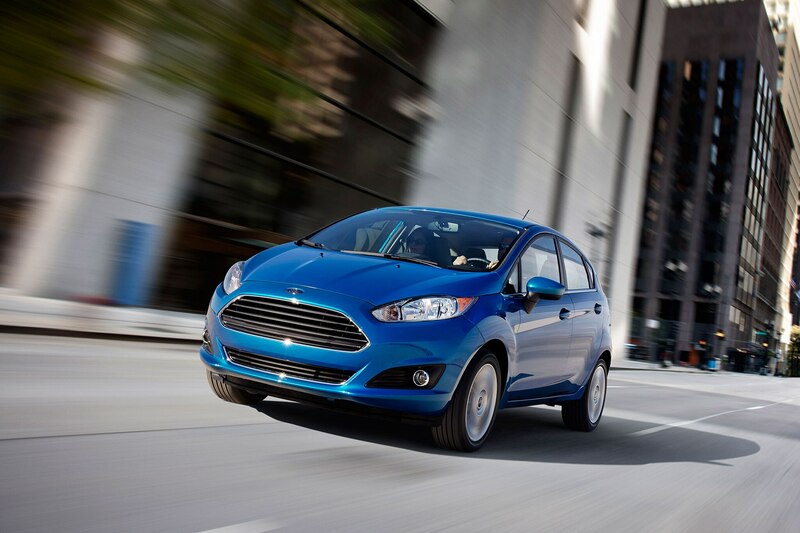 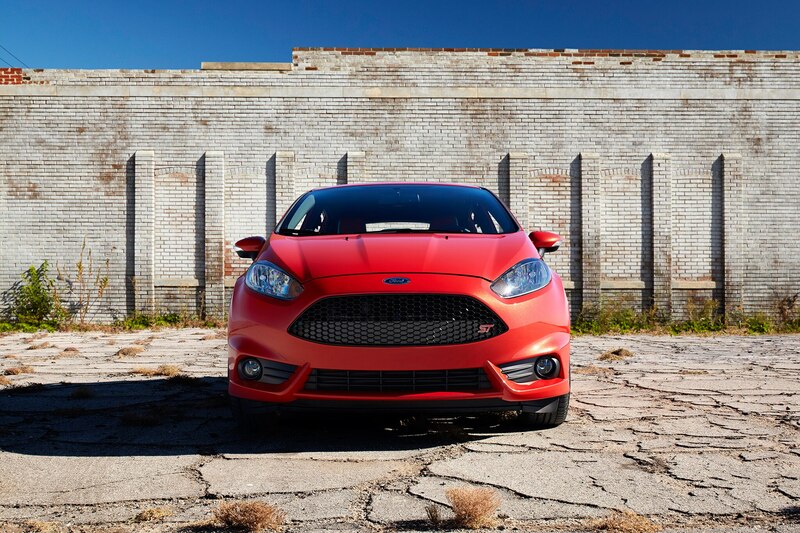 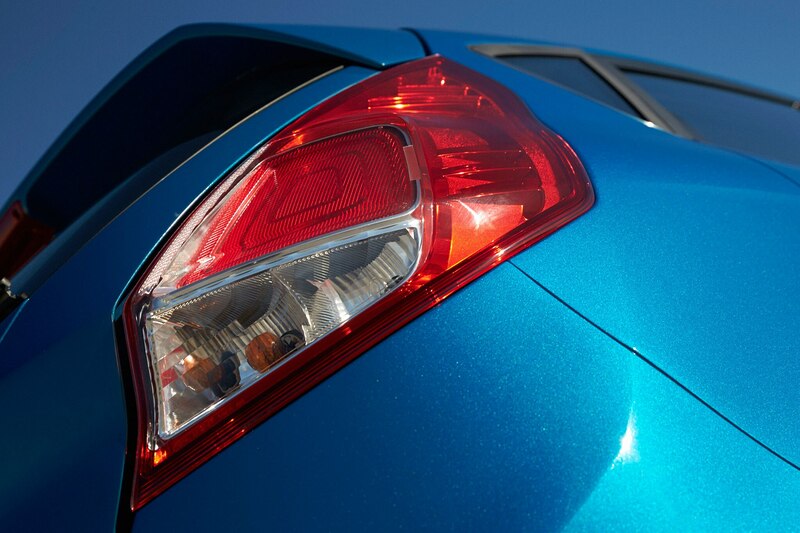 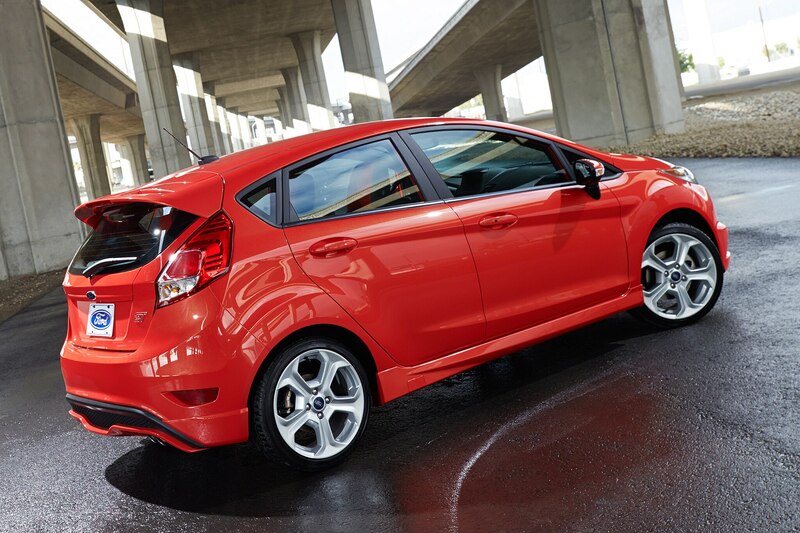 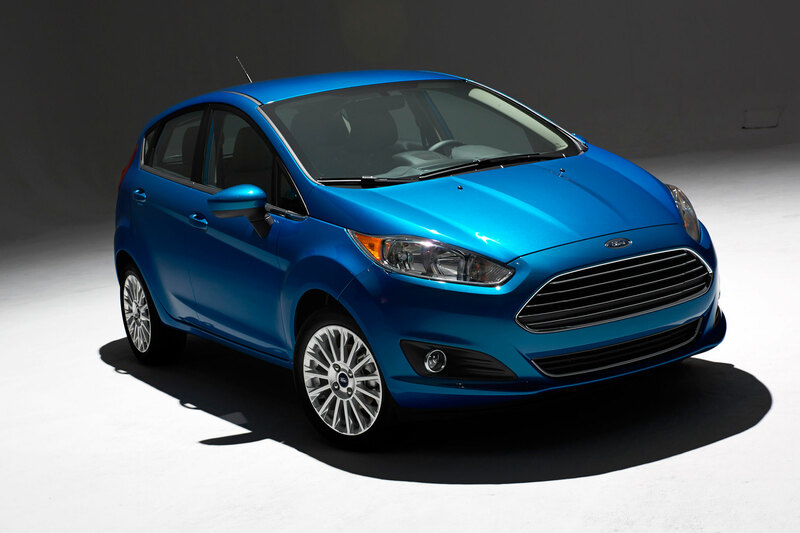 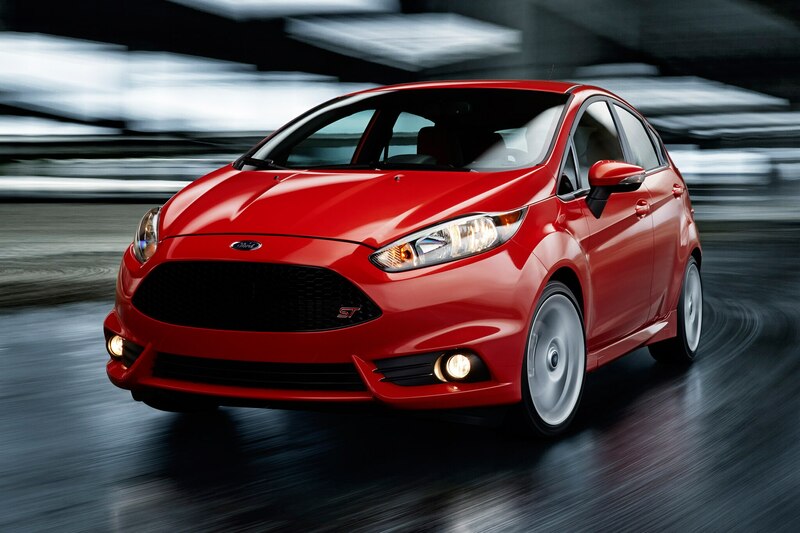 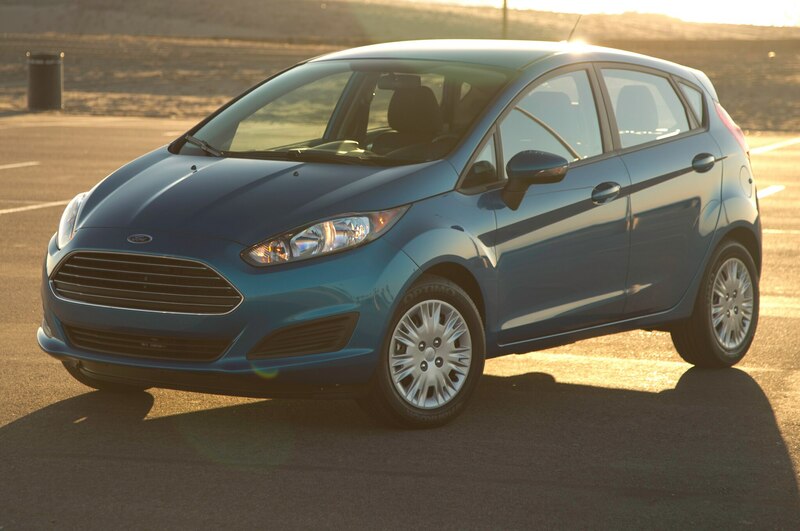 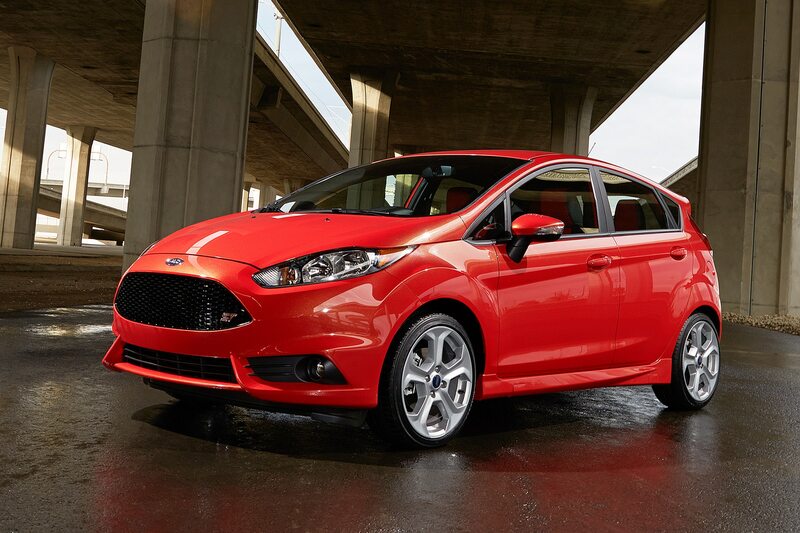 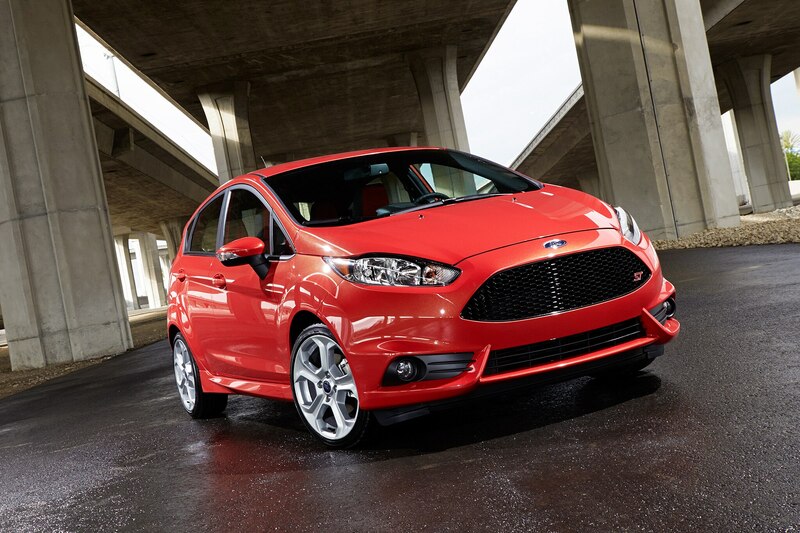 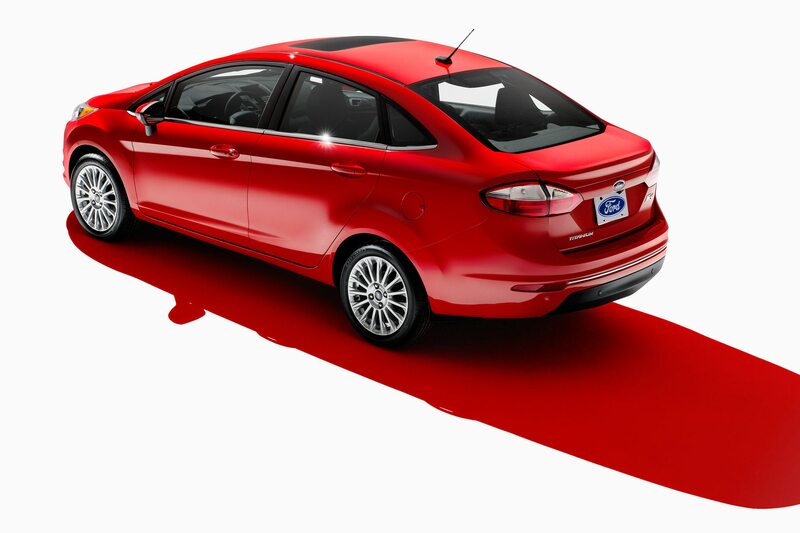 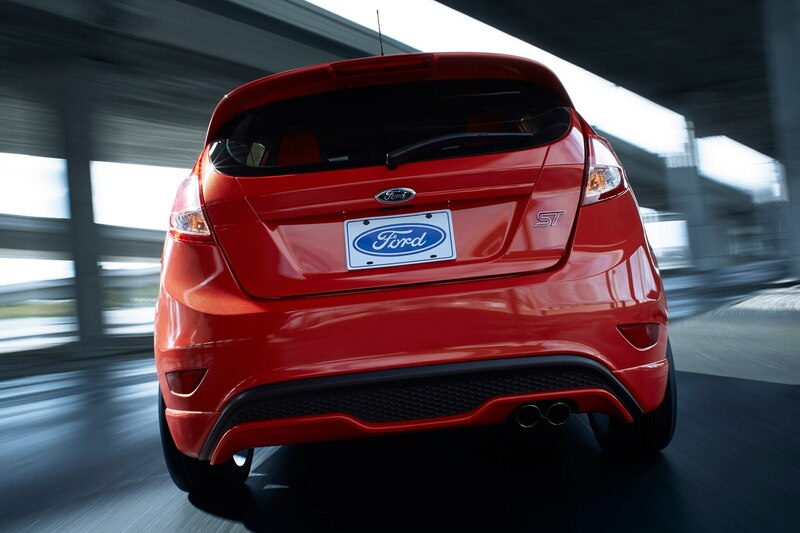 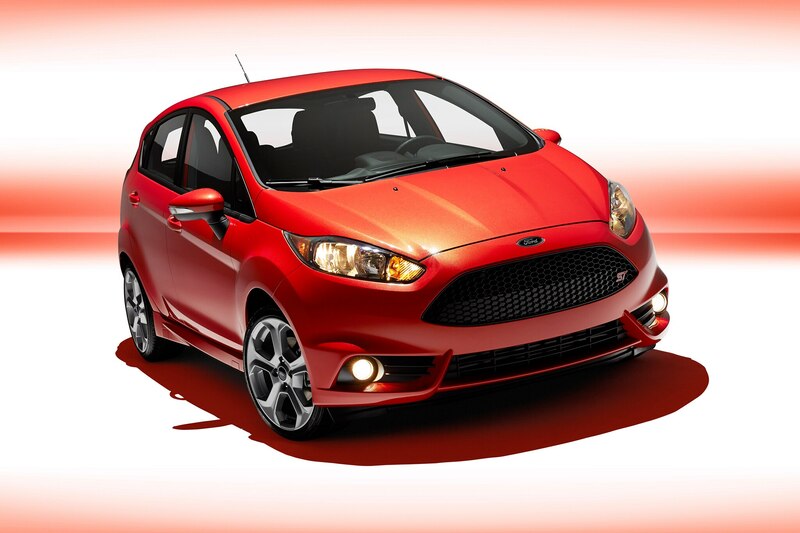 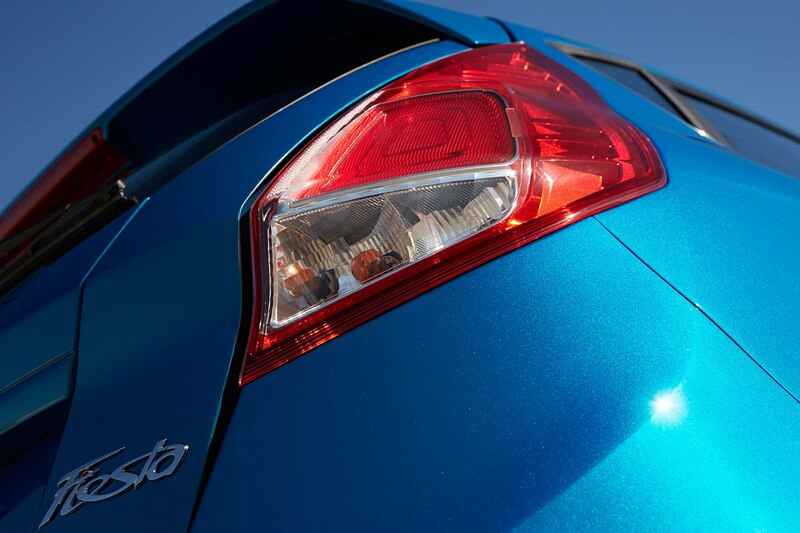 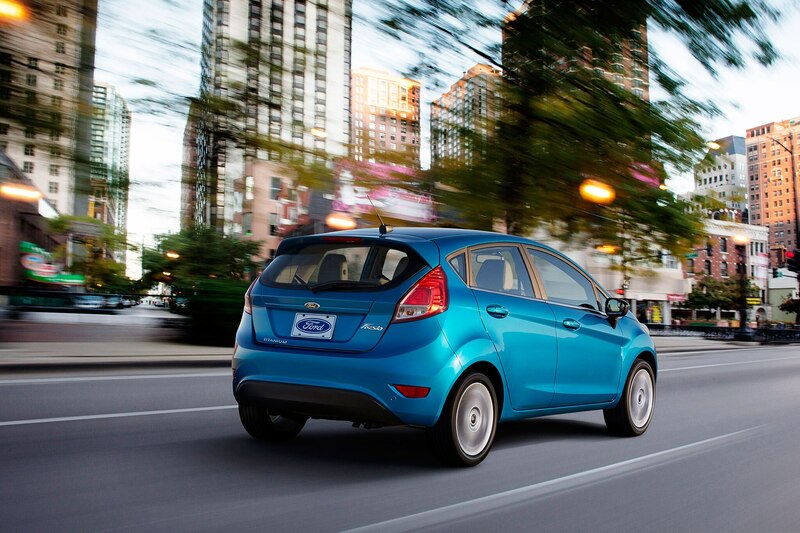 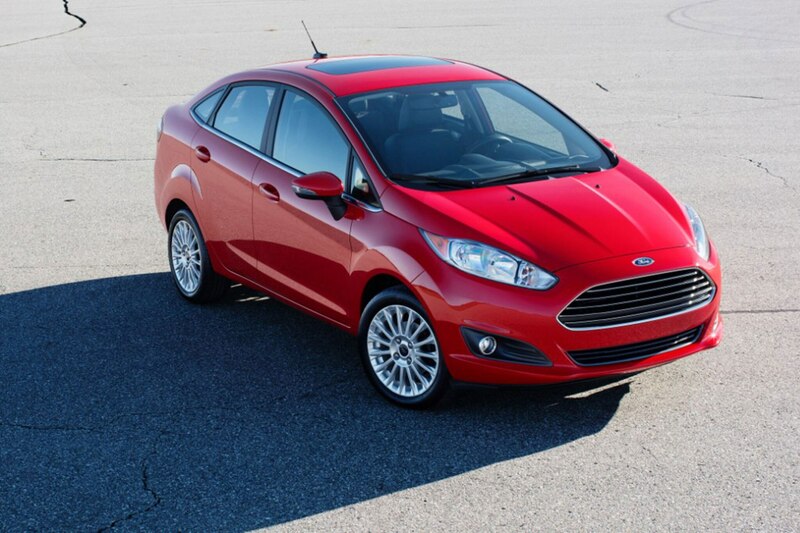 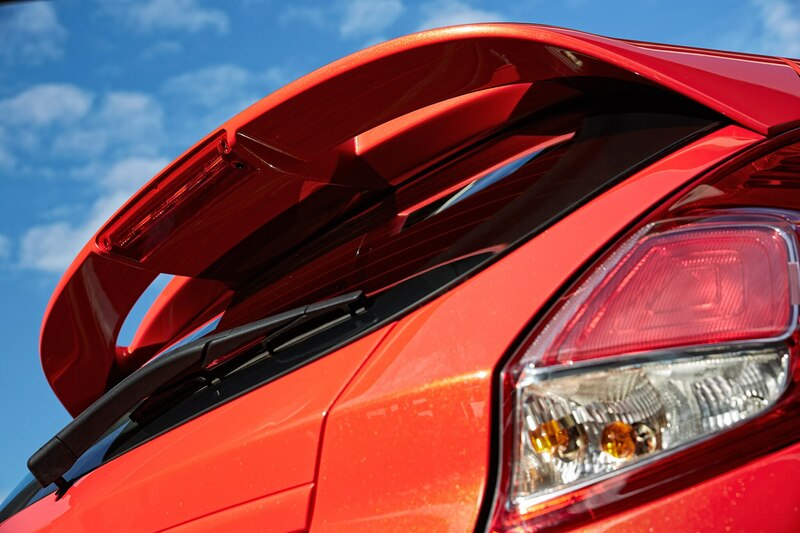 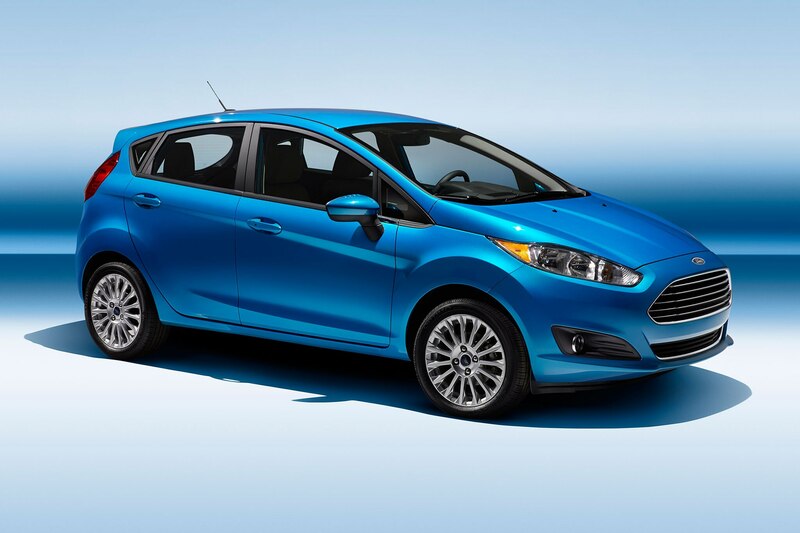 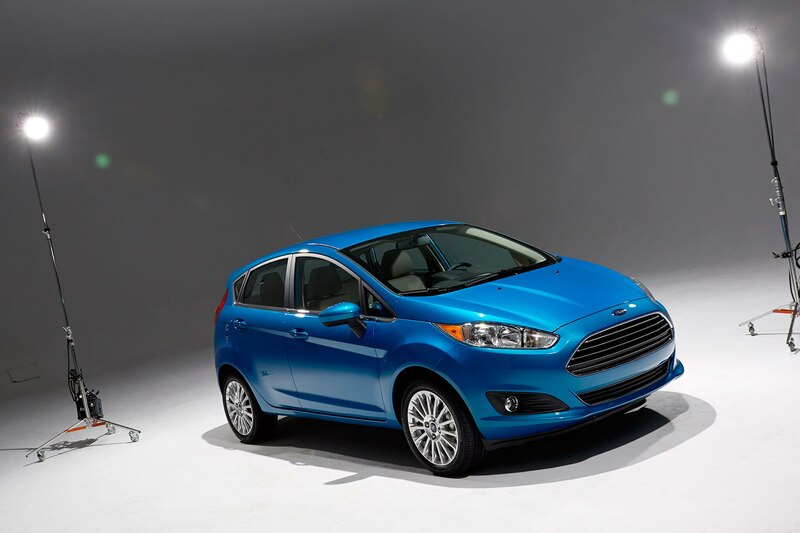 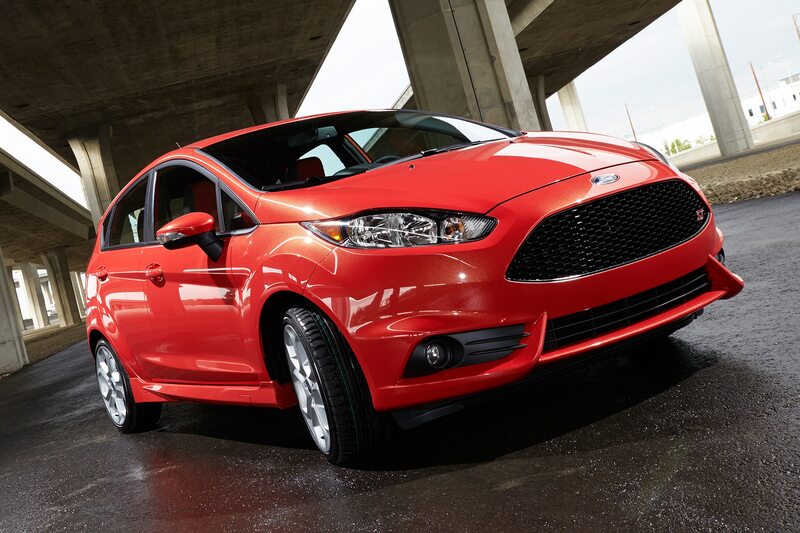 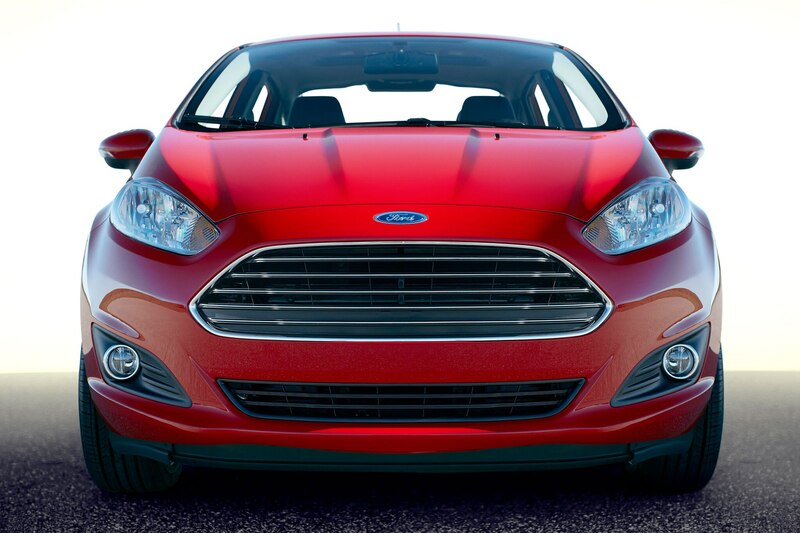 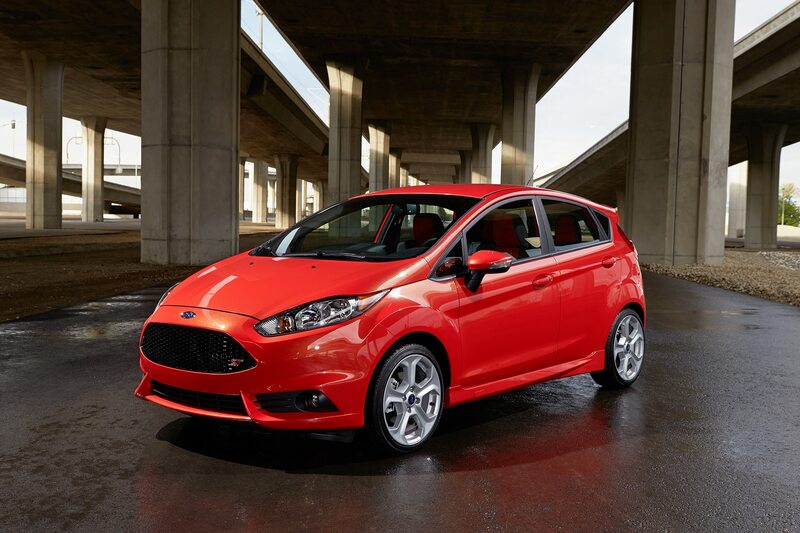 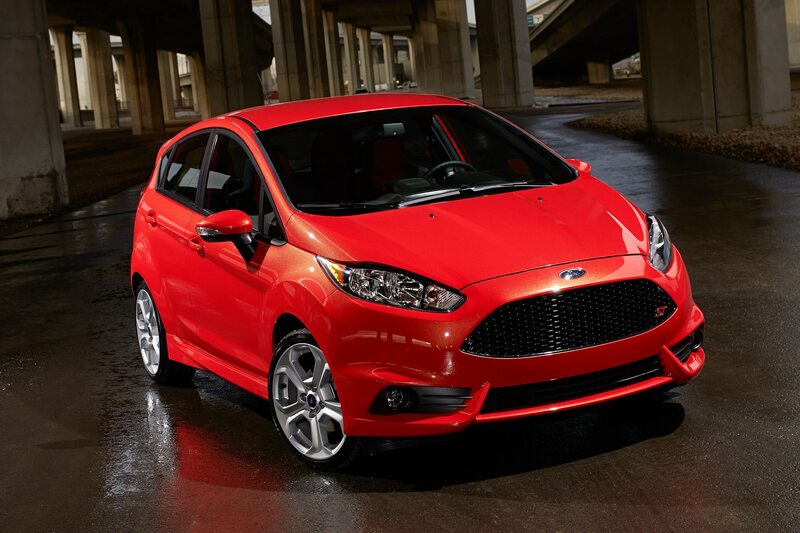 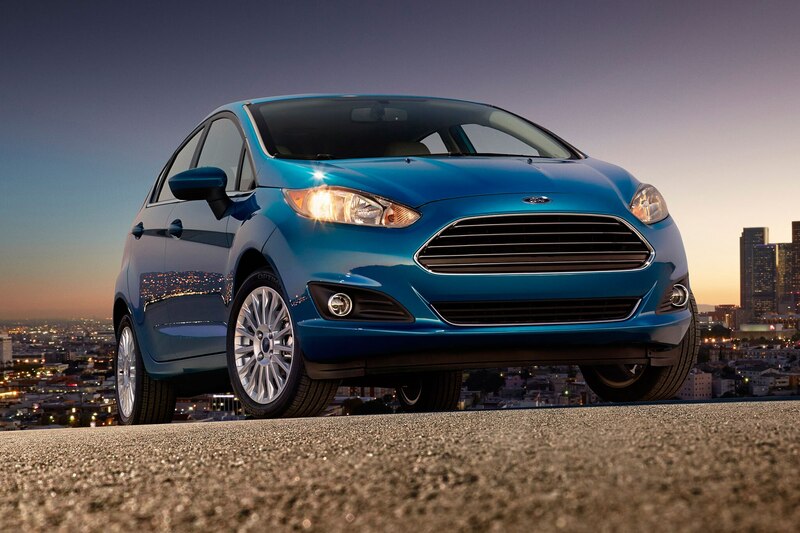 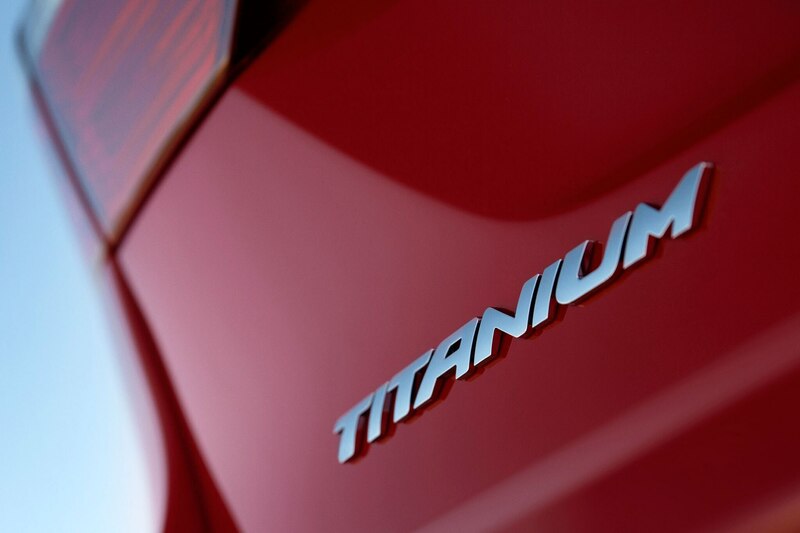 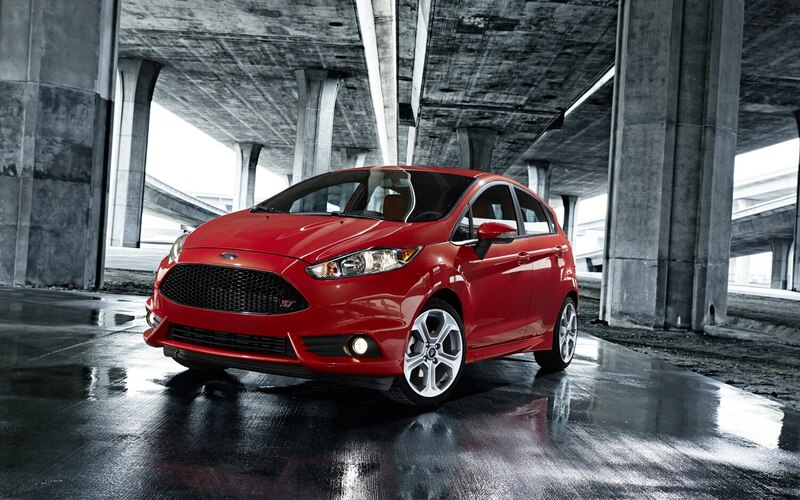 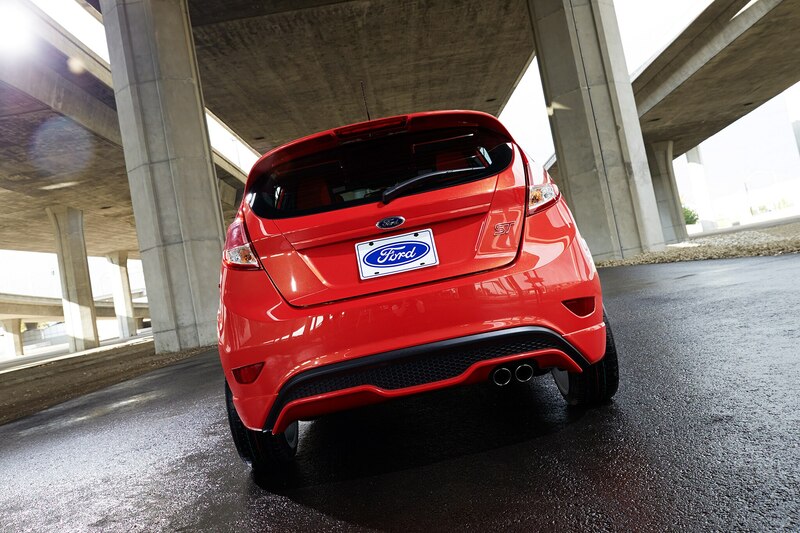 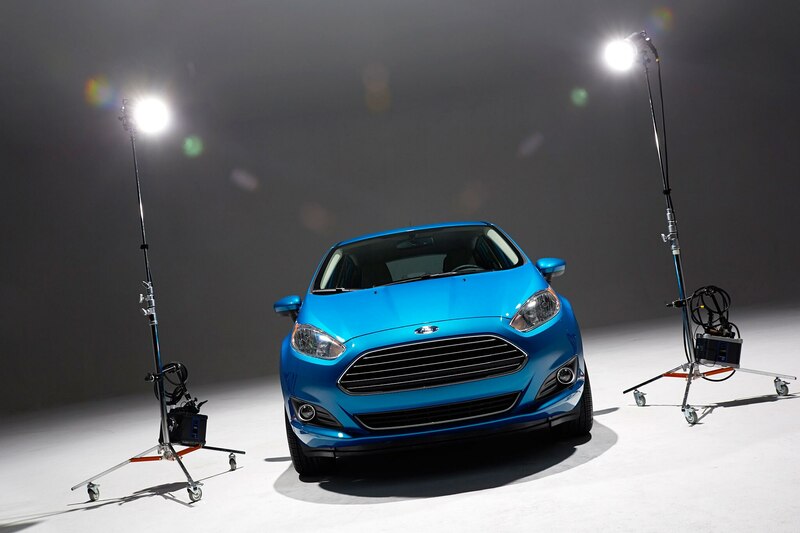 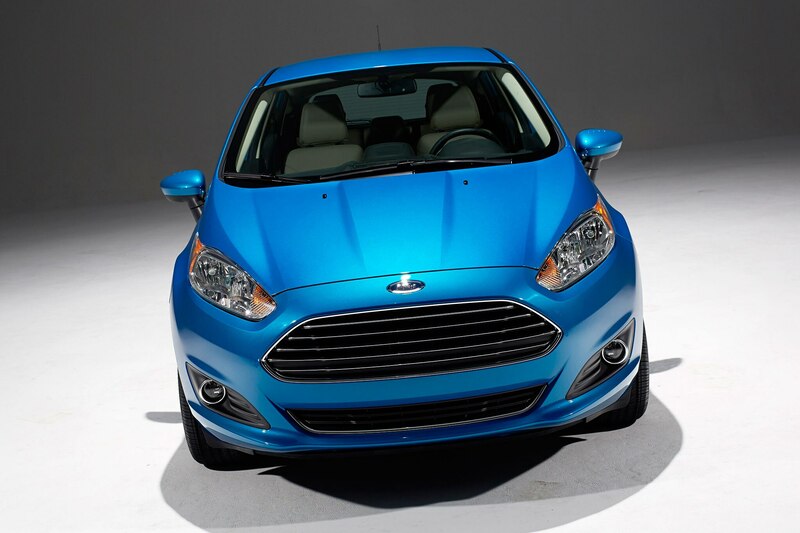 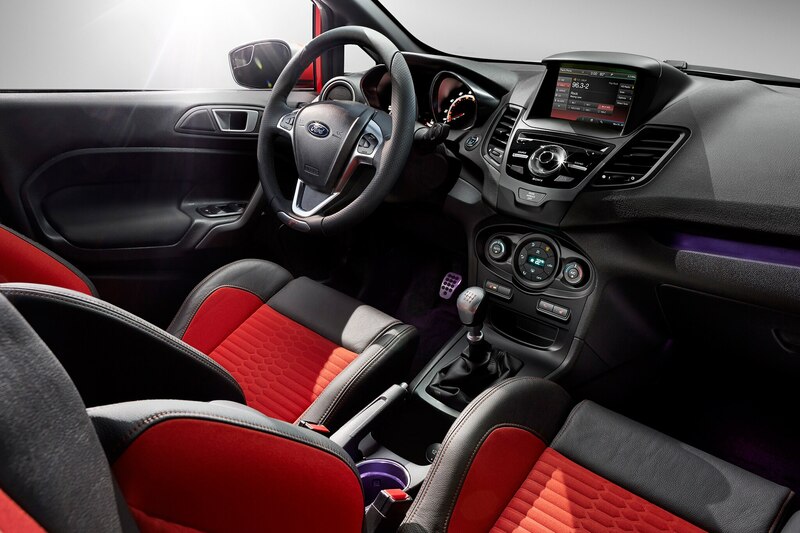 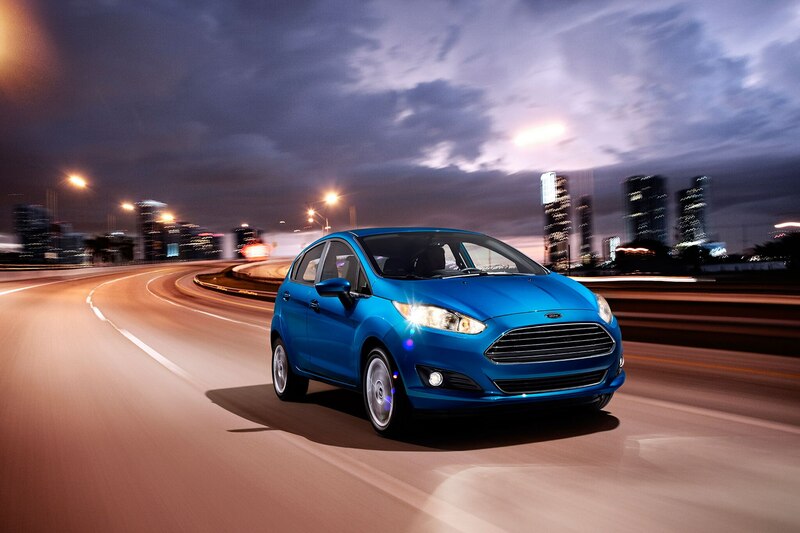 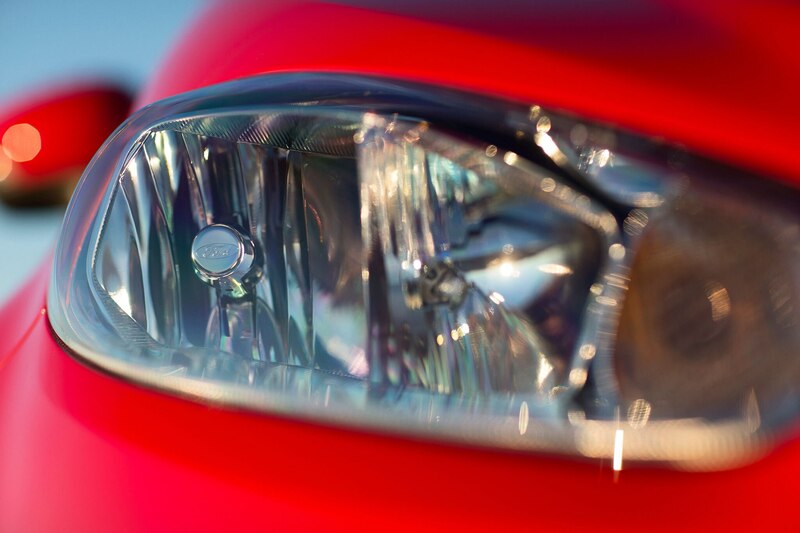 capable, versatile, durable Fiesta ST beyond its breaking point. 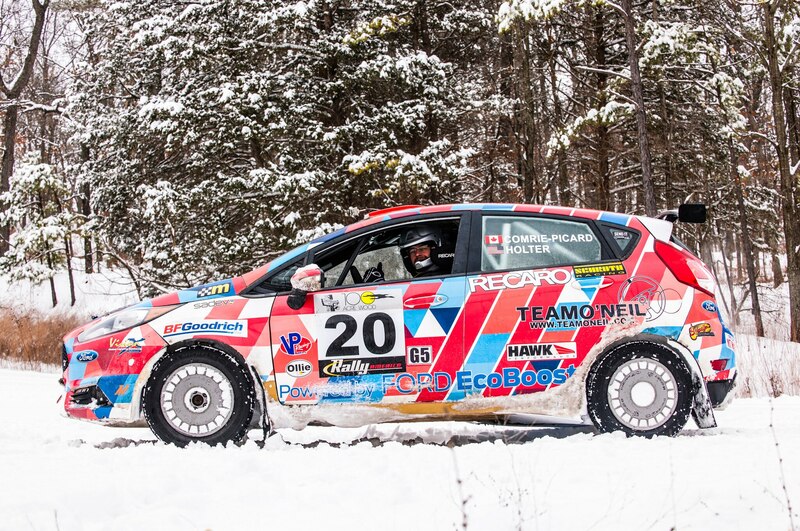 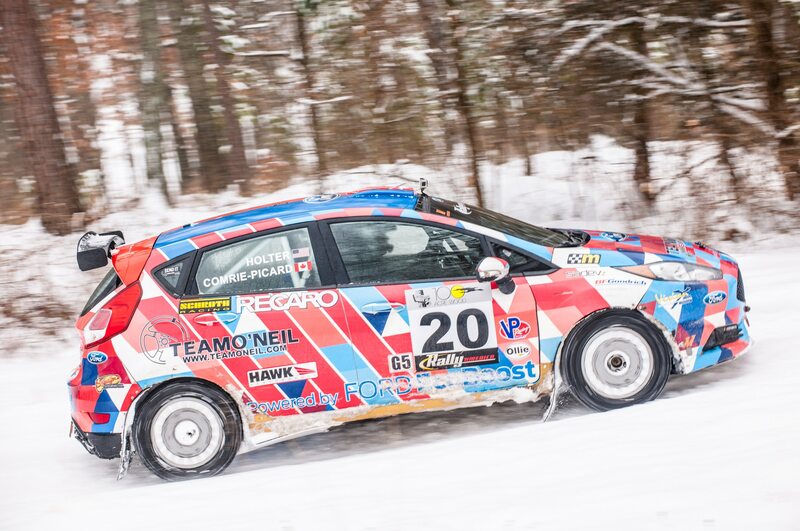 Pushing it there will be Andrew Comrie-Picard (ACP, as fans call him), 2014 Rally America two-wheel-drive champion and driver of the No. 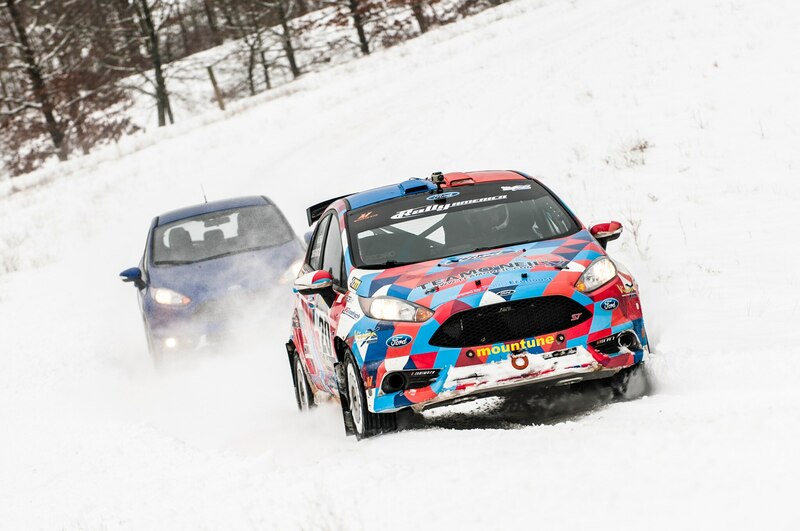 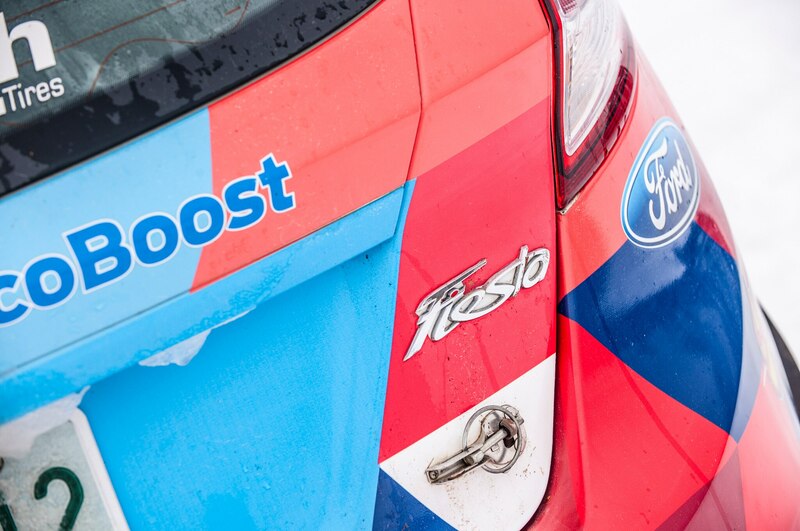 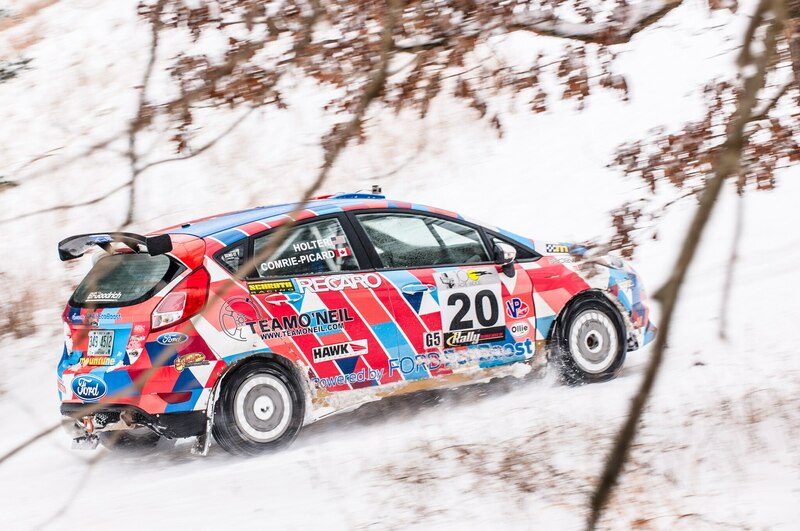 20 Team O’Neil Ford Fiesta ST, and his navigator, Ole Holter, who will use our ST during the rally’s reconnaissance. 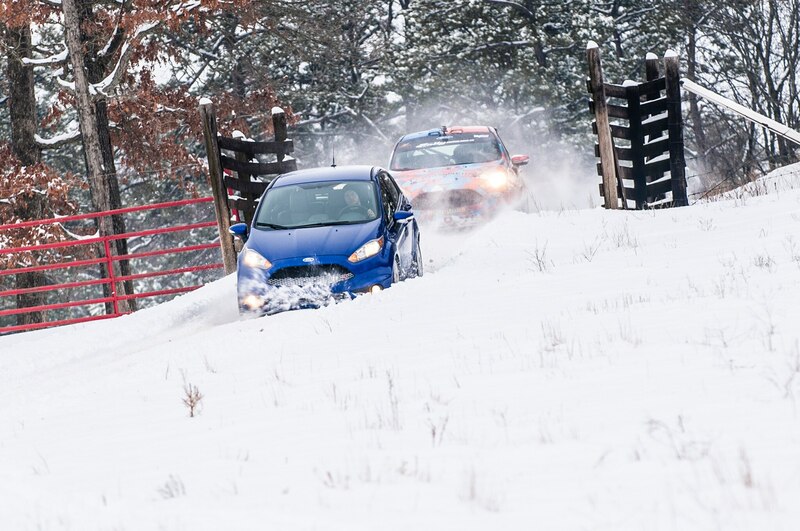 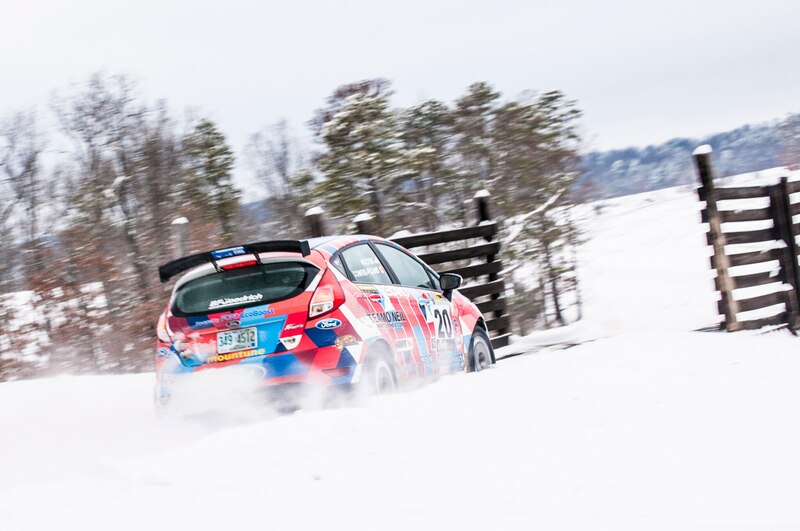 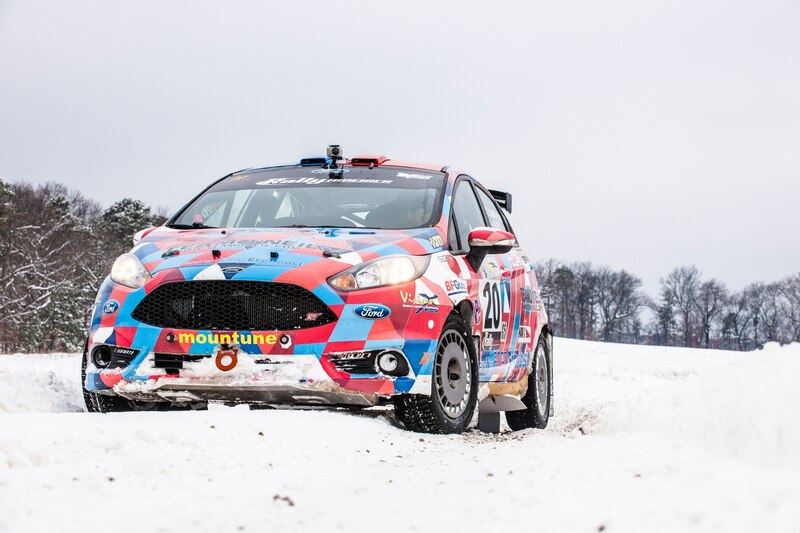 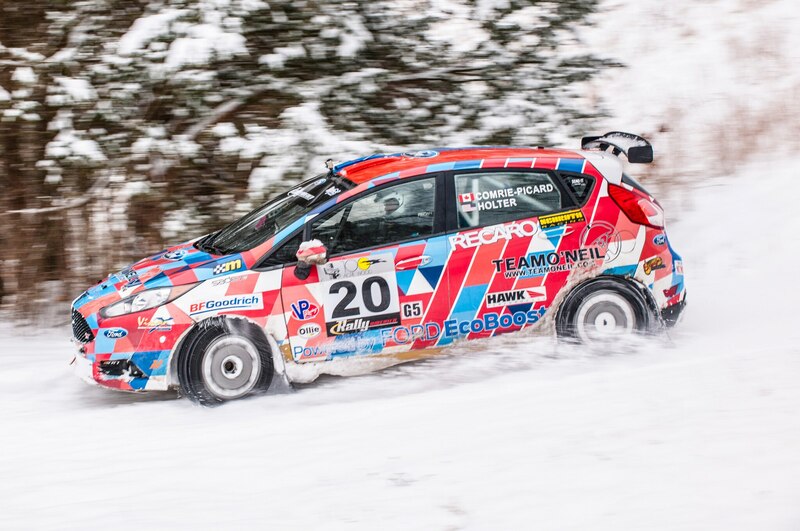 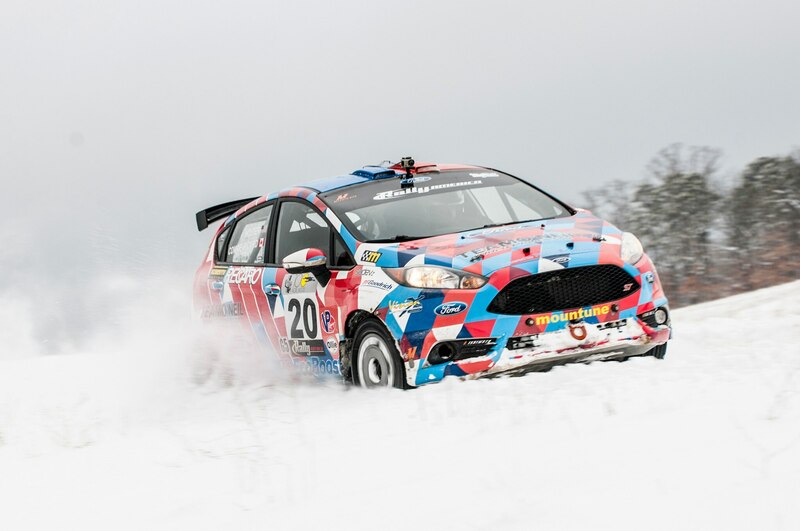 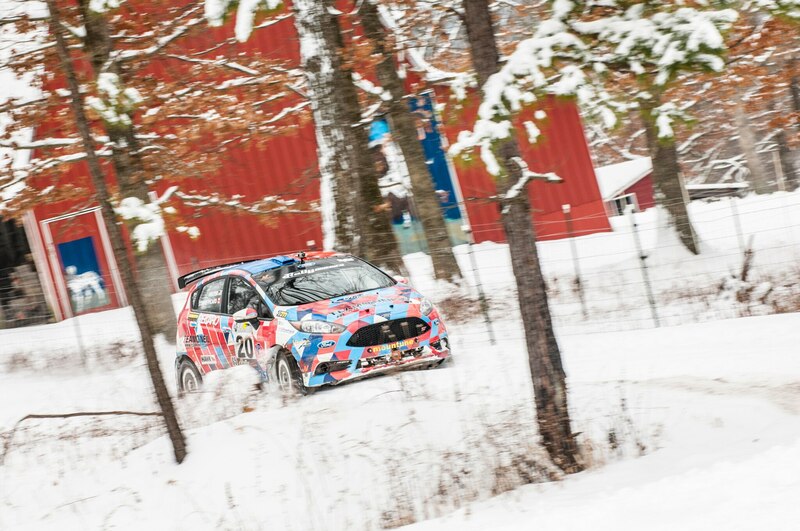 The “recce” occurs the day before a rally when teams drive the stages—segments of closed public roads—to get a feel for the course and conditions. 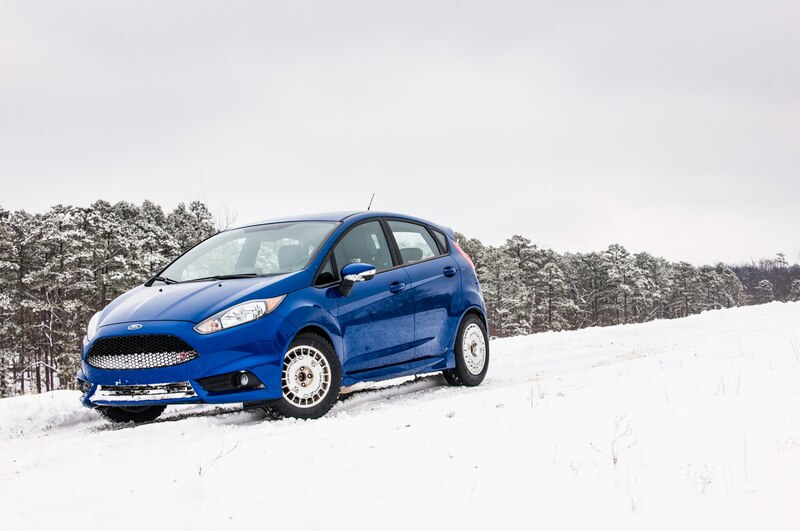 Doing the recce in our car might seem idiotic, but ACP isn’t concerned, noting that our Fiesta has the same architecture as his rally car. Sure, ACP, but basic engine and suspension geometry aside, your car is lifted and has a stronger suspension, a sequential gearbox, a rollcage, and rally-spec wheels and tires. 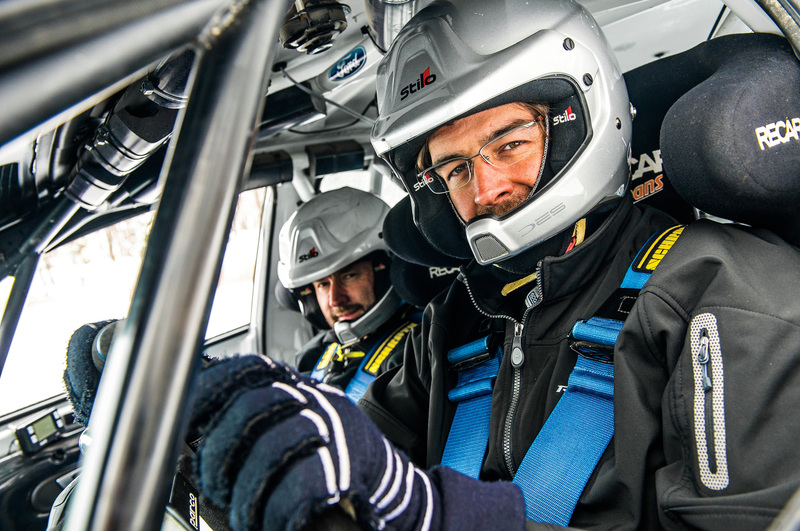 Before the recce, we talk to Holter over coffees. 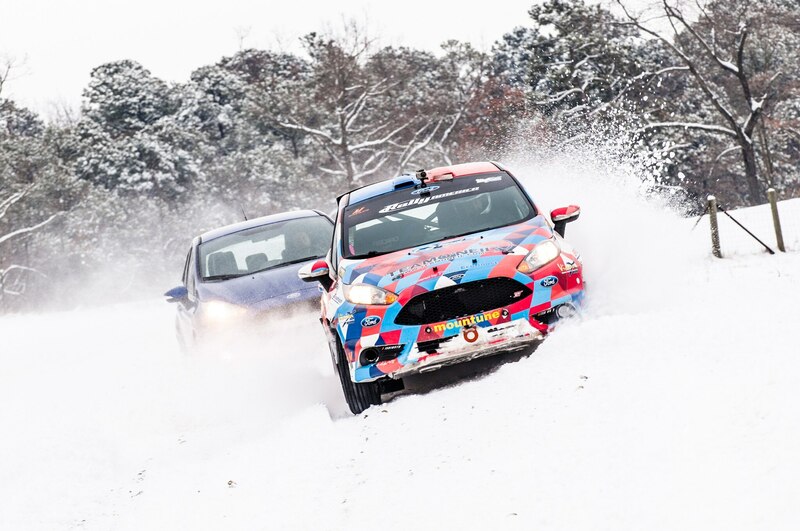 In rallying, the navigator is just as important as the driver. 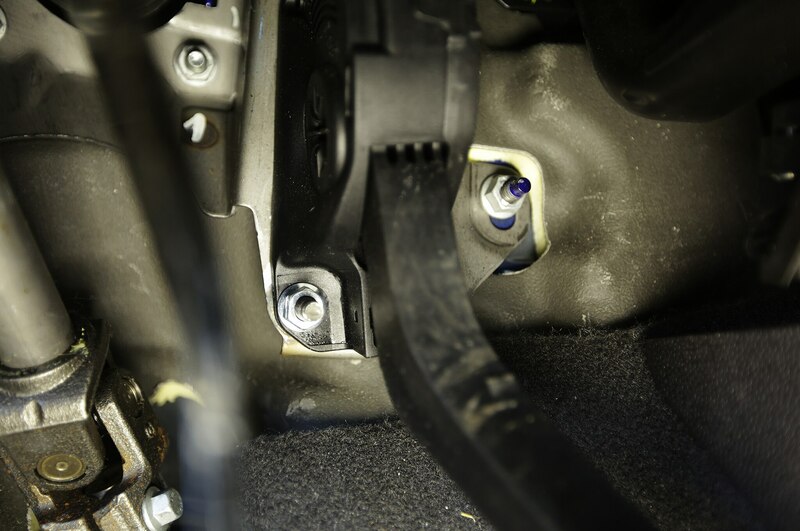 Holter, an electrical engineer from Southern California, follows detailed notes so he can alert ACP to what lies ahead during the rally. 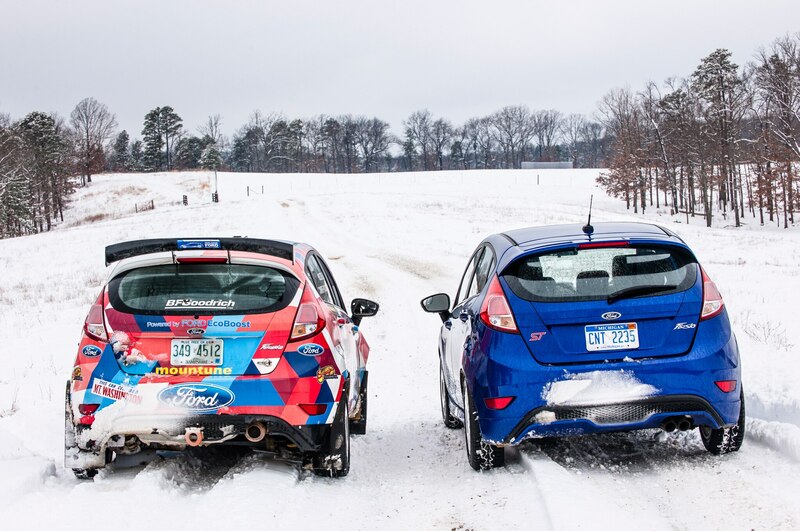 This is only Holter and ACP’s ninth race together, but they’ve been friends for 12 years. 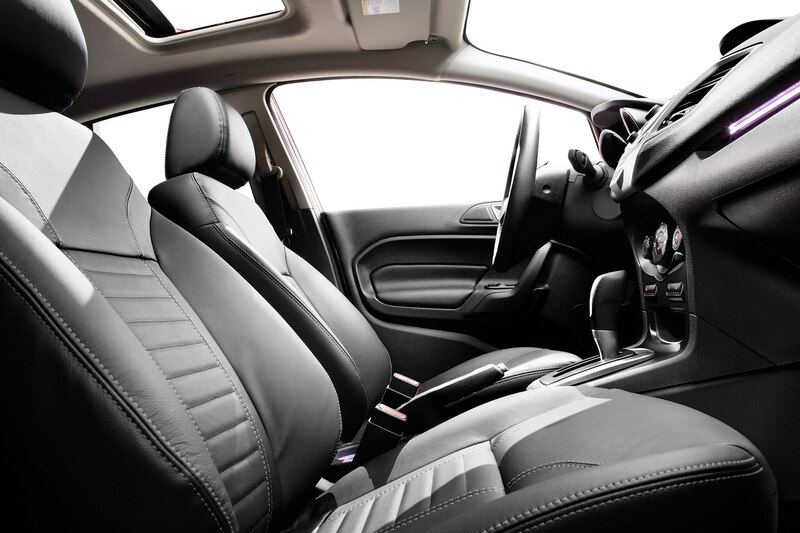 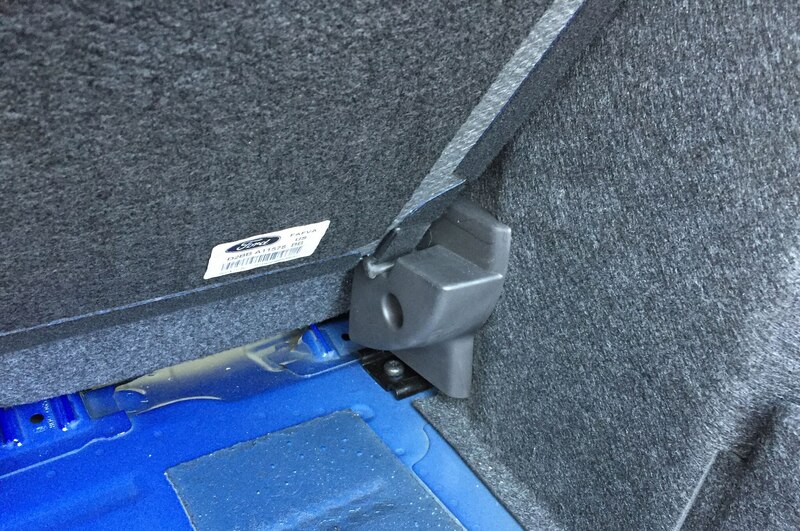 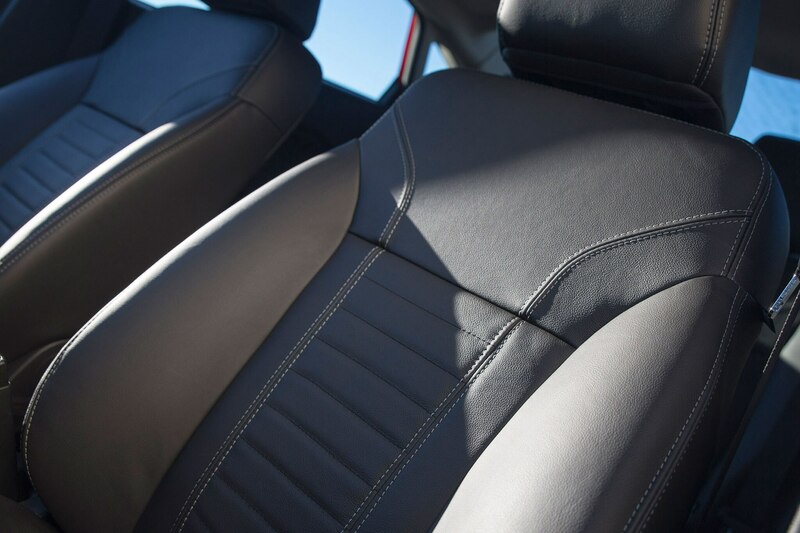 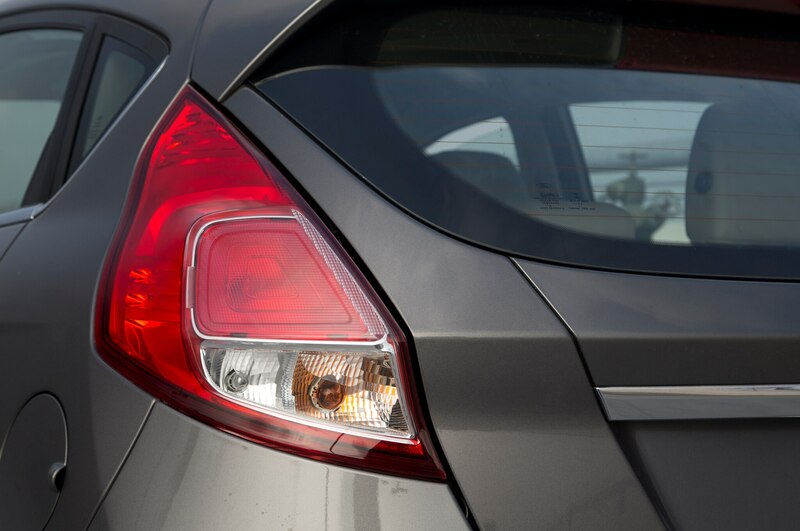 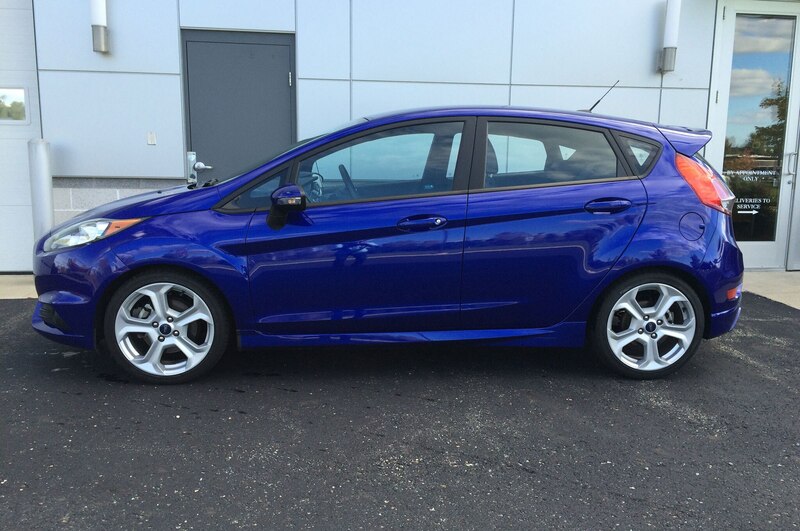 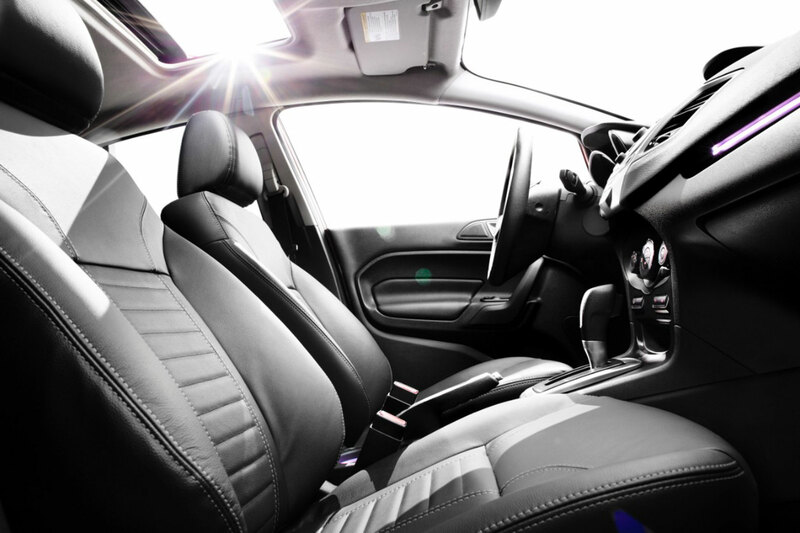 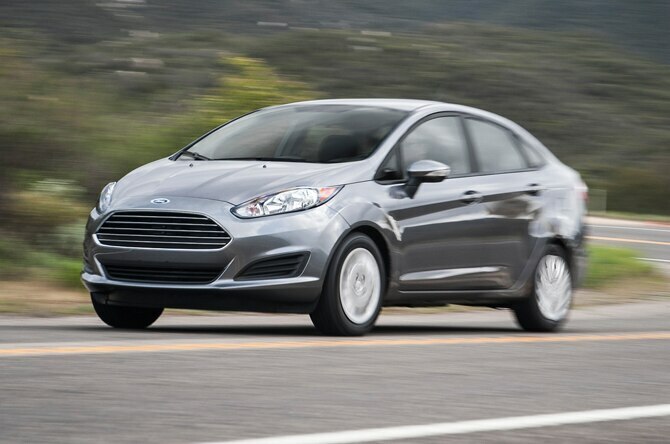 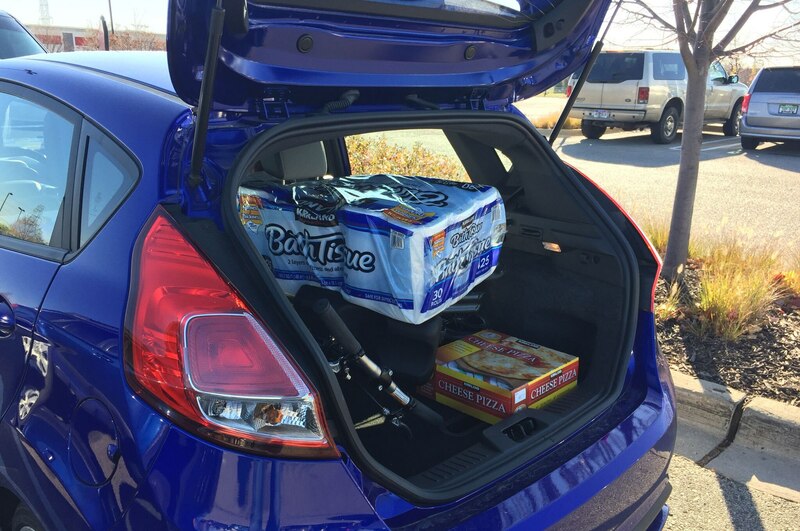 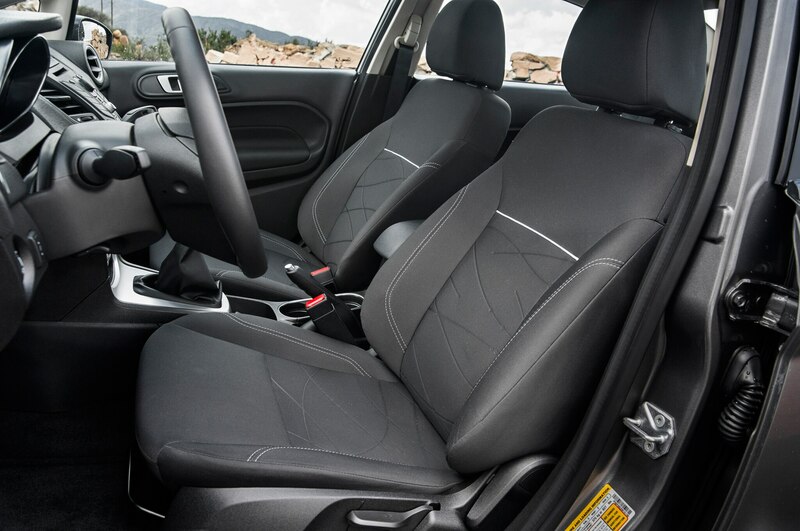 We sit in the back seat of our 2014 Ford Fiesta ST as ACP tops off the car with gas, and Holter walks our way with snacks and drinks. 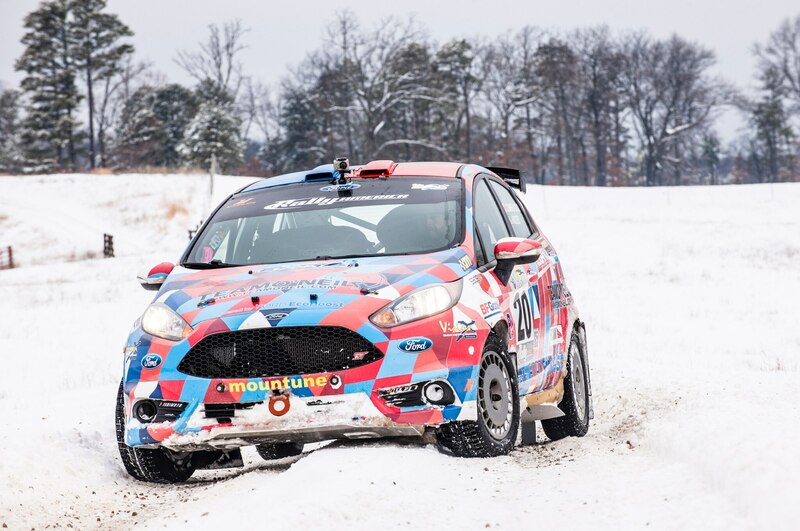 ACP starts to say something, but Holter cuts him off: “No, they didn’t have Coke Zero, so I got you a Diet Coke instead.” A lot of love, trust, and respect between these two. 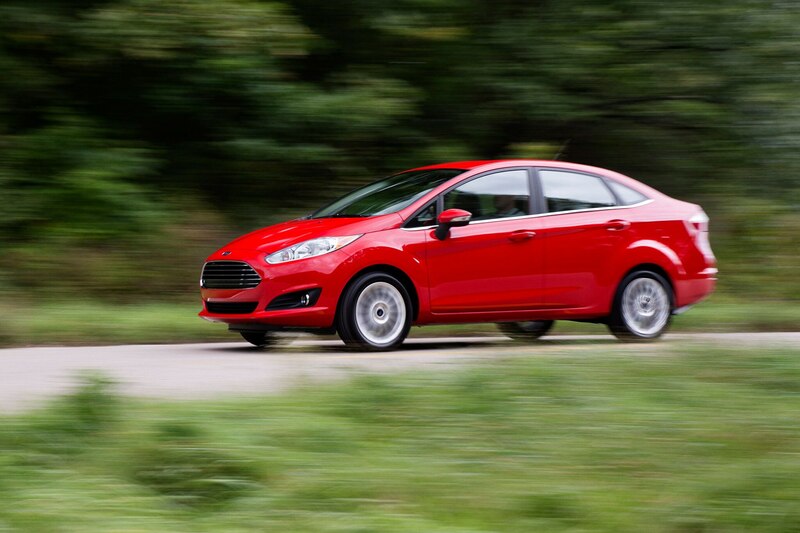 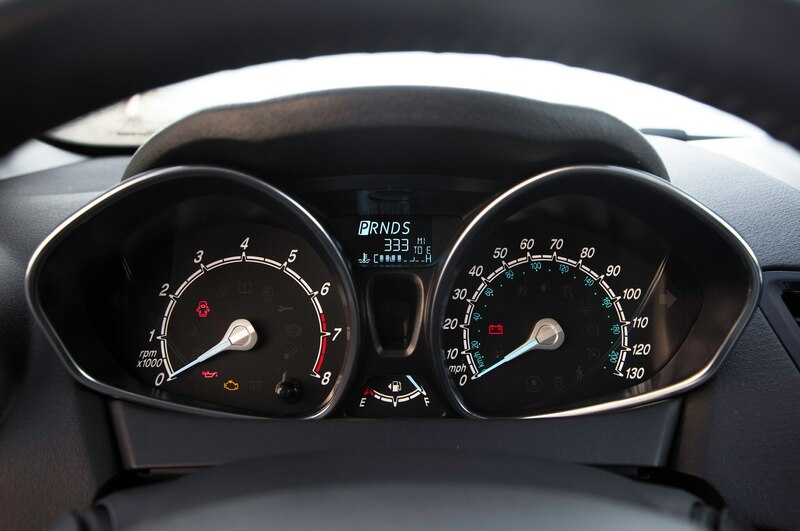 The speed limit for the recce is thankfully 35 mph—any faster, and our Fiesta might shake itself apart. 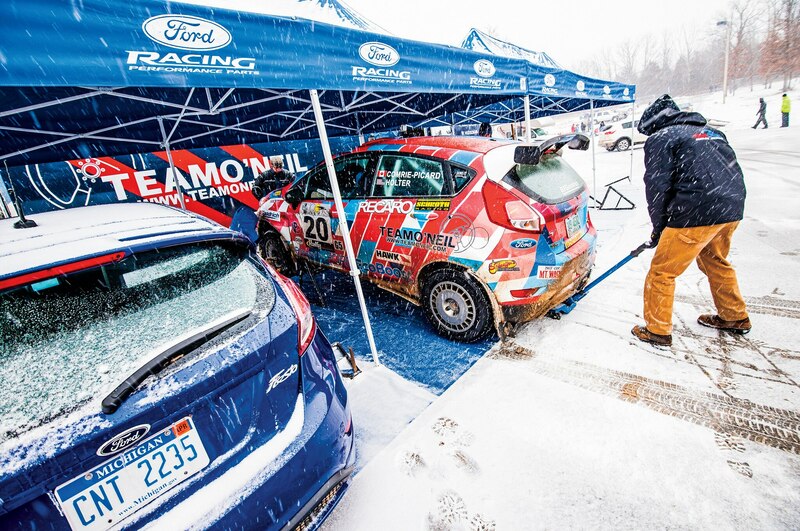 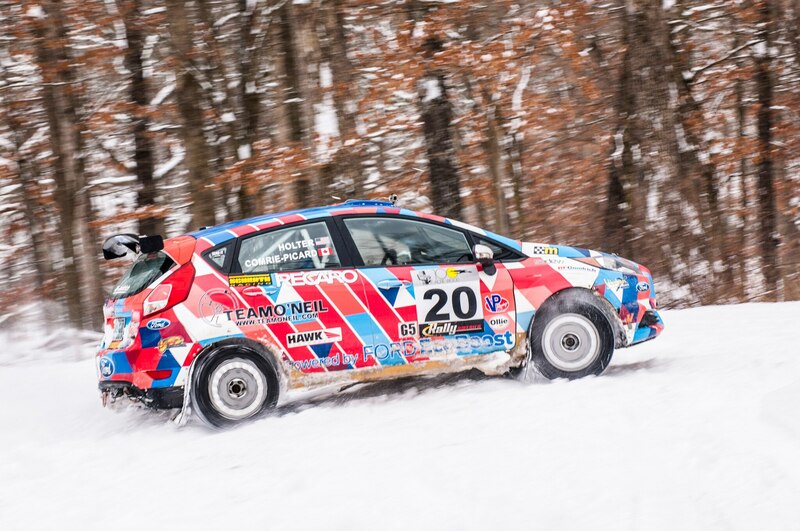 The snow-covered, dirt-and-gravel stages are unforgiving. 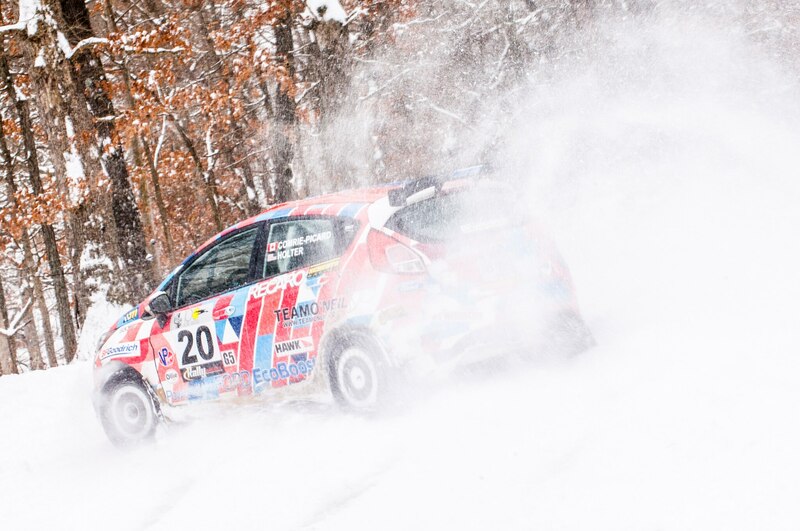 Rocks pelt the car as we jerk around in the back seat like we’re on a rickety wooden roller coaster. 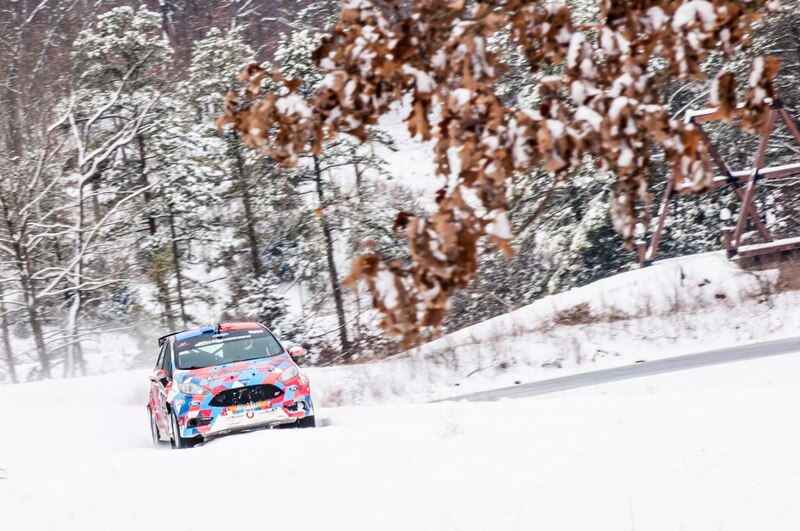 ACP opens the door, sticks his foot out of the moving car, and drags it along the ground, getting a feel for the road hidden beneath the snow. 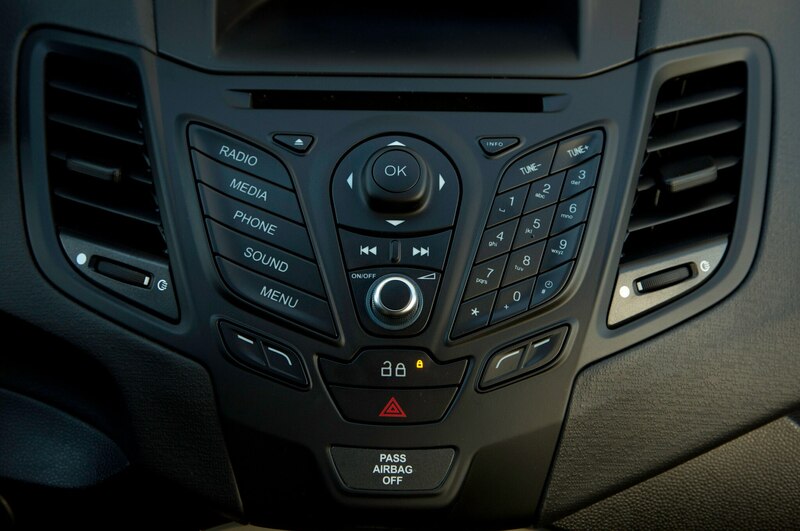 Holter’s voice is calm and melodic as he coolly rattles off directions until a loud, jarring “Caution!” disrupts the calmness. 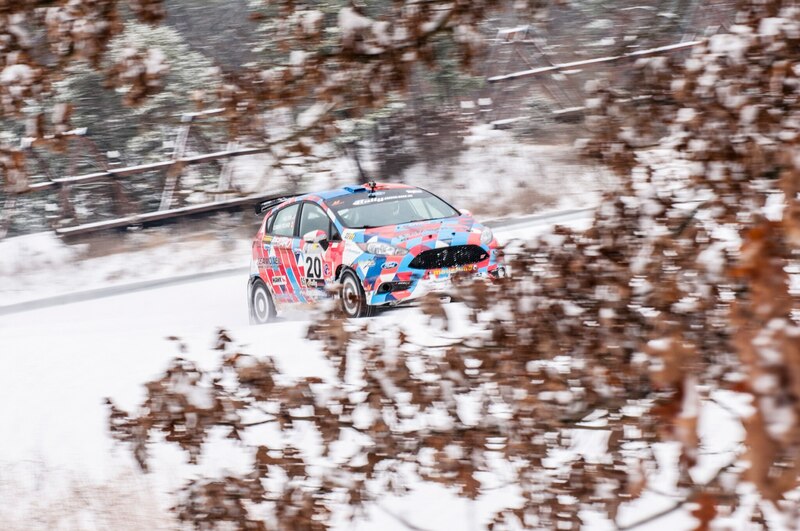 ACP brakes hard approaching an ice-covered hairpin and then slides through it sideways. 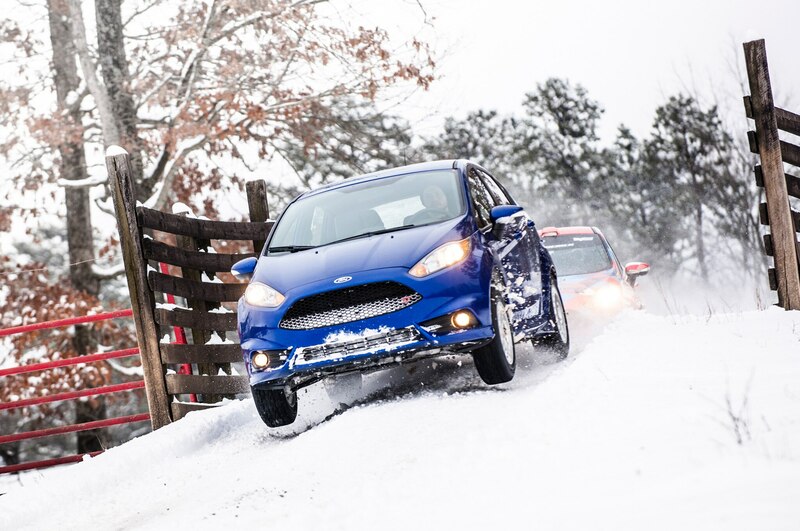 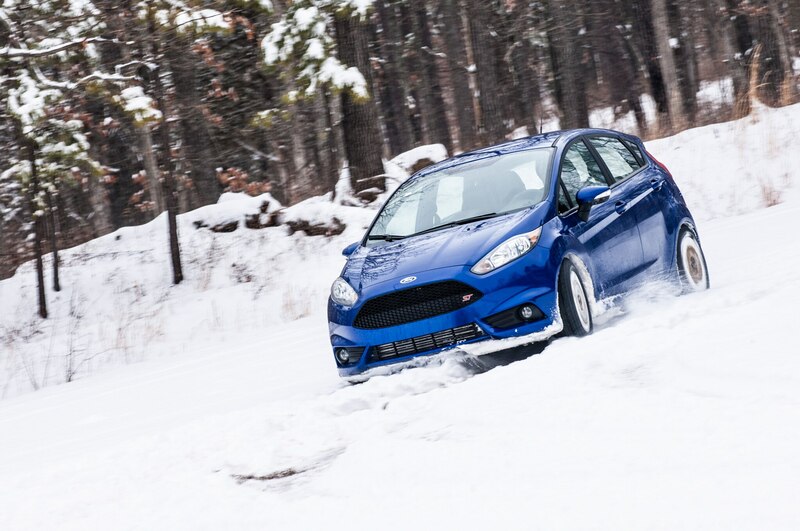 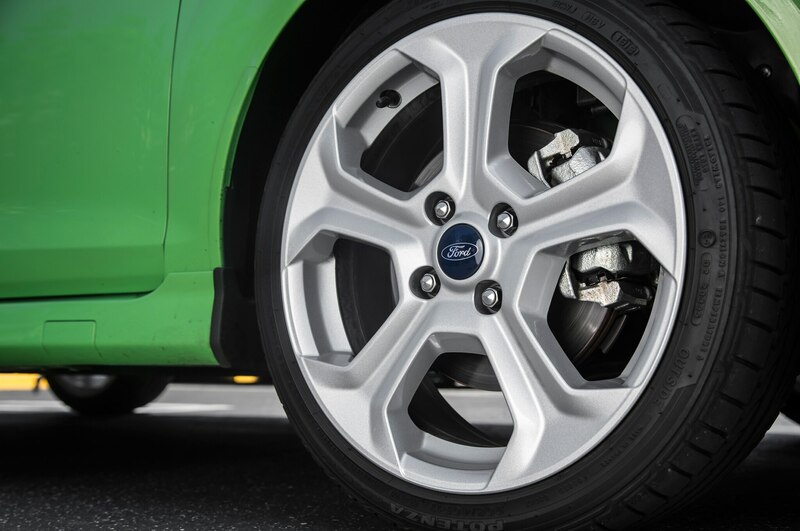 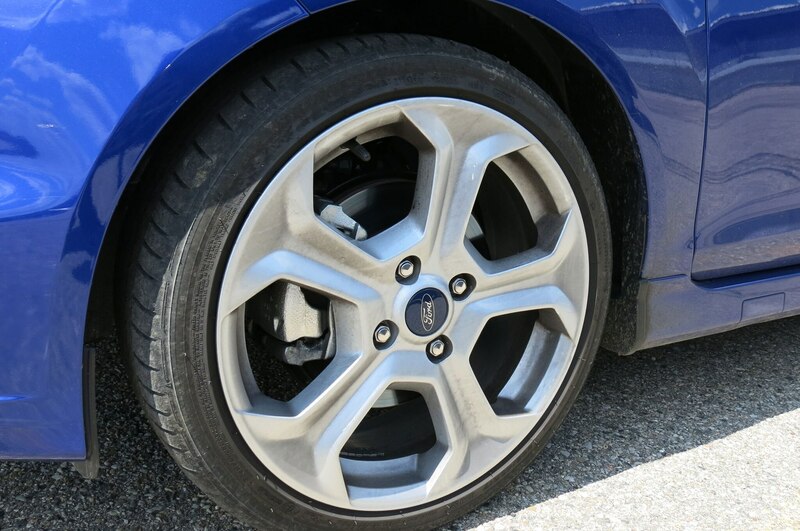 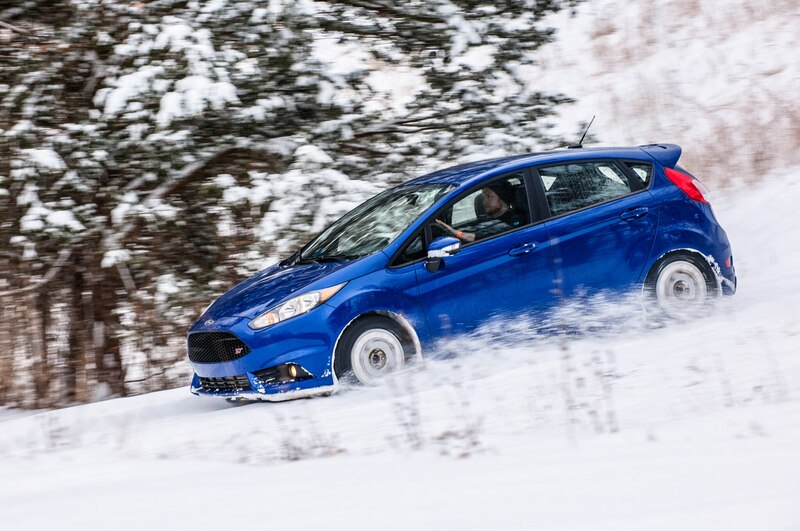 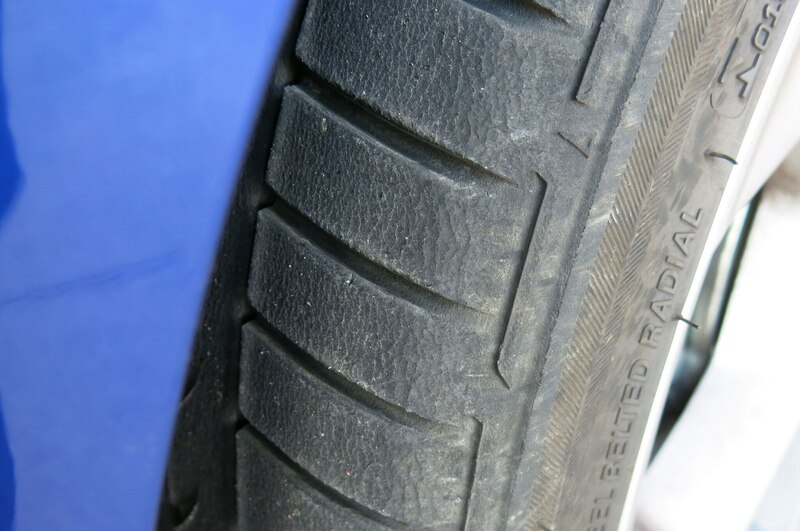 Stages come and go, and the Fiesta ST is taking abuse from deep potholes and sharp drops. 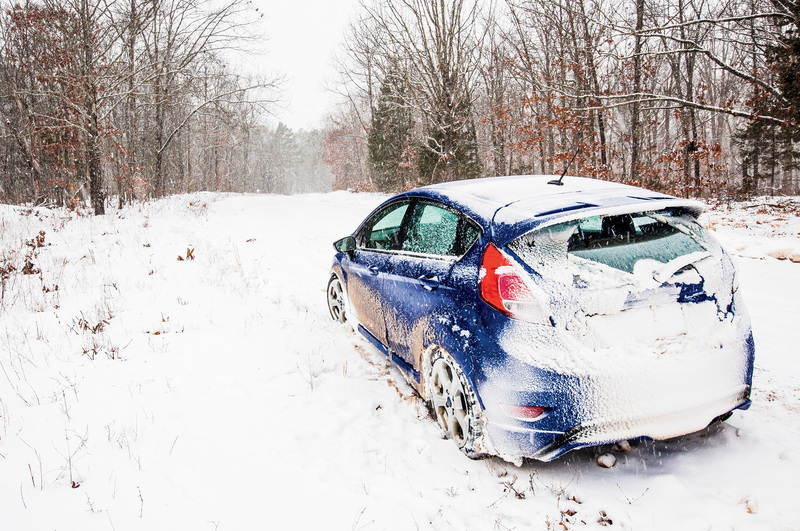 We come upon a white Chevrolet Captiva stuck halfway up a steep, icy hill. 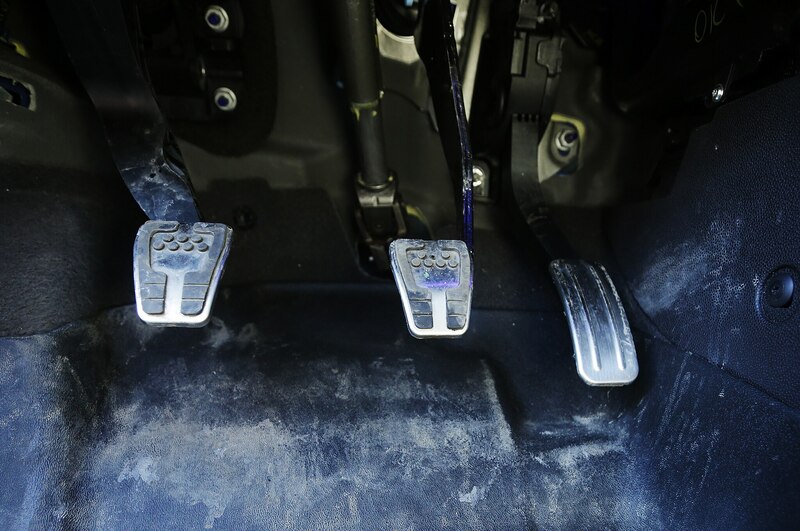 ACP hammers up the incline and barely squeezes the ST between the Chevy and the shoulder but loses steam and gets stuck. 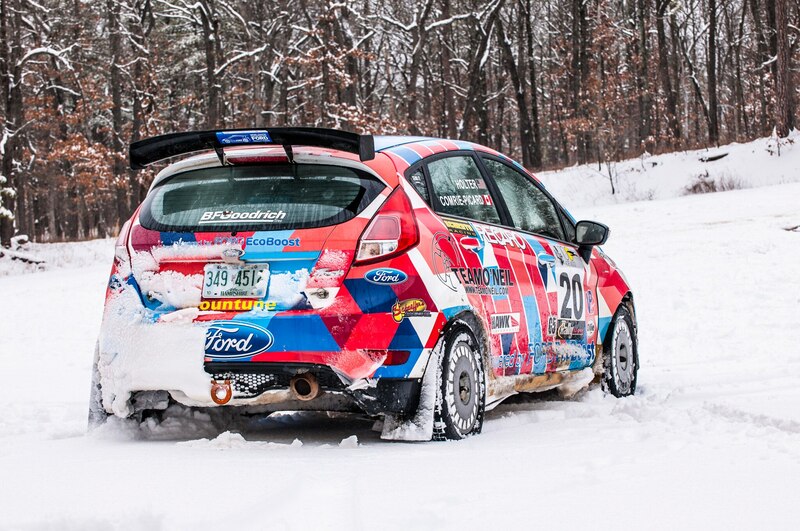 Without hesitation, he spins the car around and, with more weight over the front tires, backs up the hill. 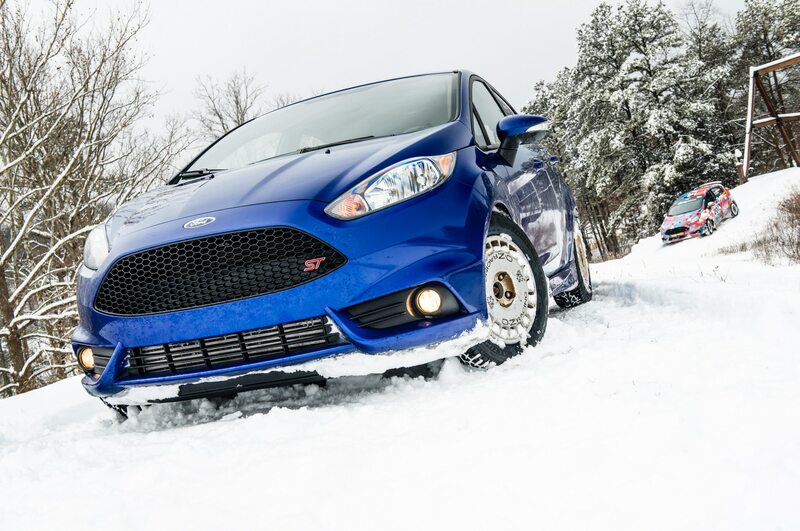 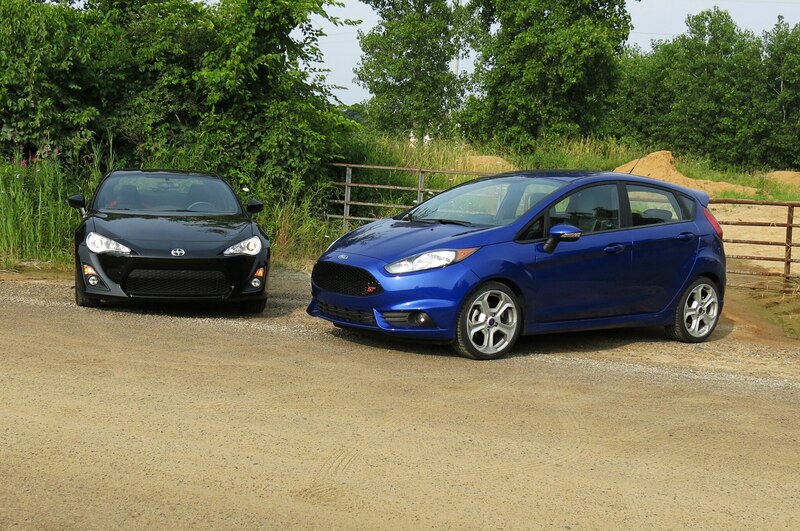 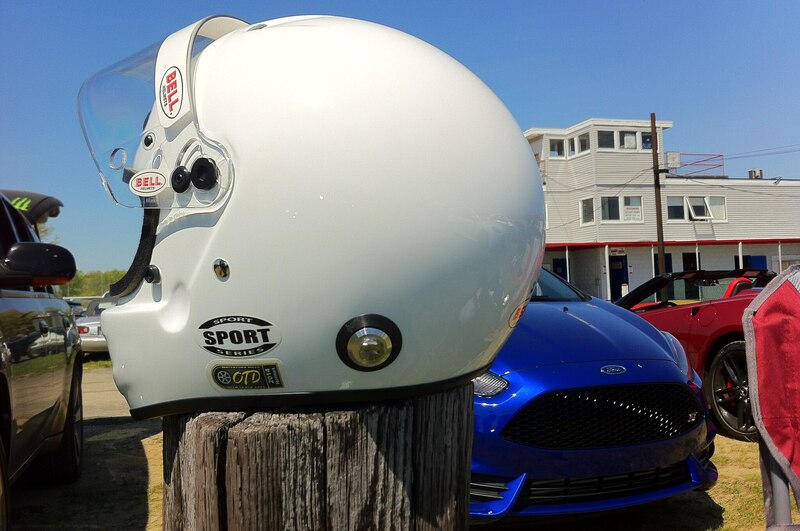 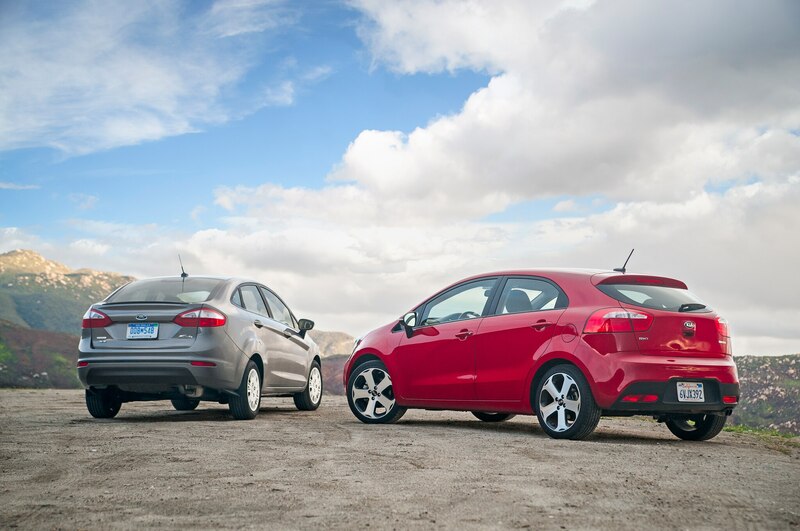 The recce ends, and our 2014 Ford Fiesta ST is no worse for the wear. 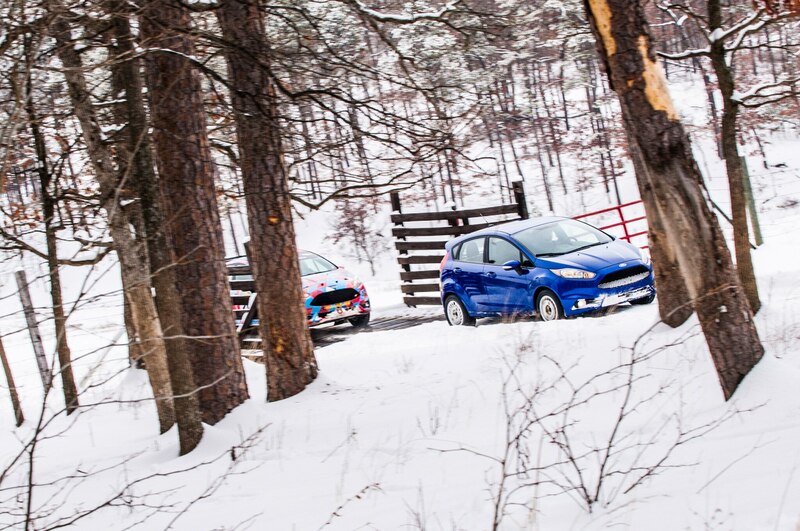 The next morning we drive to the first stage, park, and hike through a forest of skinny ash trees. 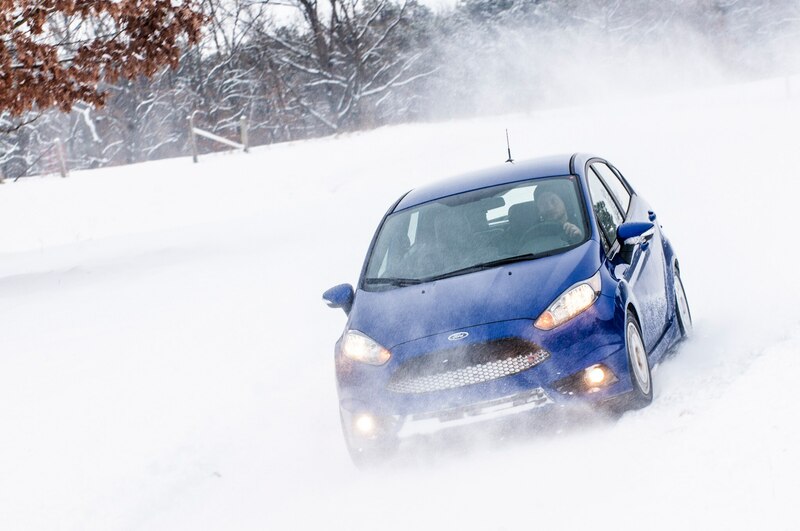 A creme-brulee-like layer of ice atop the snow breaks and pops underfoot. 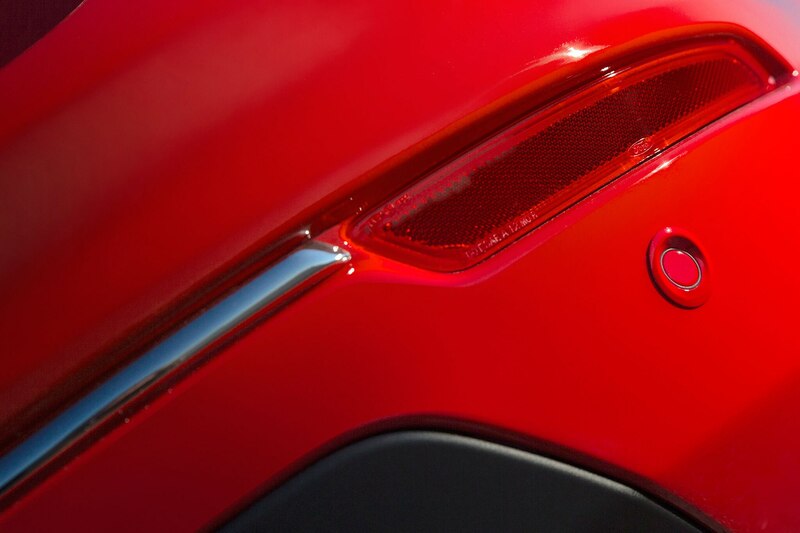 Nearby are a group of drunken Ukrainian dudes, a woman with her two bulldogs, Maggie and Jax, and a guy handing out moonshine-soaked cherries. 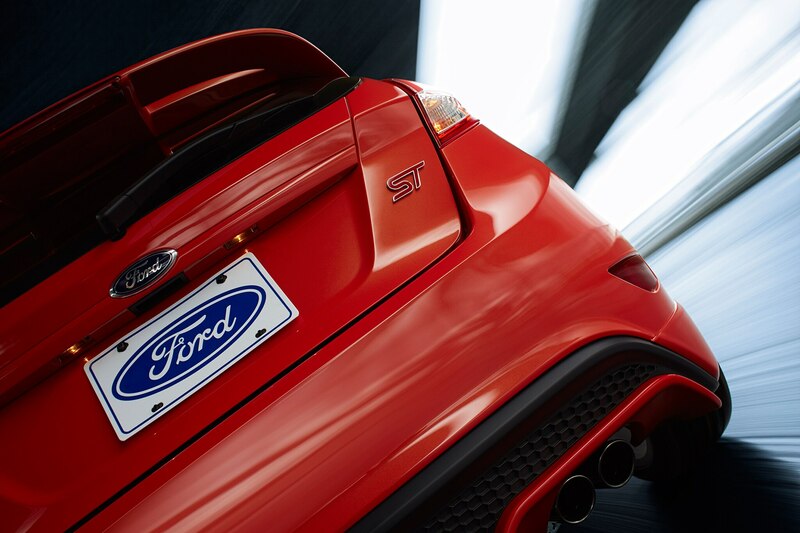 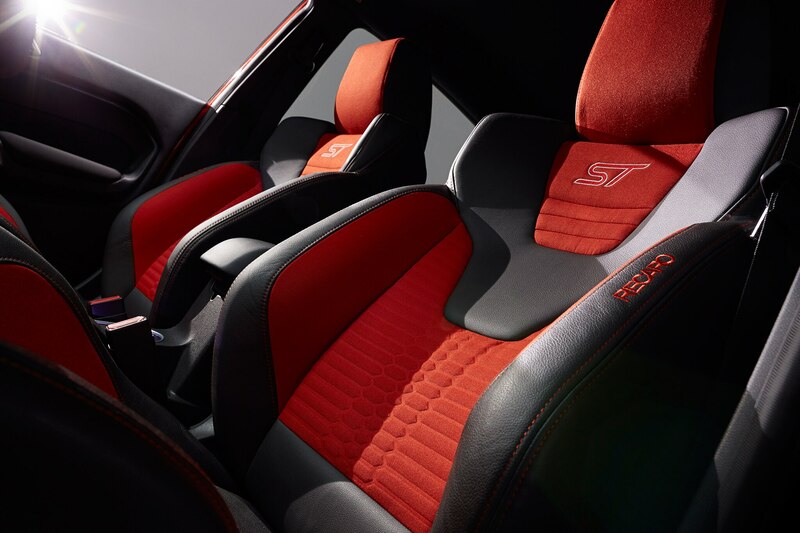 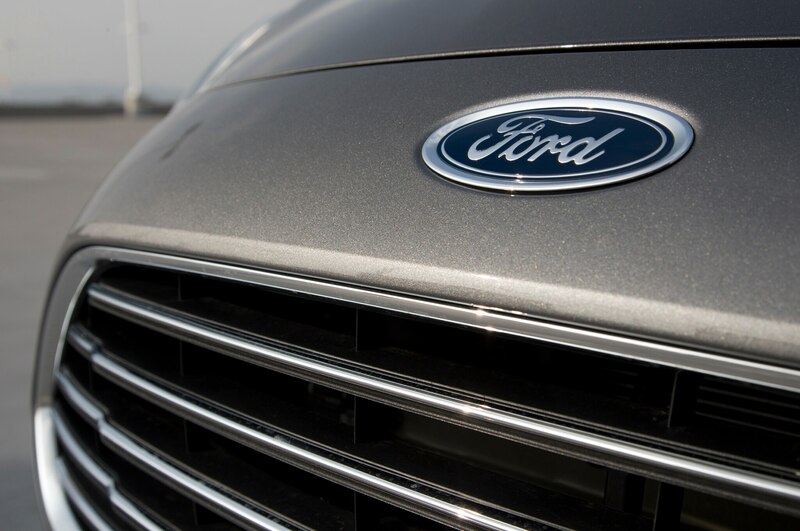 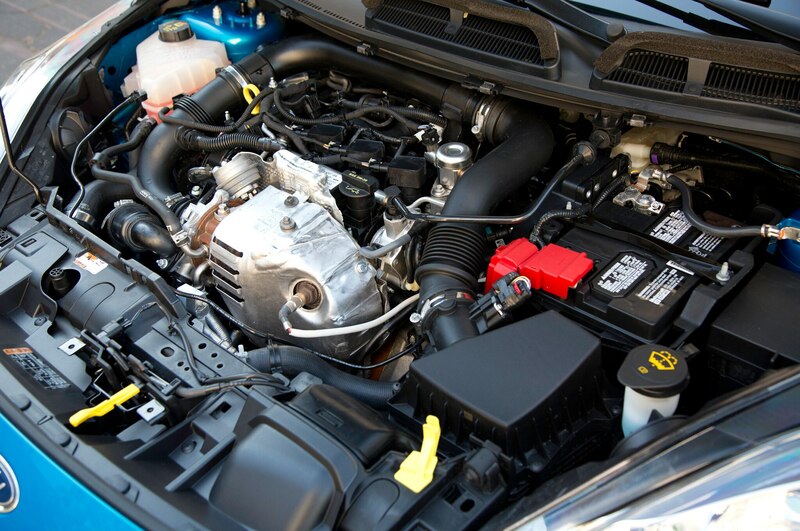 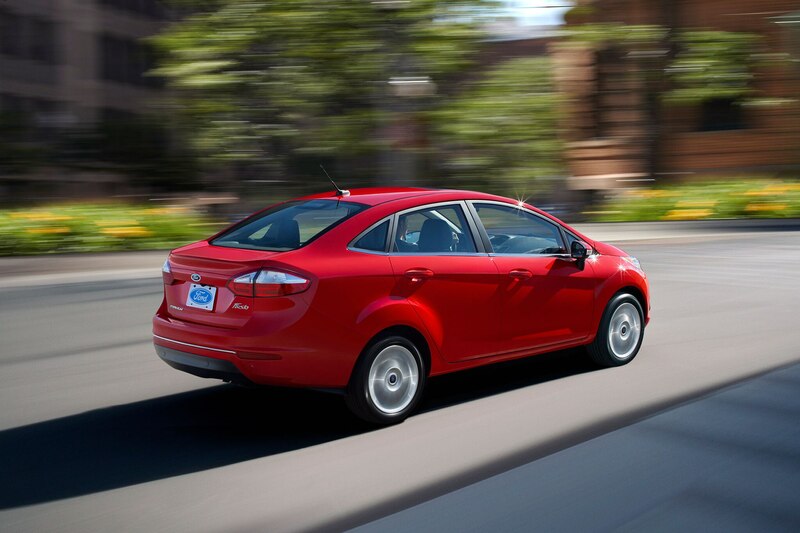 We hear rapid-fire exhaust pops from a turbocharged rally car in the distance, its anti-lag keeping boost up. 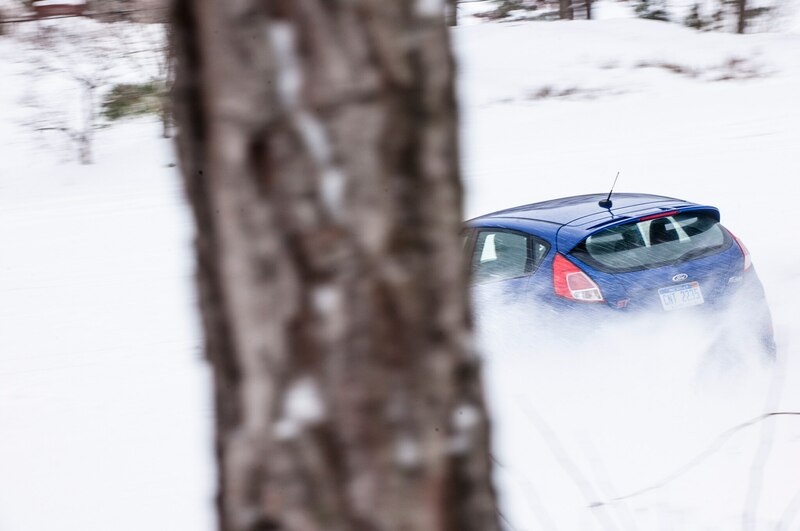 A Subaru WRX STI speeds down the tree-lined road, flicks left then right, skates through a long, right sweeper, and disappears. 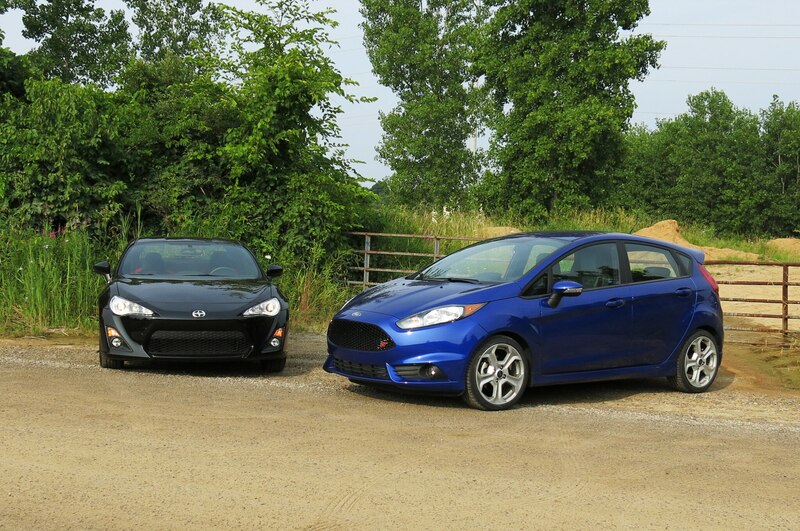 A minute later, another does the same. 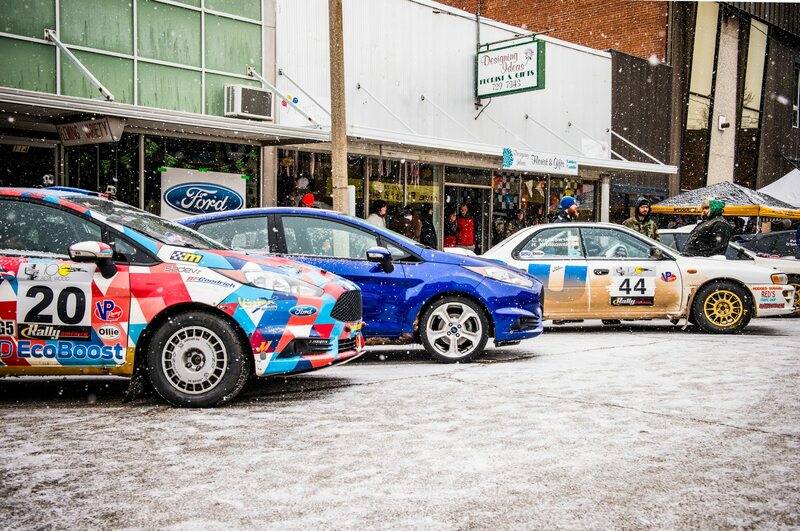 Then an Evo, a Volvo, and a slew of other bruised and battered cars before the red-white-and-blue No. 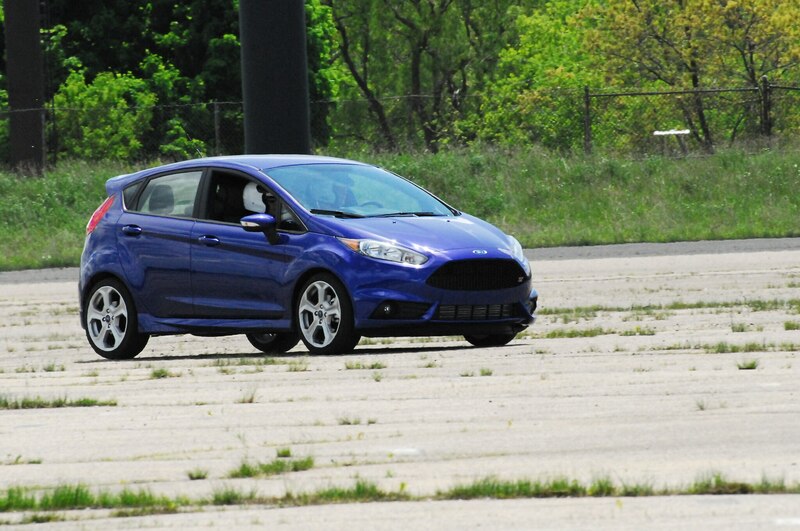 20 Fiesta ST flies by. 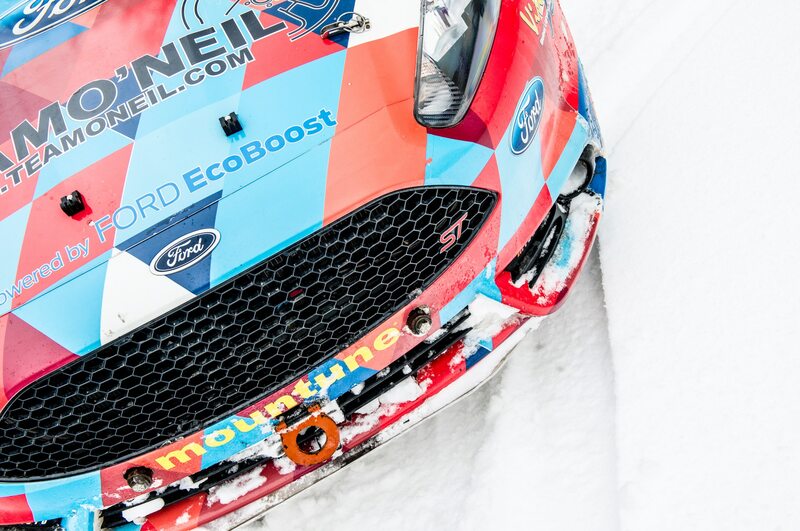 “Watching the race is almost as fun as driving between stages,” says a man short on teeth. 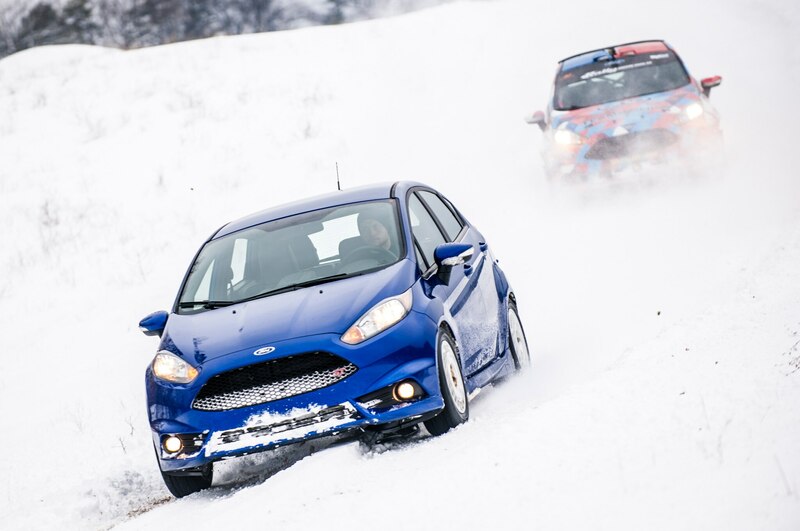 We would’ve held to main roads en route to the next stage had the 2014 Ford Fiesta ST not manhandled the recce. 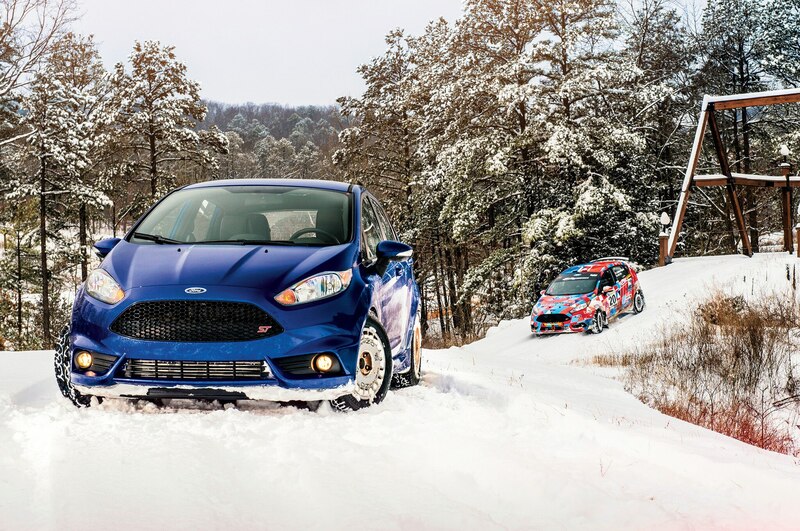 On a dirt road lightly peppered with snow, we take the 1.6-liter turbo-four to its 6,700-rpm redline between each quick, notchy shift. 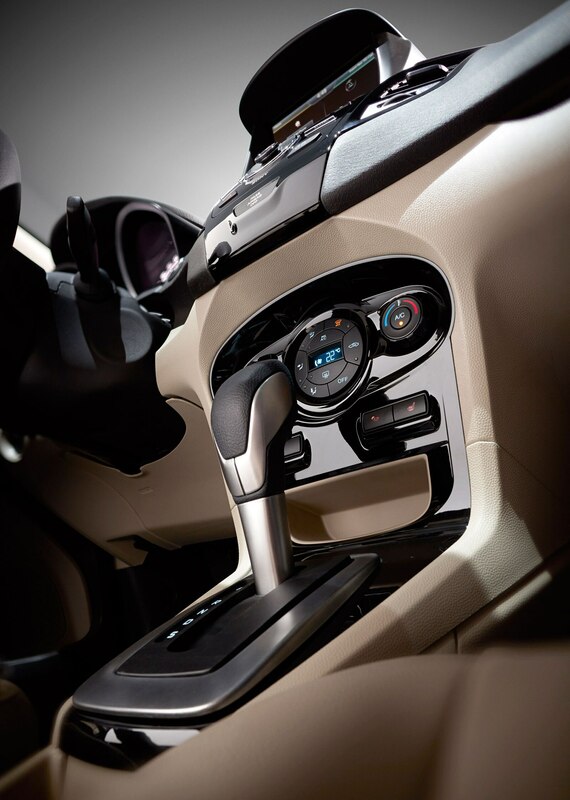 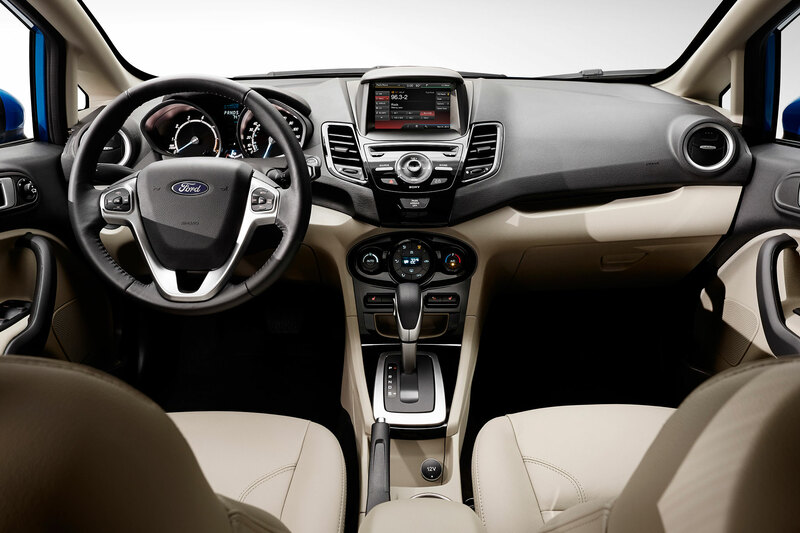 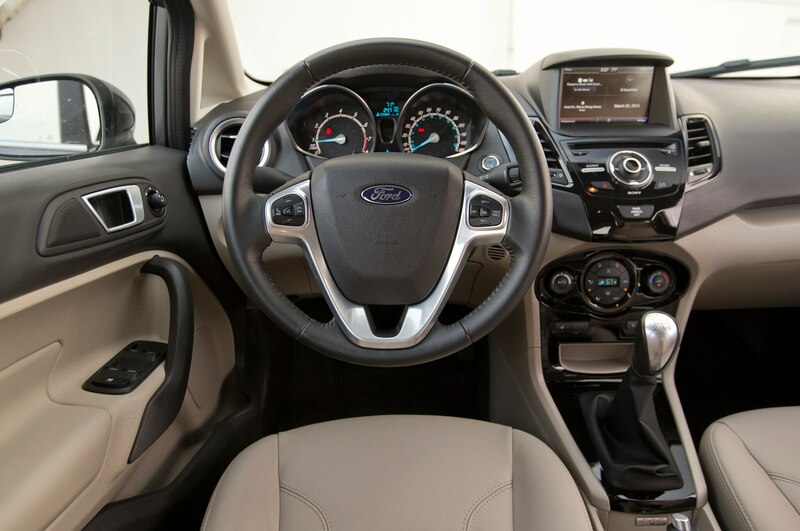 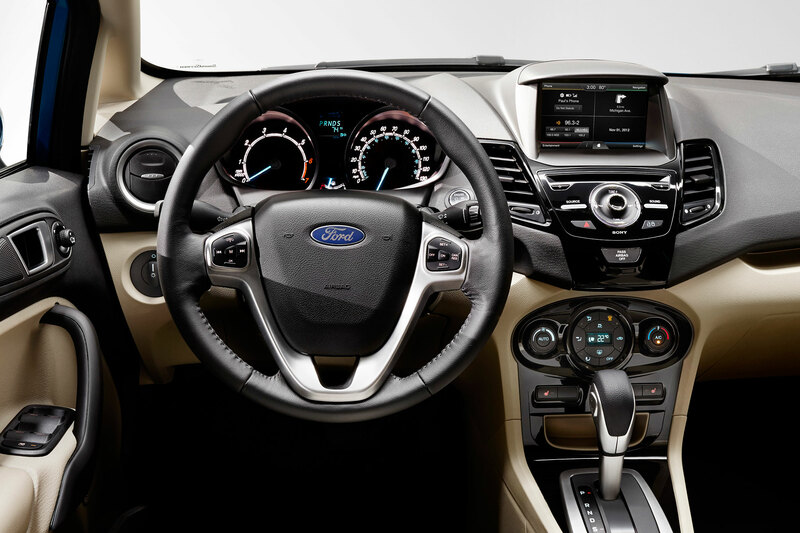 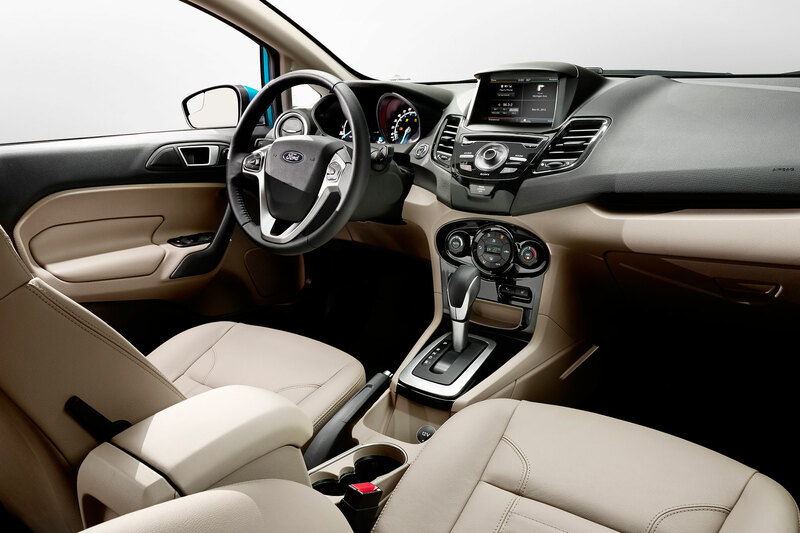 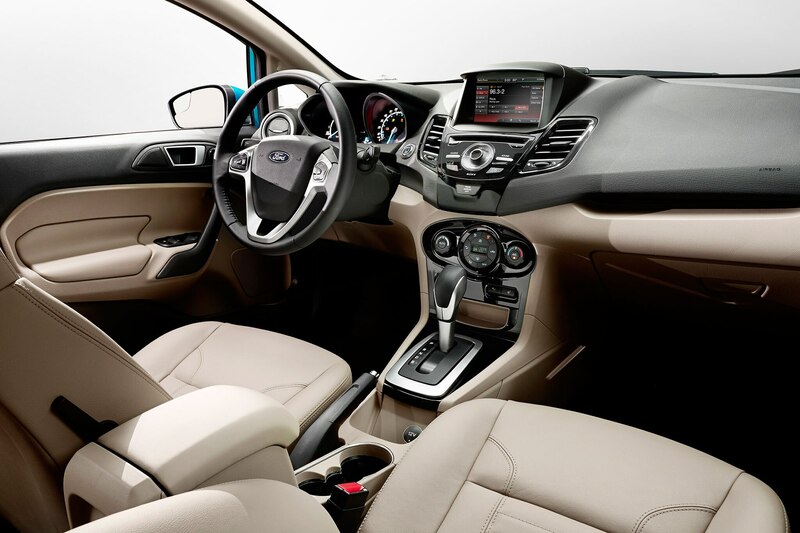 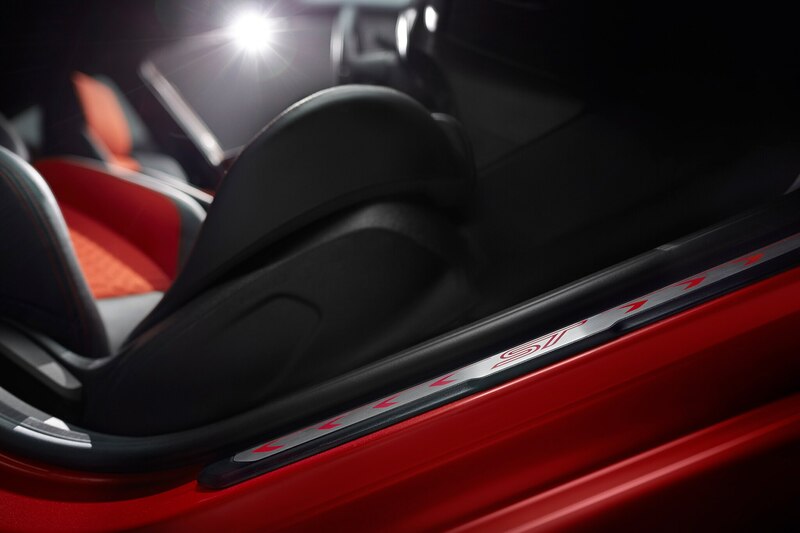 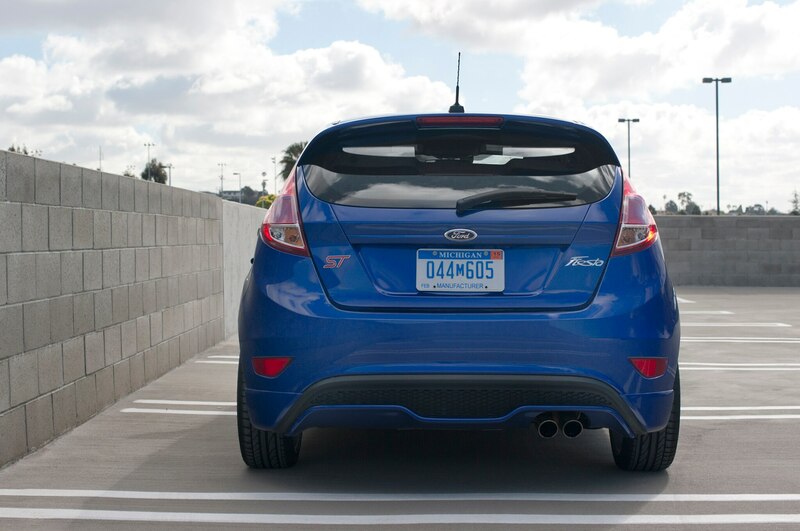 The steering is light and easy to flick, and the rear end rotates effortlessly and predictably. 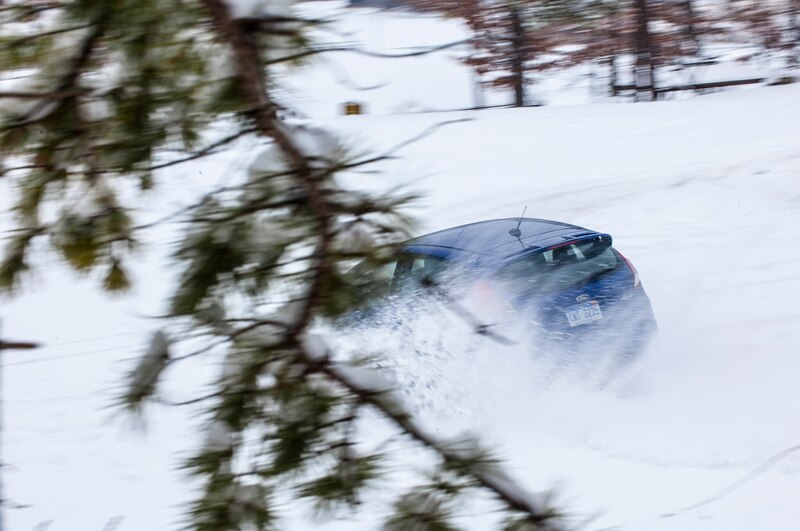 The road ahead is beautiful but grizzly, and we drive over a small rock that turns out to be the tip of a much larger rock, which lodges beneath the car. 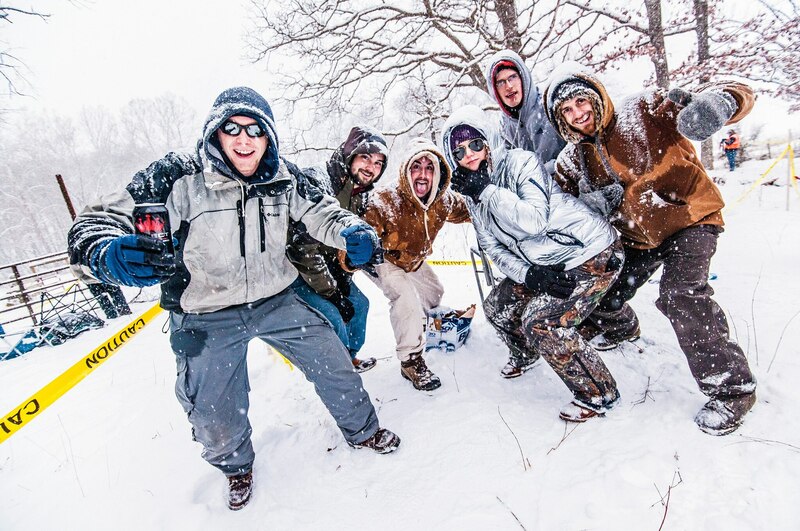 We shimmy the rock out before coming to a creek, 20 feet wide and 8 inches deep. 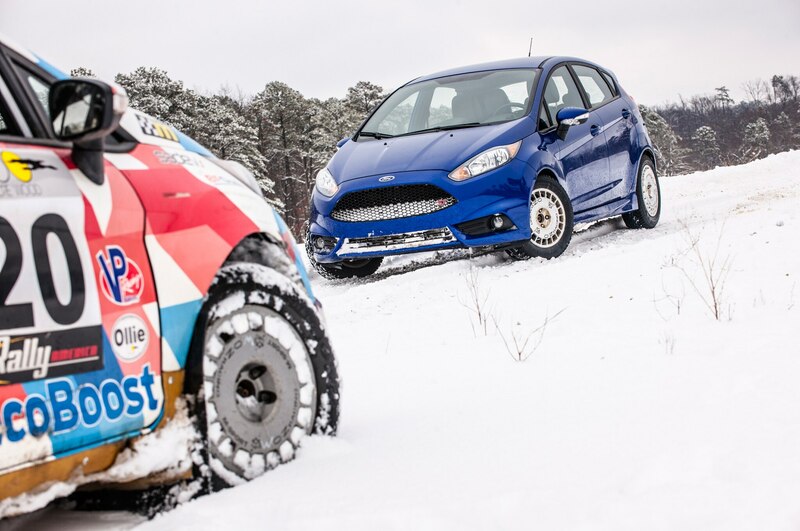 A thick sheet of ice covers one half, and water runs over sharp boulders on the other. 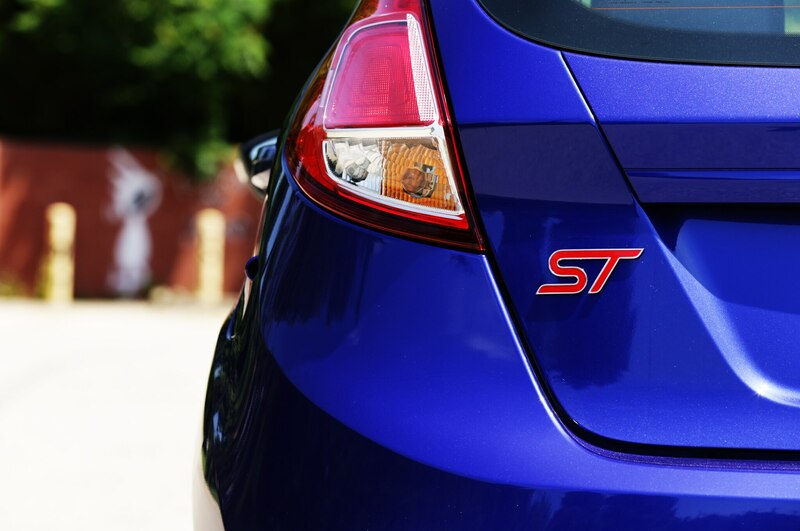 Turning around would be the smart thing to do, but we back up for a running start. 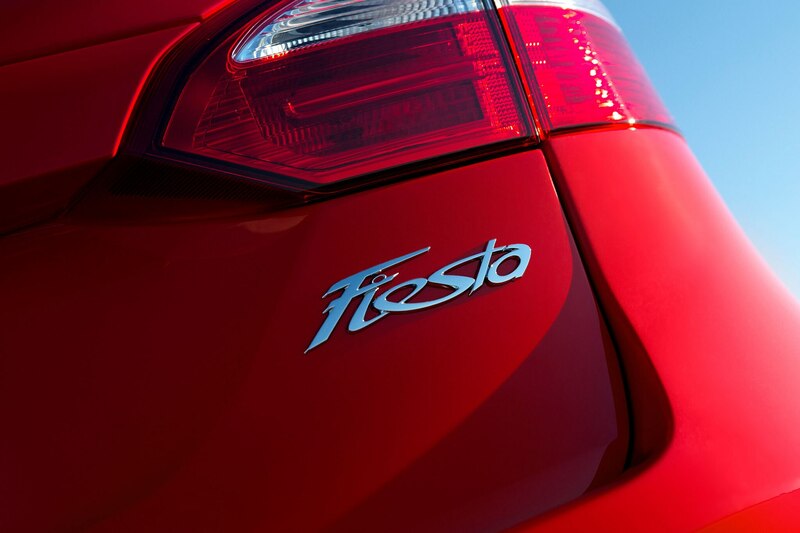 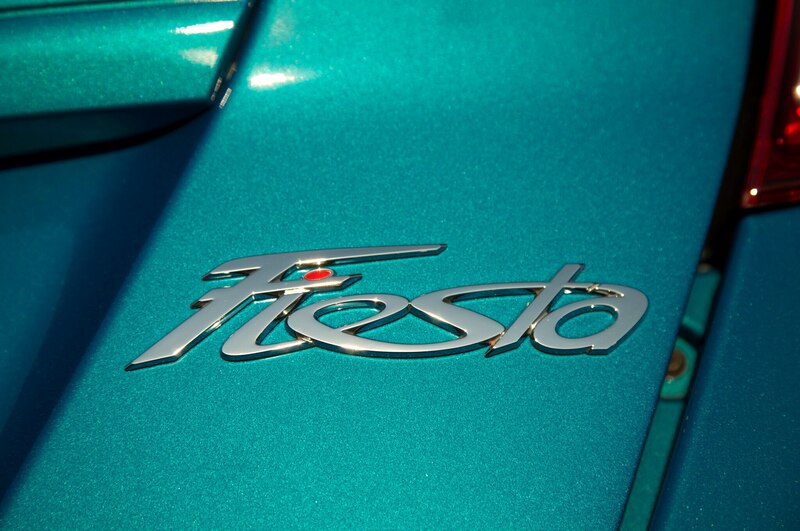 The Fiesta falls into the creek with a thud. 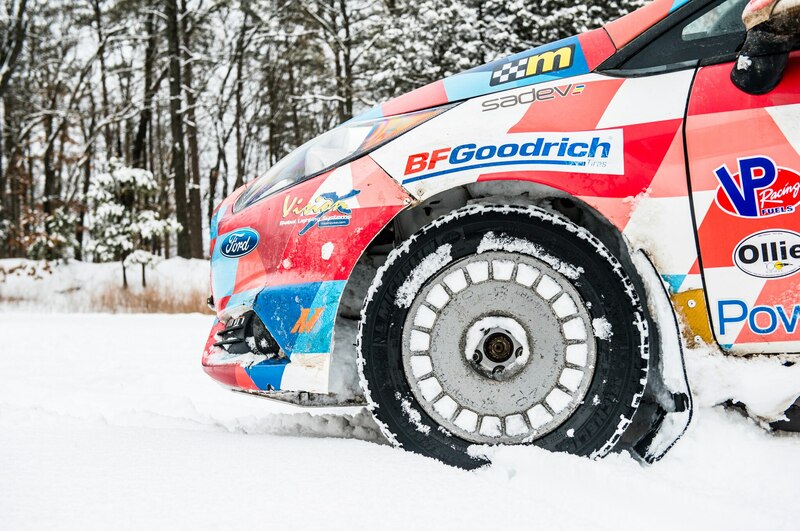 The left-front tire climbs onto the ice and spins as the right-front tire claws against pebbles on the creek bottom. 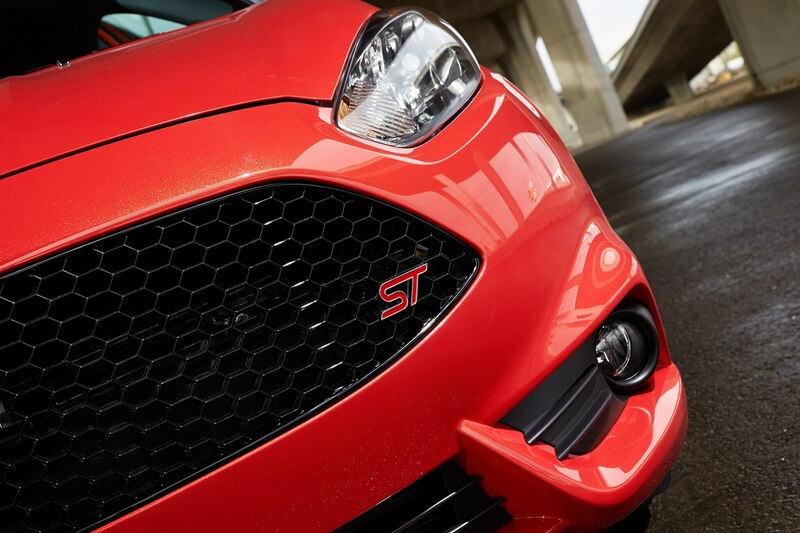 The Fiesta ST climbs from the water. 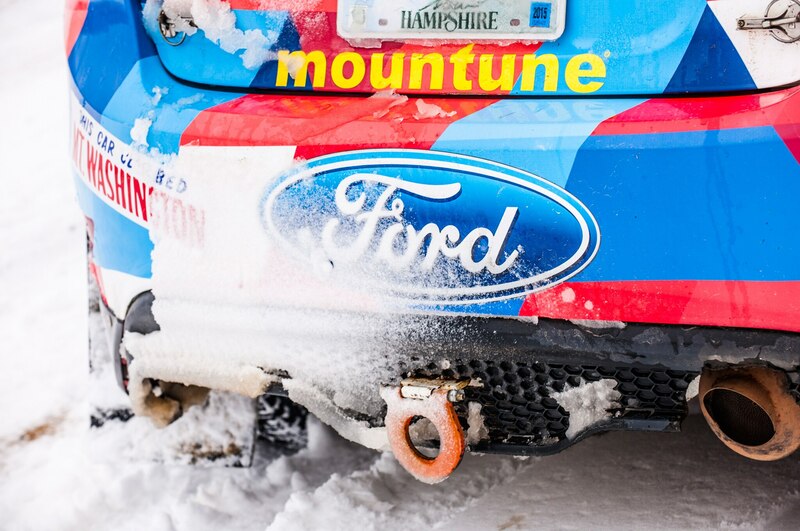 We holler and slap the dashboard. 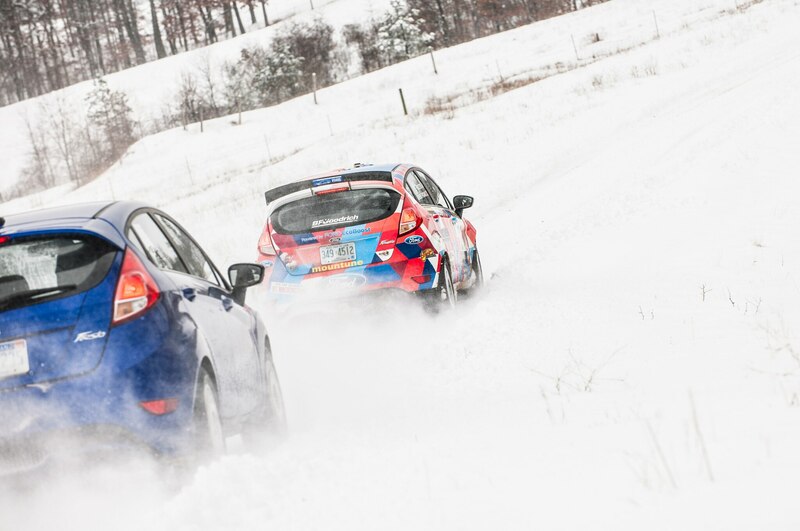 Light snow begins to fall as we leave the day’s final stage, turning into a whiteout by the time we reach the hotel. 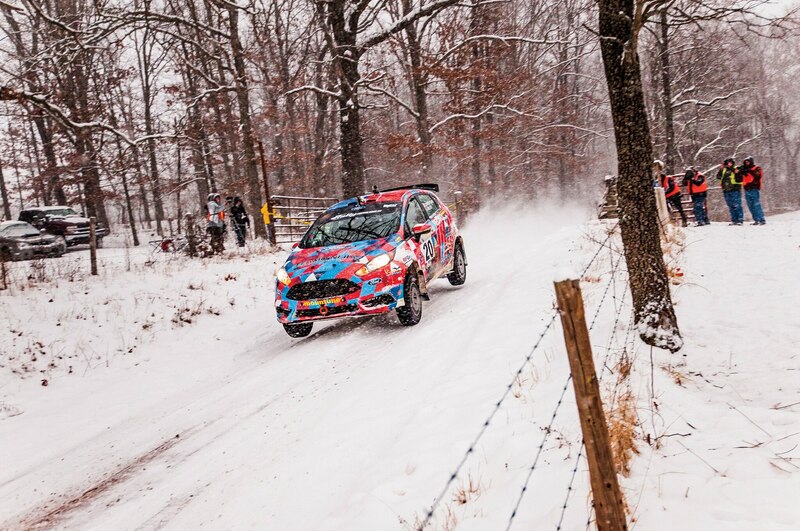 The weather neuters the second day: Snow—as well as a postal worker who drove onto one of the active stage roads—has delayed the rally, and organizers cancel the last few stages. 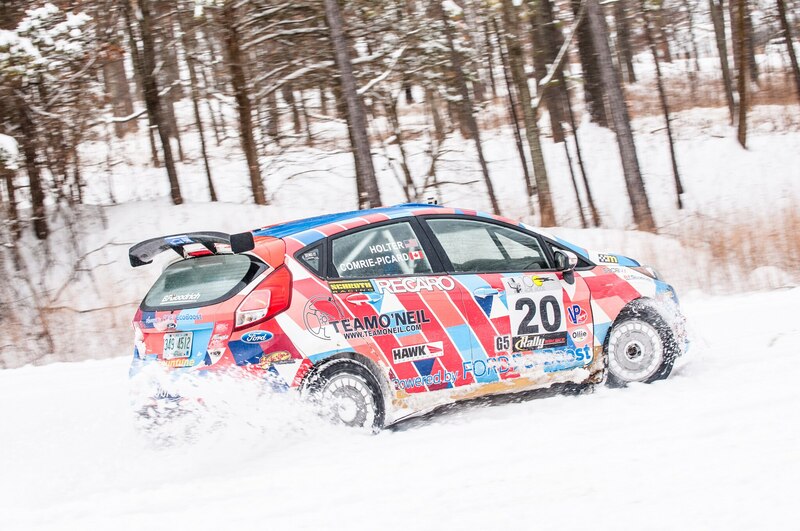 It’s a bummer, both for us and for ACP and Holter, who were working hard to make back time after breaking a tie rod. 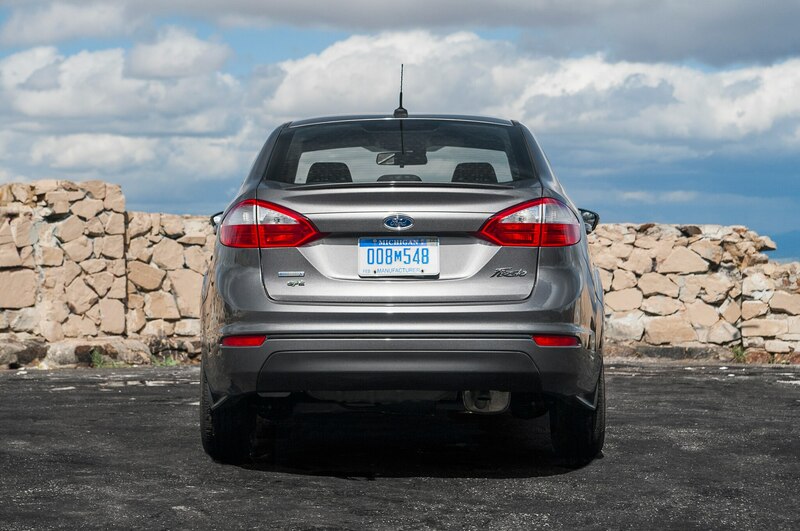 To cheer ourselves up, we all stop at SayersBrook Bison Ranch on the way out of town. 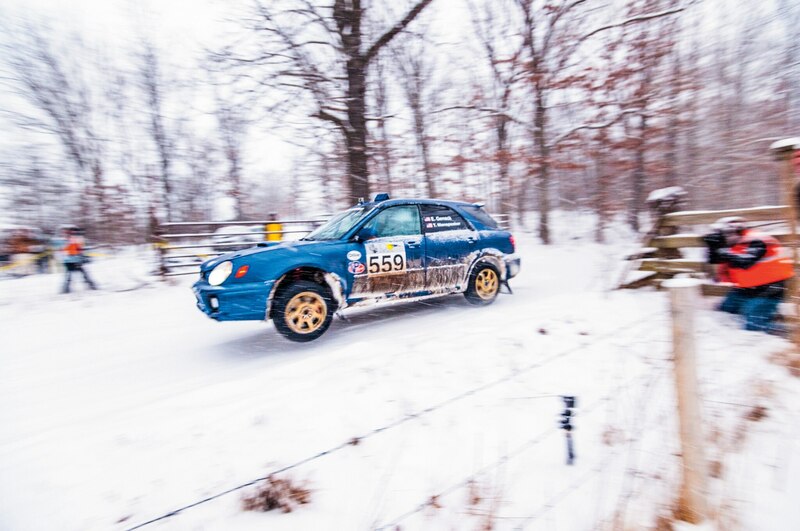 Skip, its owner, lets rally teams conduct shakedowns on his roads. 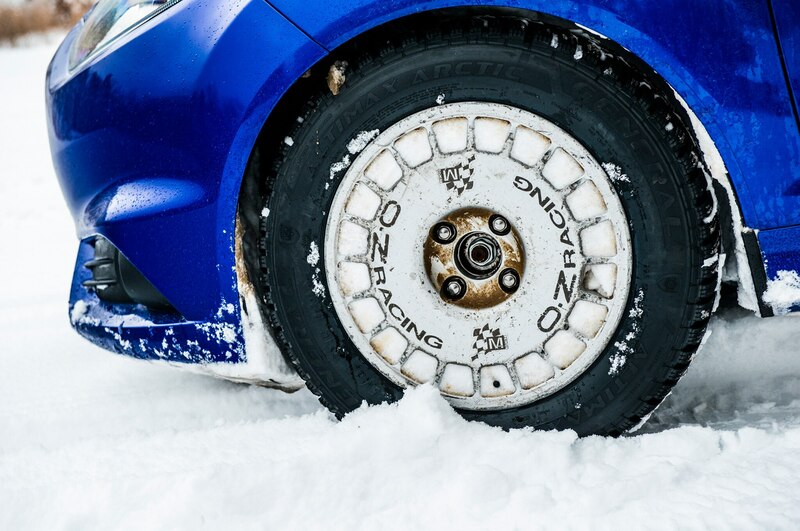 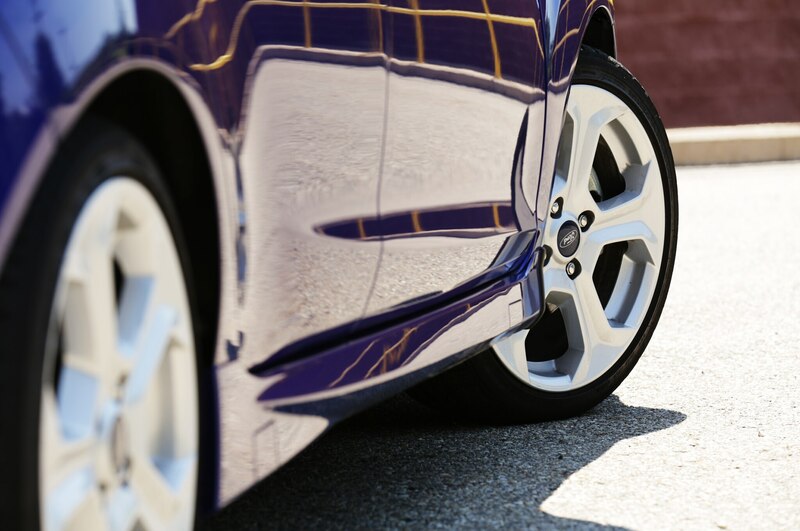 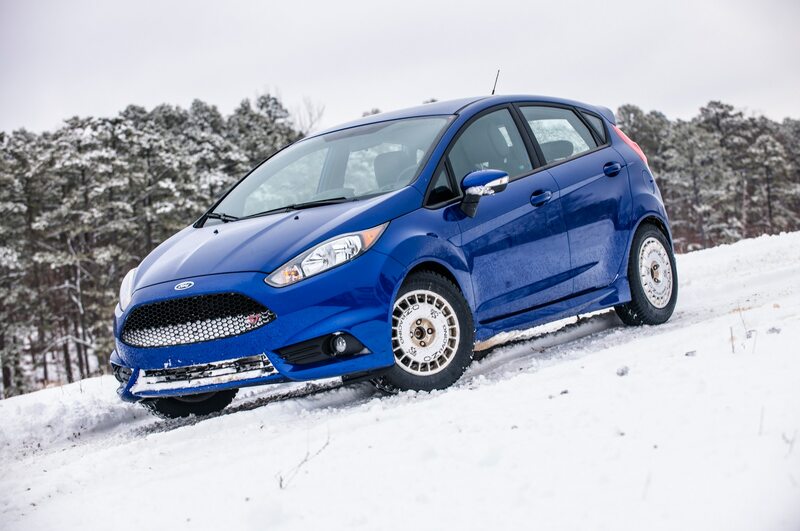 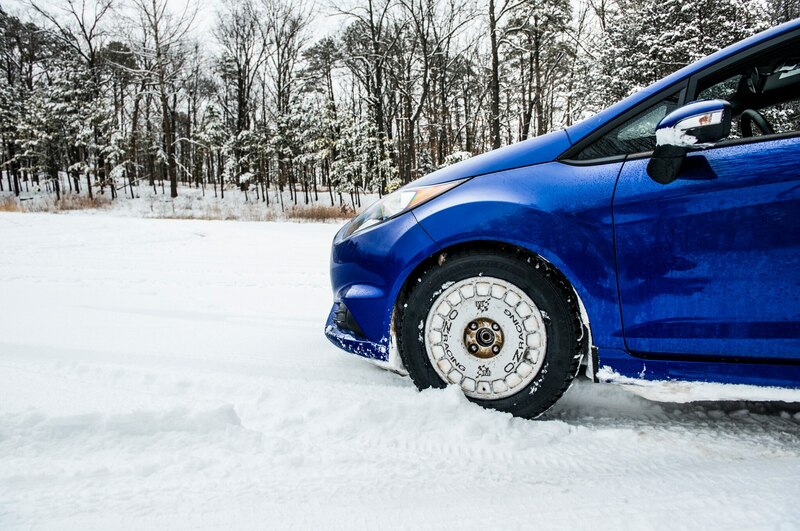 ACP challenges us to keep up with his rally-spec Fiesta ST, giving us a better shot by fitting our car with 15-inch rally-spec wheels wrapped in skinny tires with fat sidewalls. 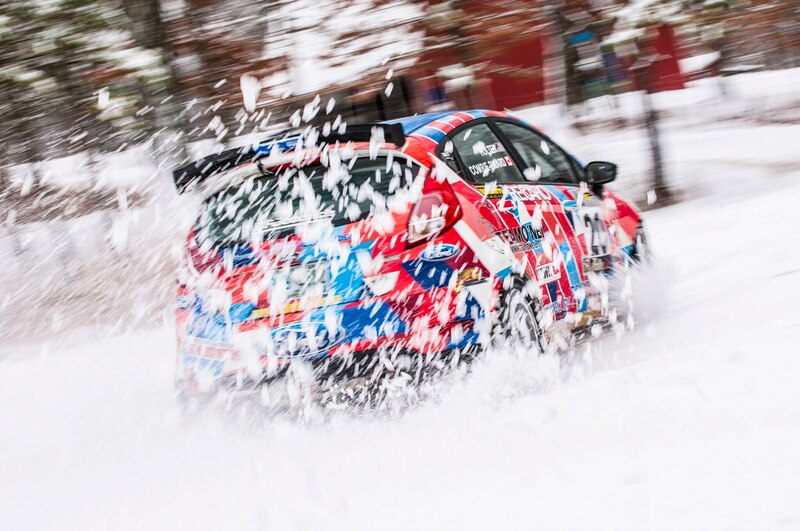 ACP’s machine fires up and takes off, spitting gravel at us as it does. 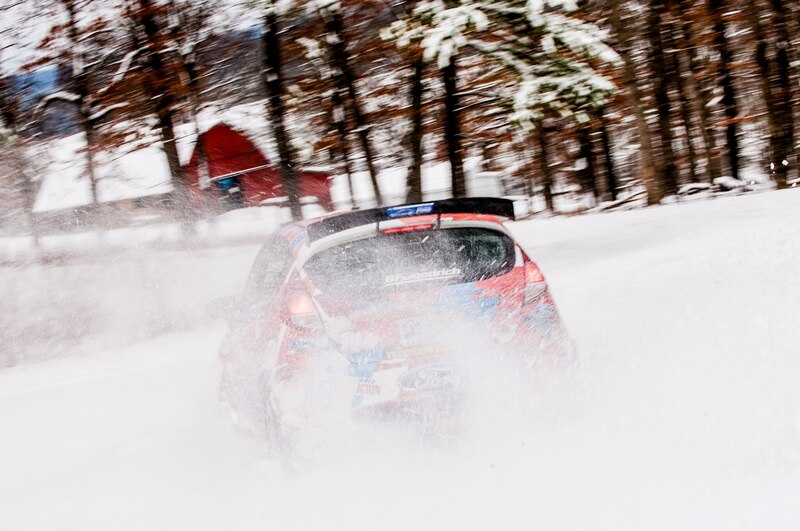 We dump the clutch, give chase, and remarkably close the gap. 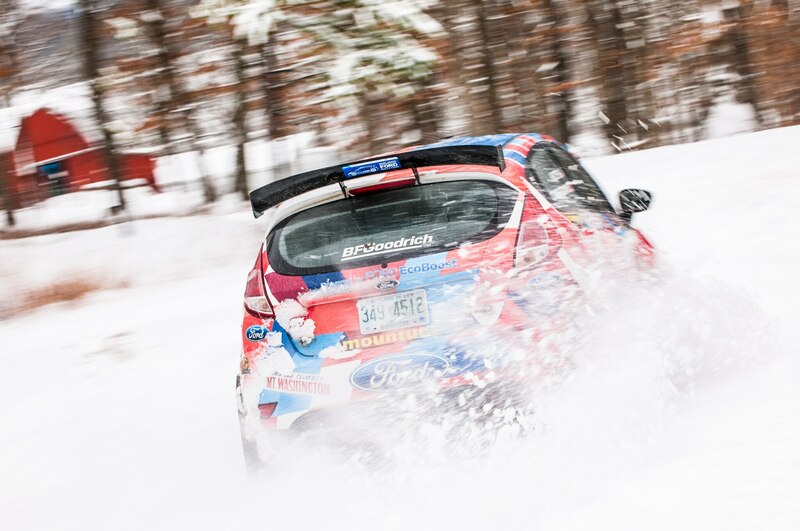 A rooster tail of snow and red dirt rains from the No. 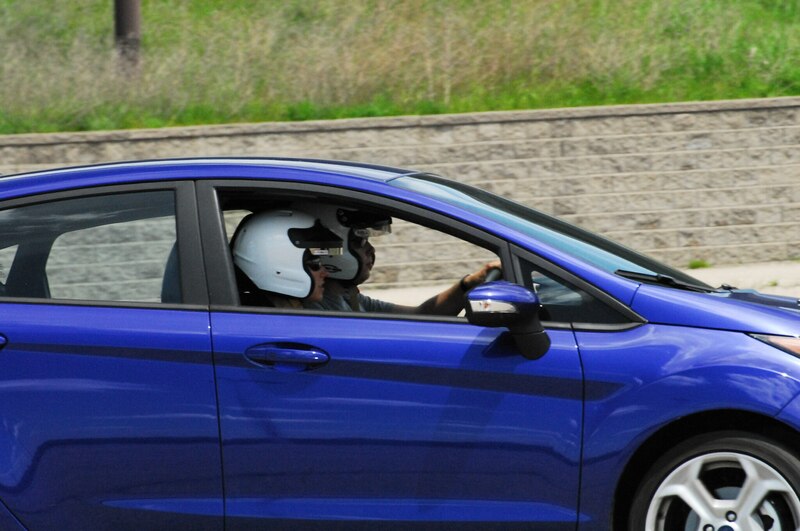 20 ST as ACP tosses the car into a long turn, and we slide behind him, inches from his rear bumper. 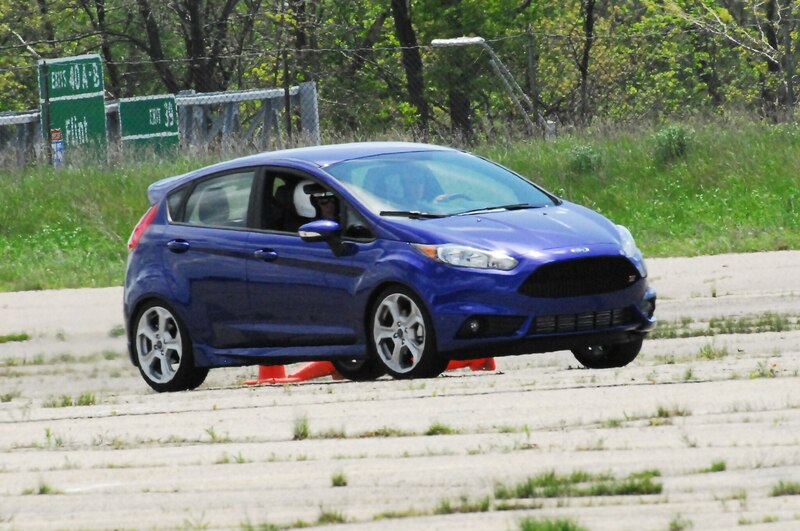 ACP goes flat out toward a cattle grate, uses it as a ramp, and gets all four wheels in the air. 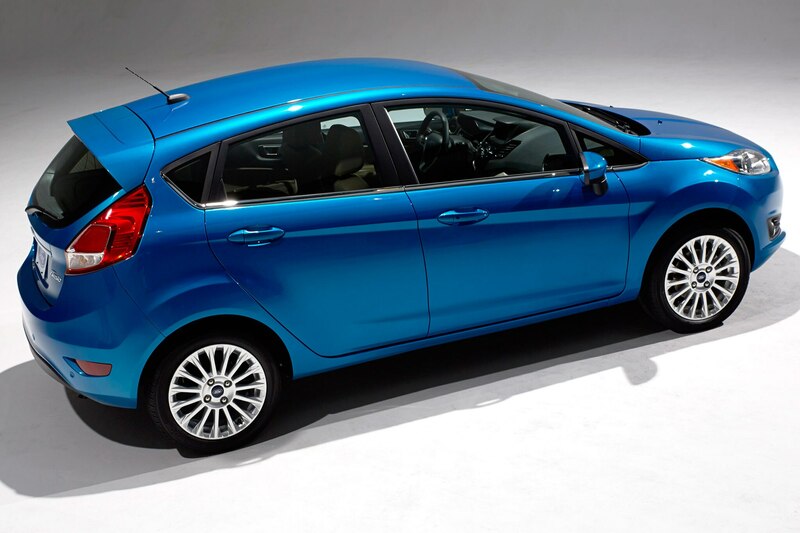 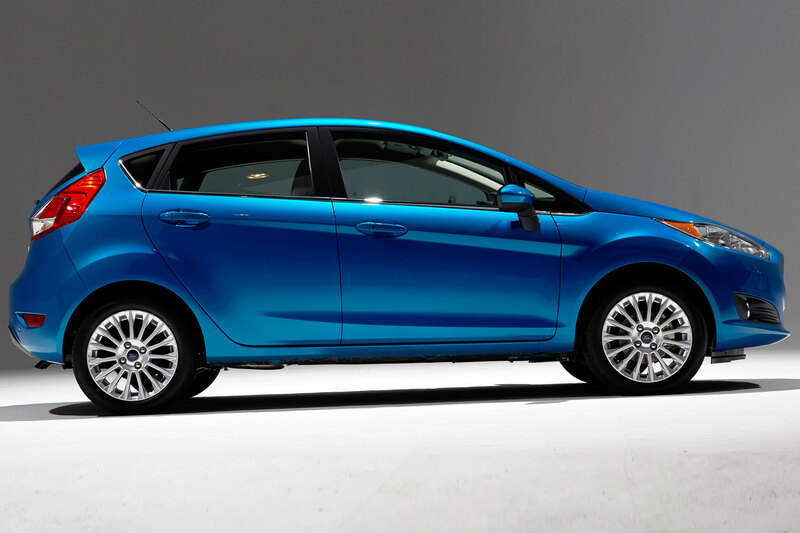 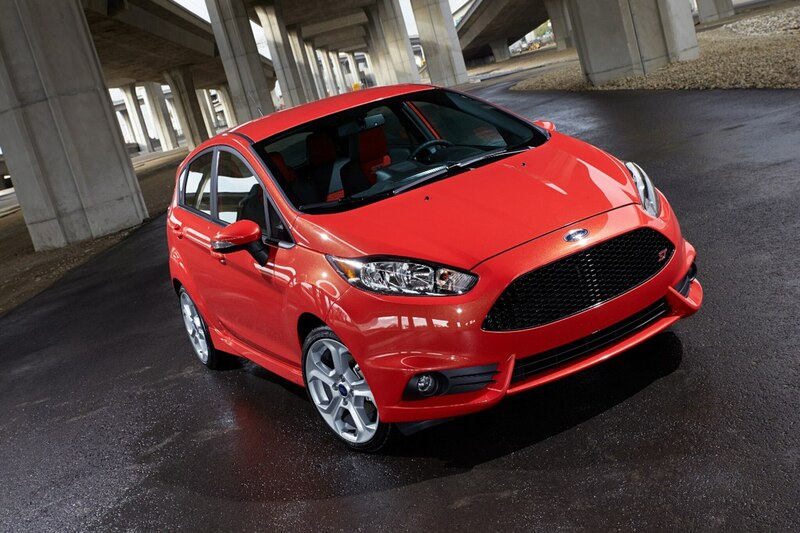 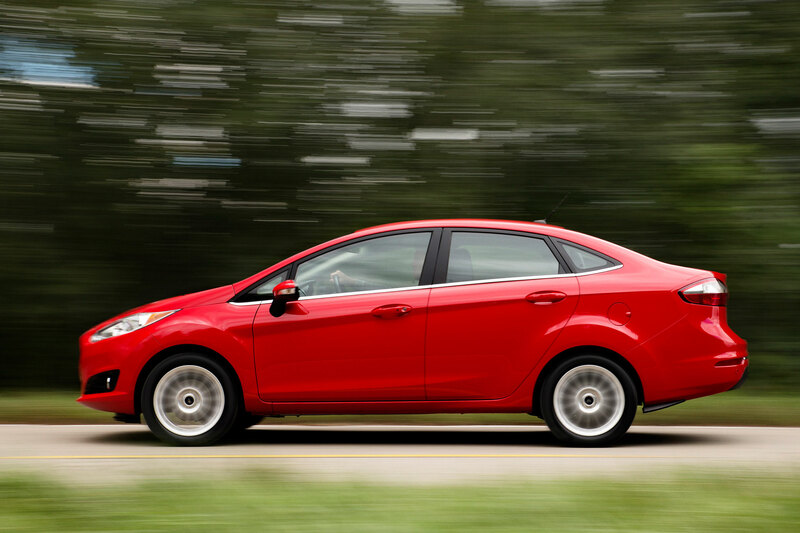 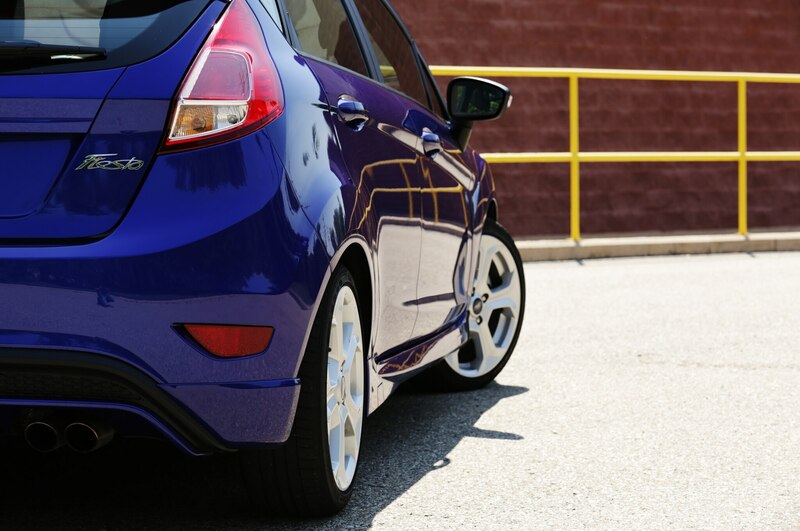 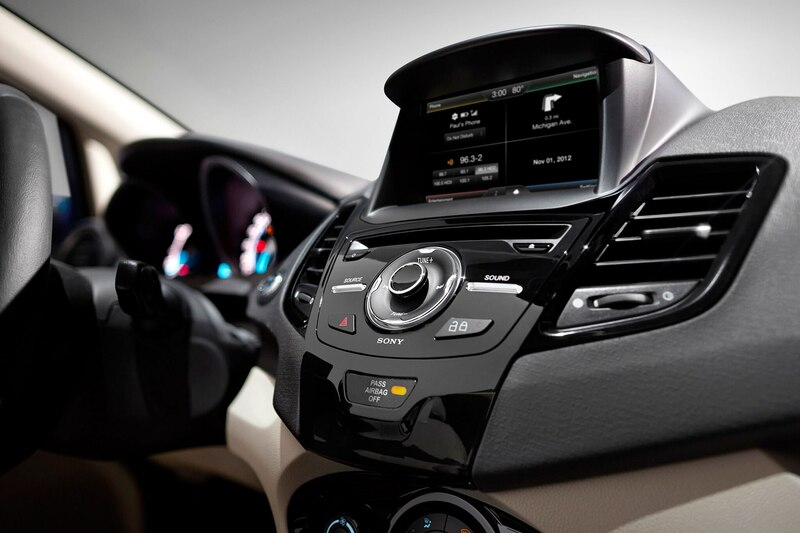 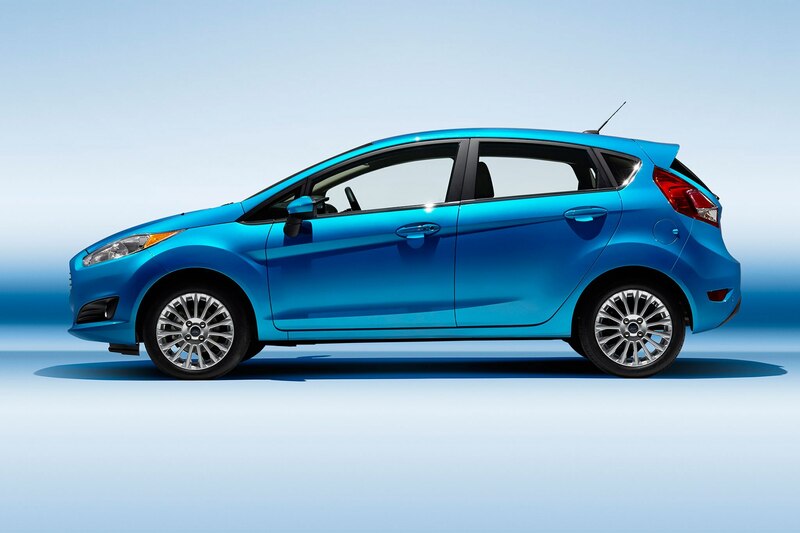 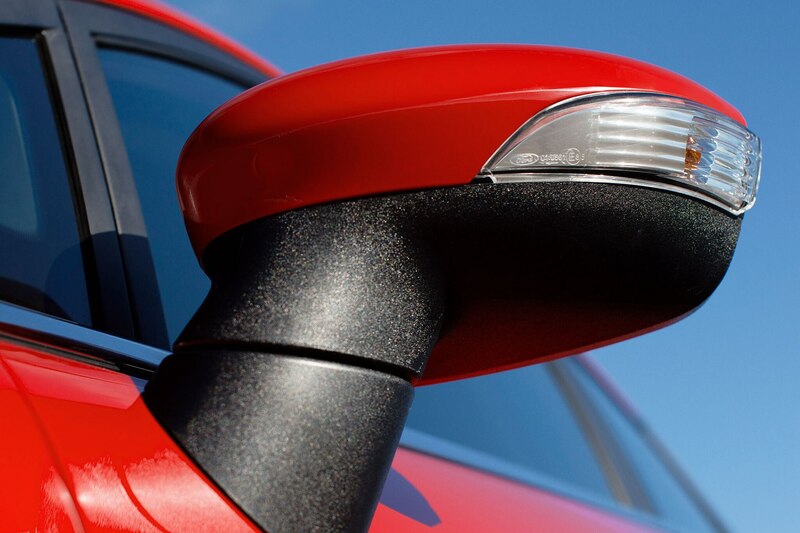 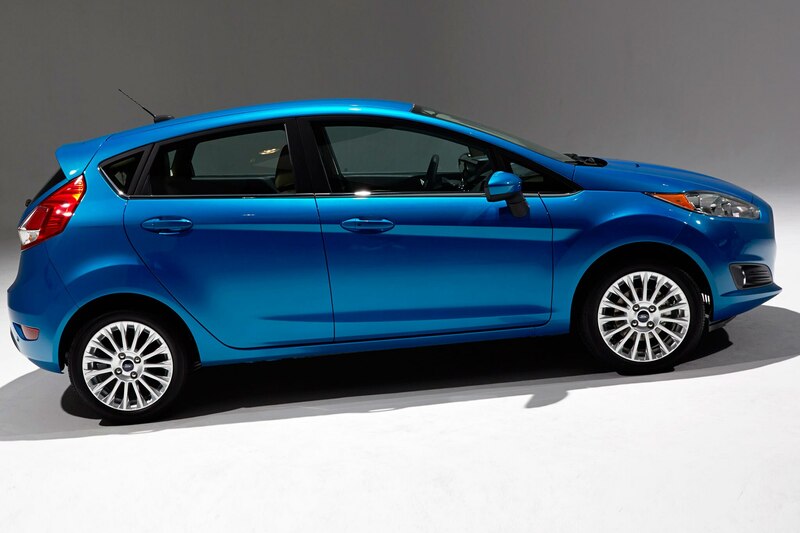 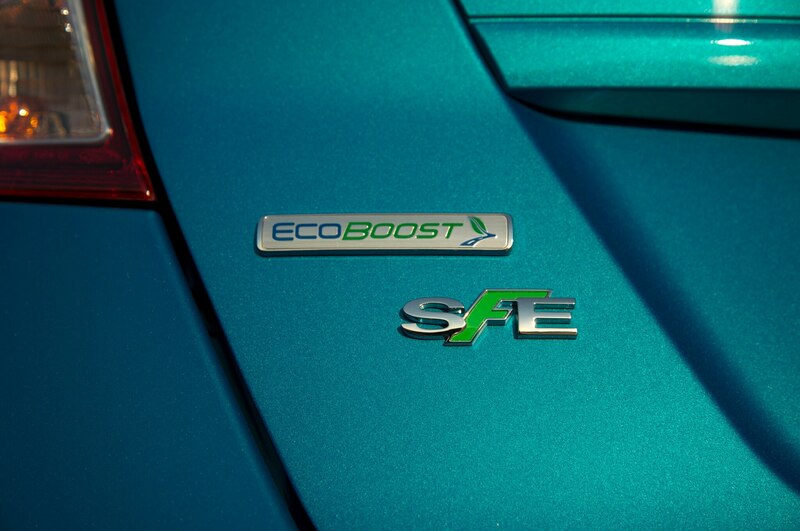 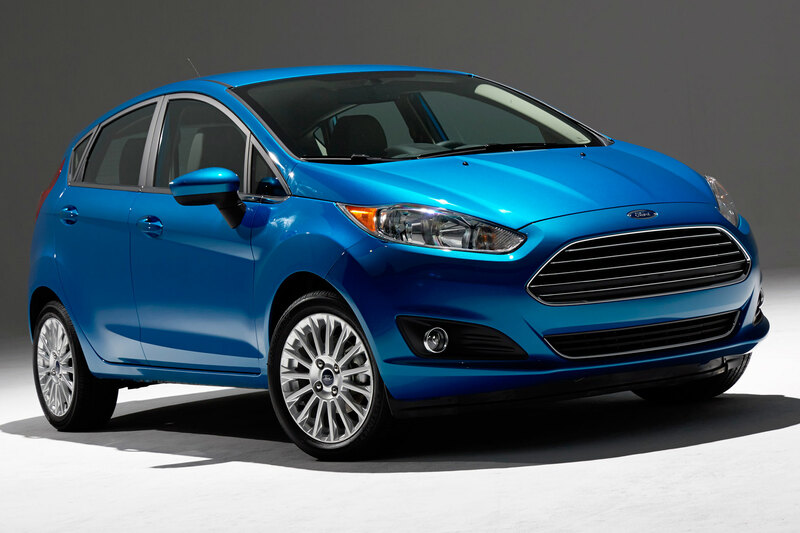 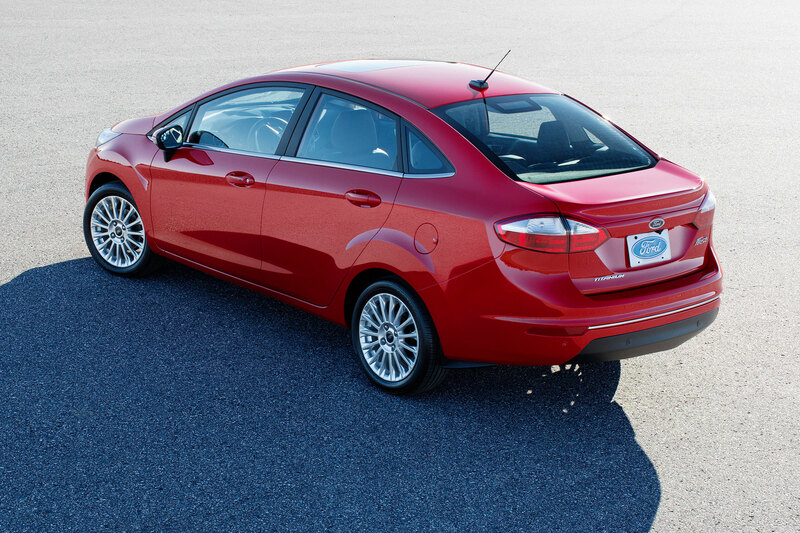 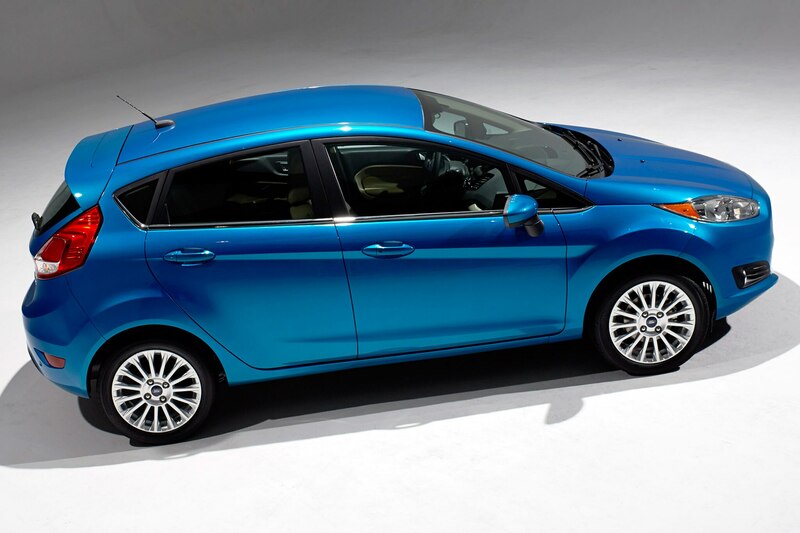 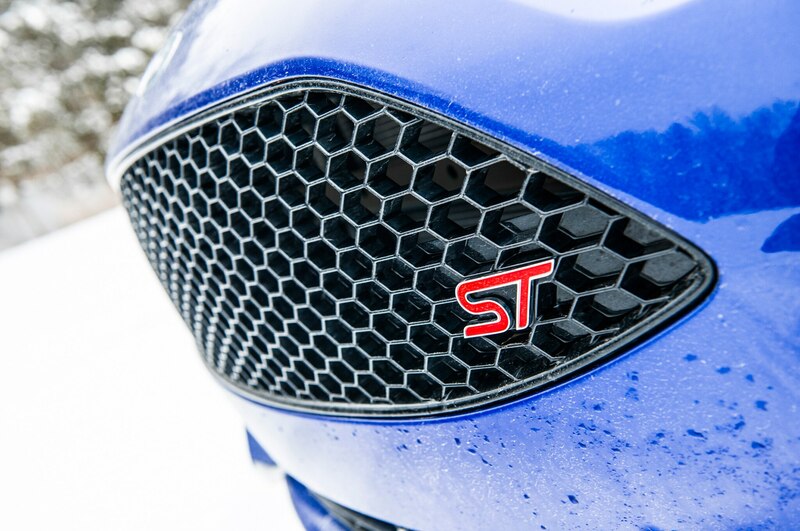 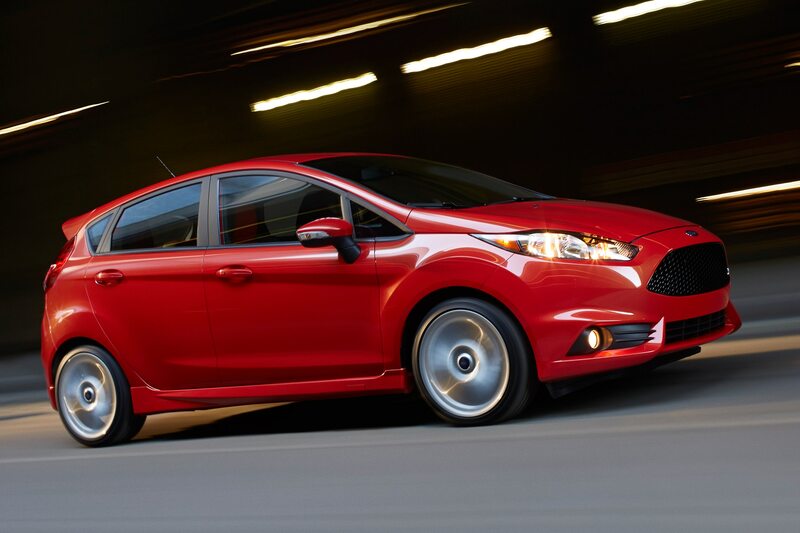 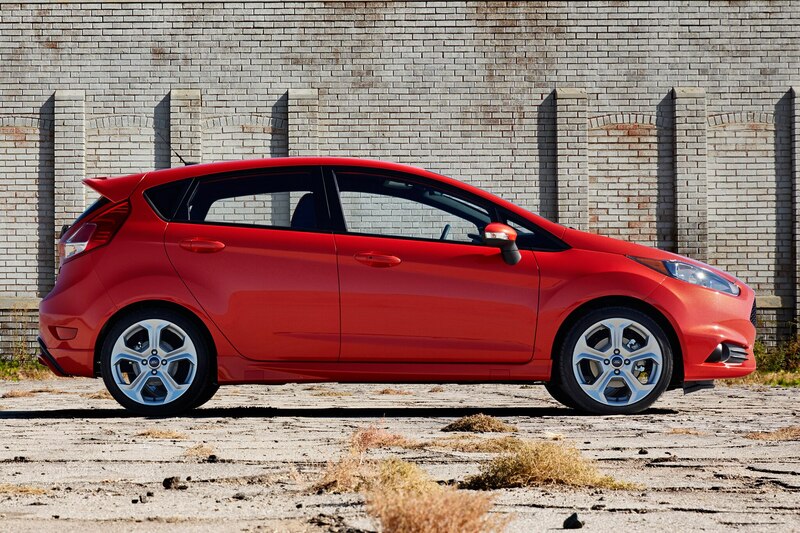 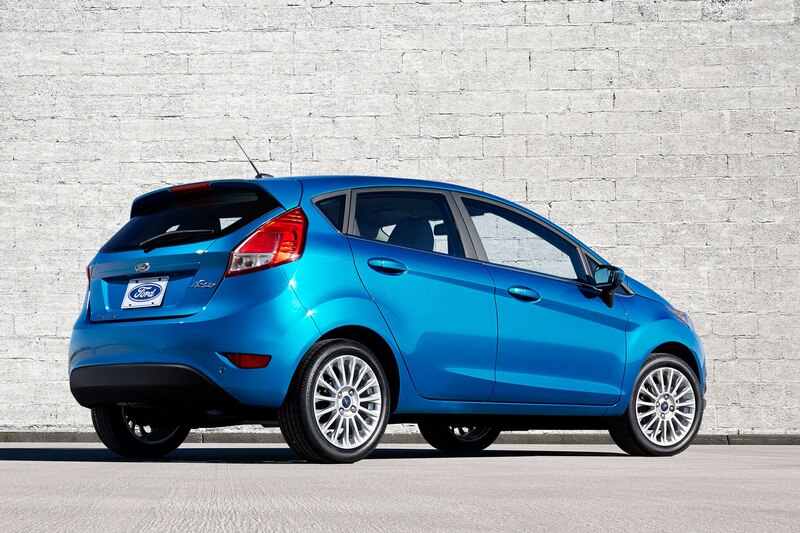 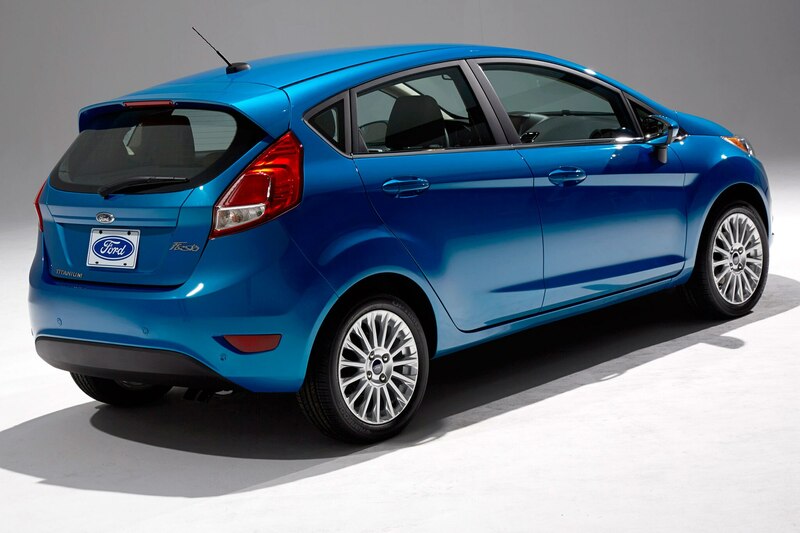 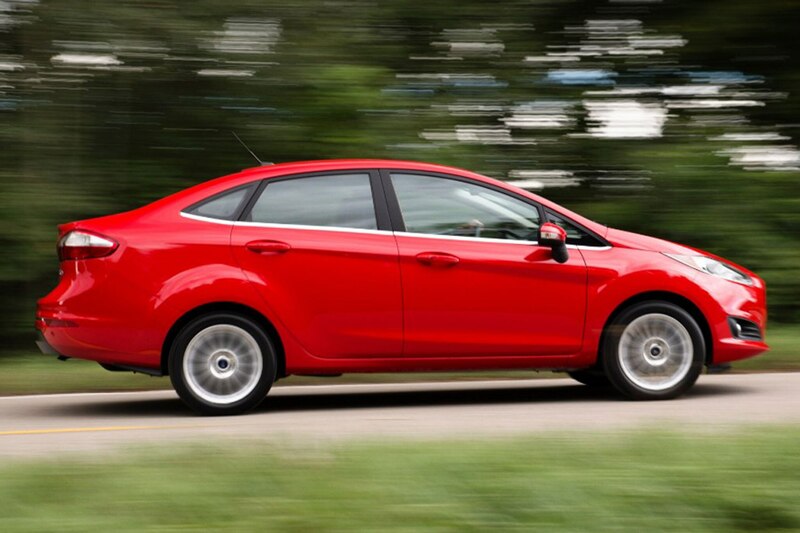 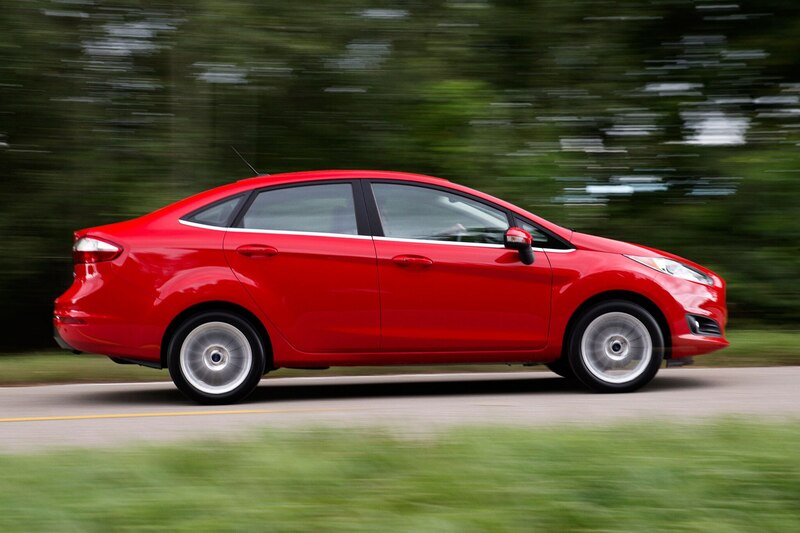 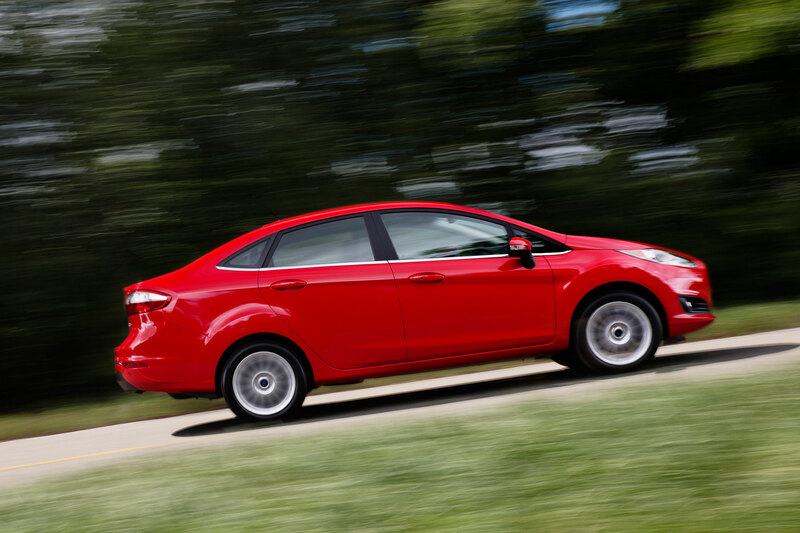 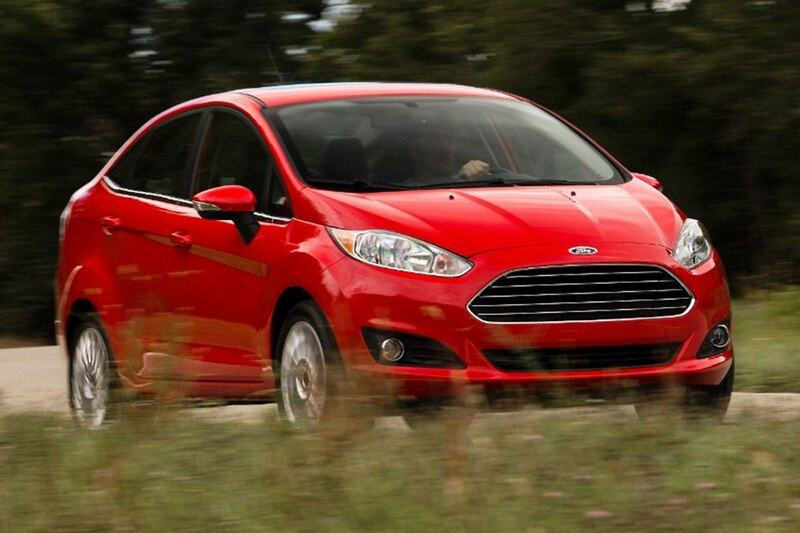 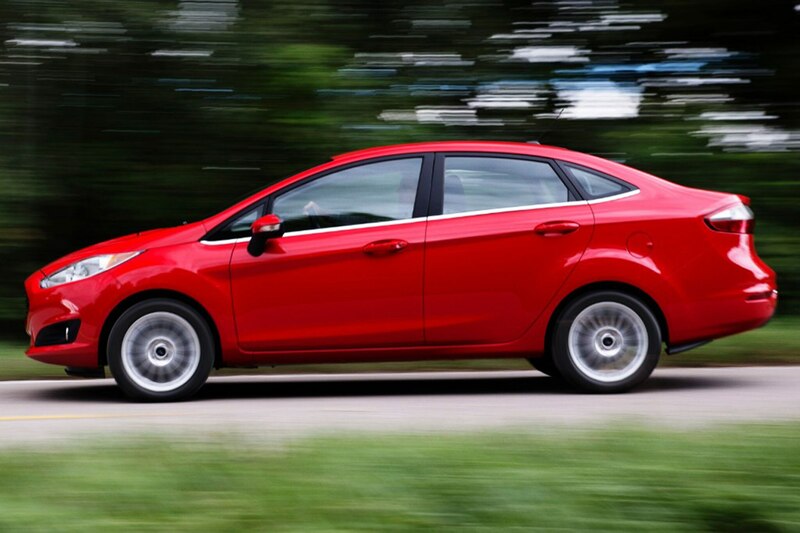 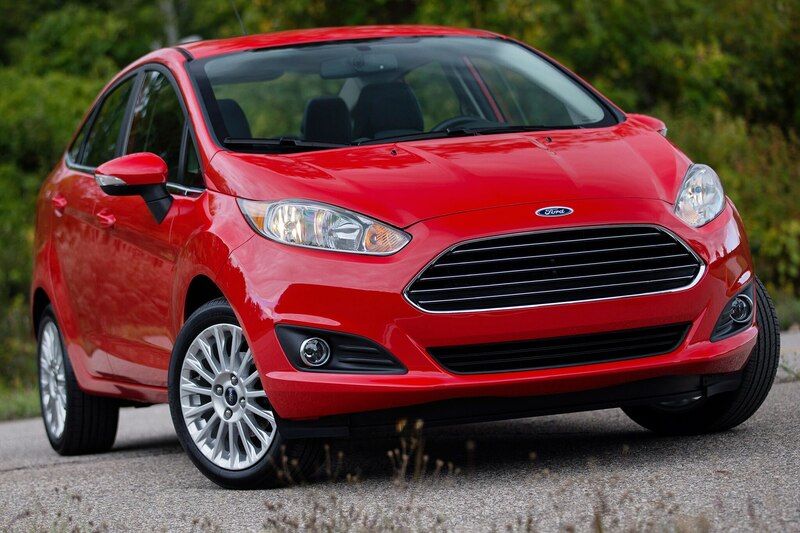 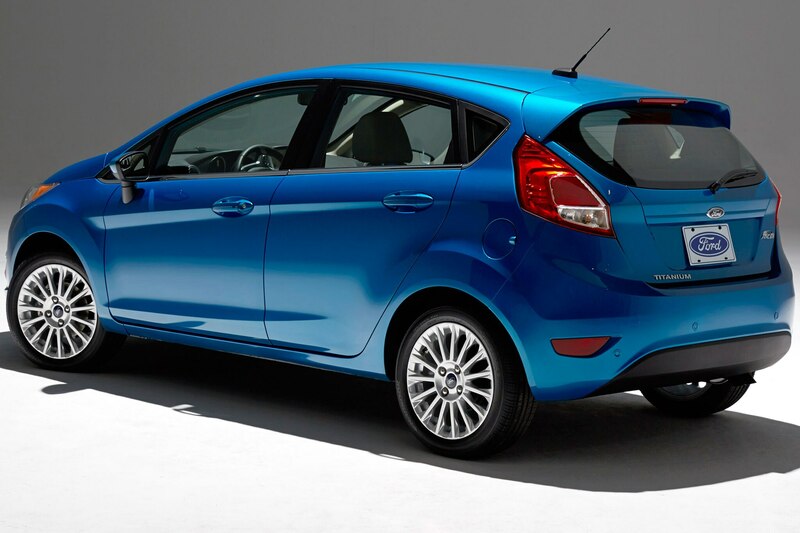 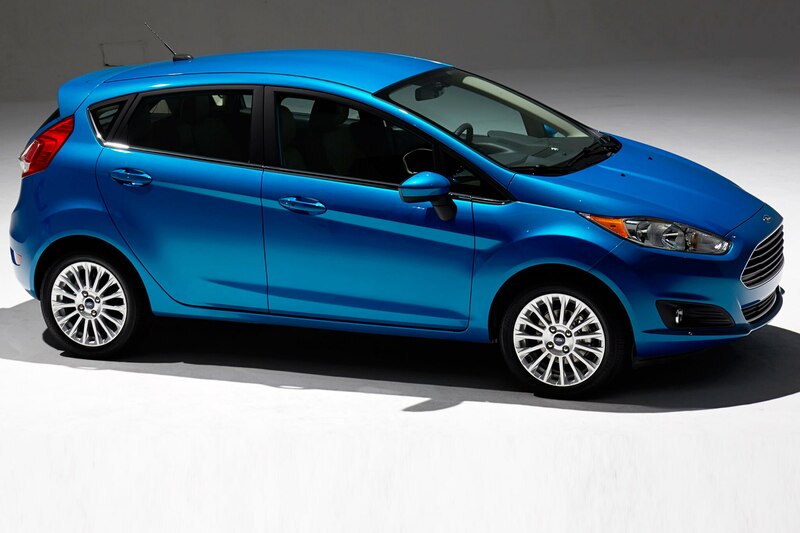 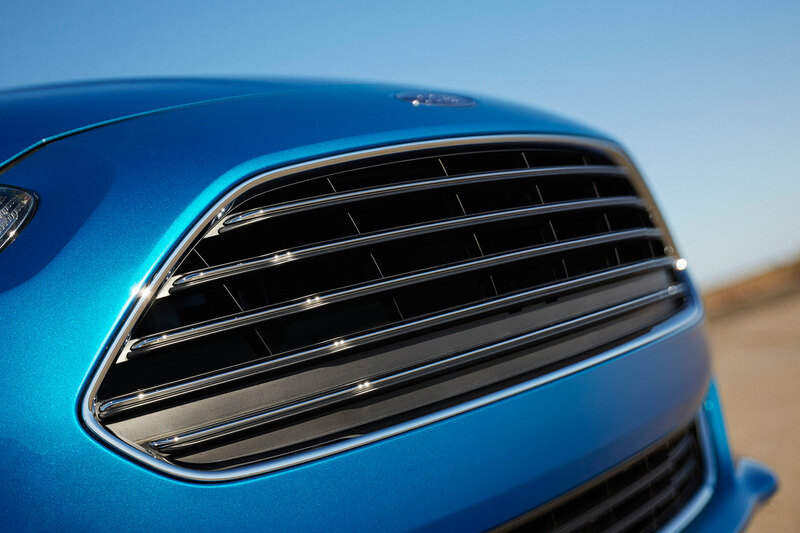 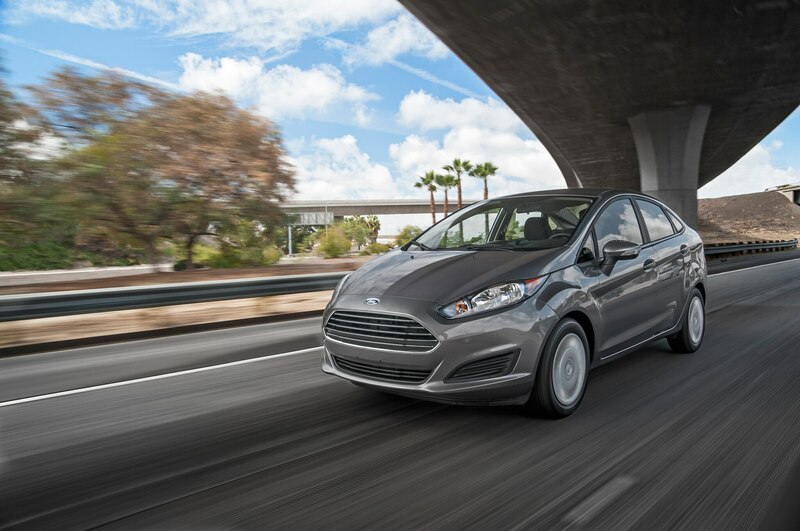 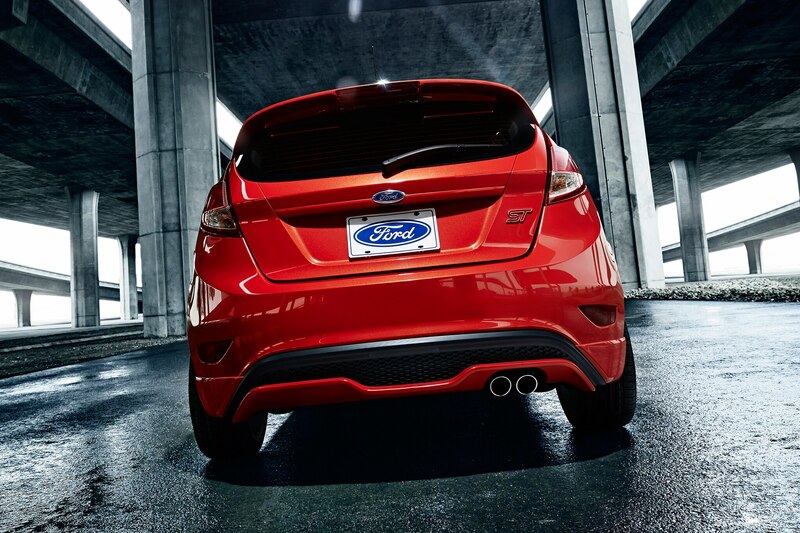 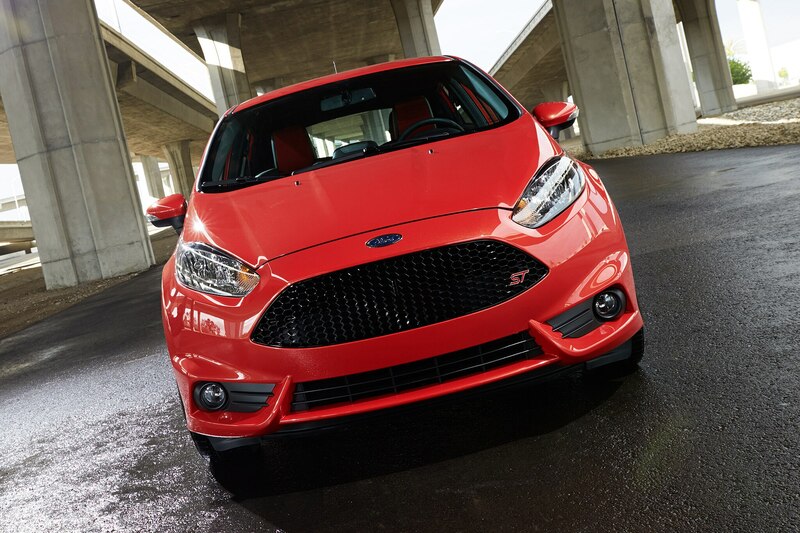 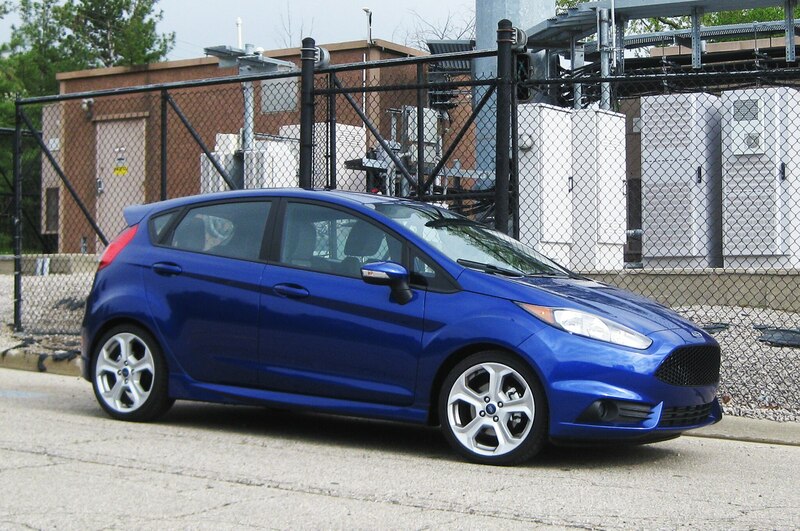 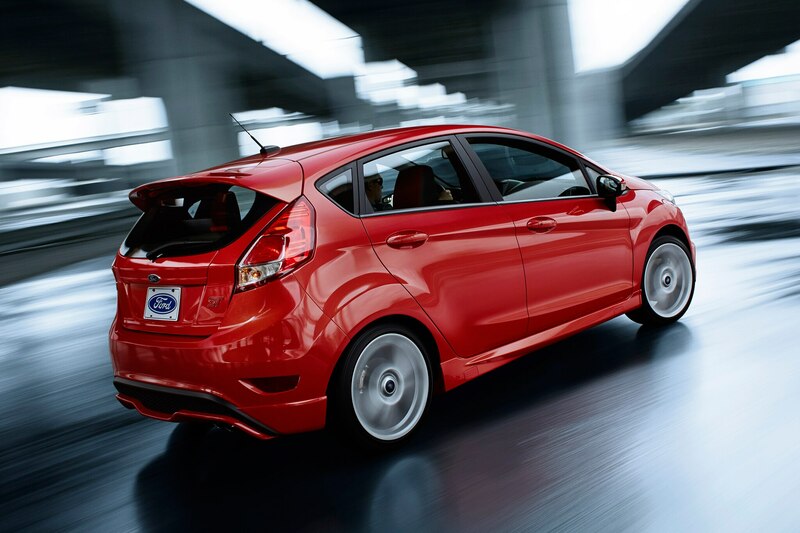 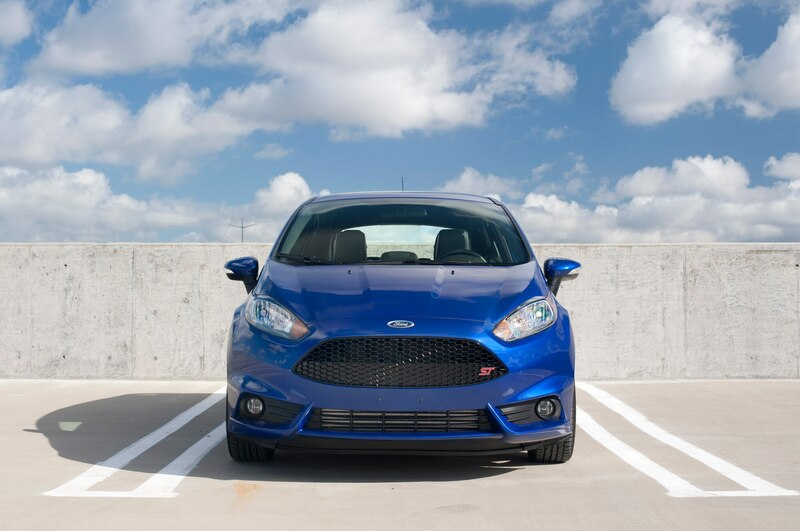 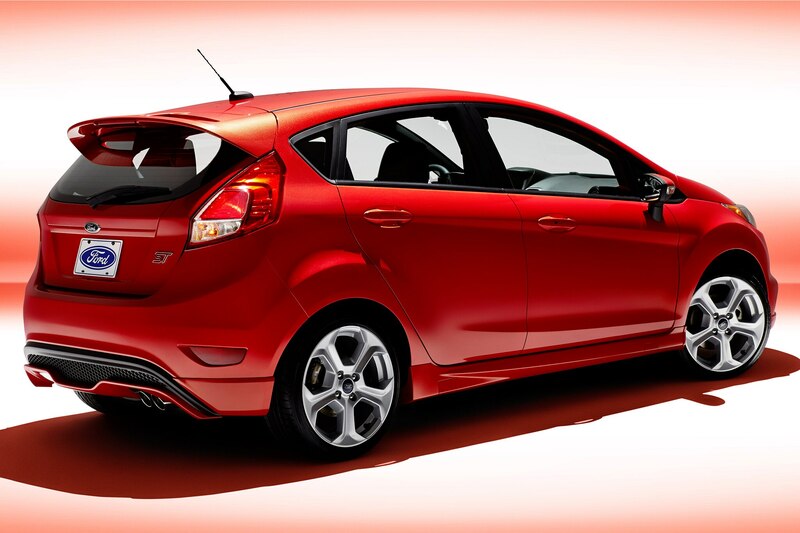 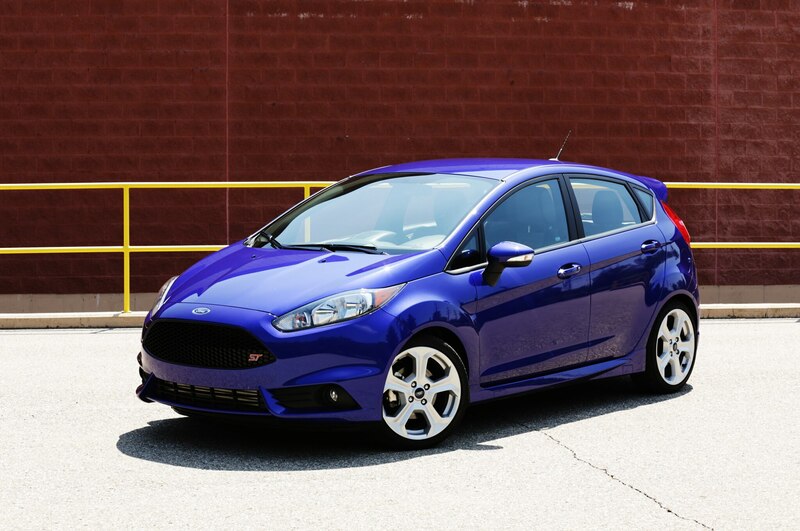 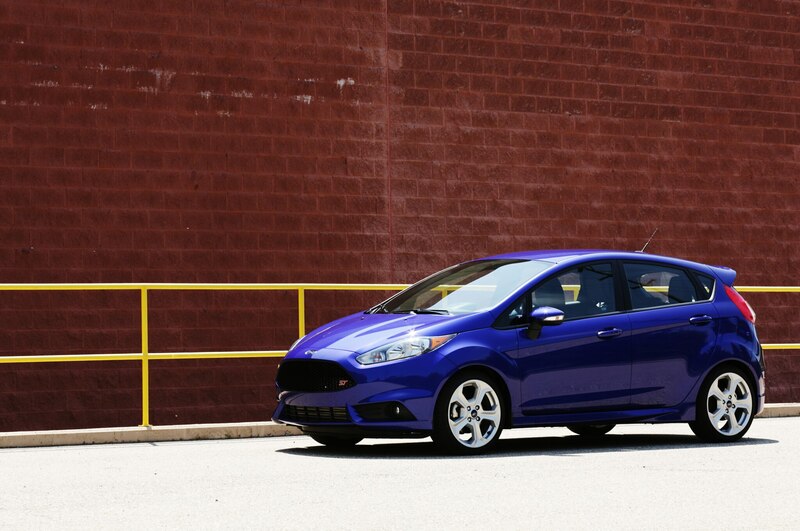 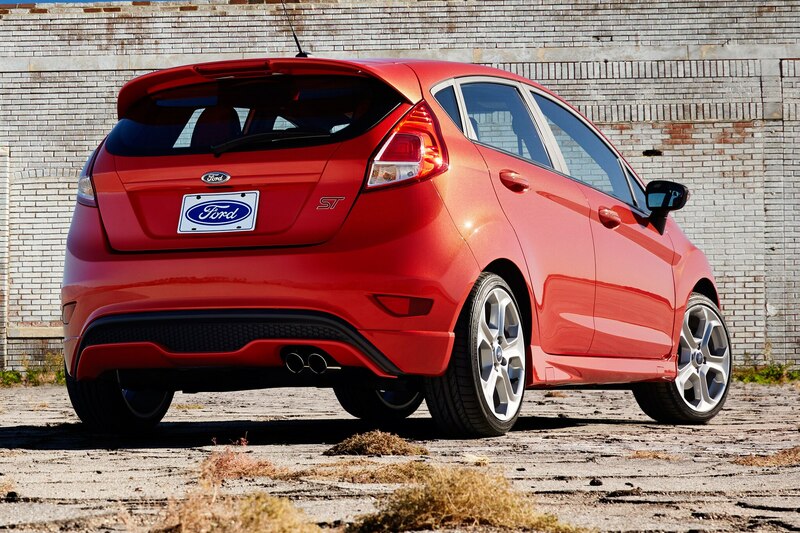 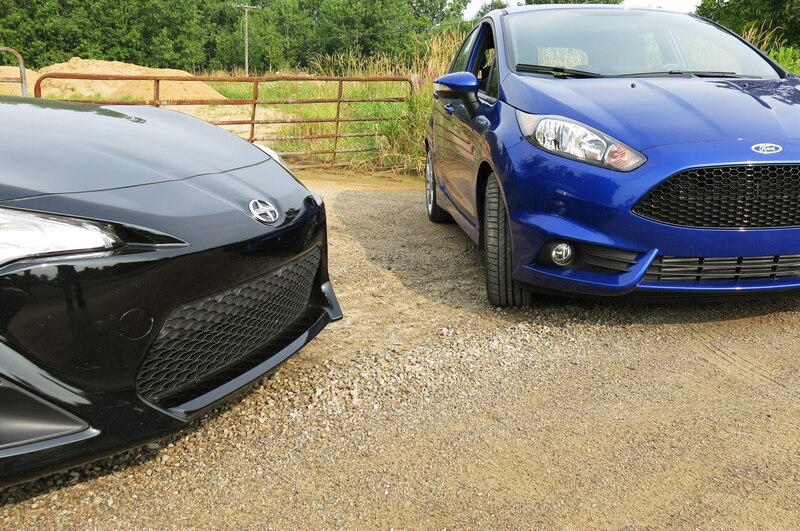 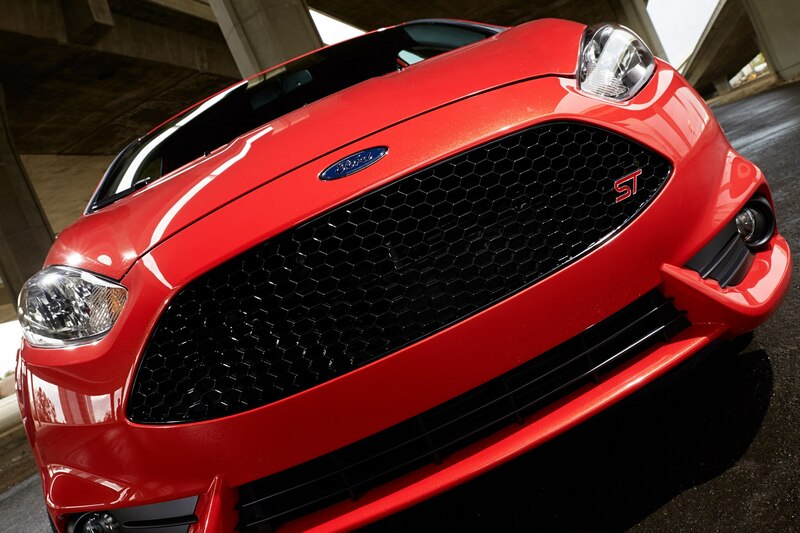 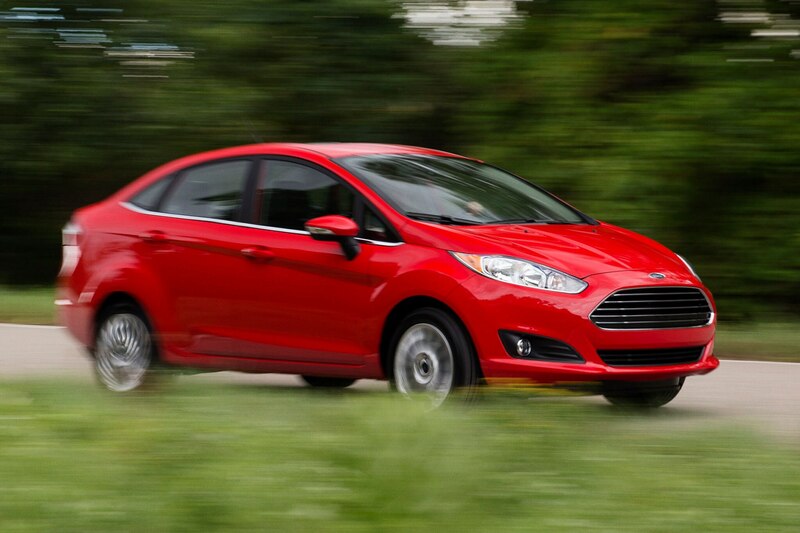 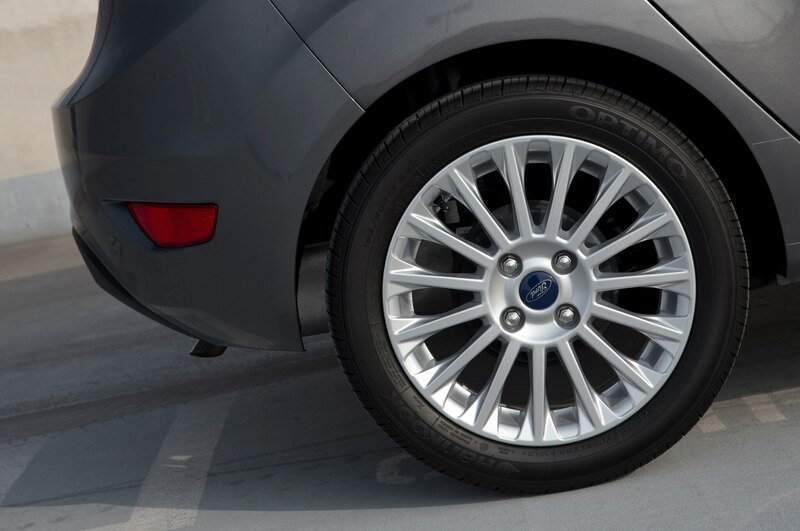 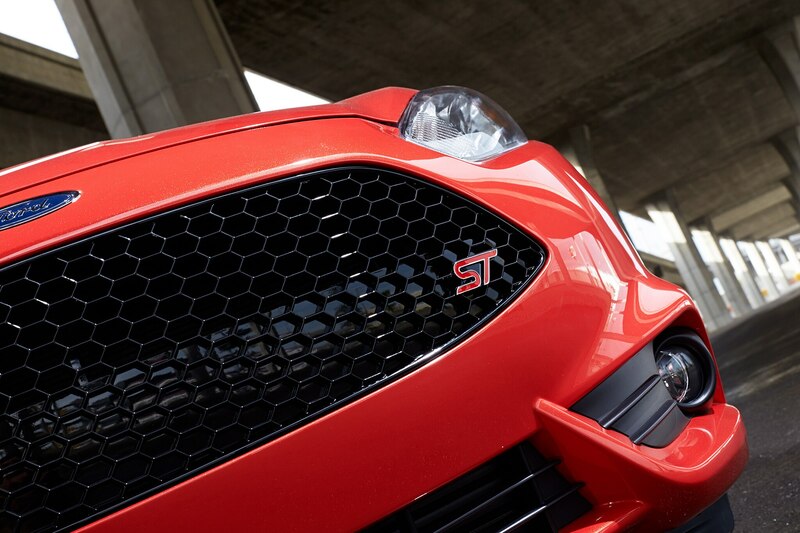 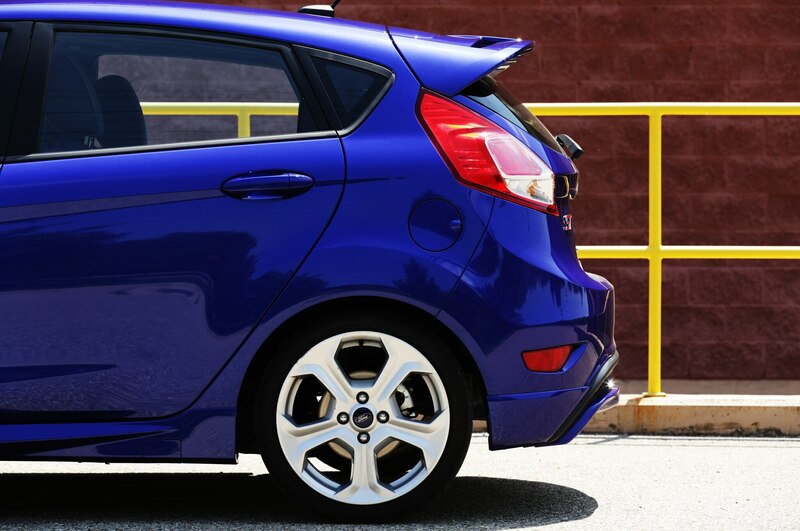 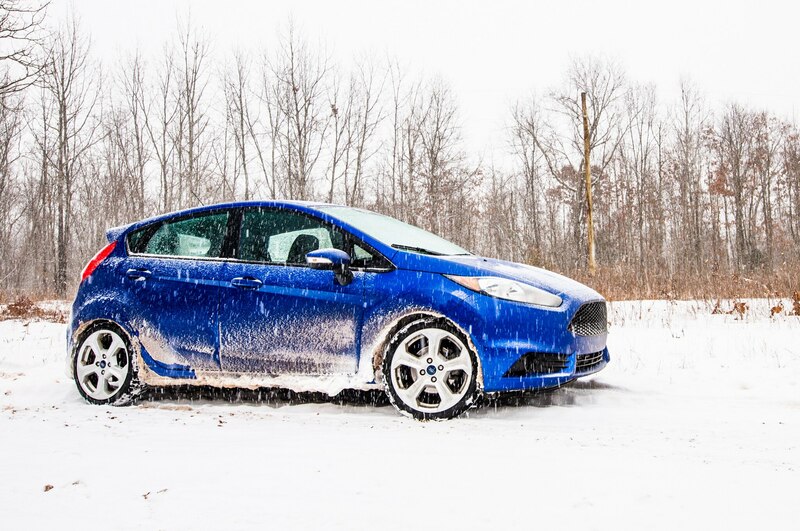 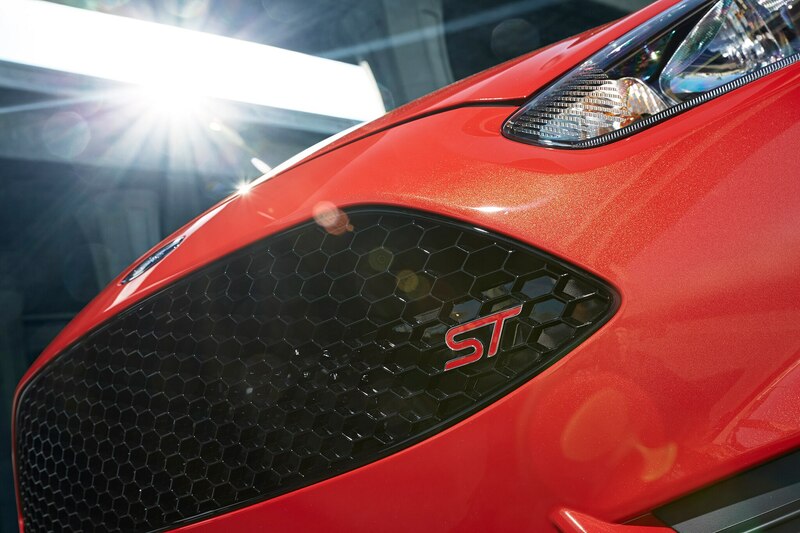 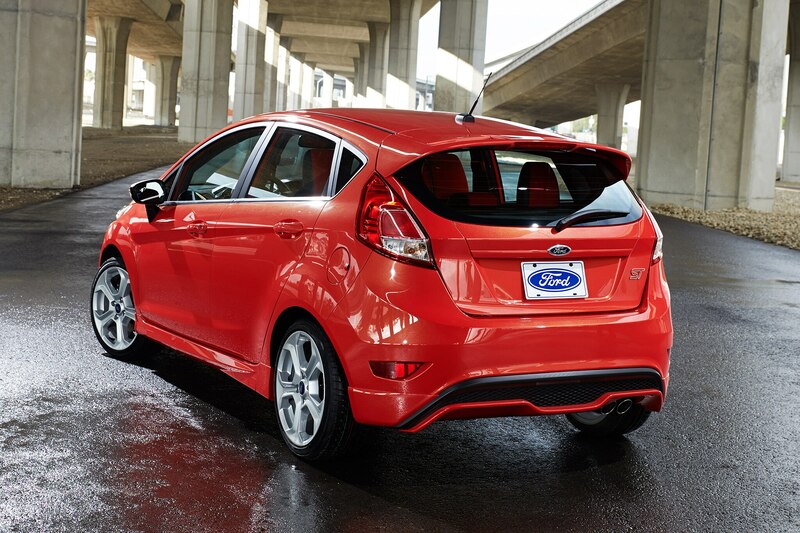 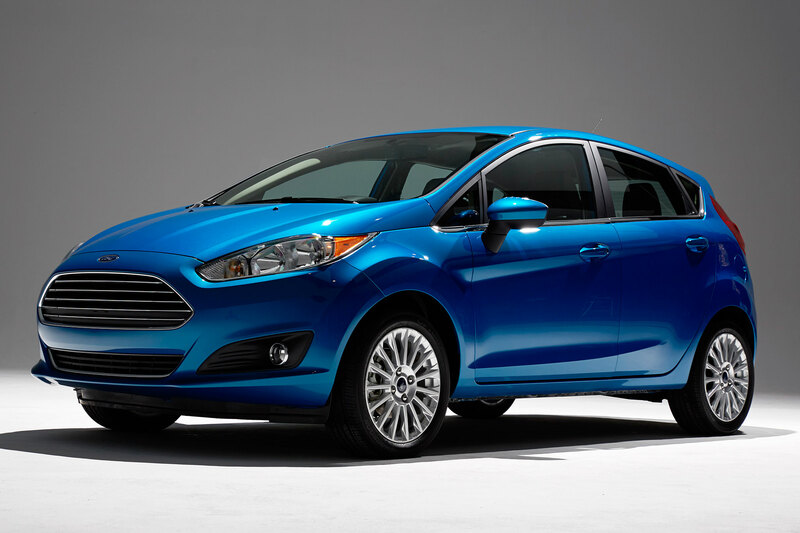 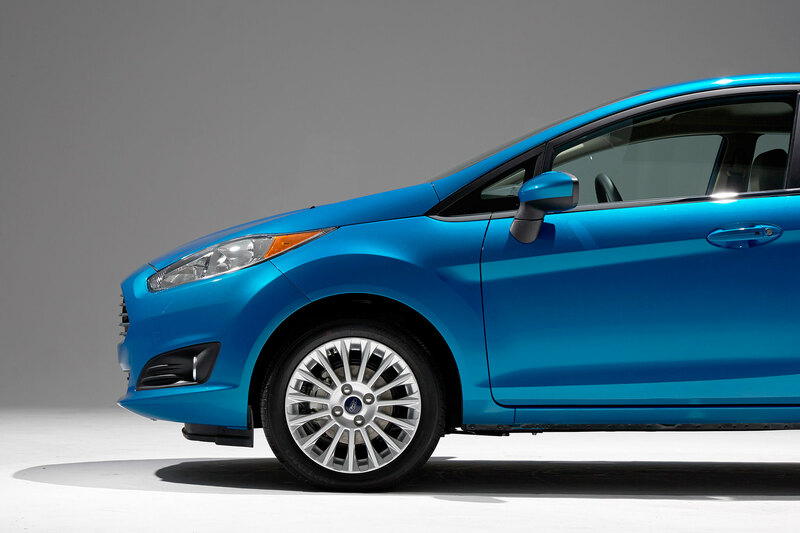 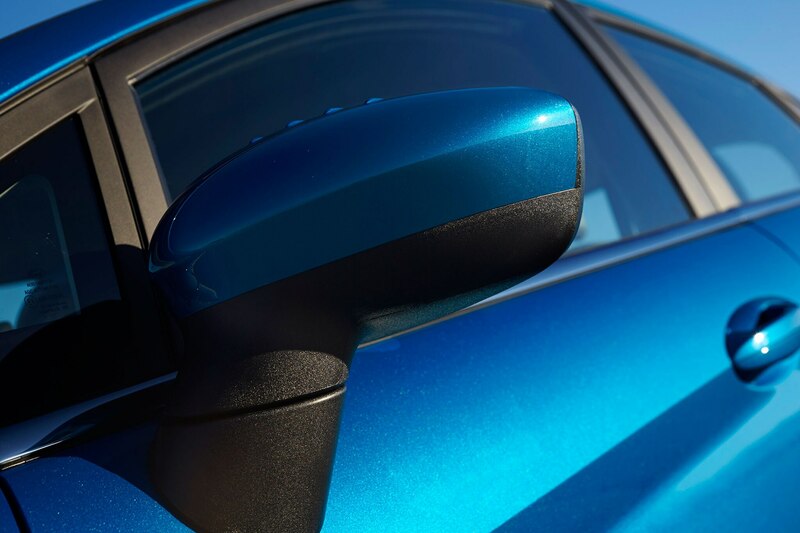 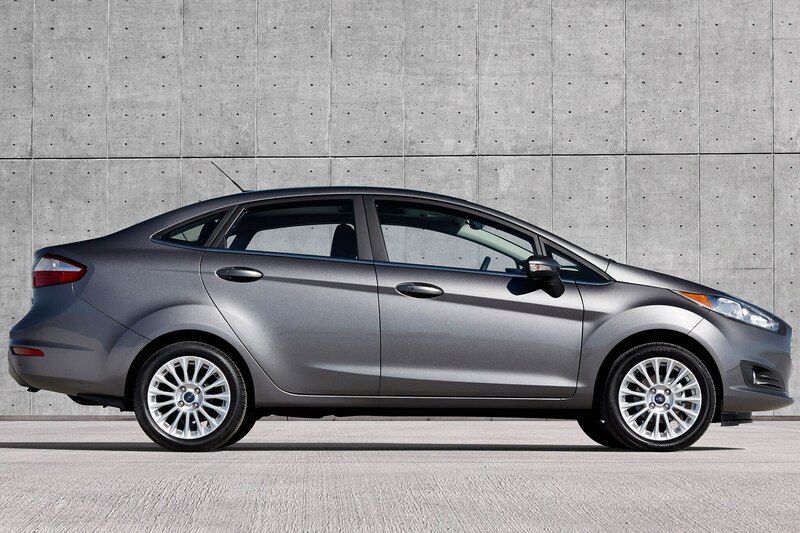 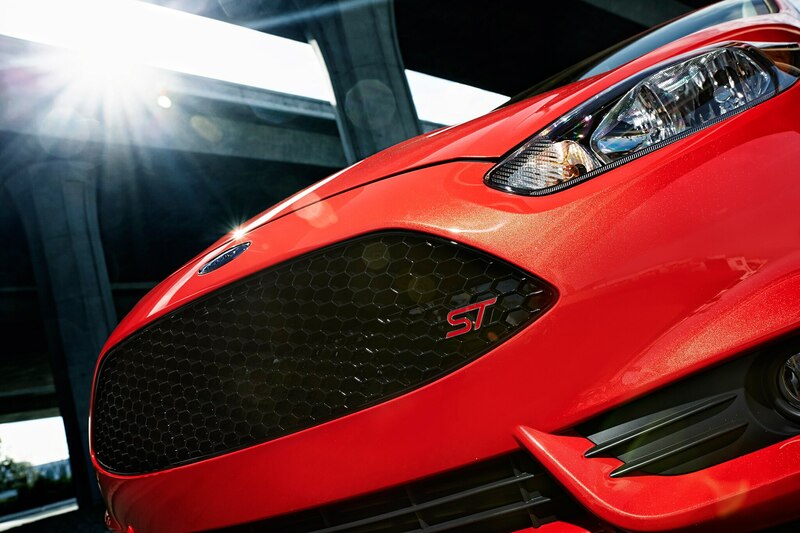 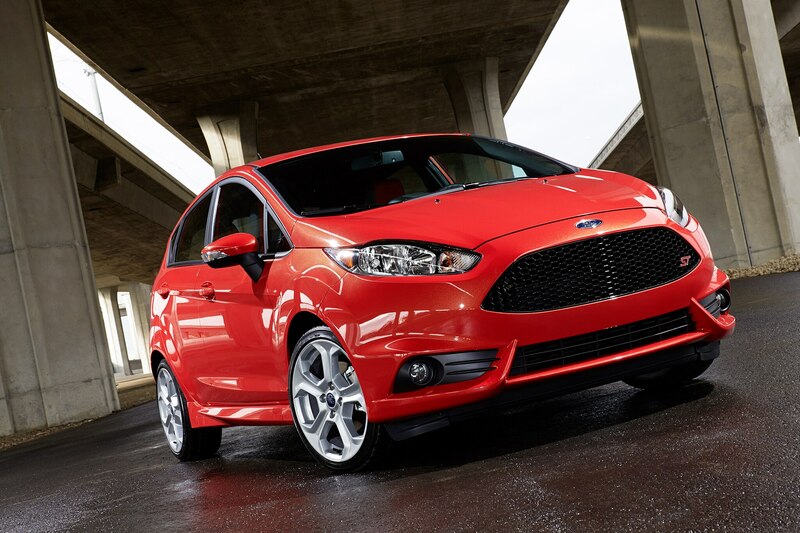 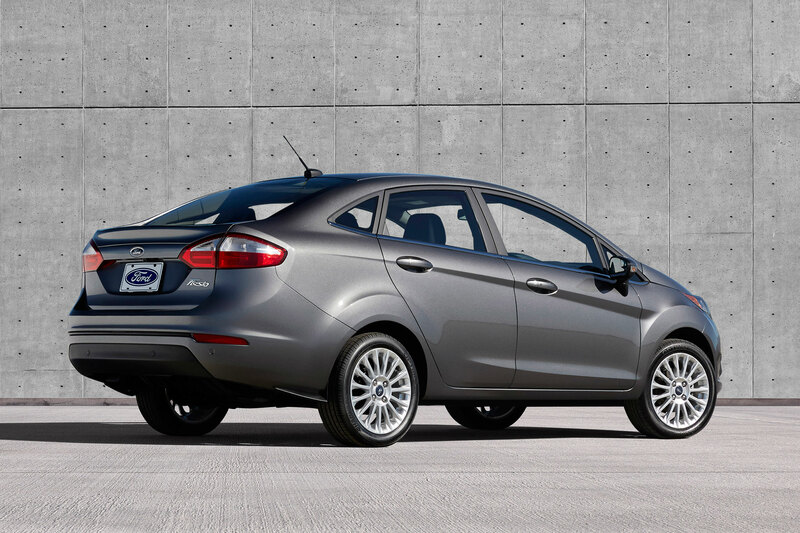 We shouldn’t, but the Fiesta ST’s snapping point remains elusive. 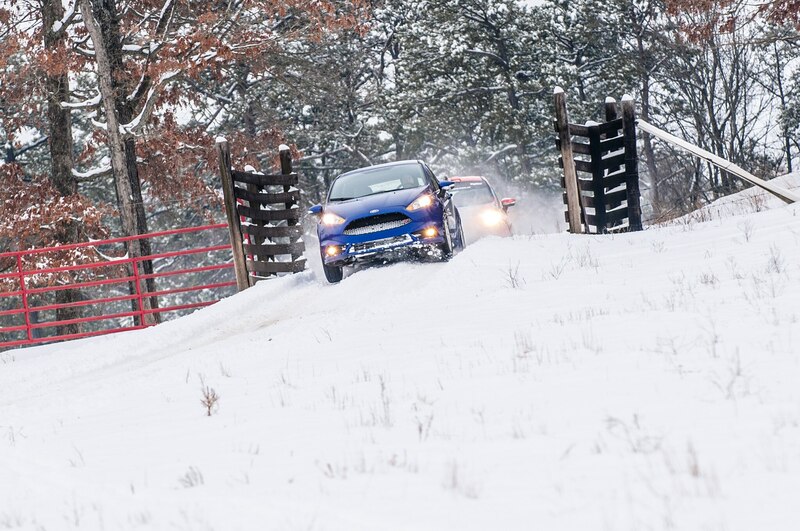 We hit the grate hard and fly for a second before slamming onto the snowy ground, all four tires scraping against the fender wells. 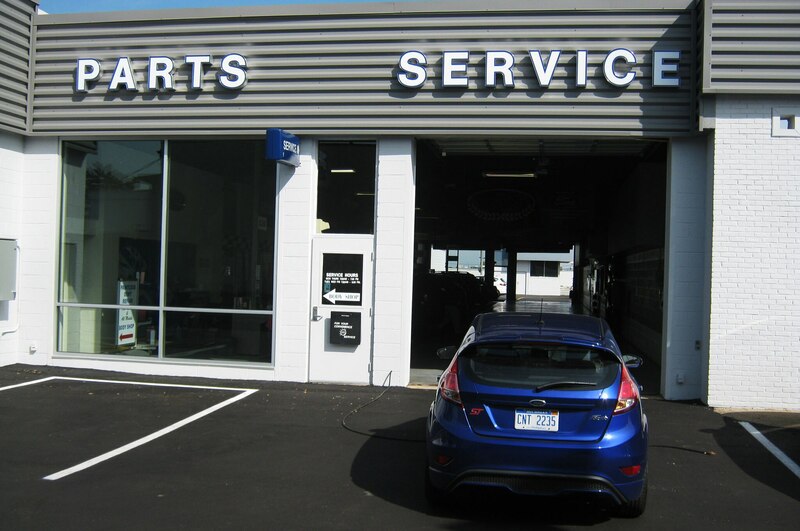 We get out, expecting to see oil and antifreeze spitting every which way, but the only damage is a dislodged underbody spoiler. 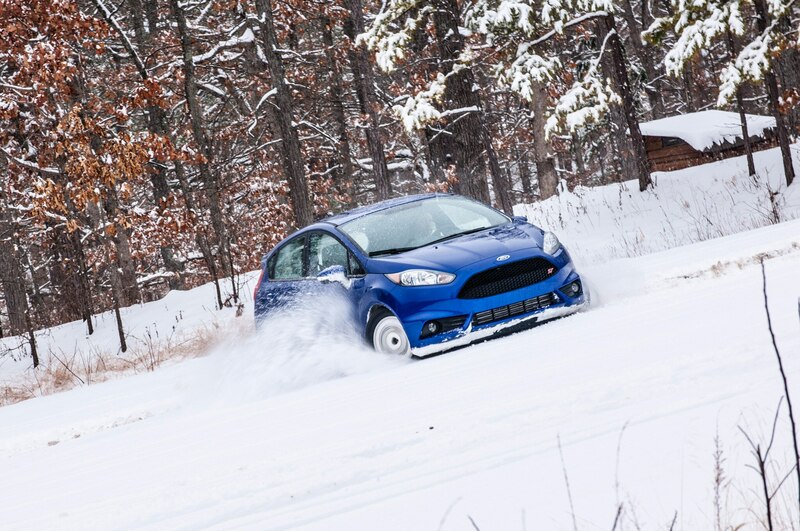 unlikely to break our tough Fiesta ST.